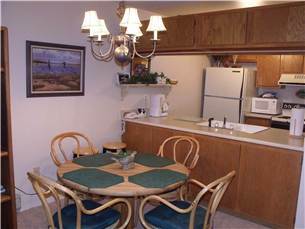 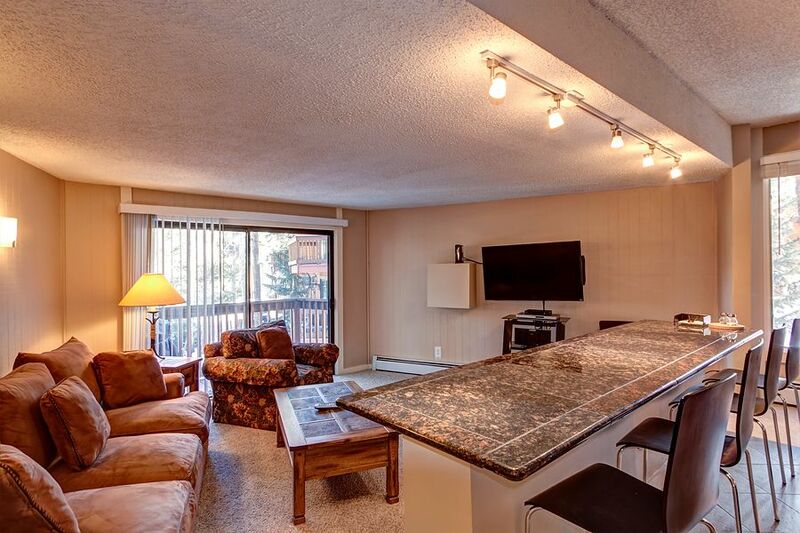 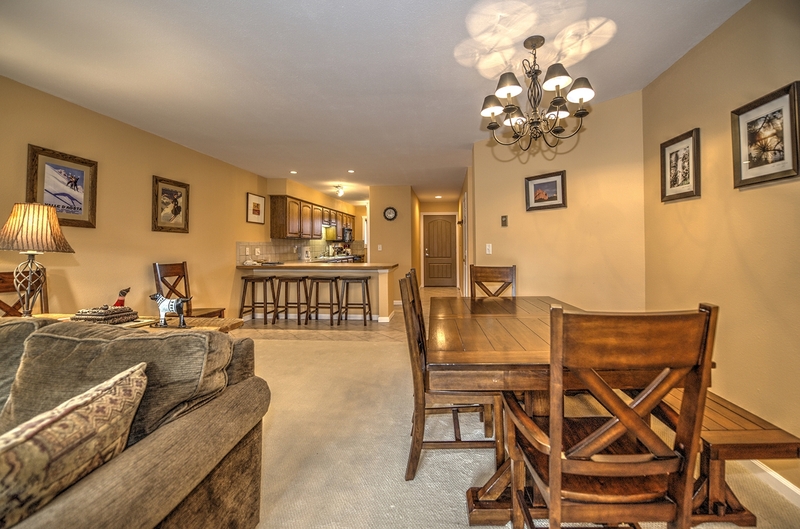 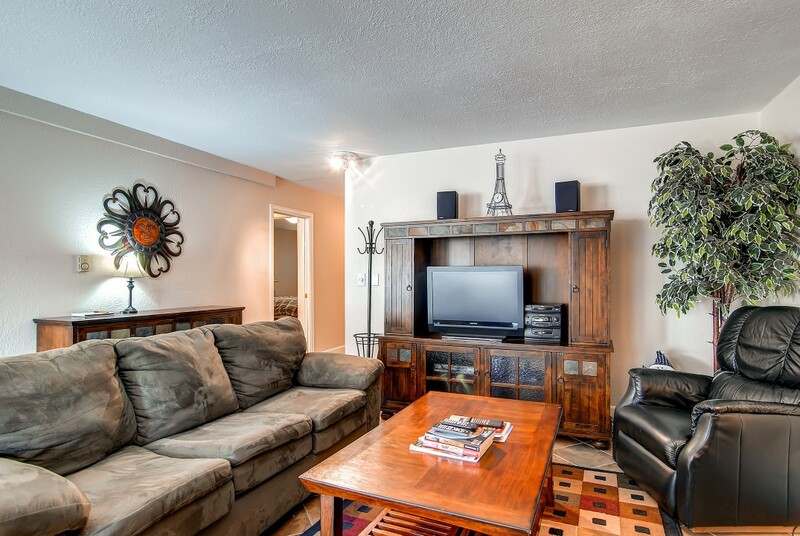 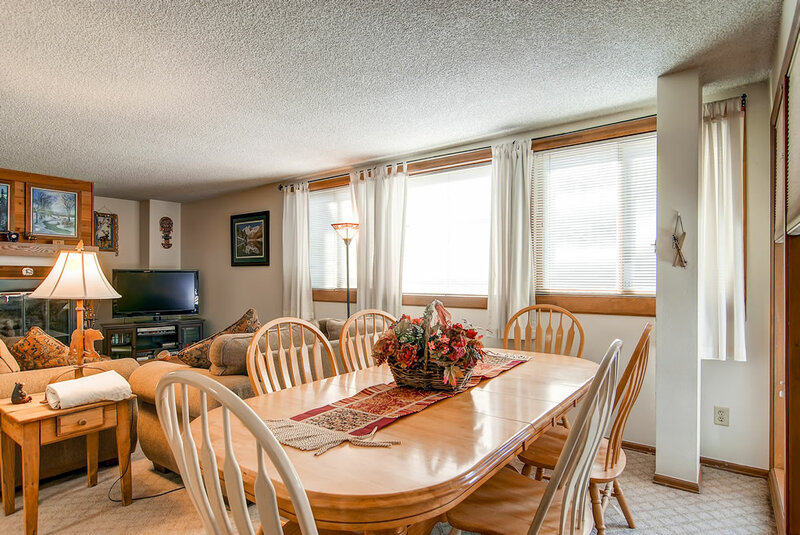 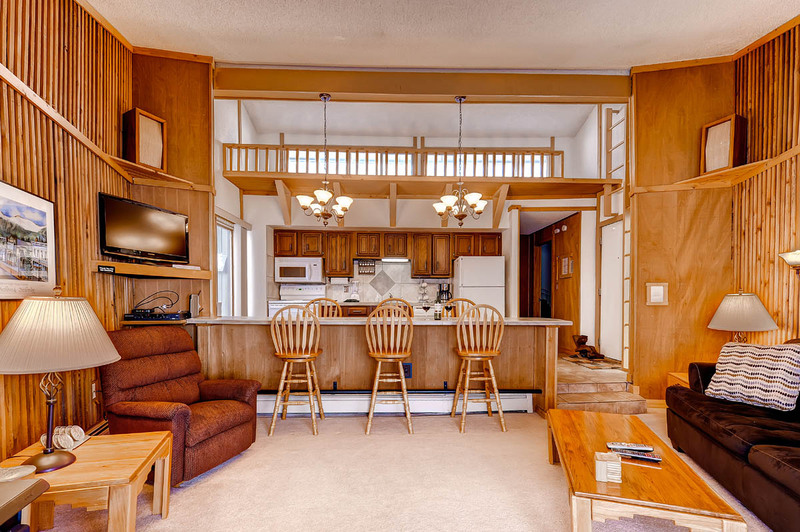 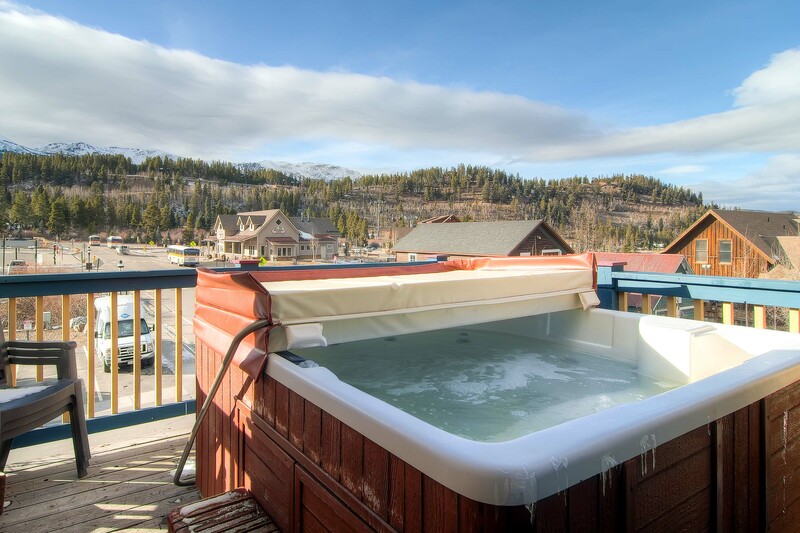 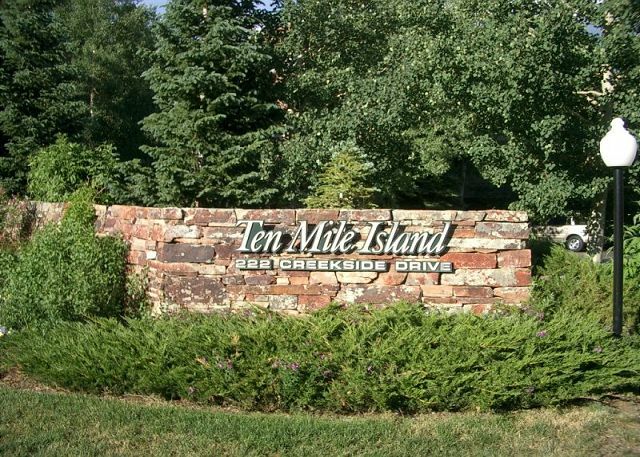 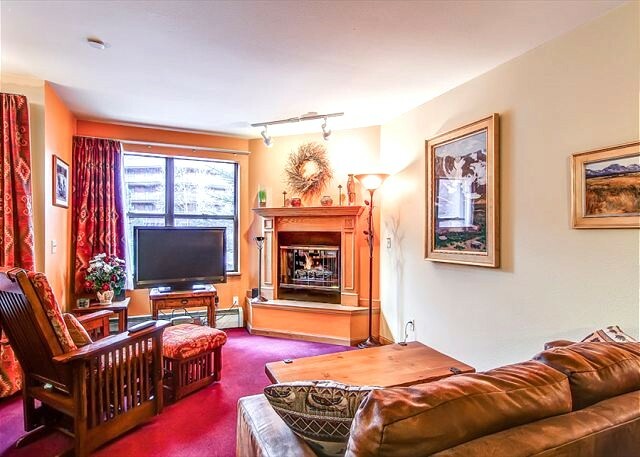 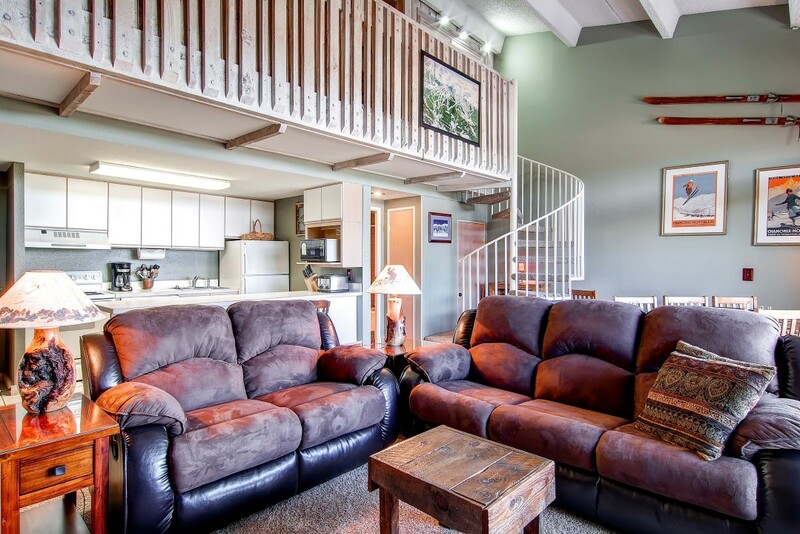 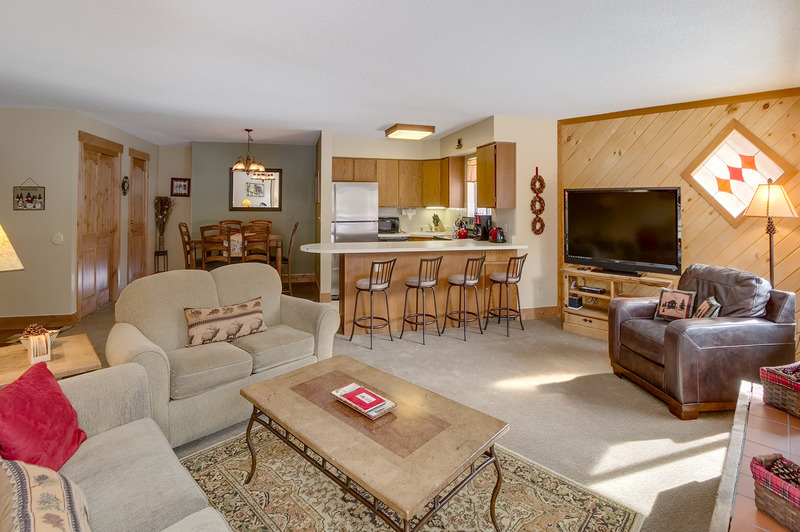 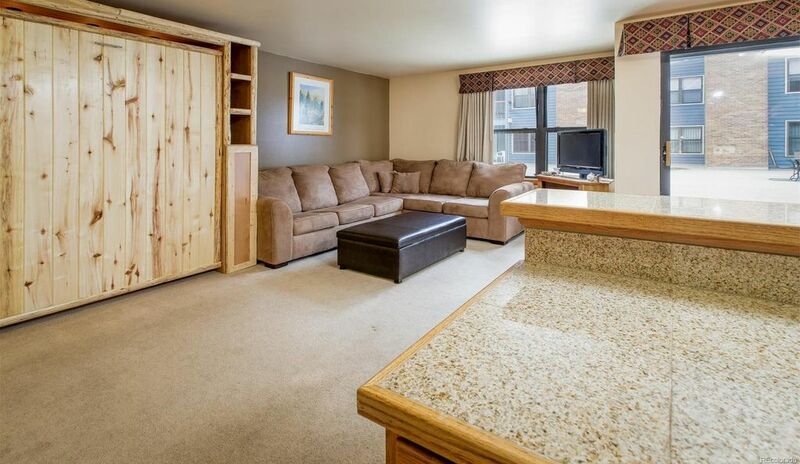 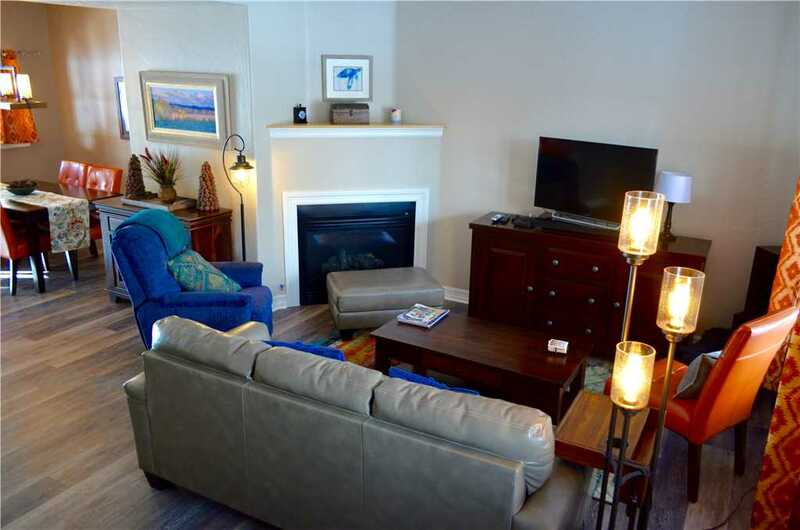 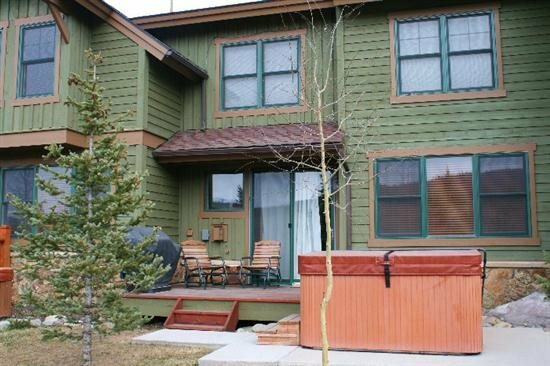 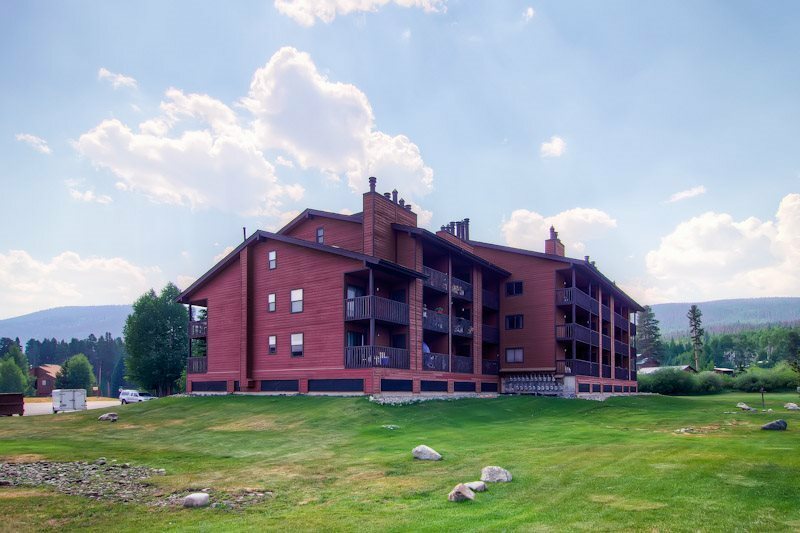 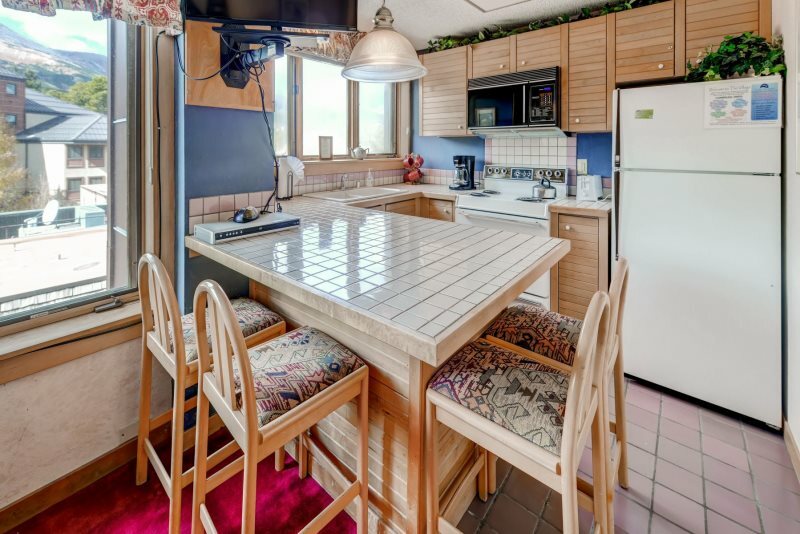 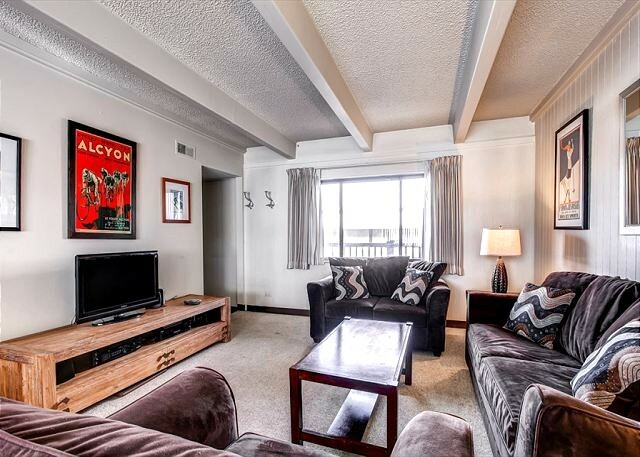 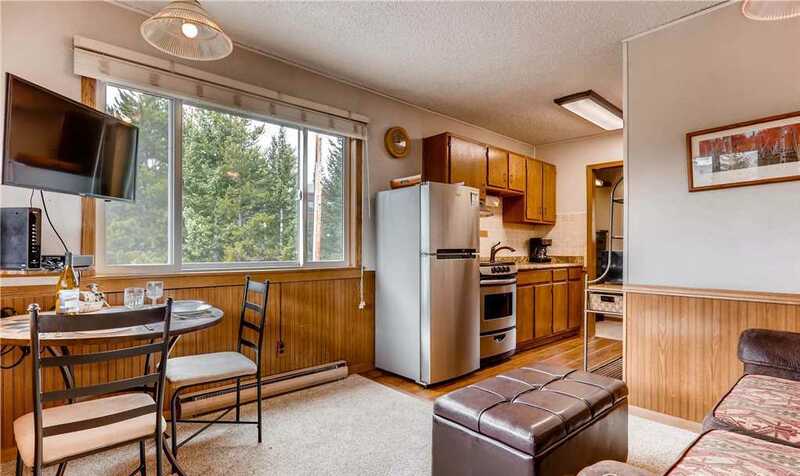 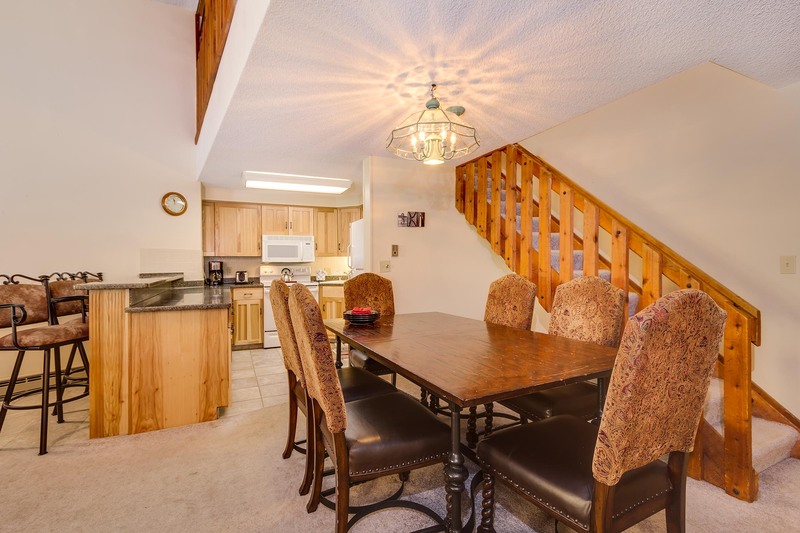 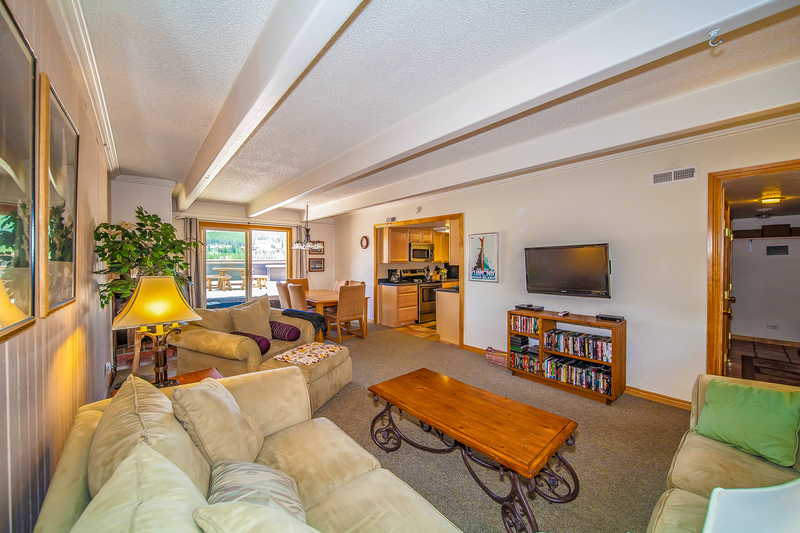 This Platinum-rated condominium has ground floor convenience, footsteps to the hot tub and grill, and just 50 yards to the community pool and its hot tubs. 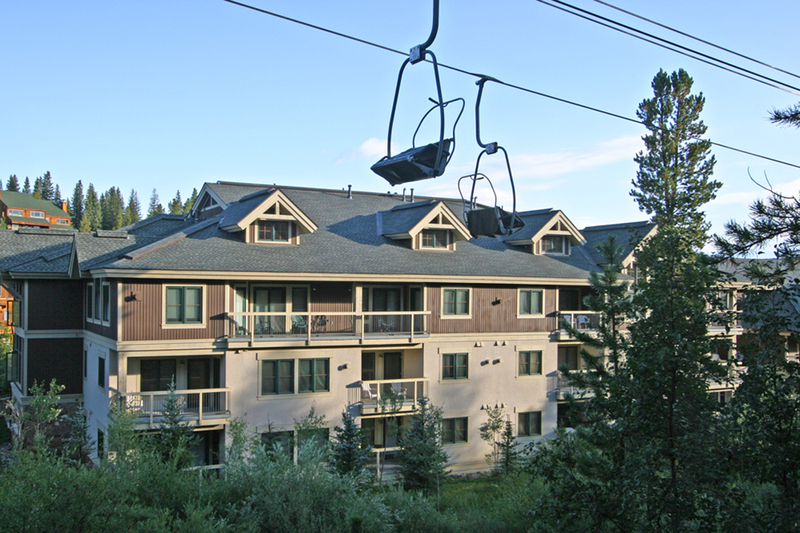 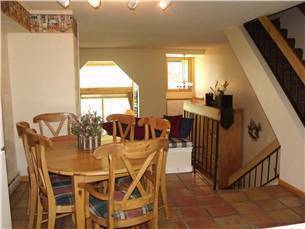 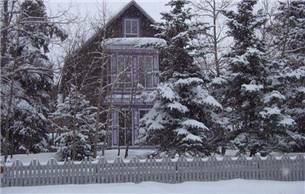 The condo is recessed from the main road, making no traffic noise. 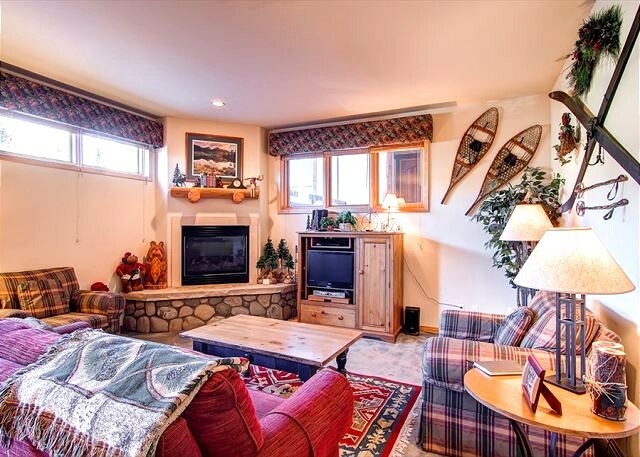 Best part is, it’s right across the street from the Four O’clock Run for convenient ski-in at the end of the day. 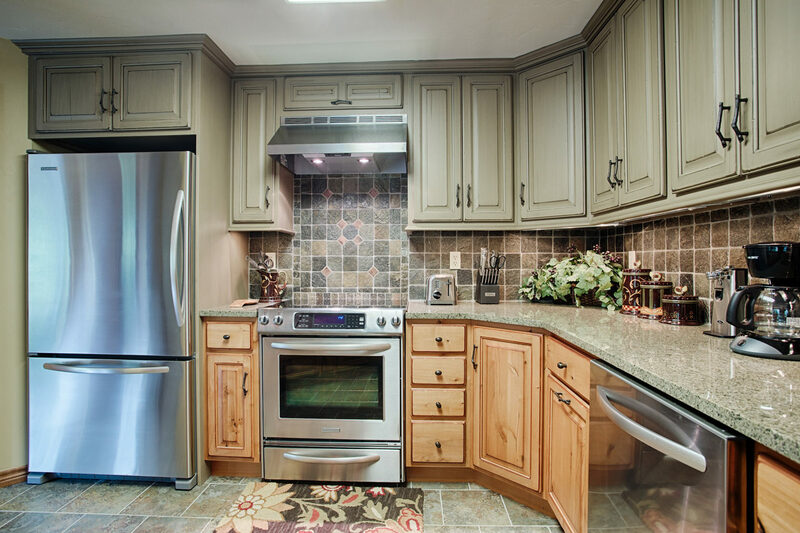 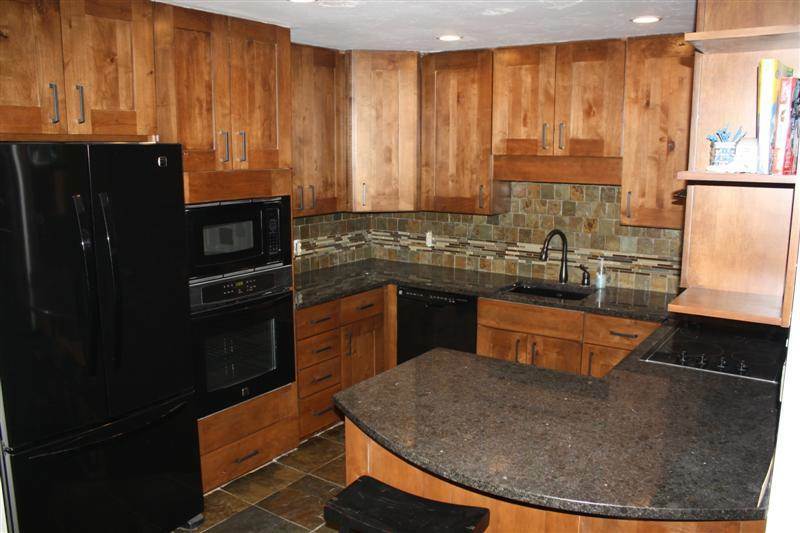 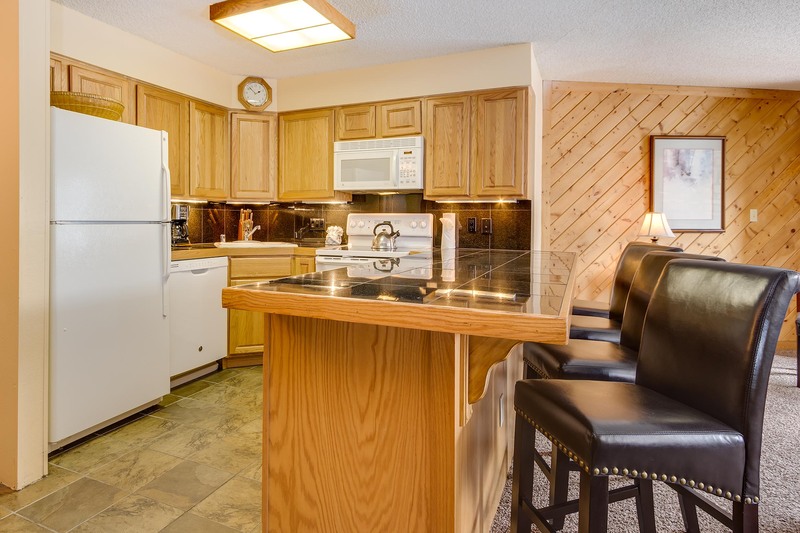 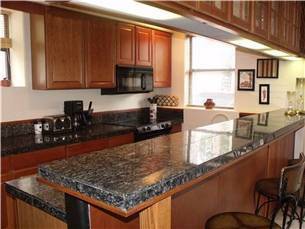 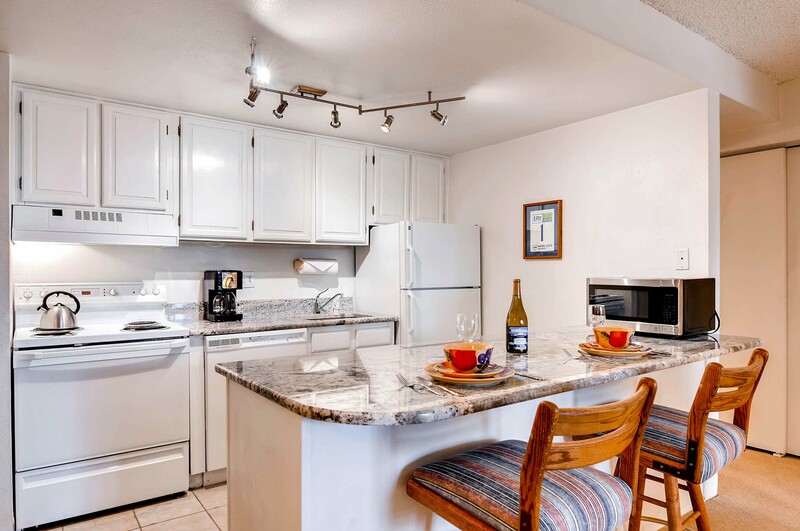 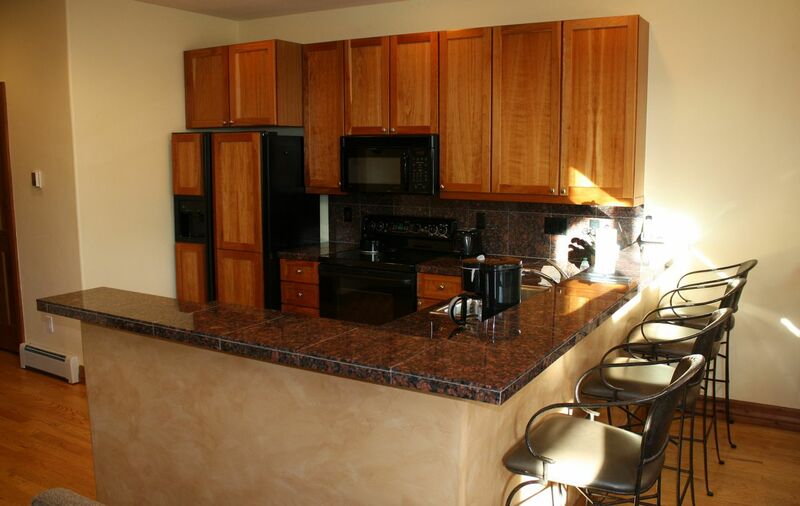 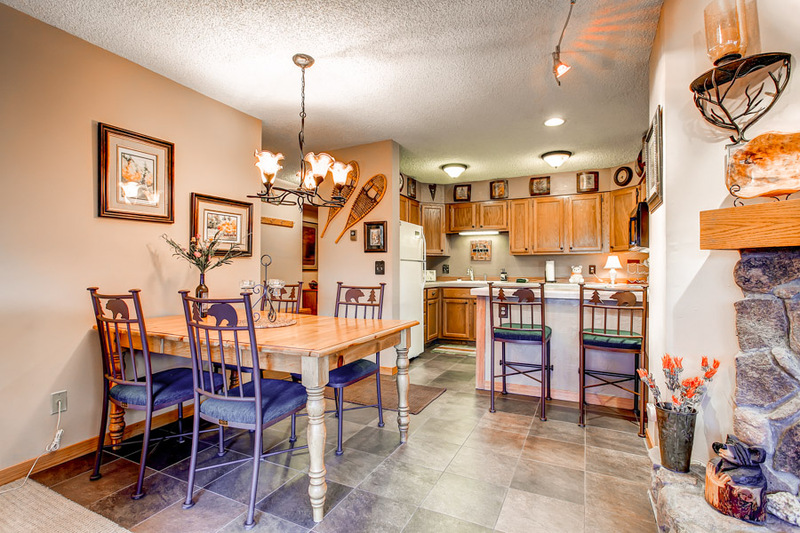 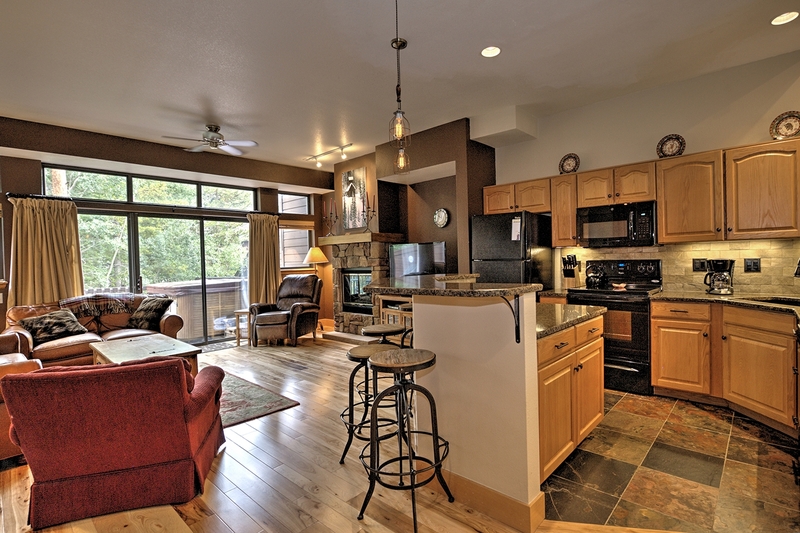 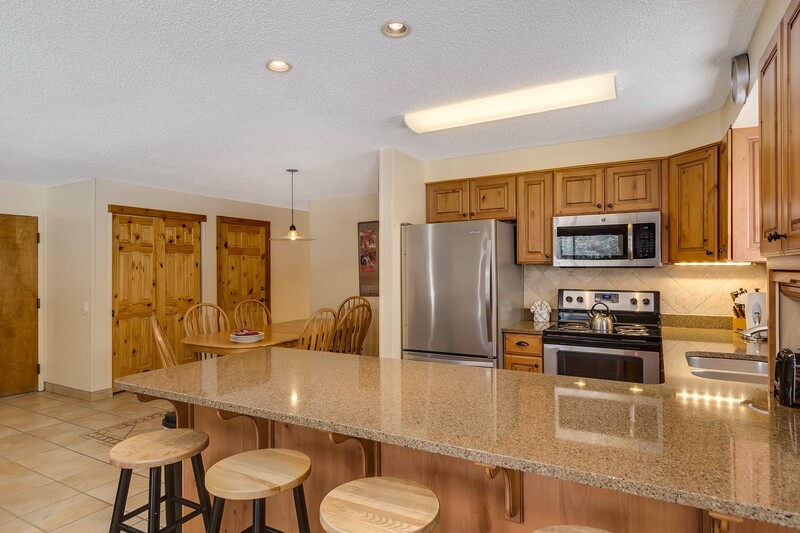 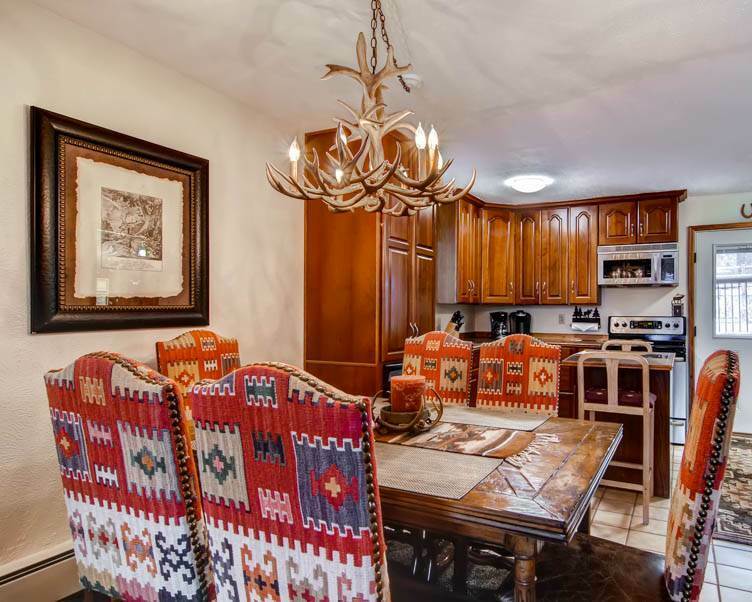 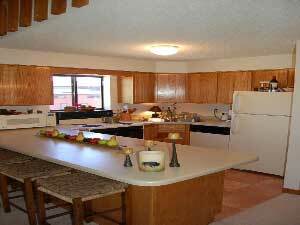 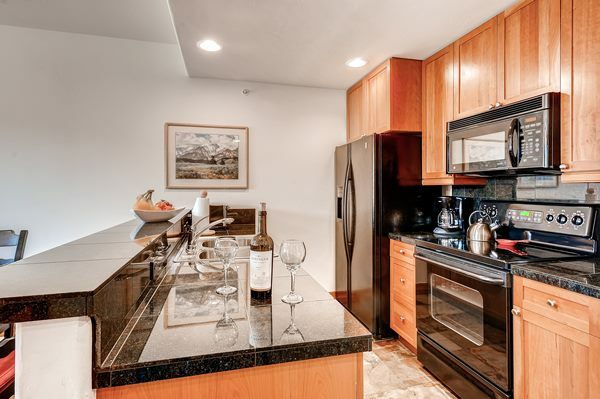 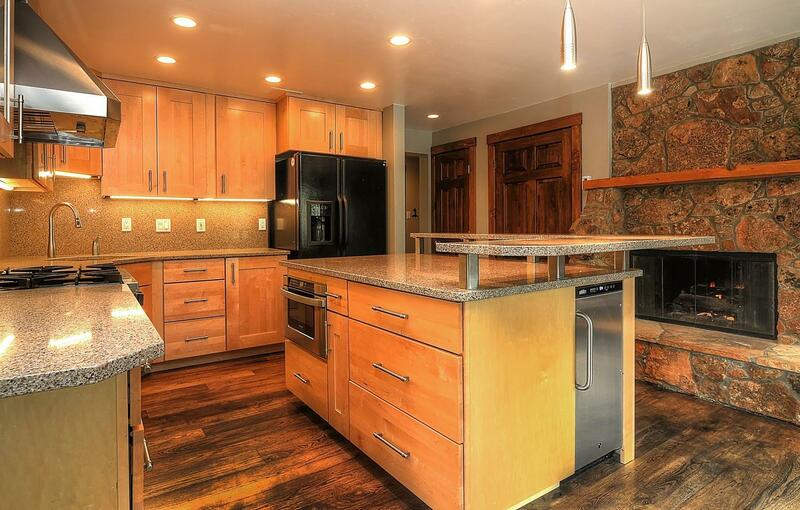 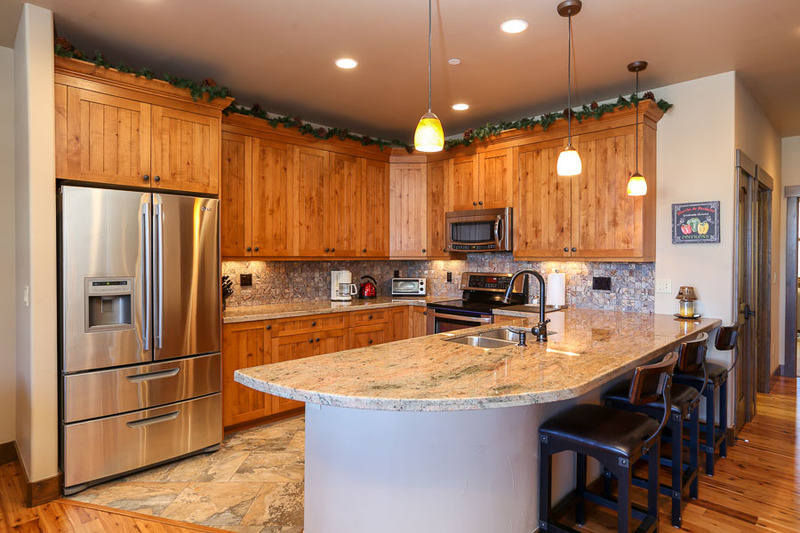 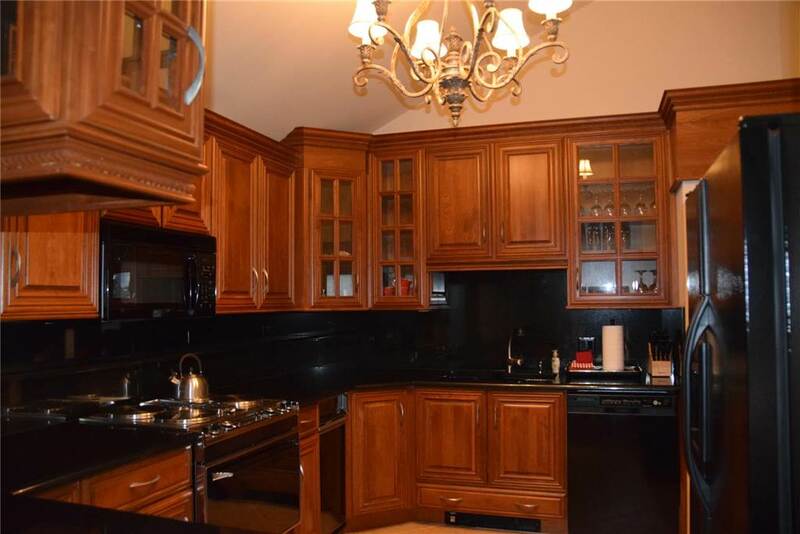 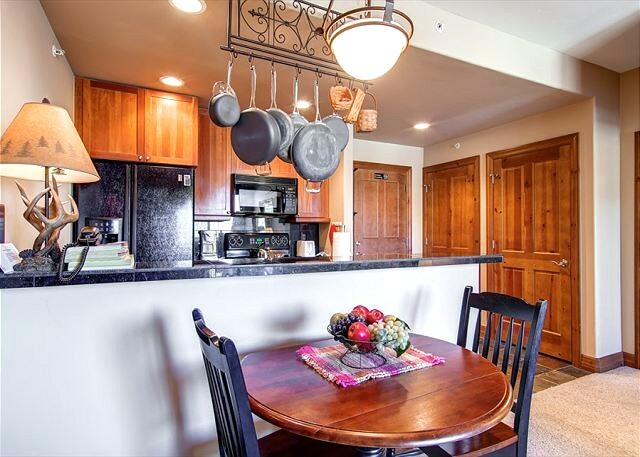 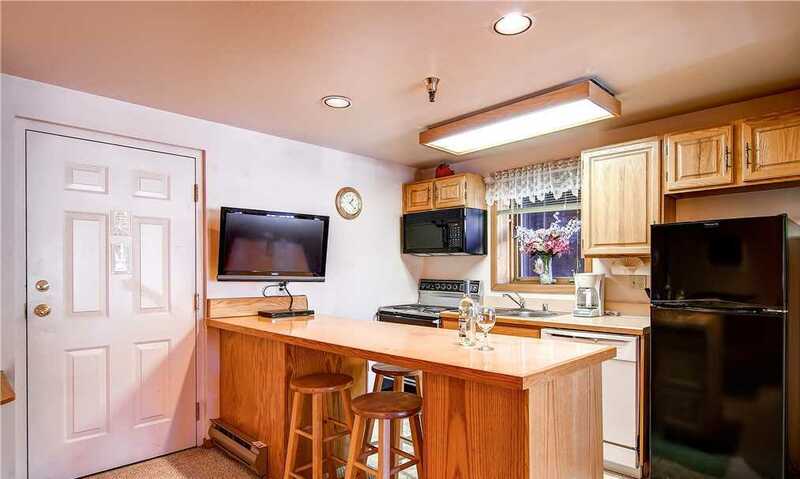 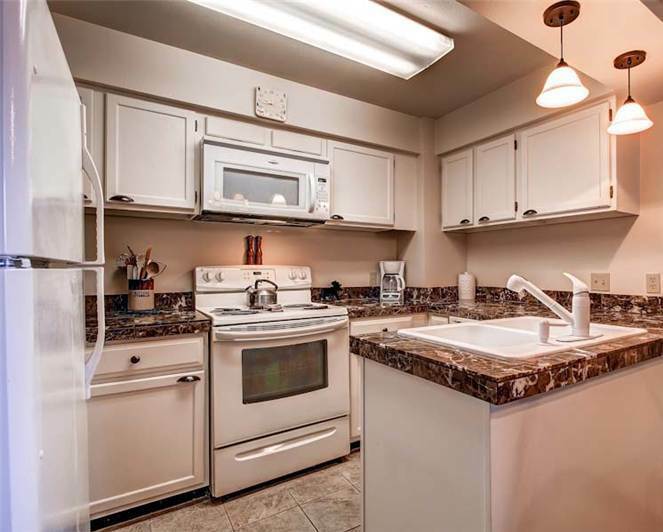 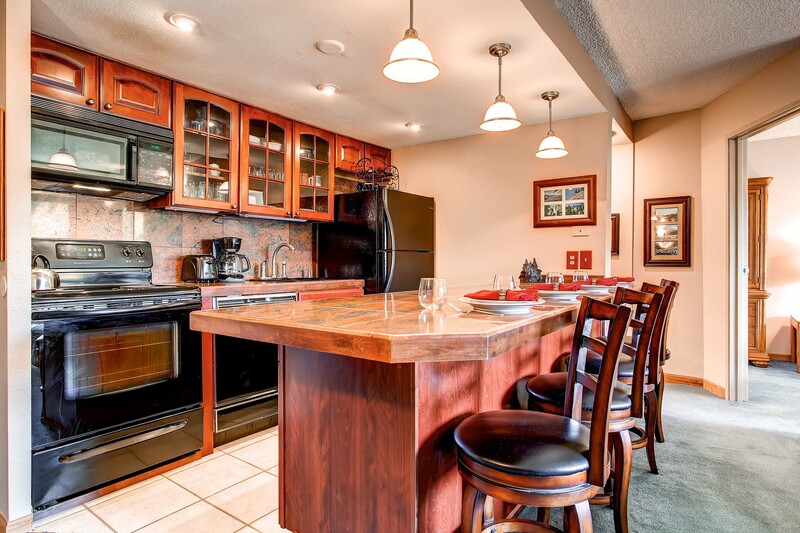 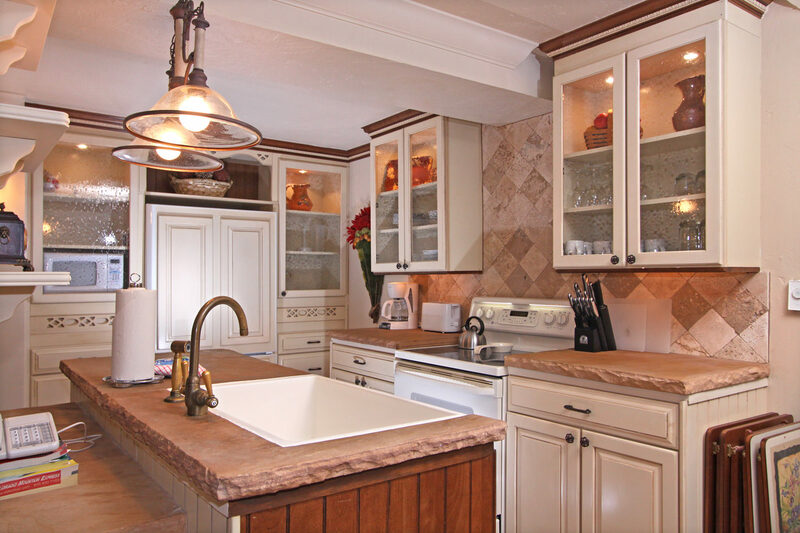 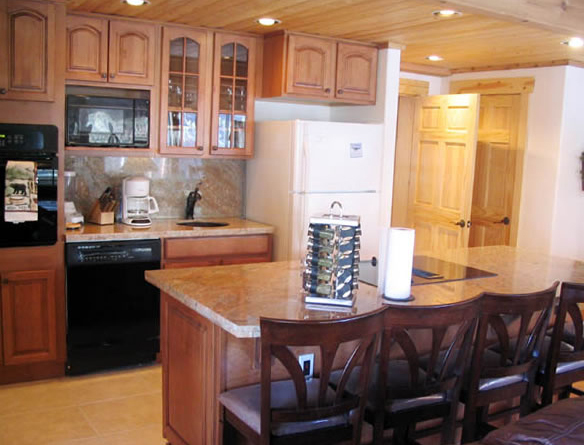 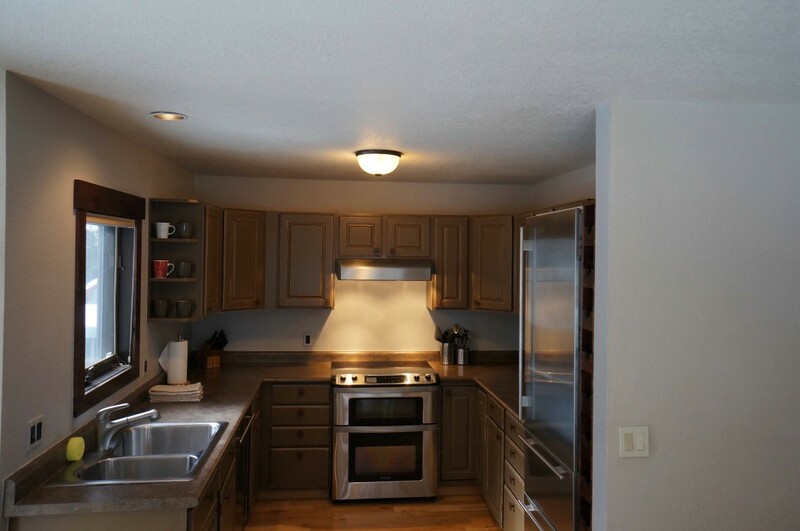 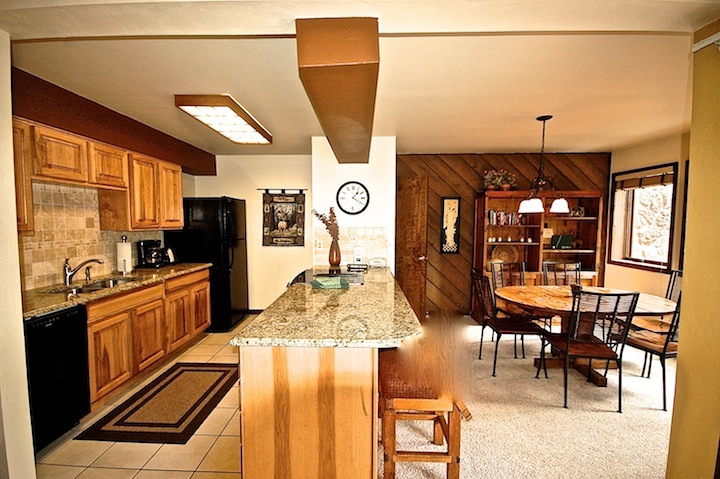 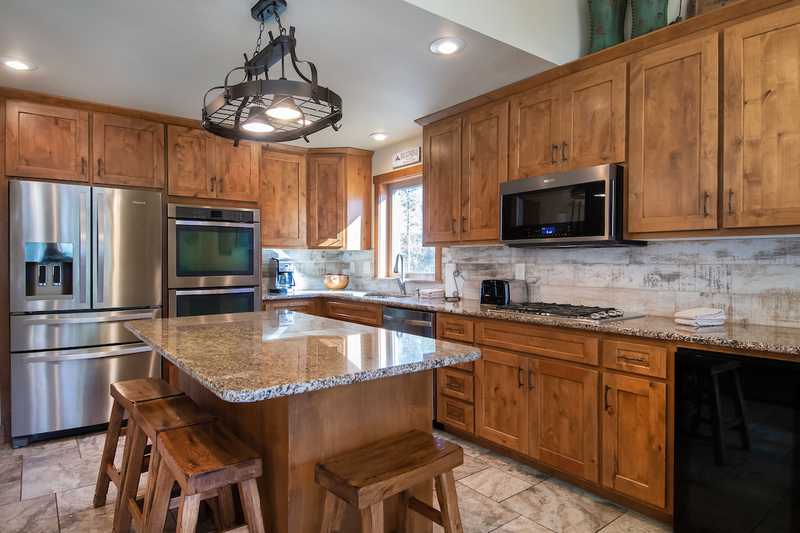 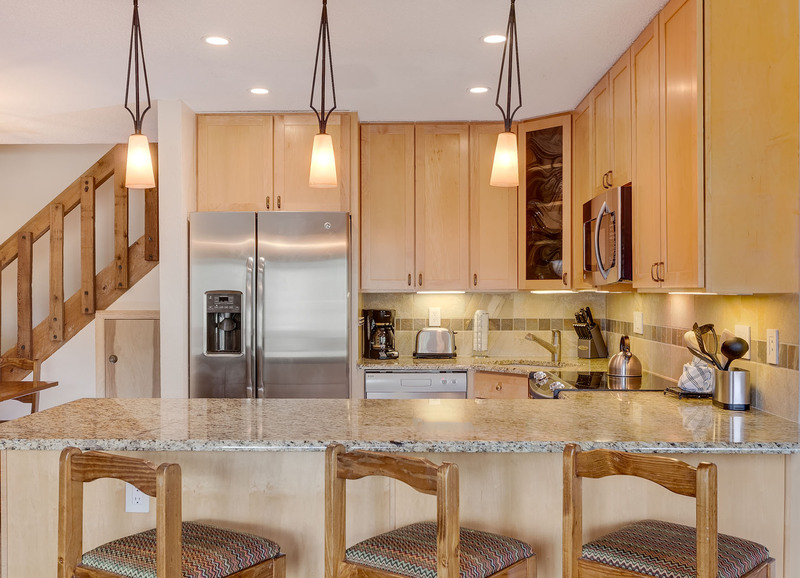 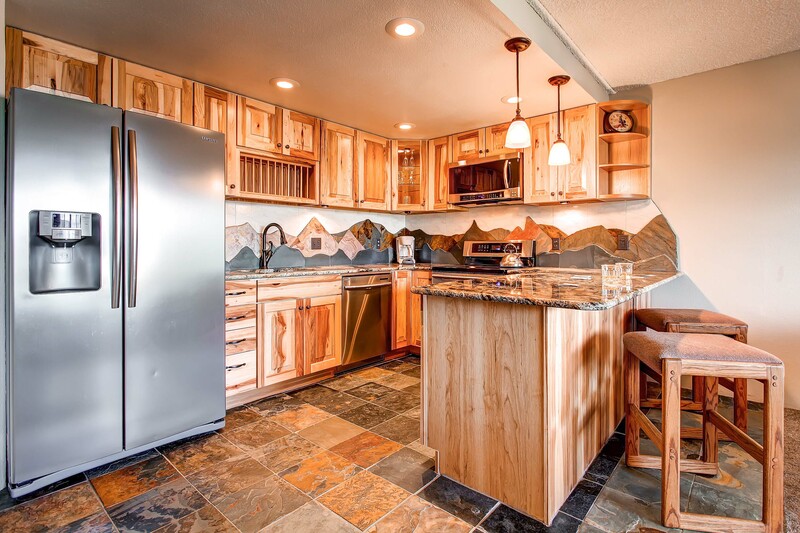 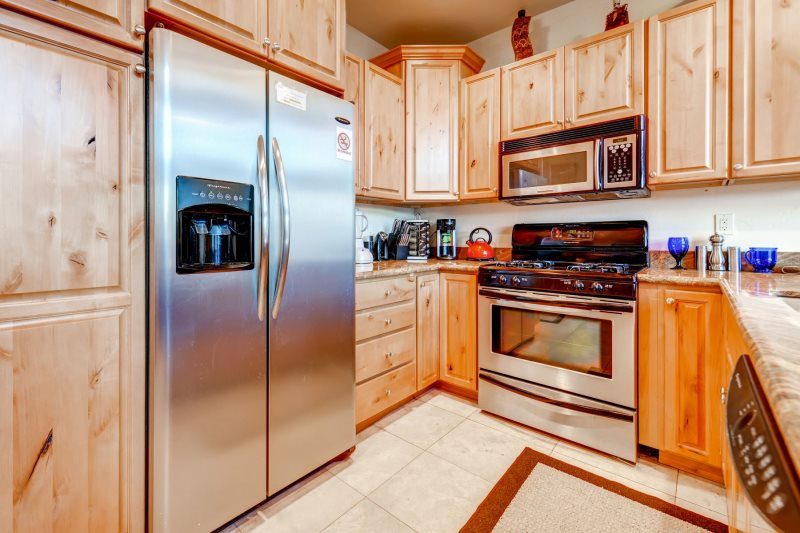 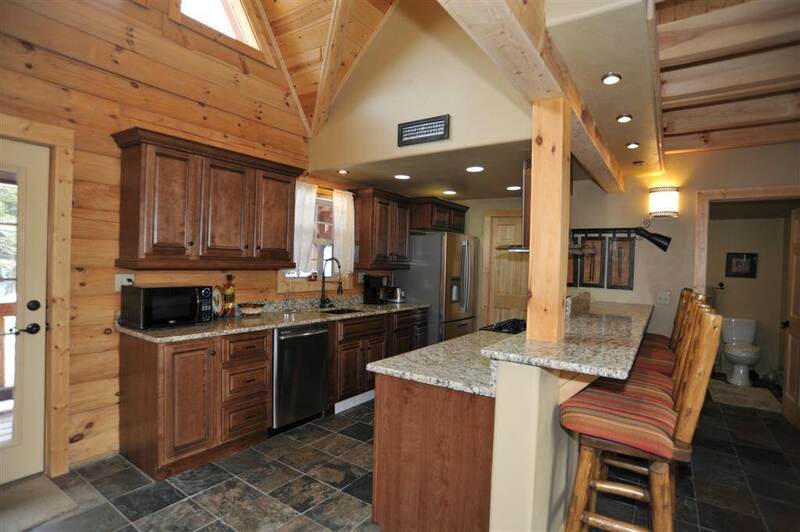 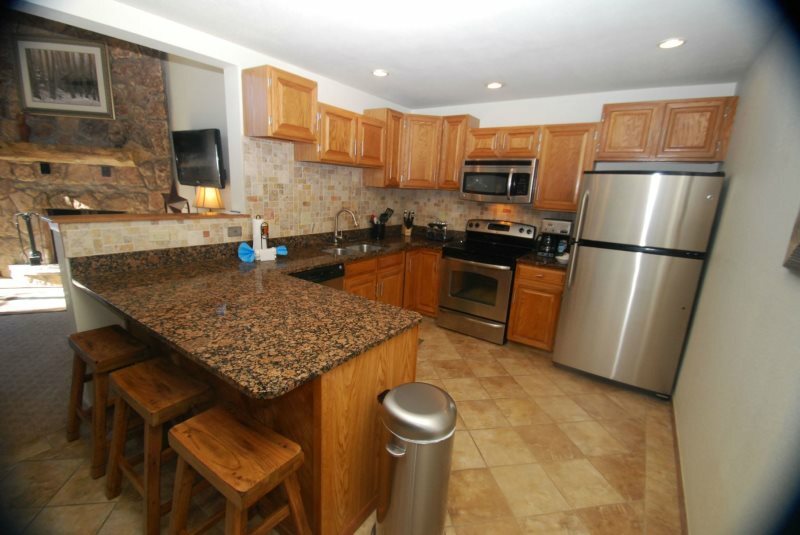 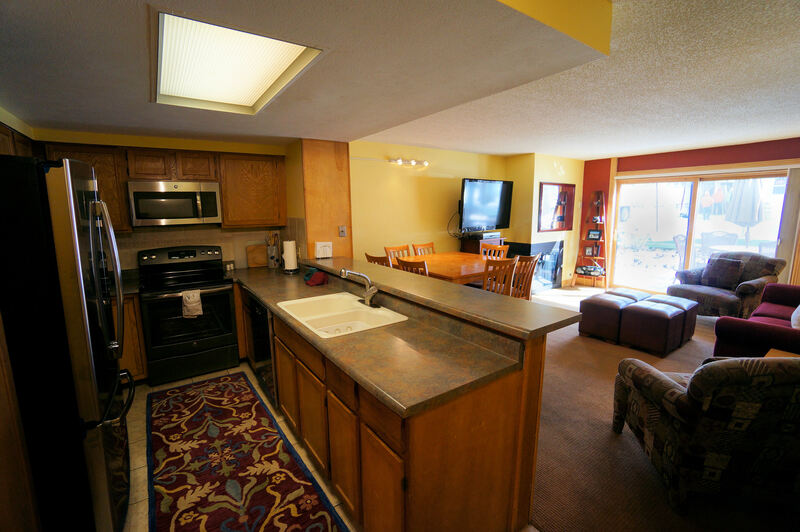 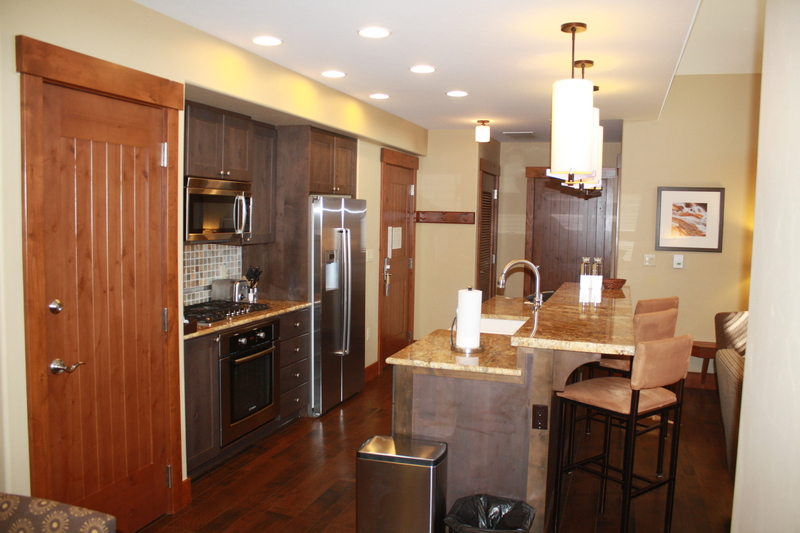 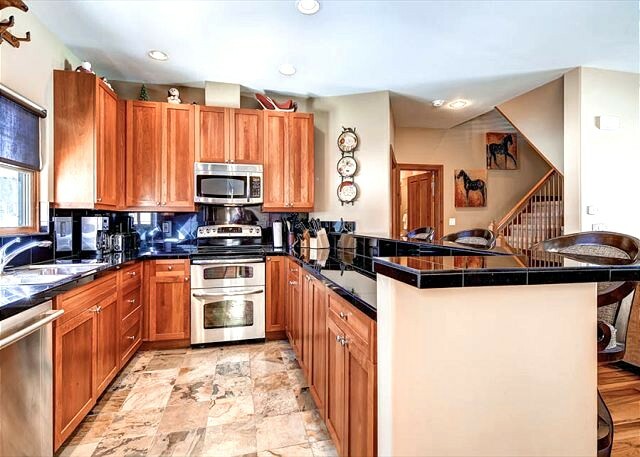 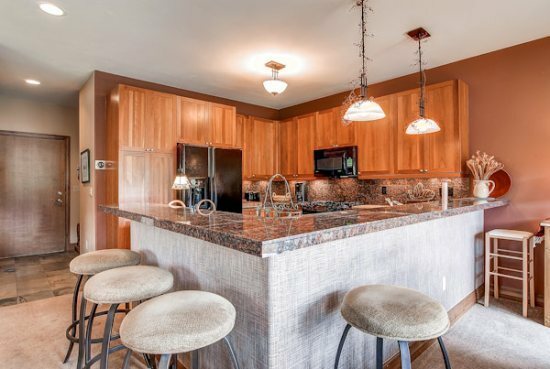 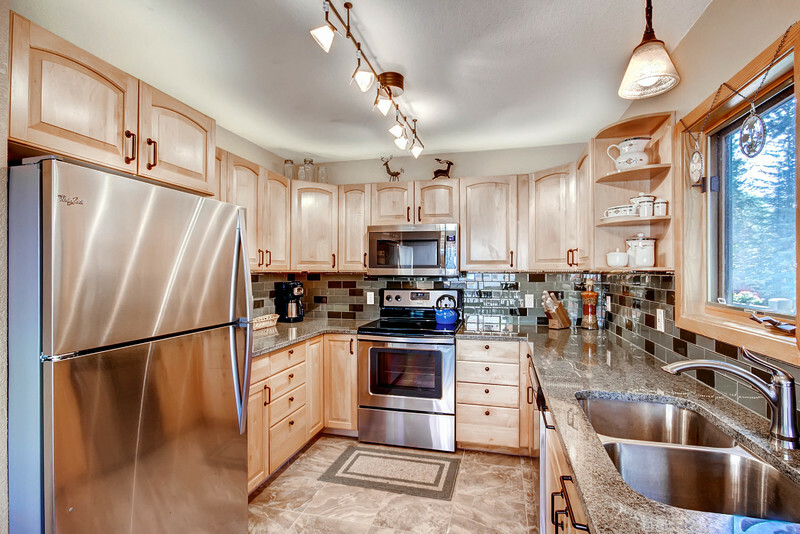 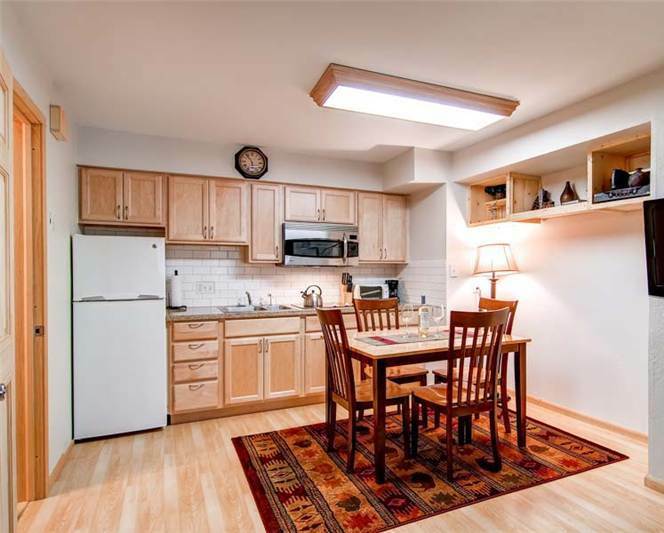 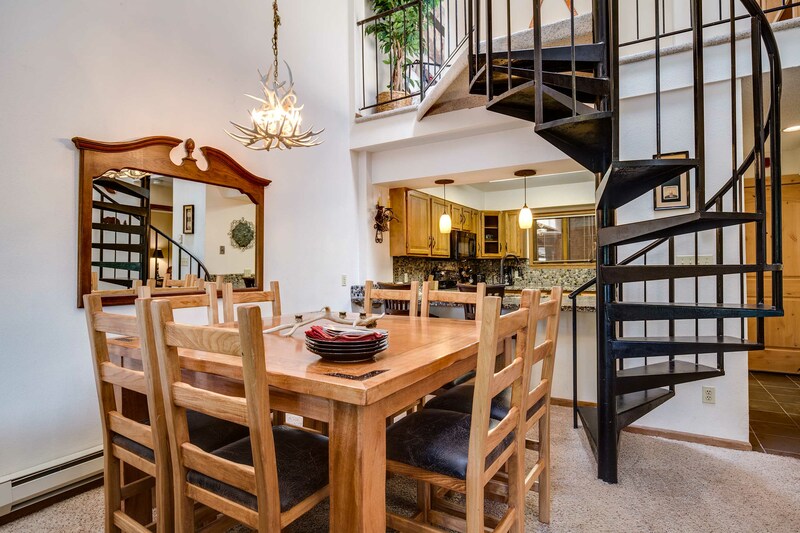 It was remodeled in 2015: updates include all new kitchen appliances, new 45″ flat-screen television, oak trim, hickory cabinetry, and Italian tile floor. 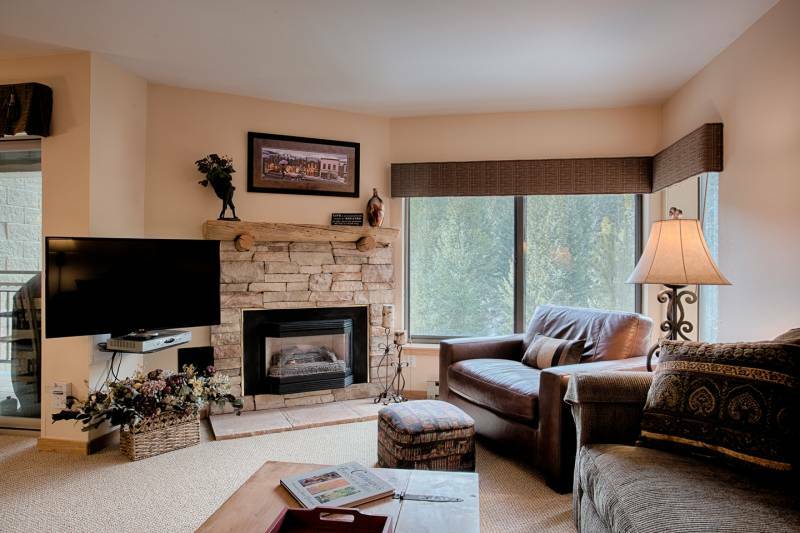 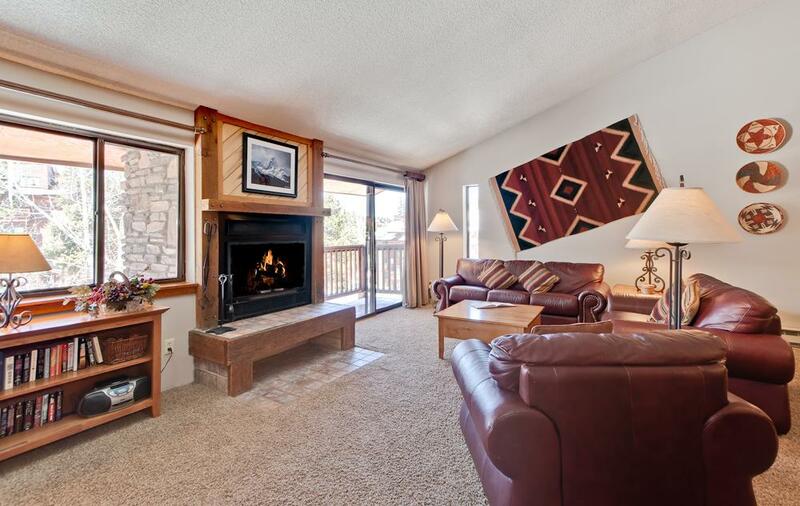 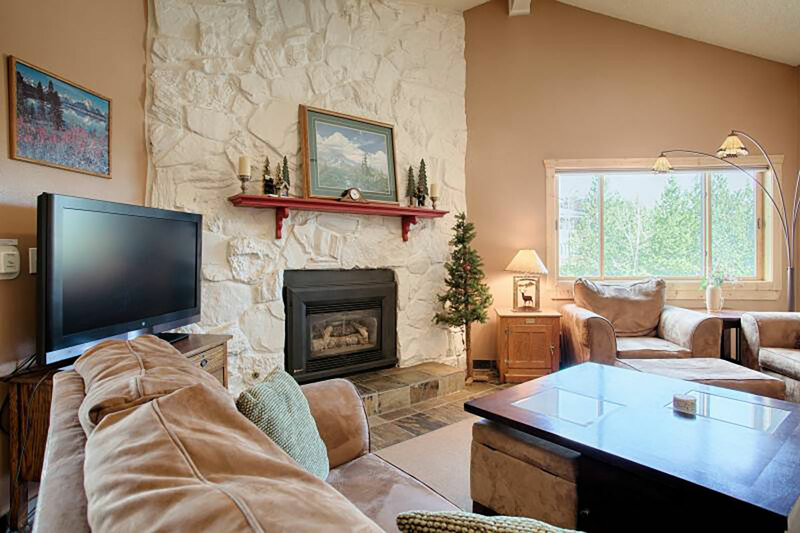 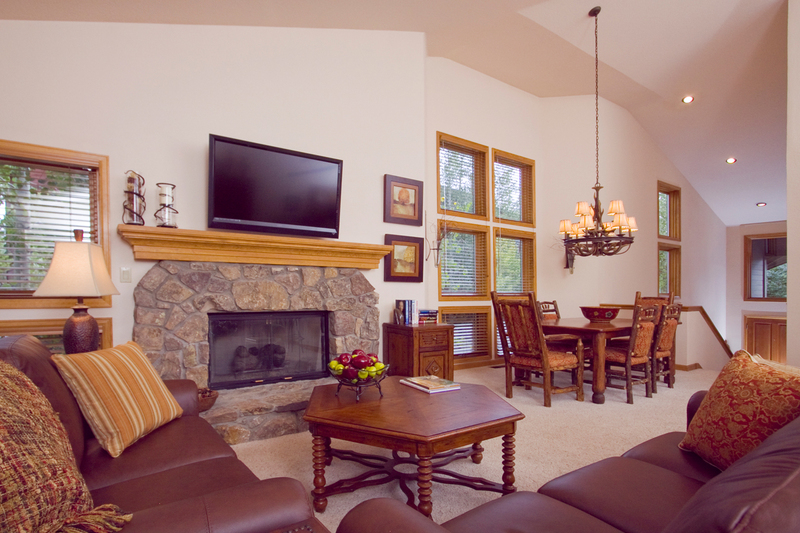 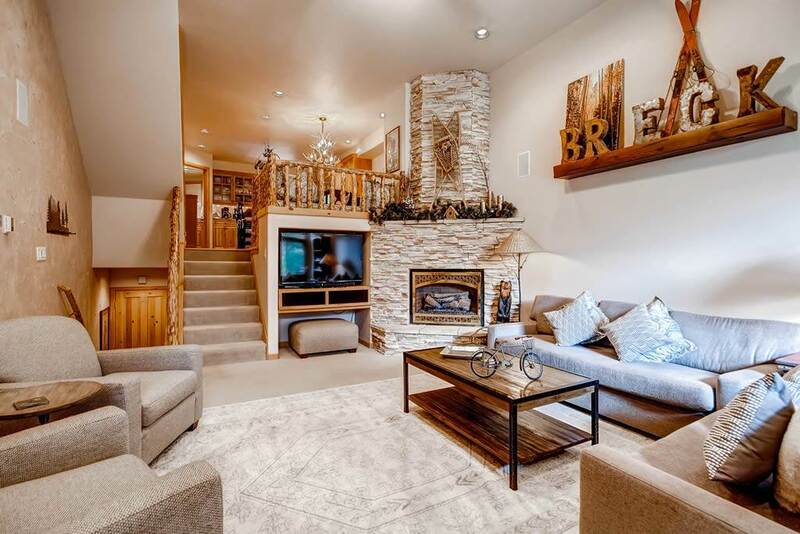 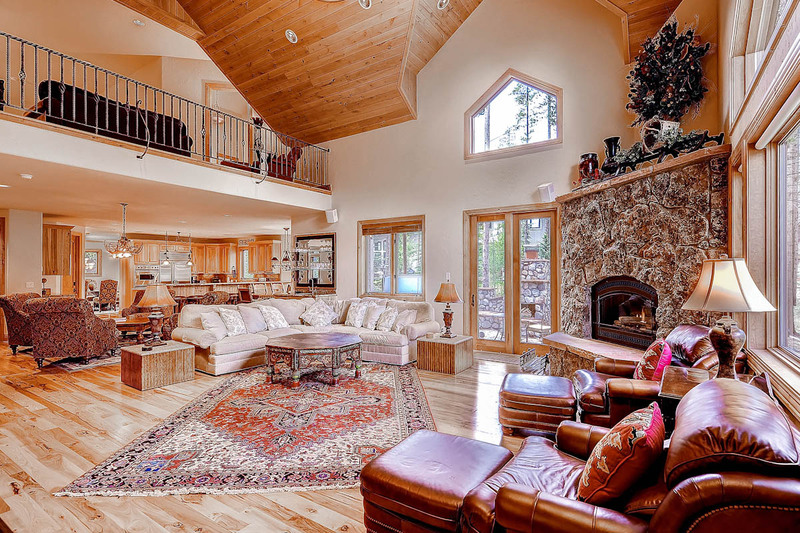 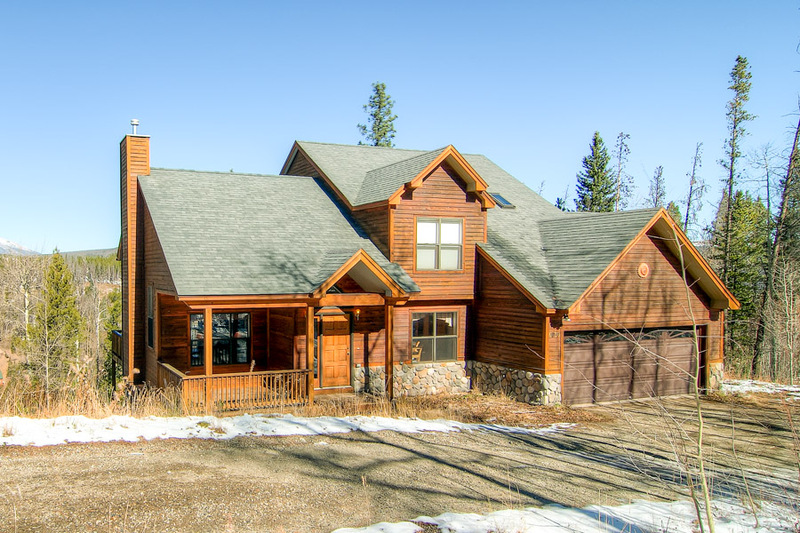 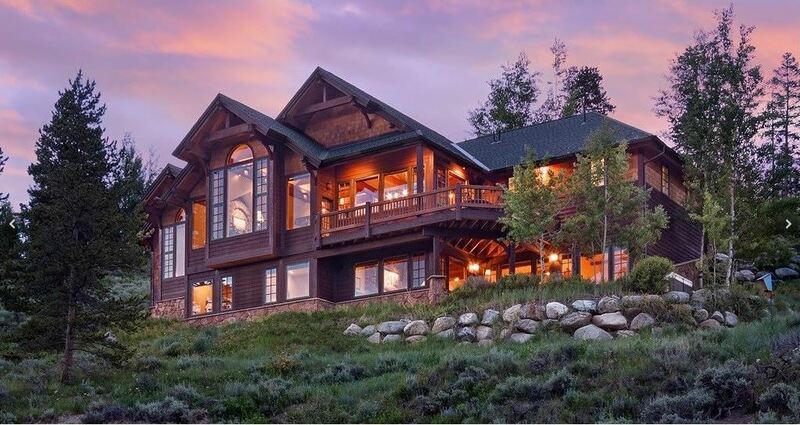 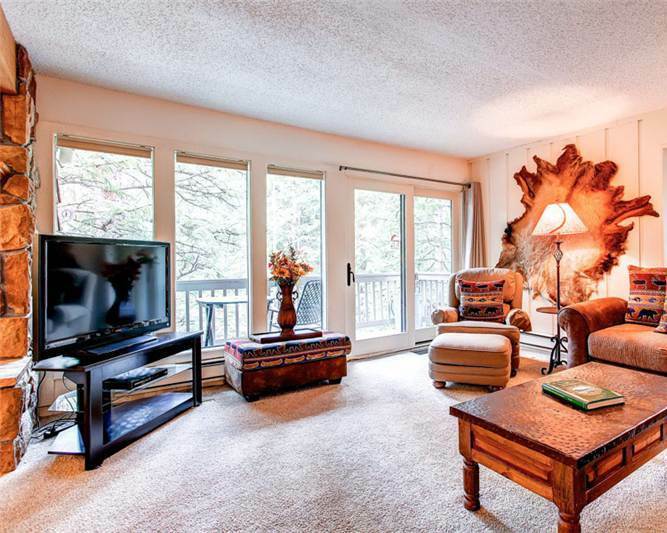 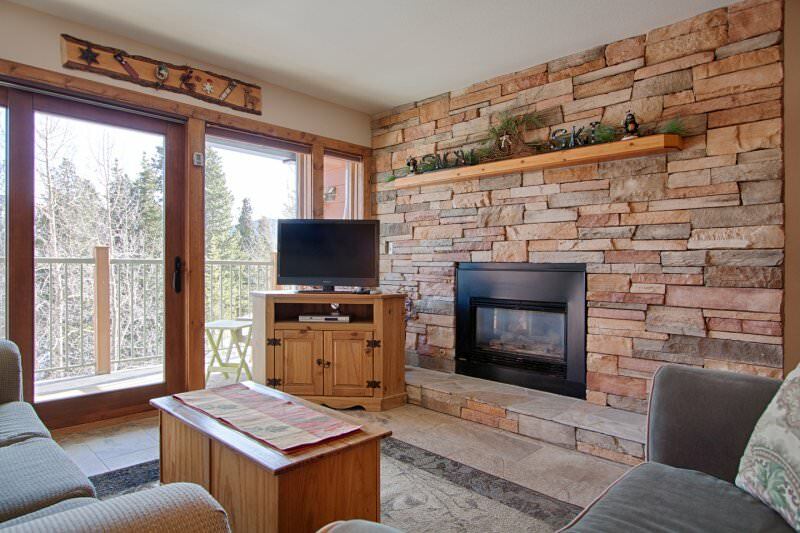 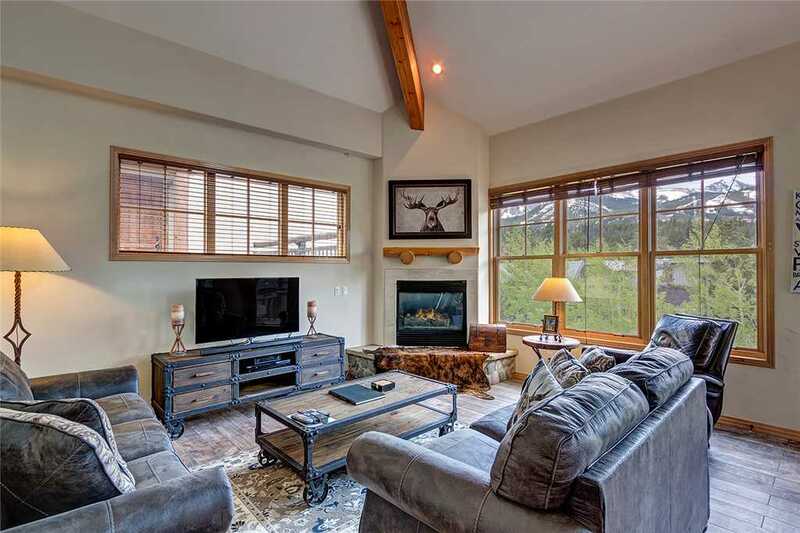 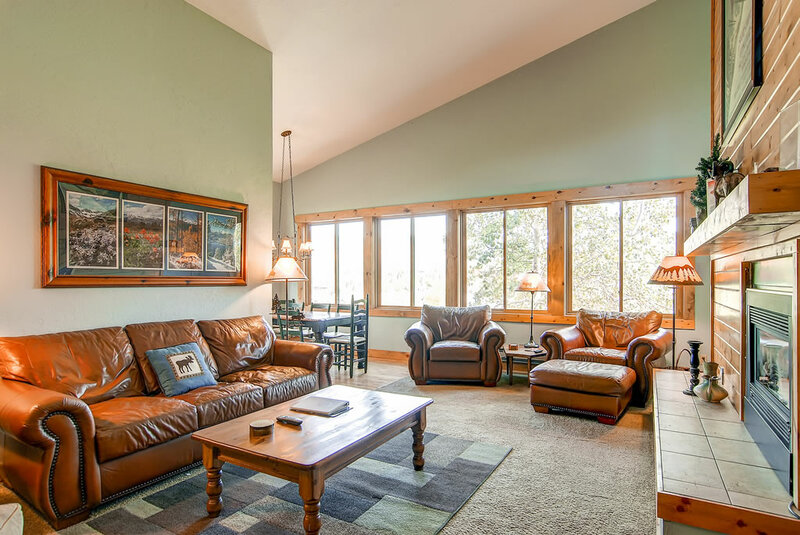 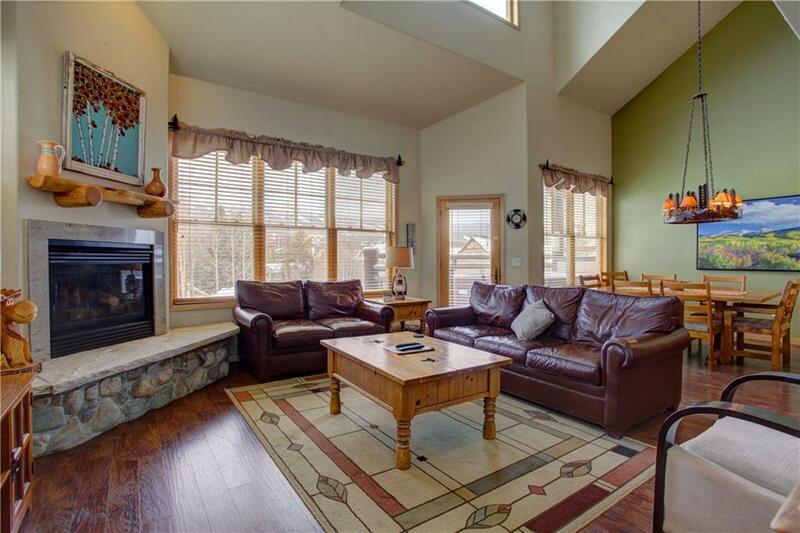 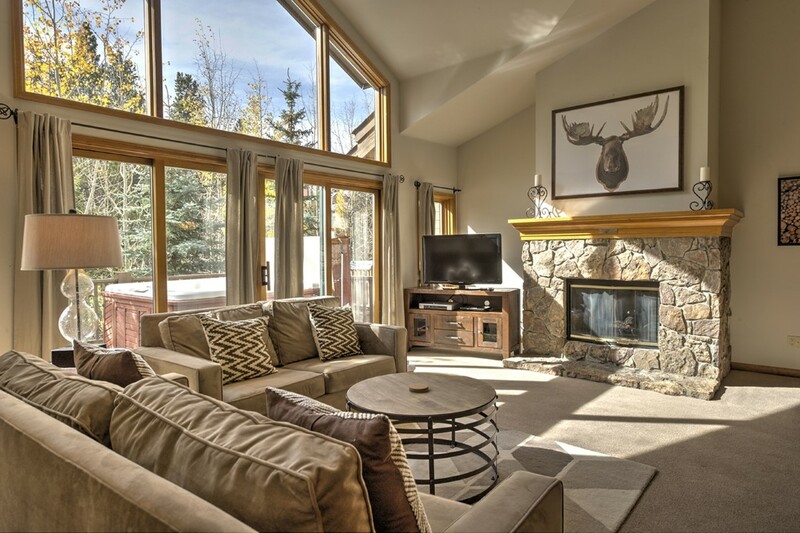 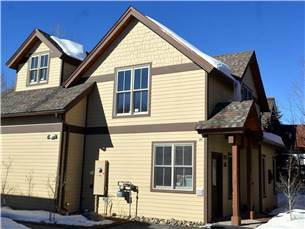 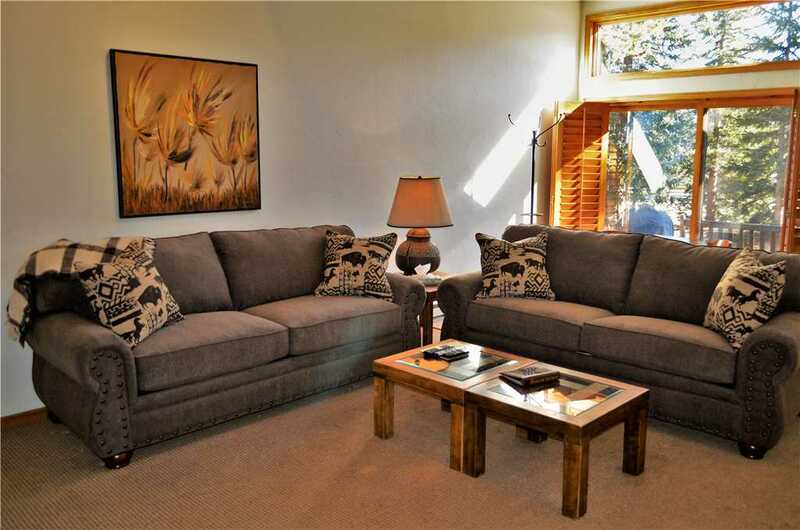 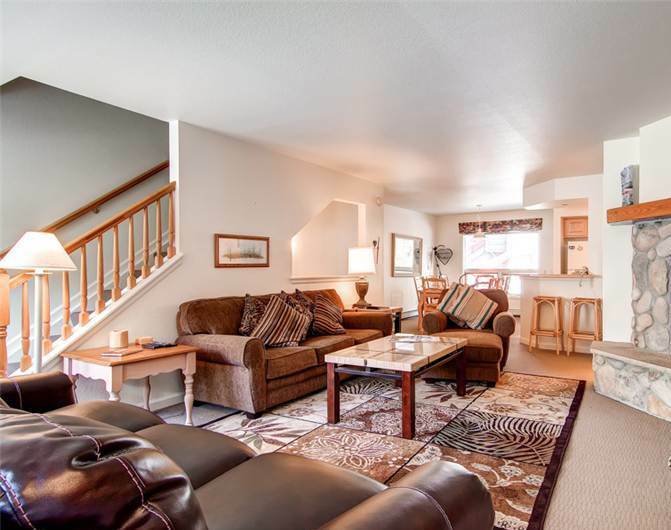 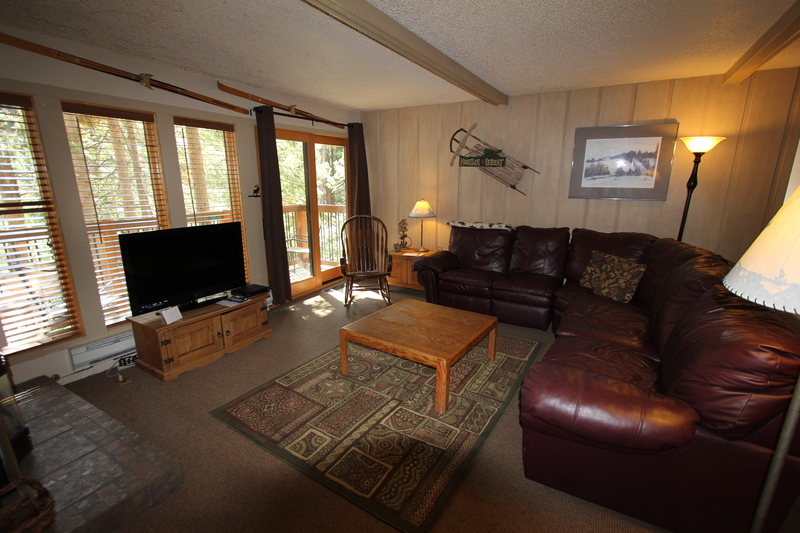 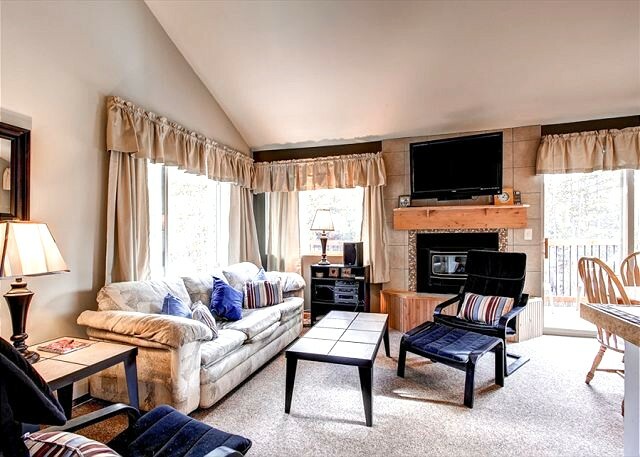 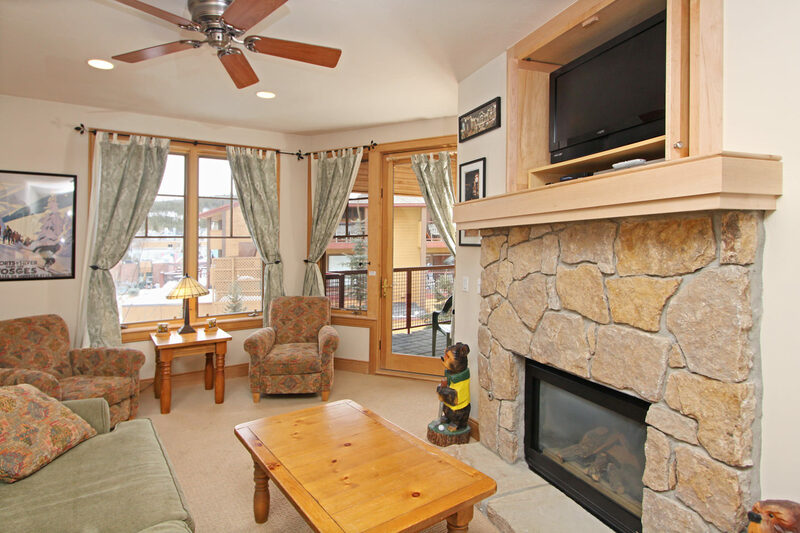 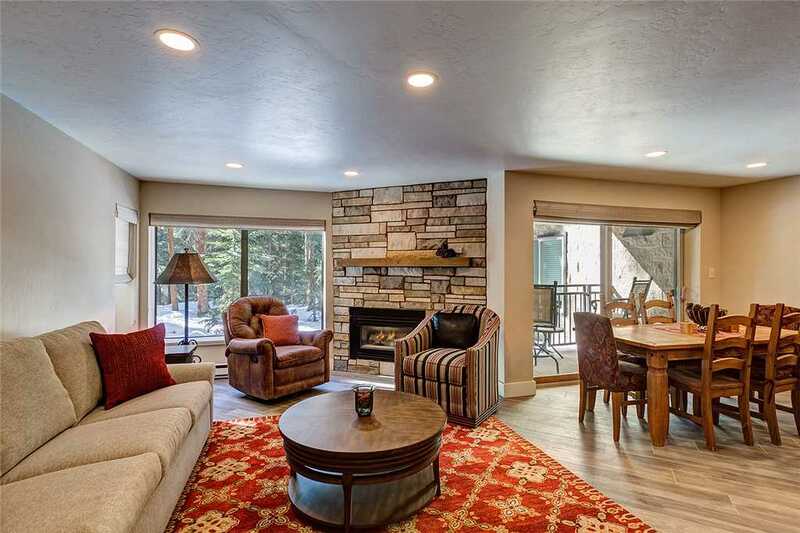 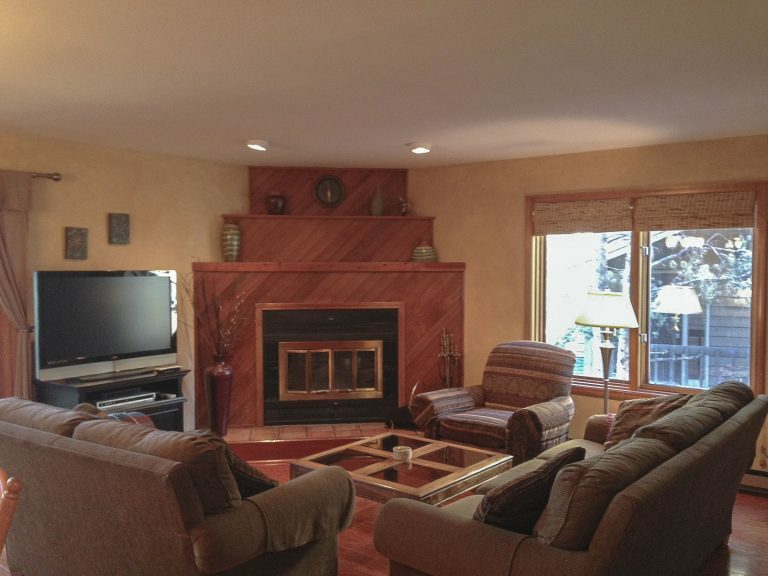 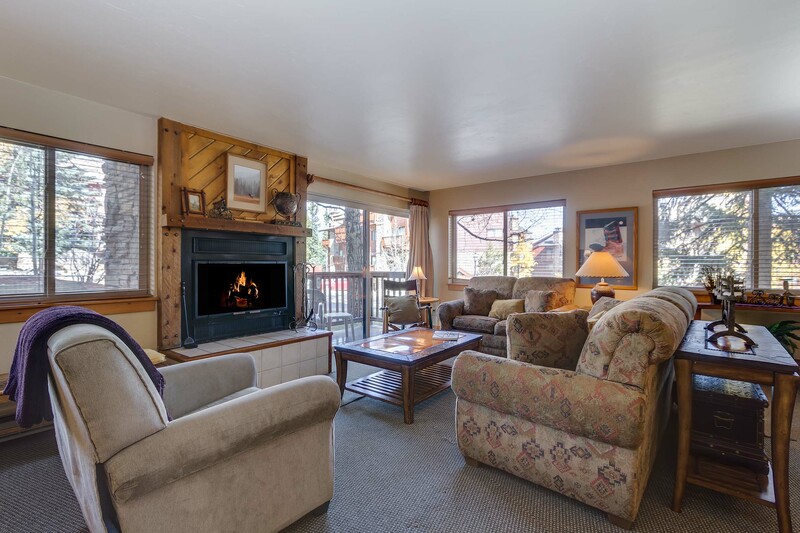 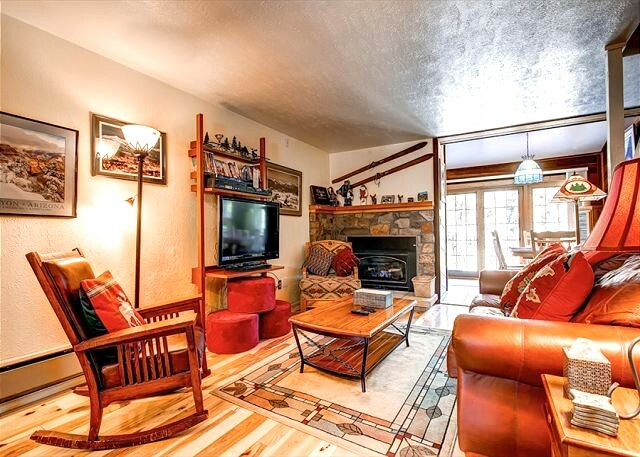 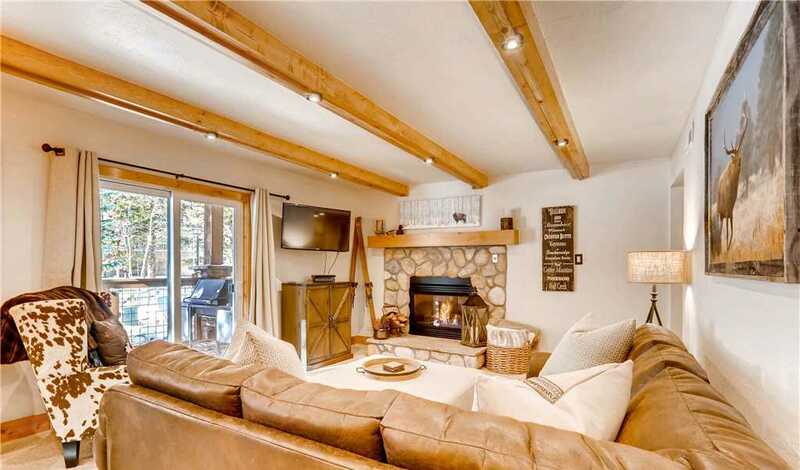 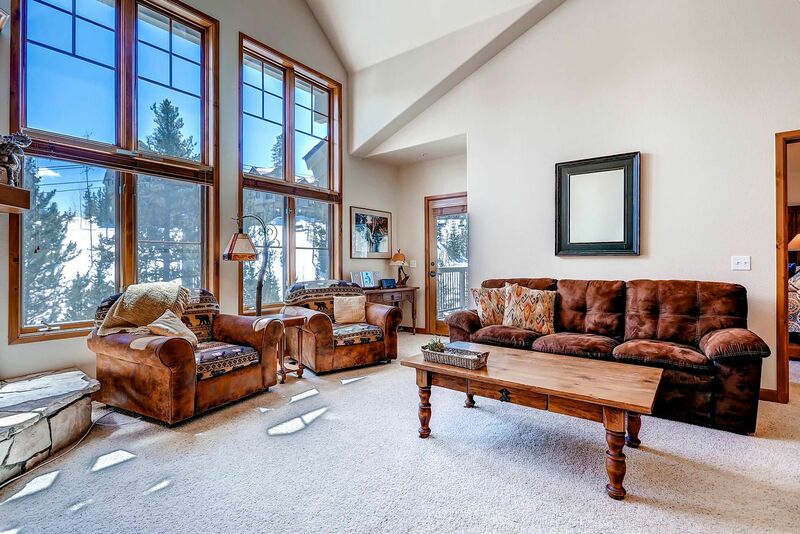 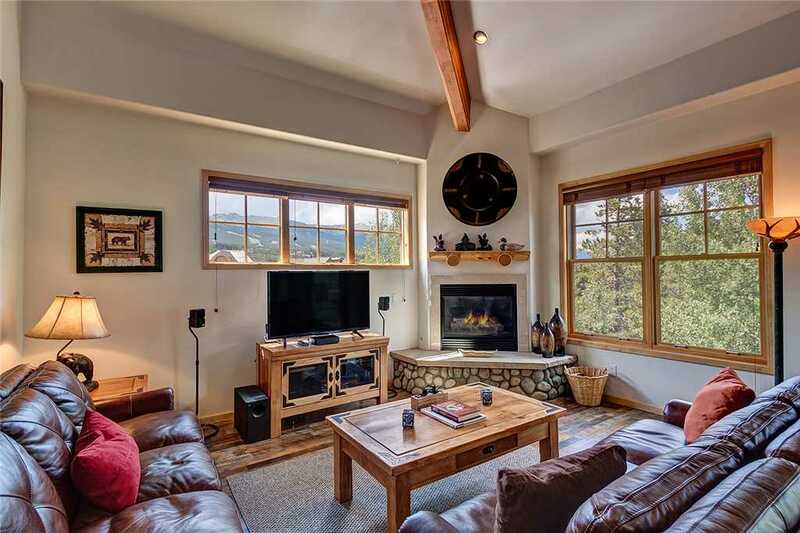 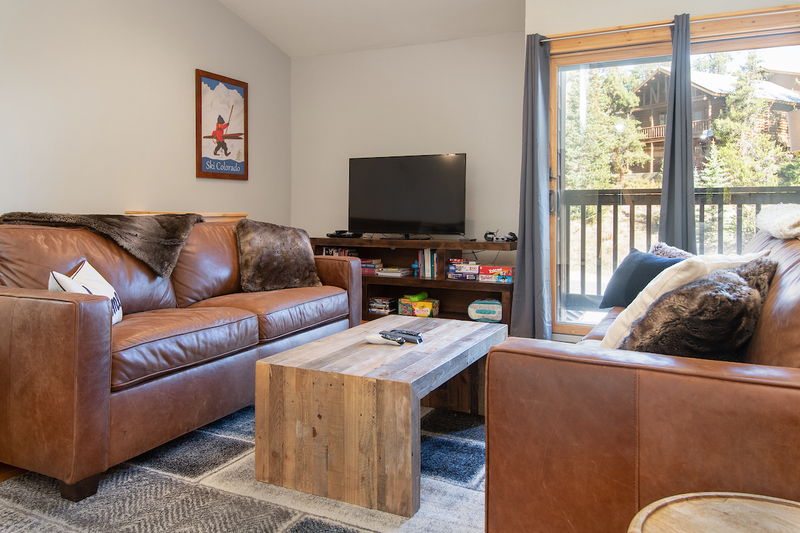 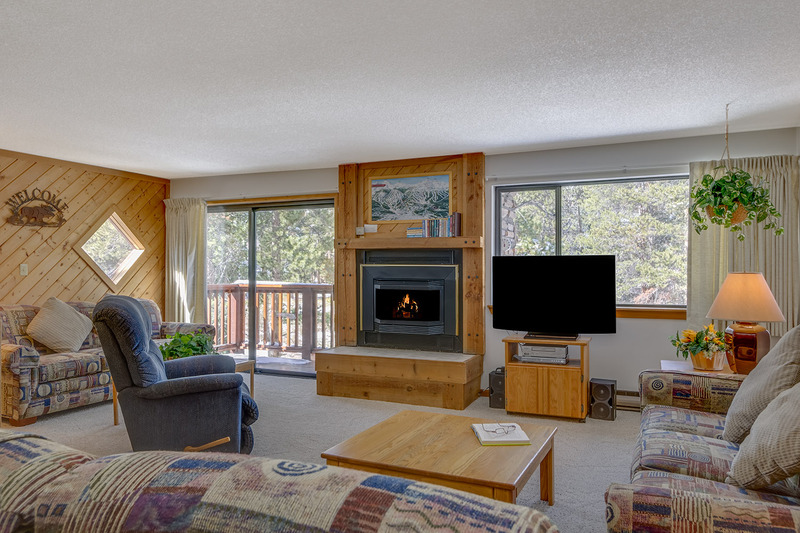 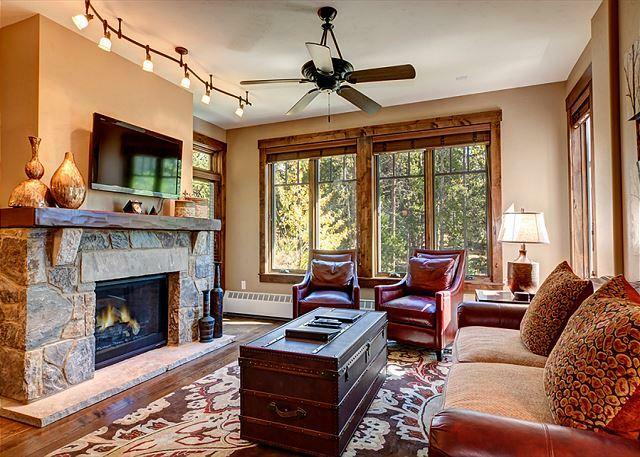 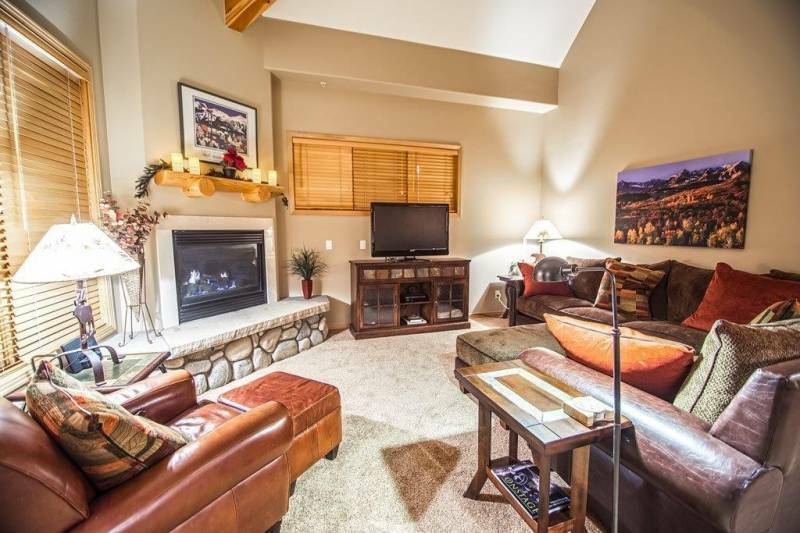 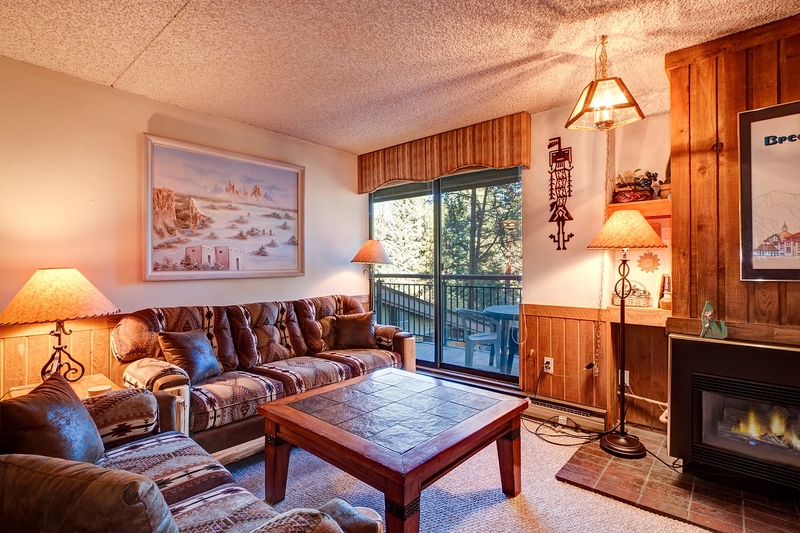 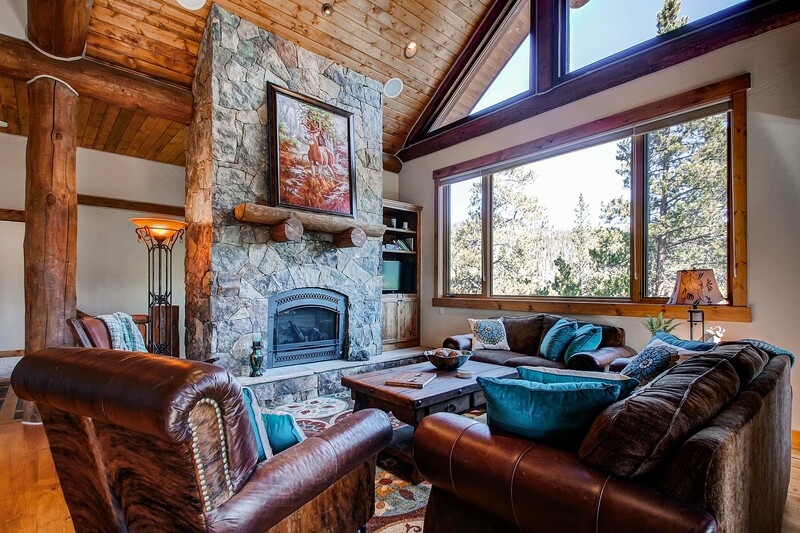 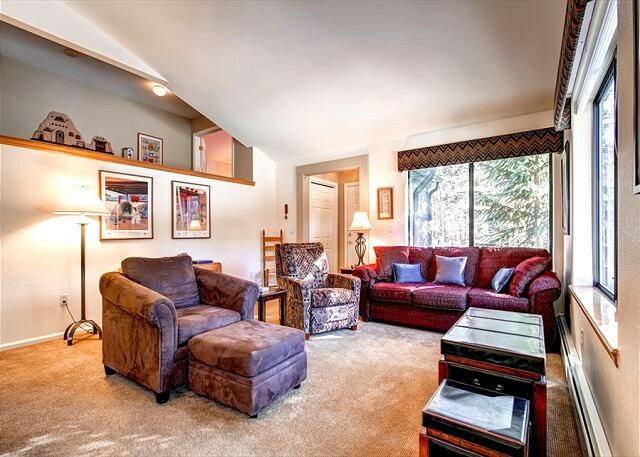 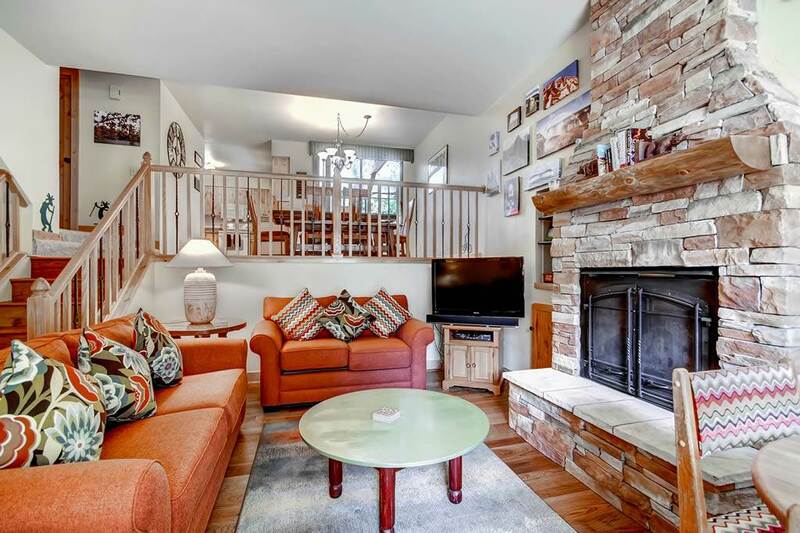 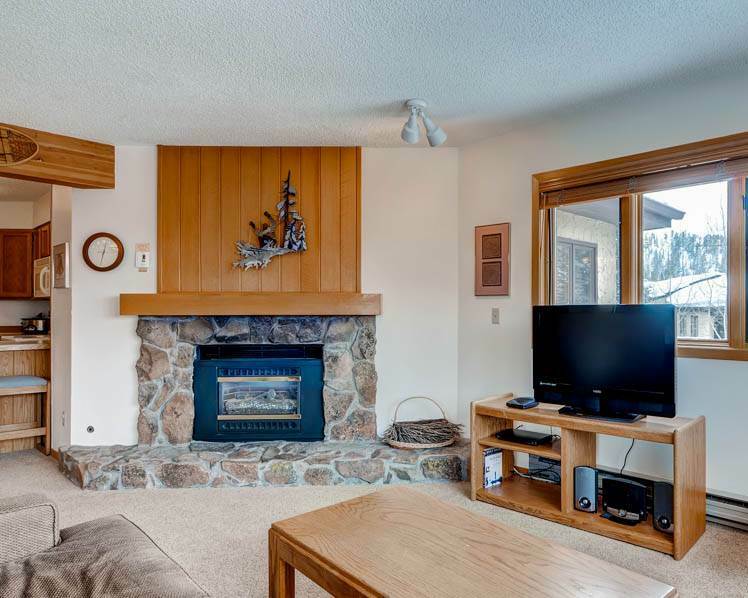 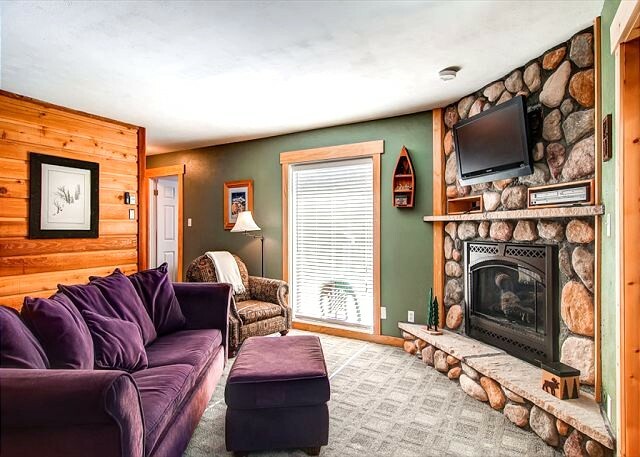 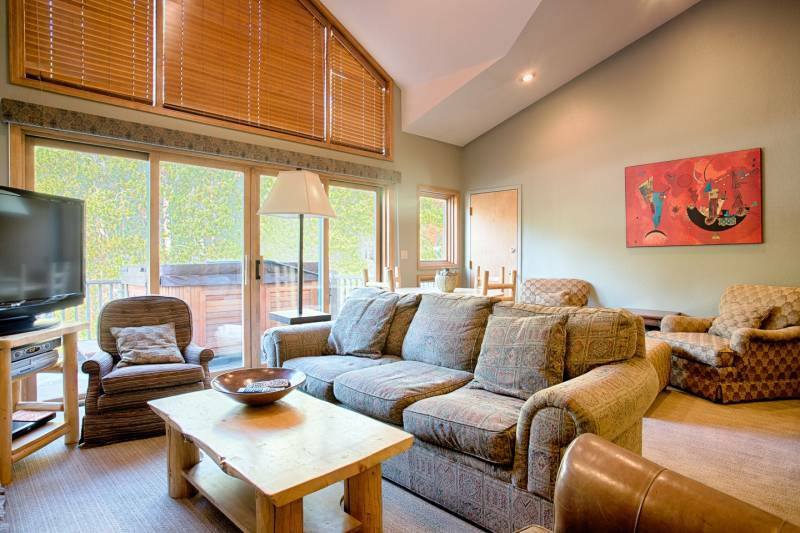 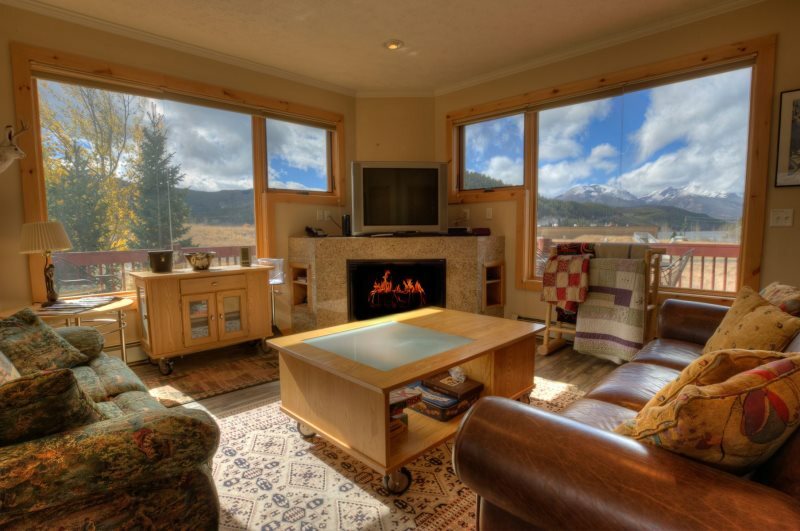 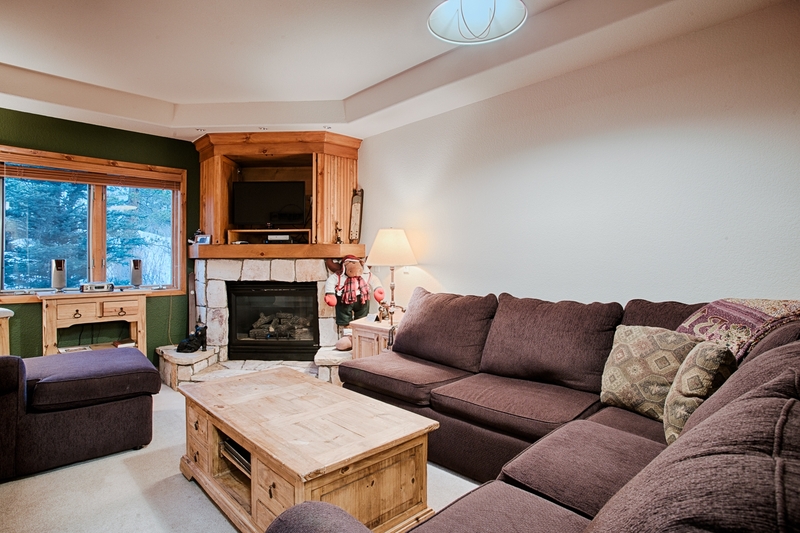 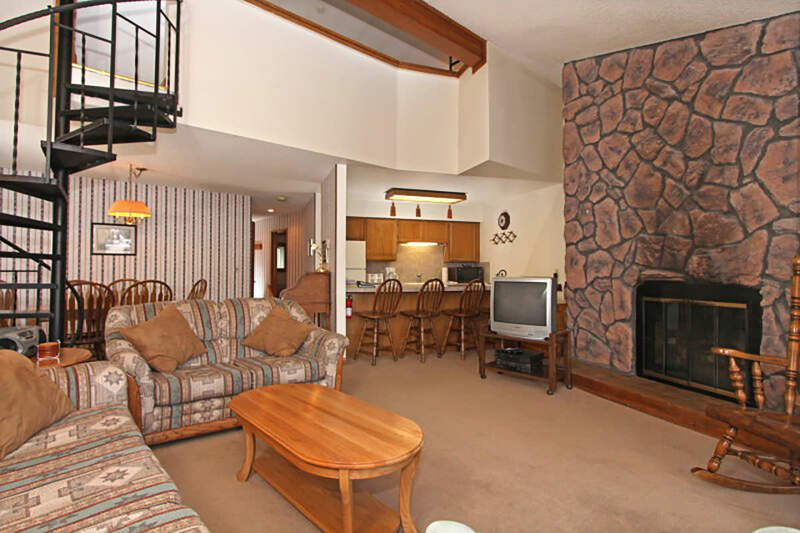 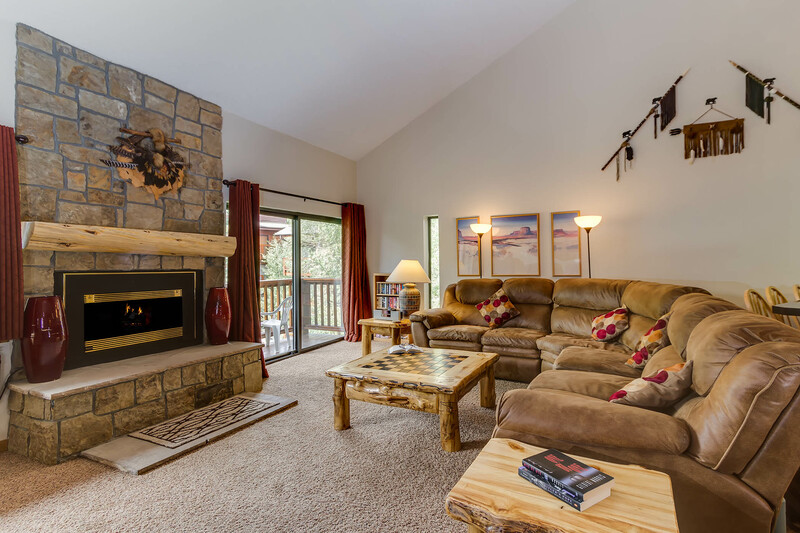 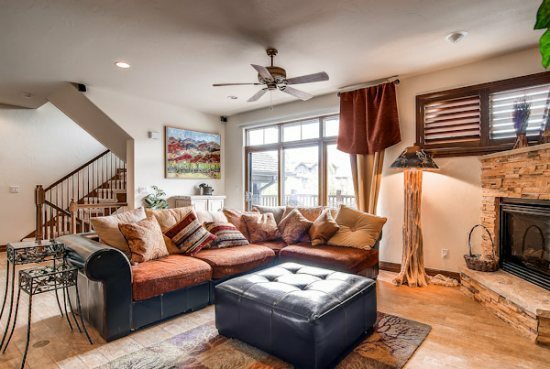 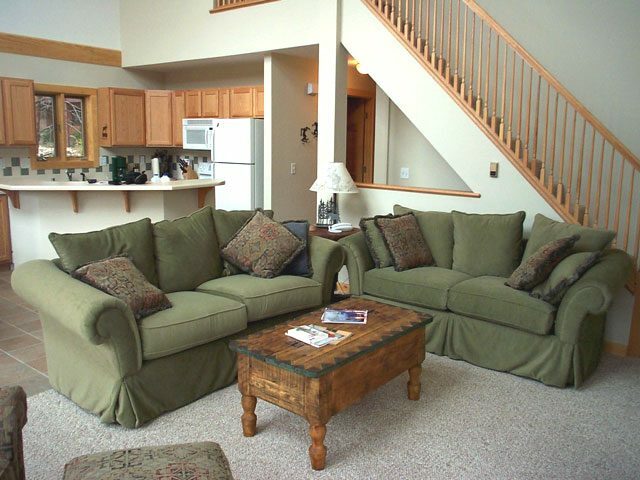 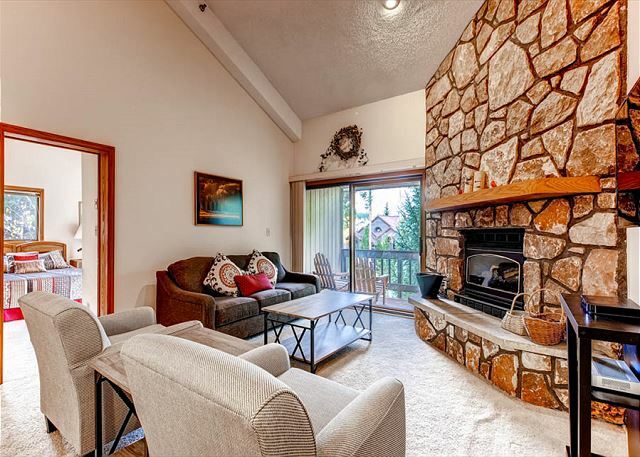 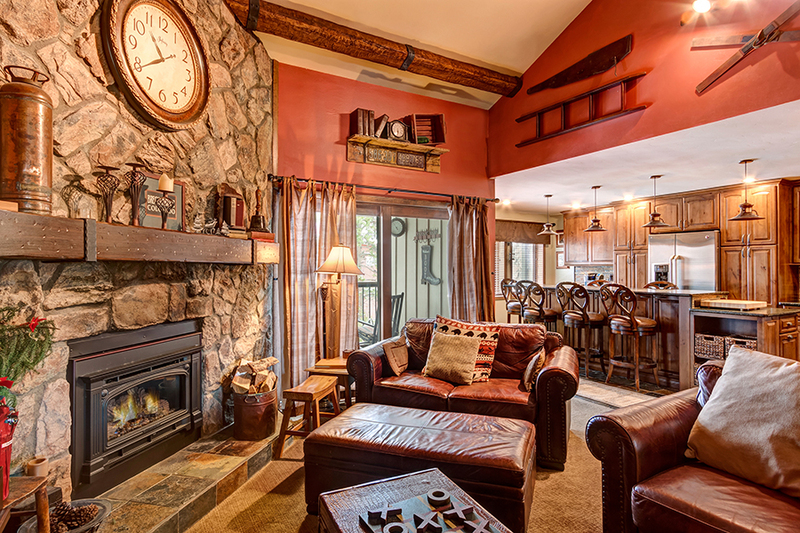 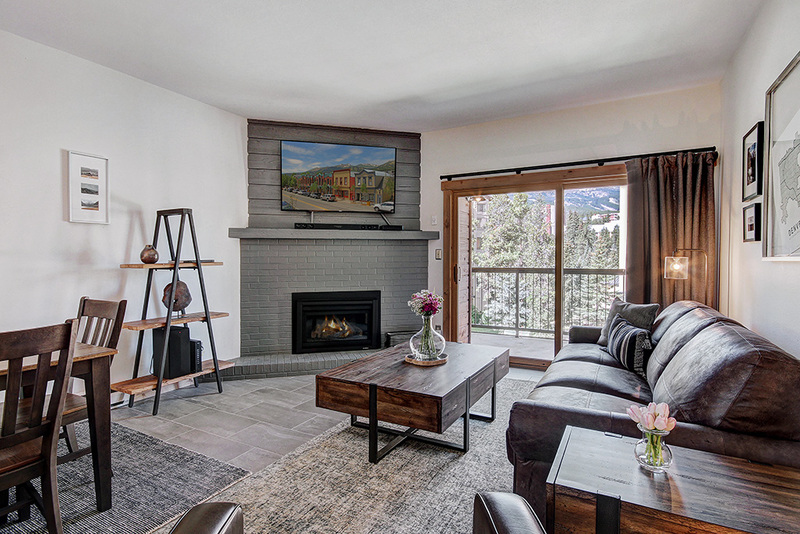 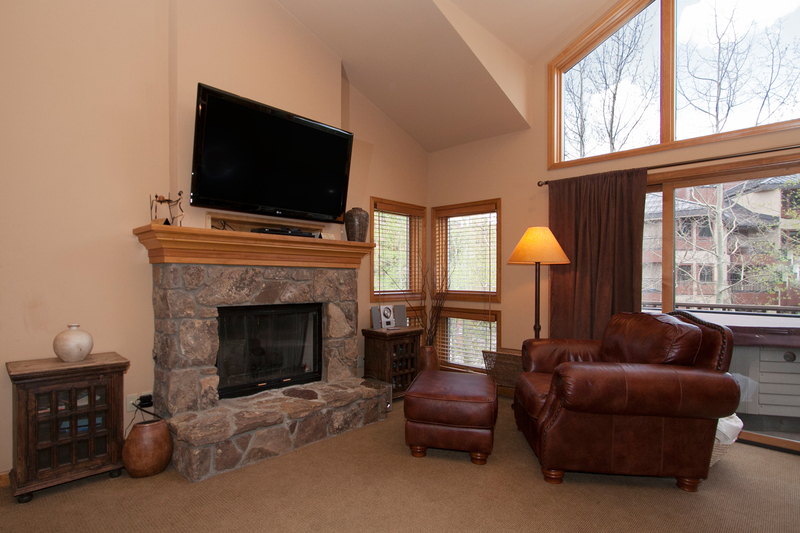 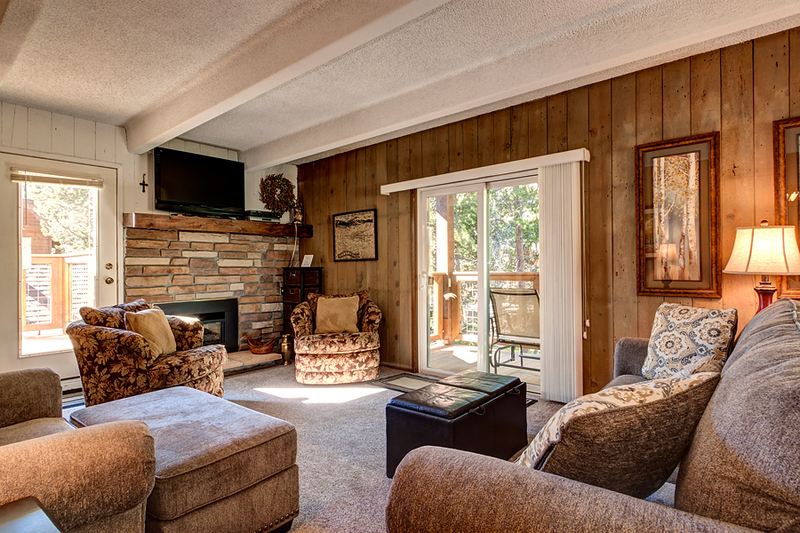 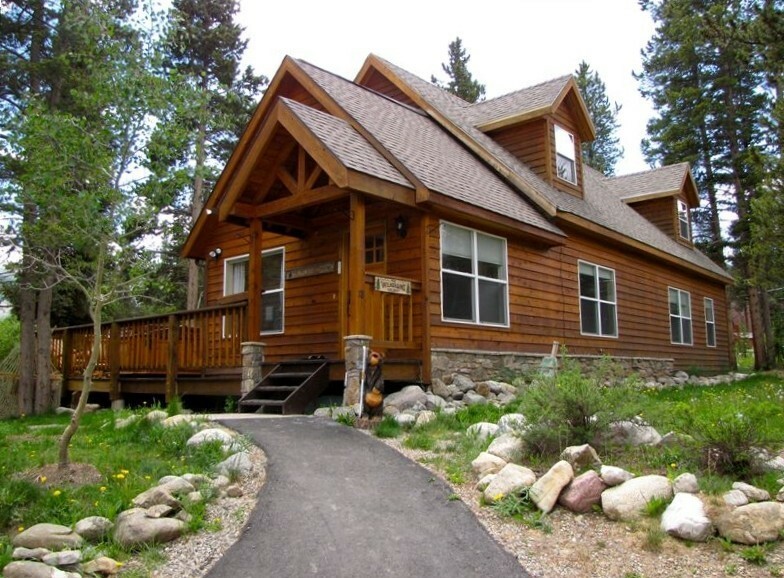 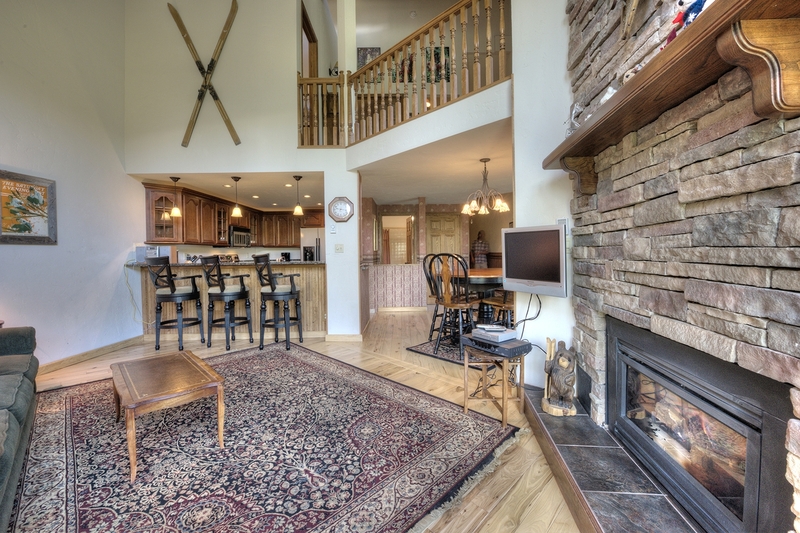 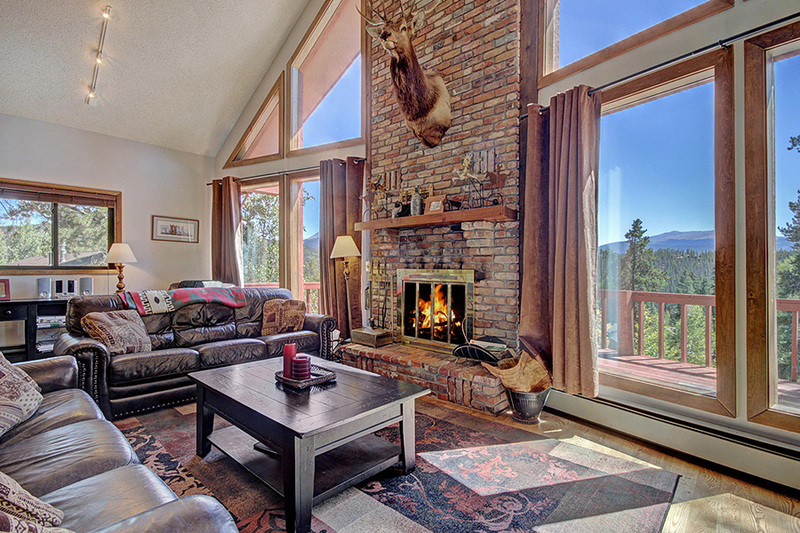 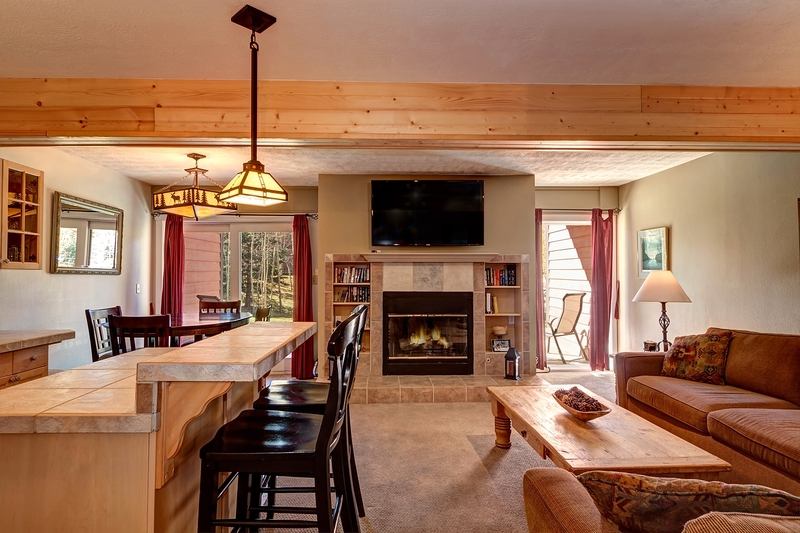 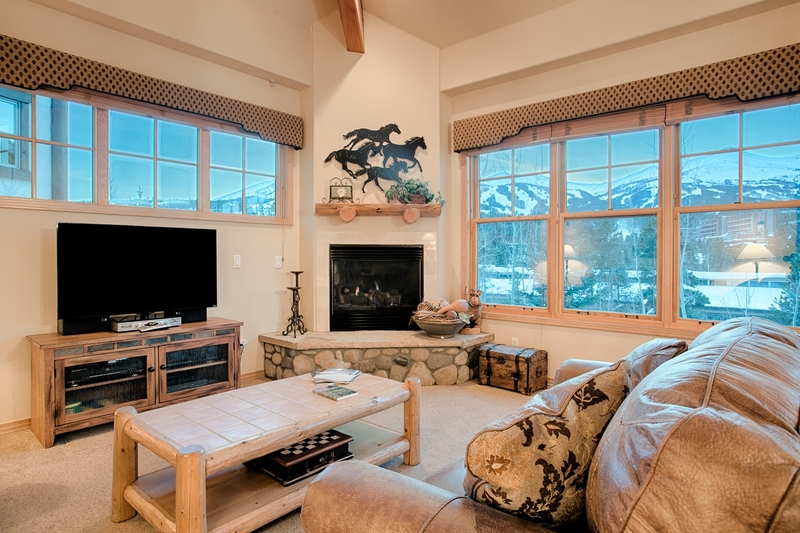 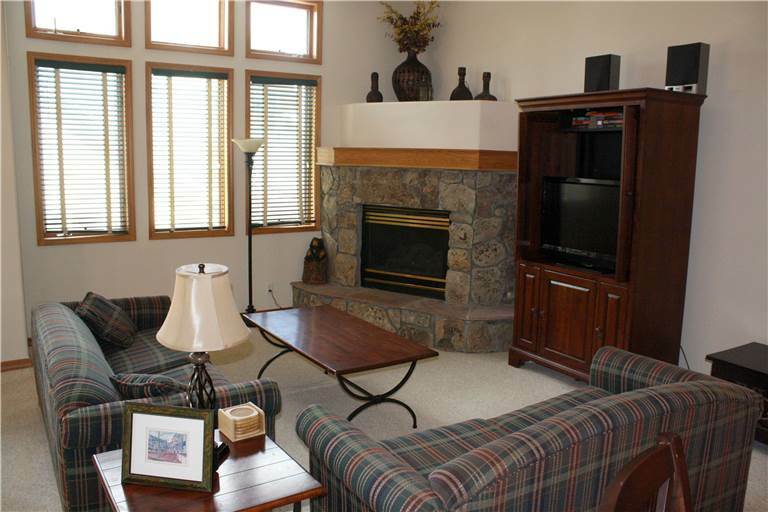 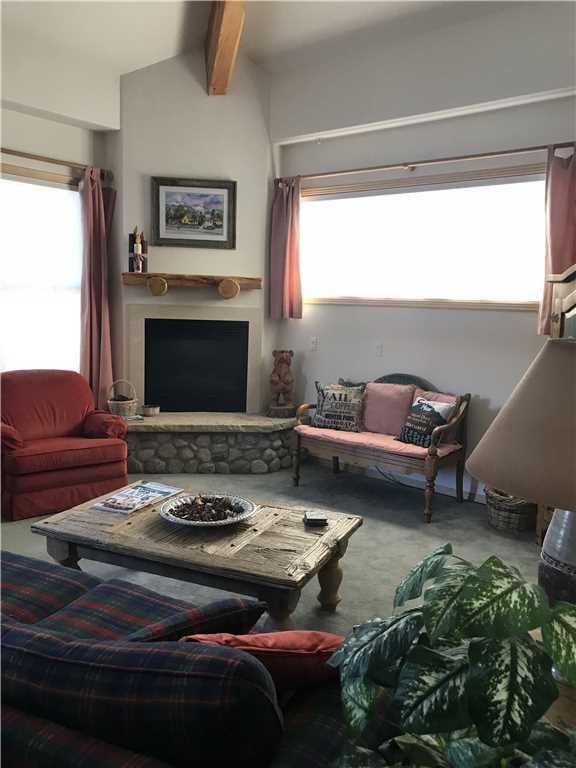 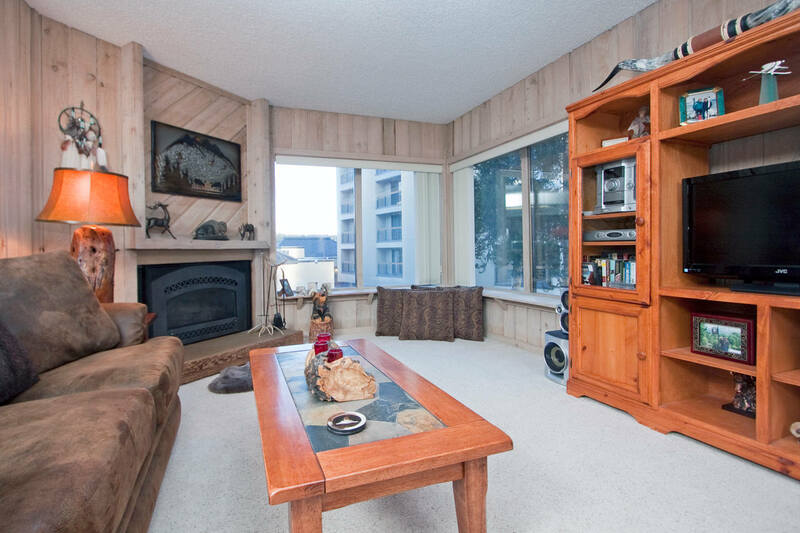 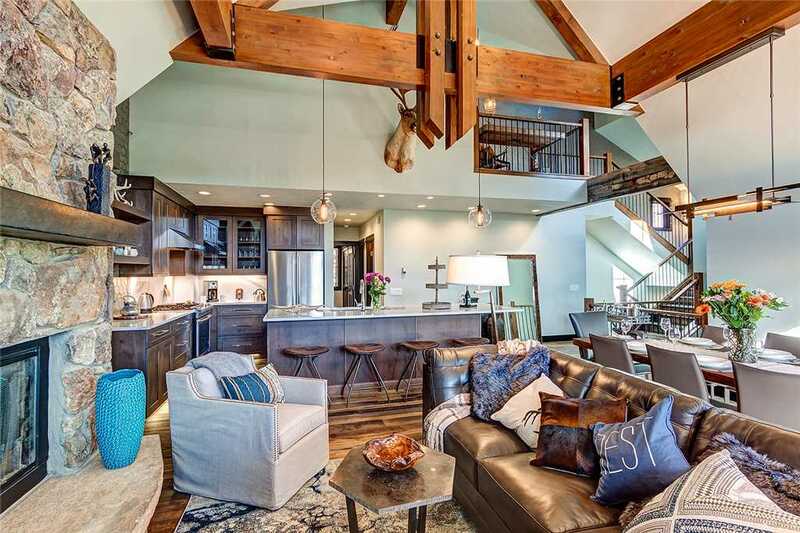 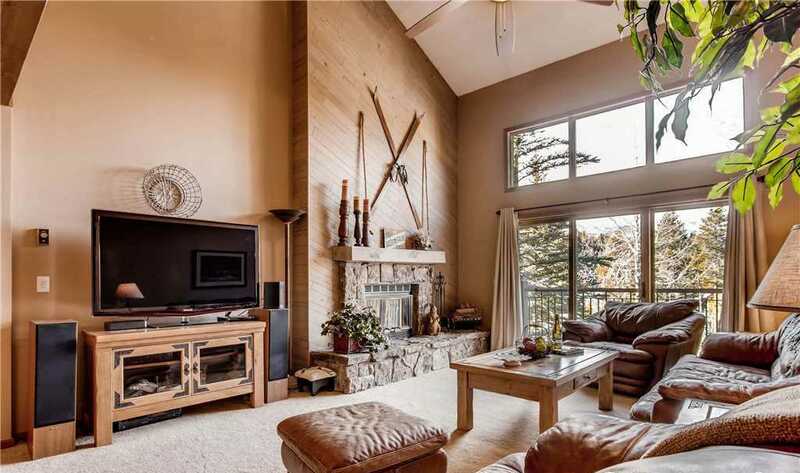 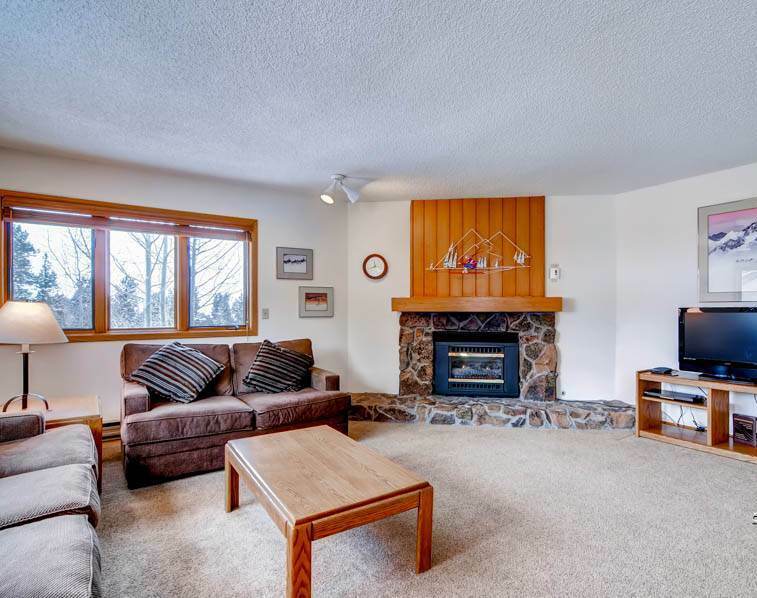 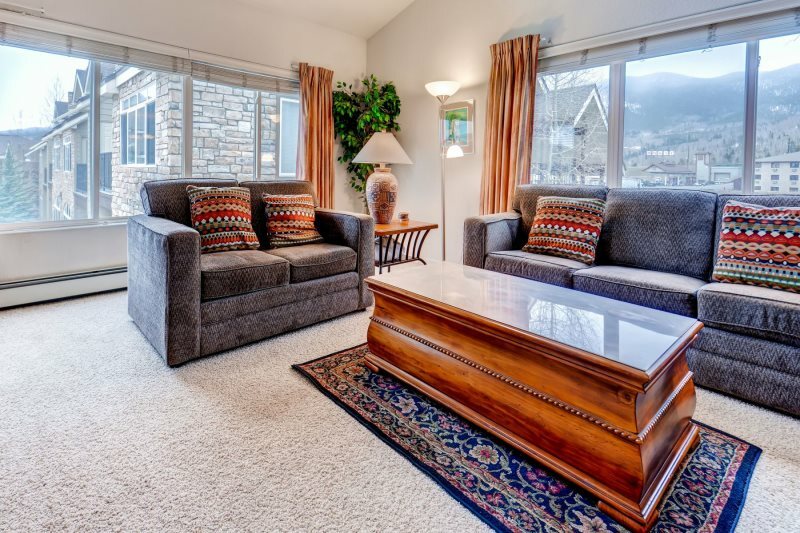 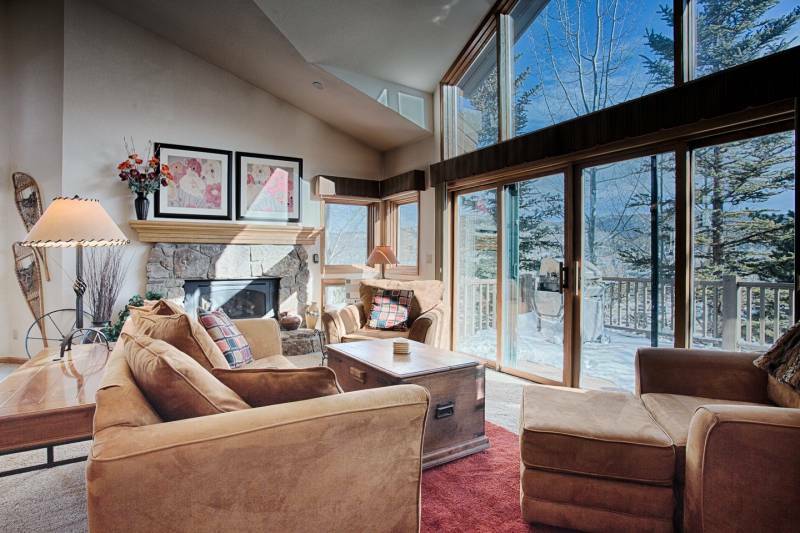 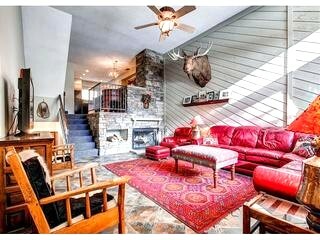 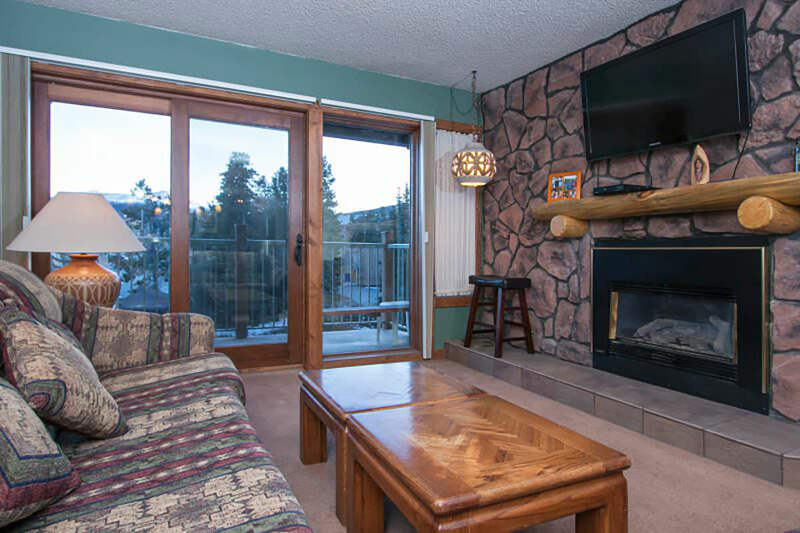 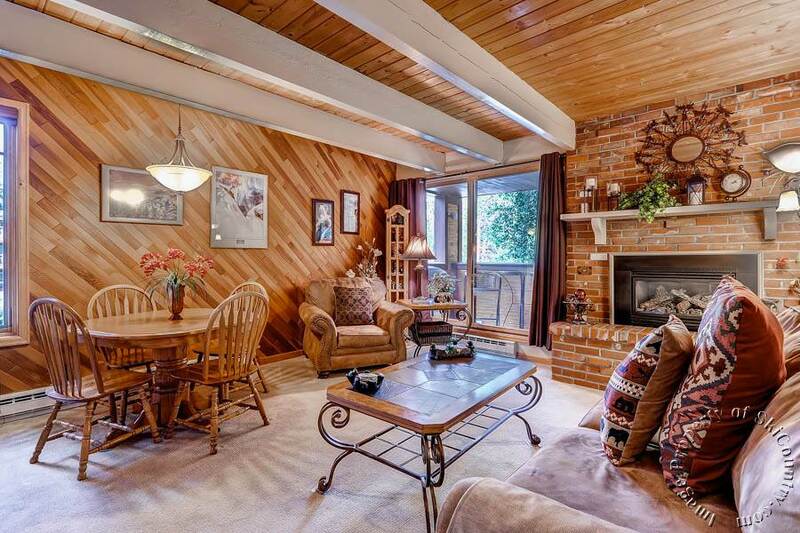 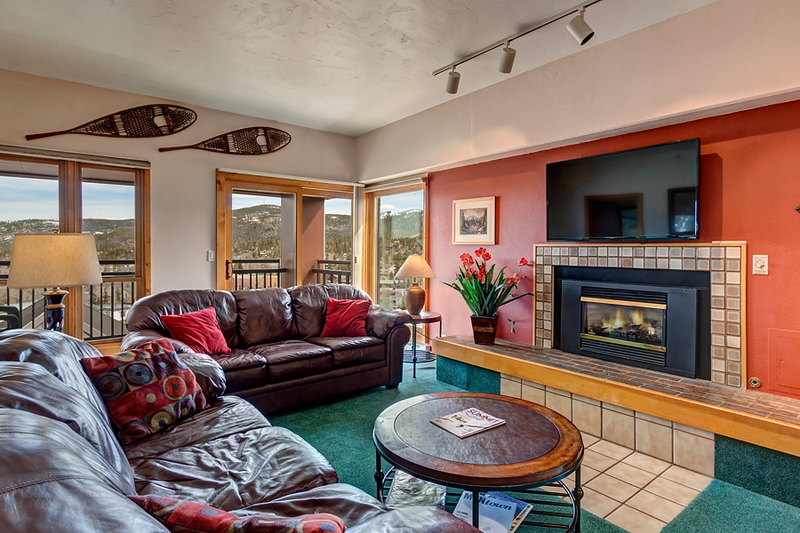 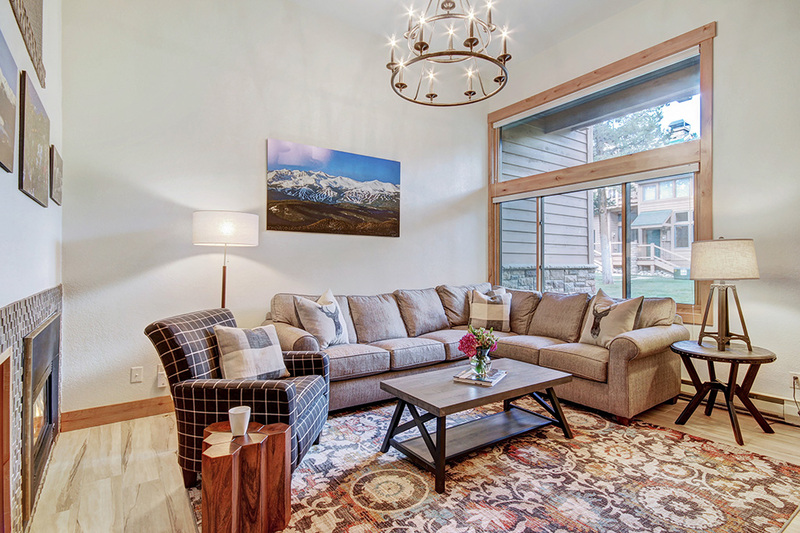 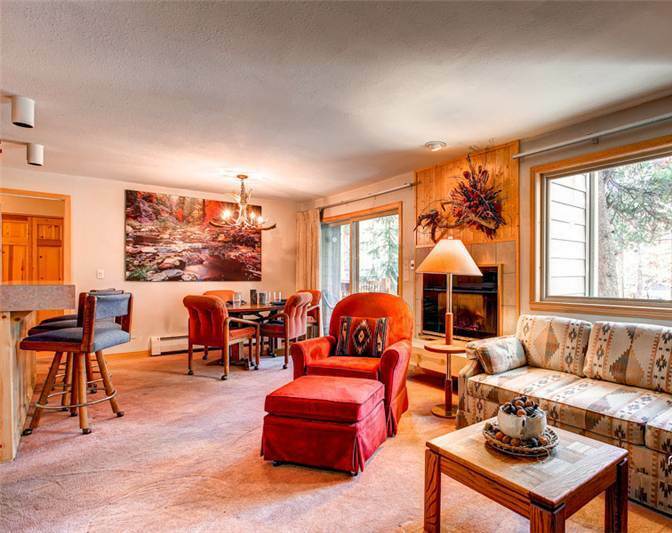 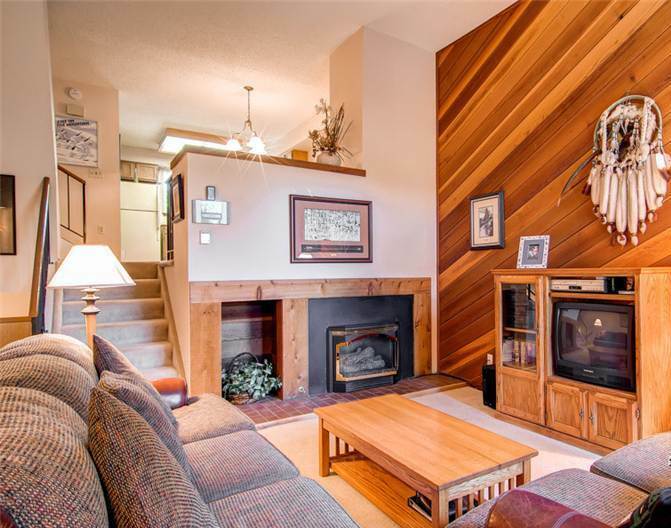 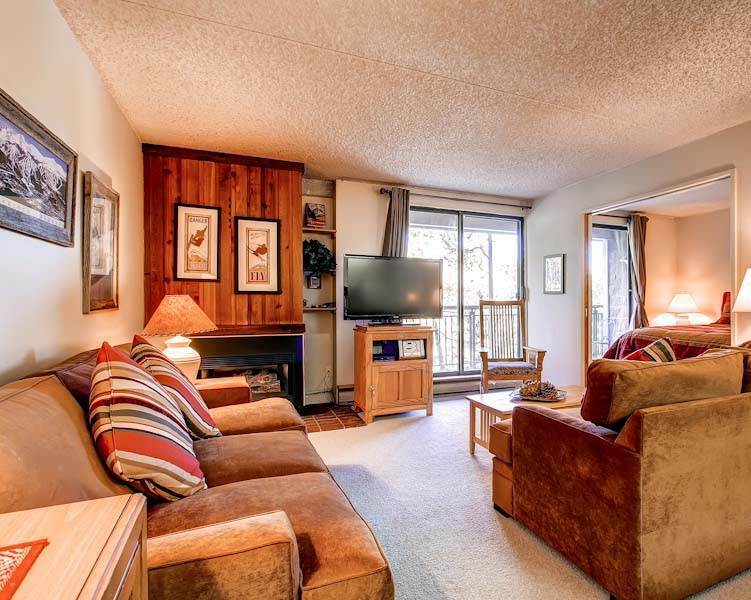 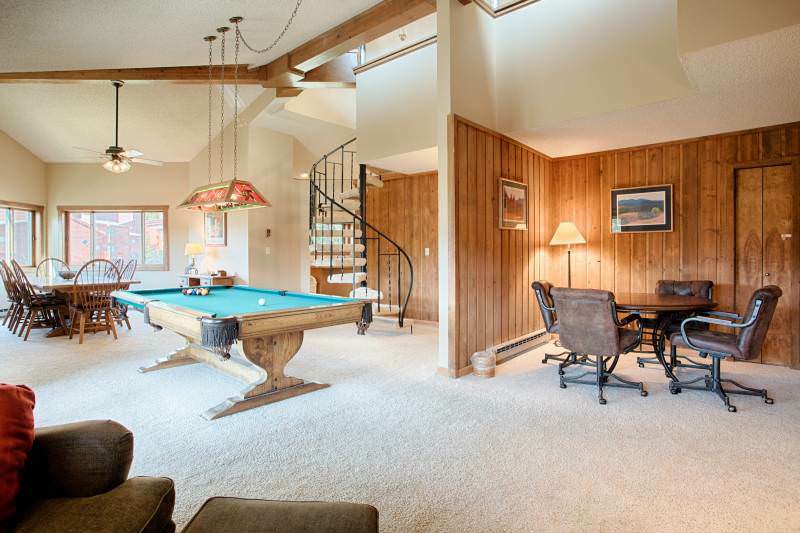 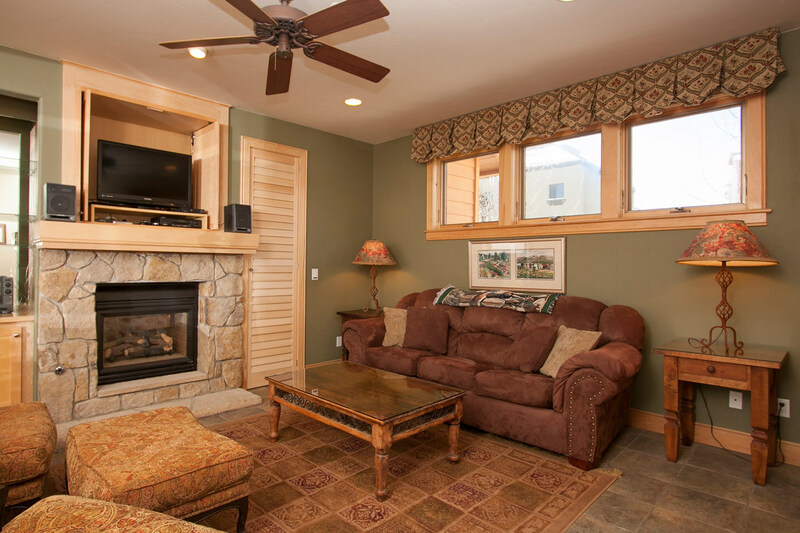 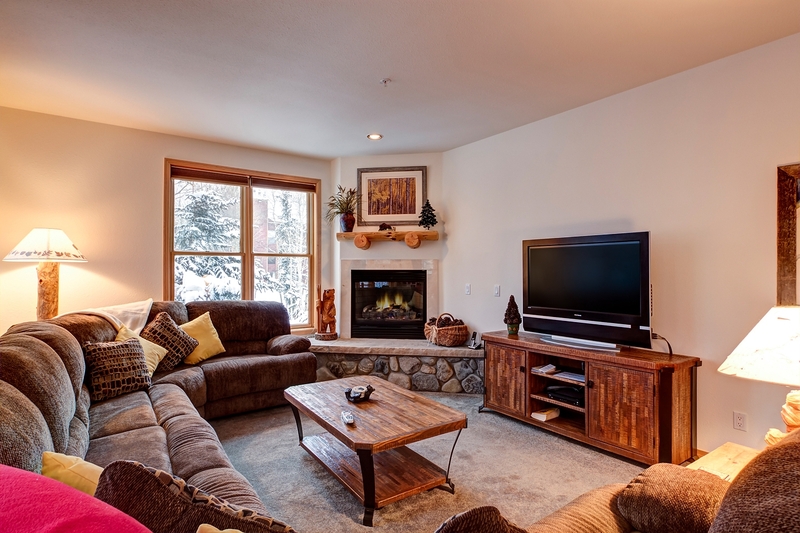 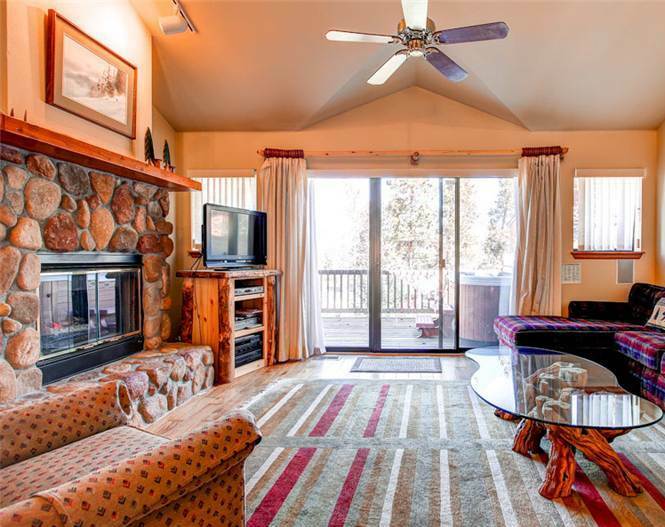 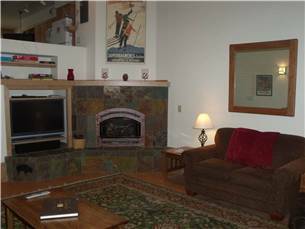 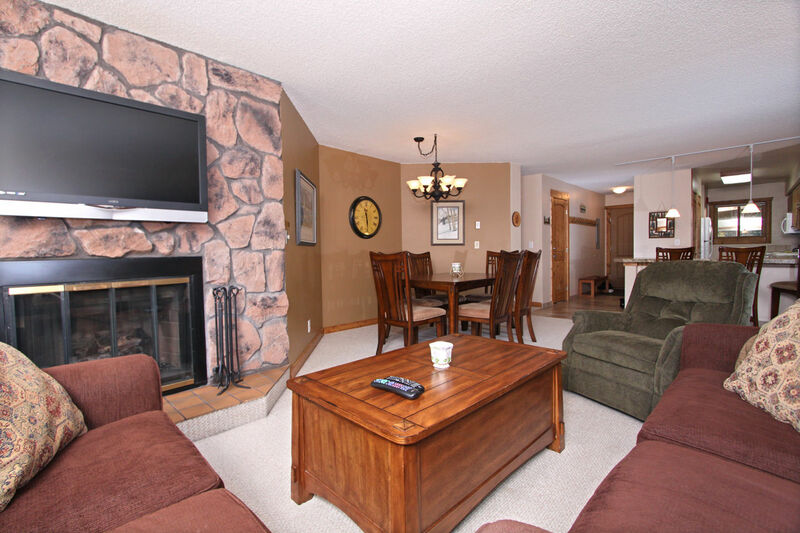 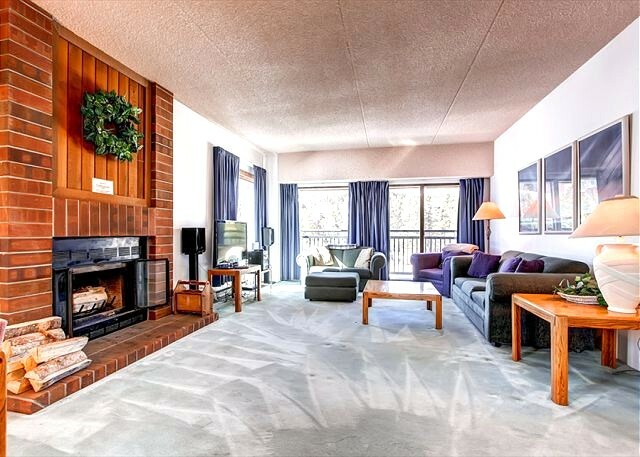 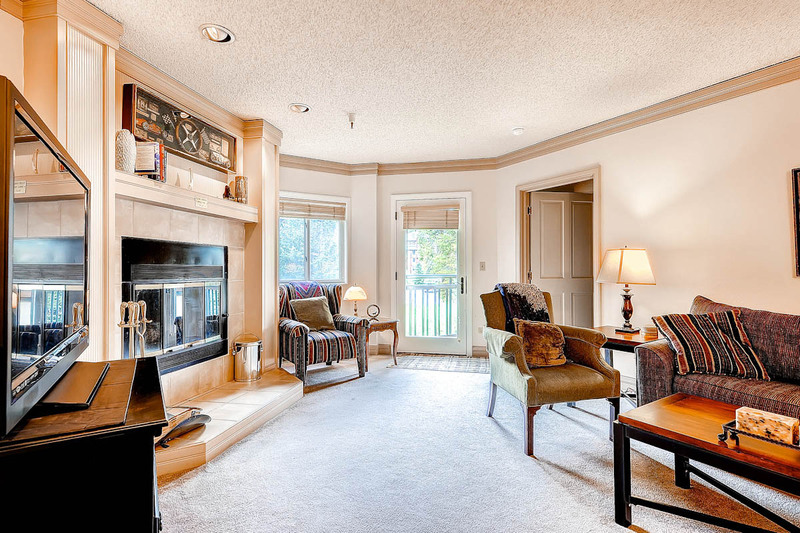 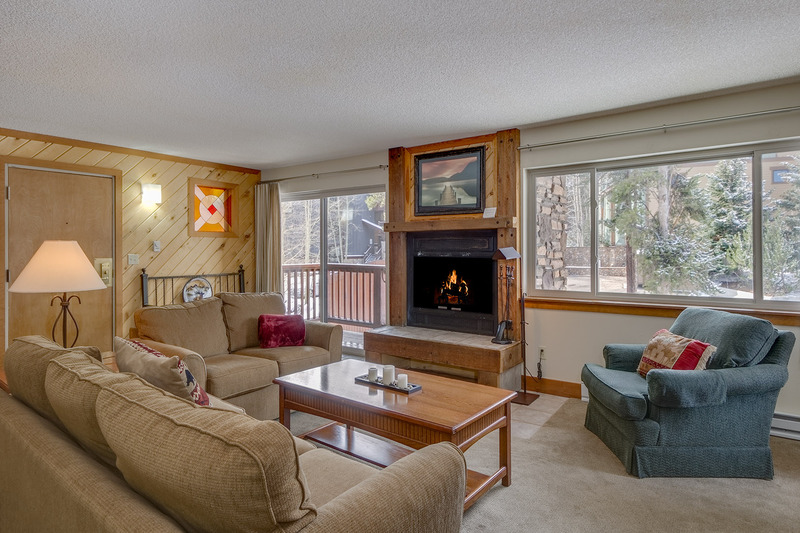 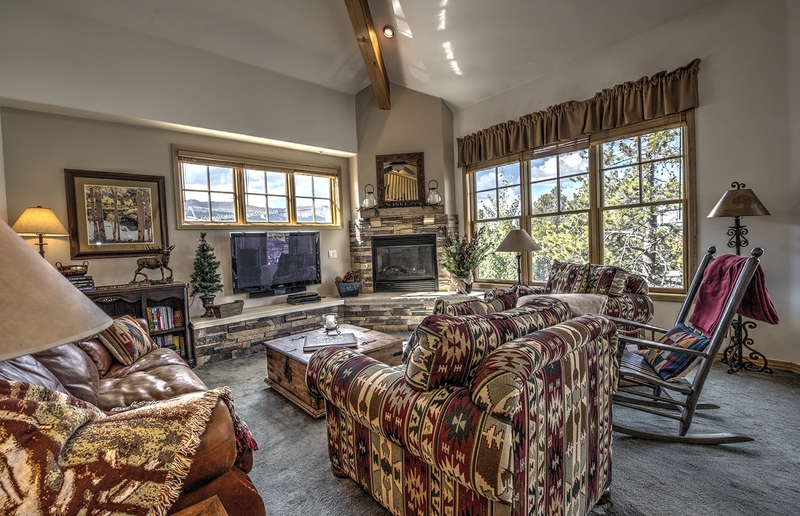 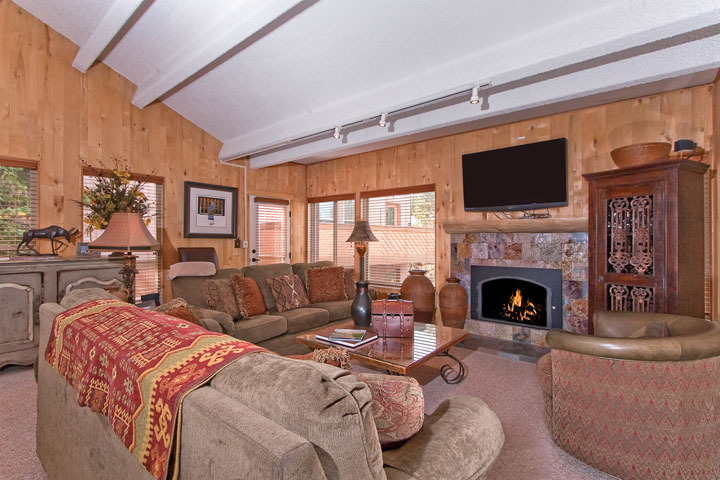 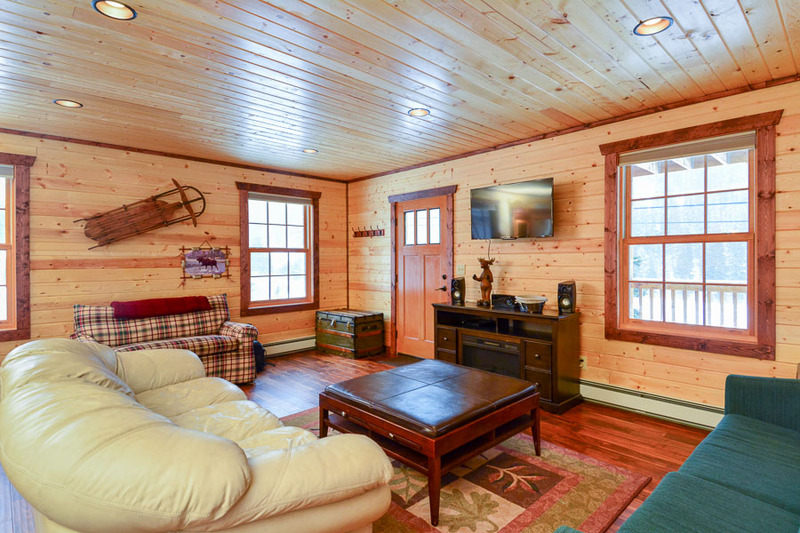 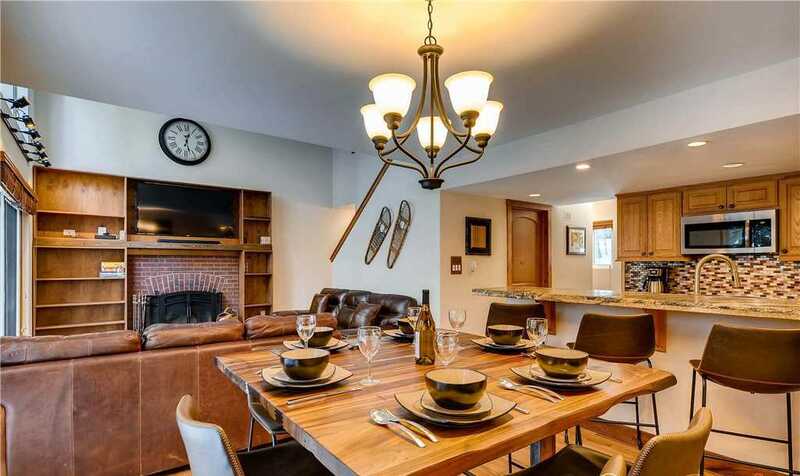 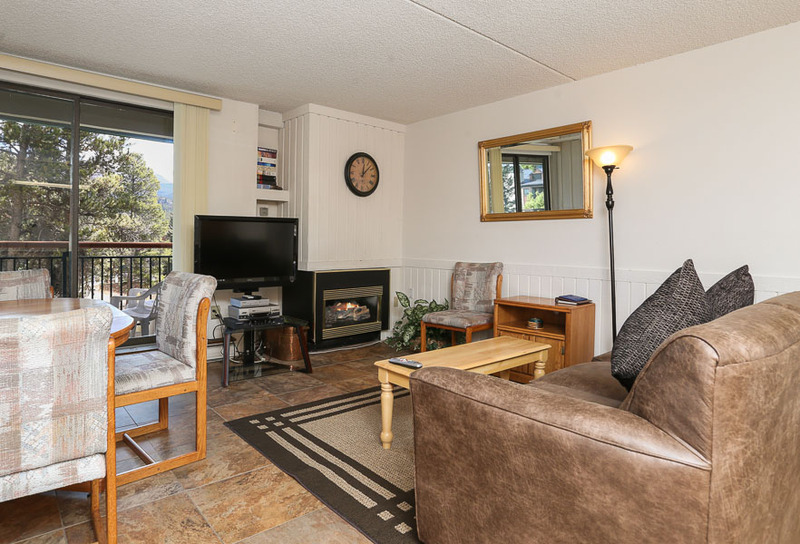 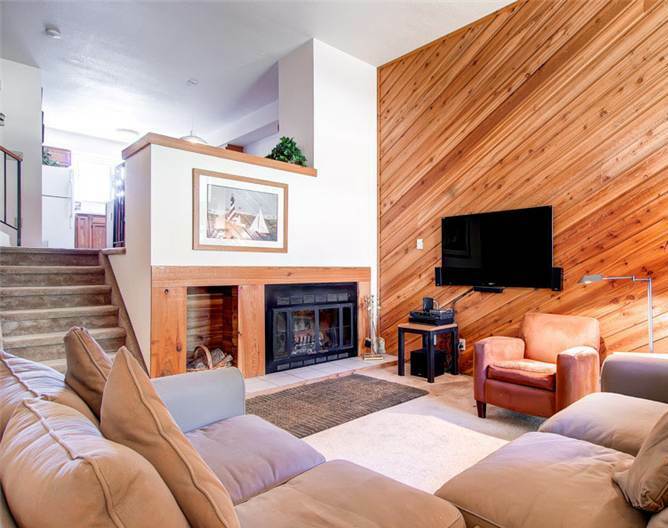 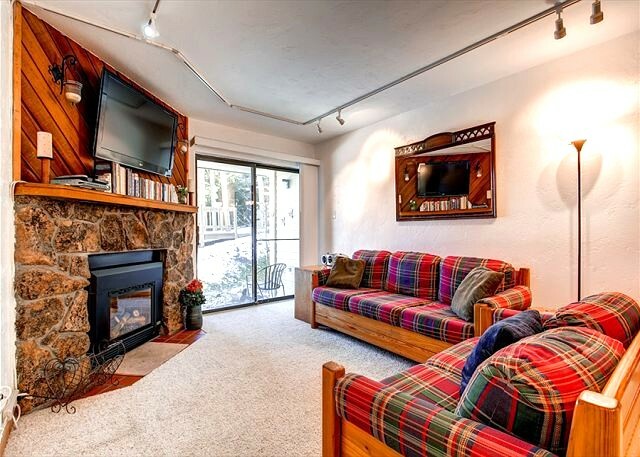 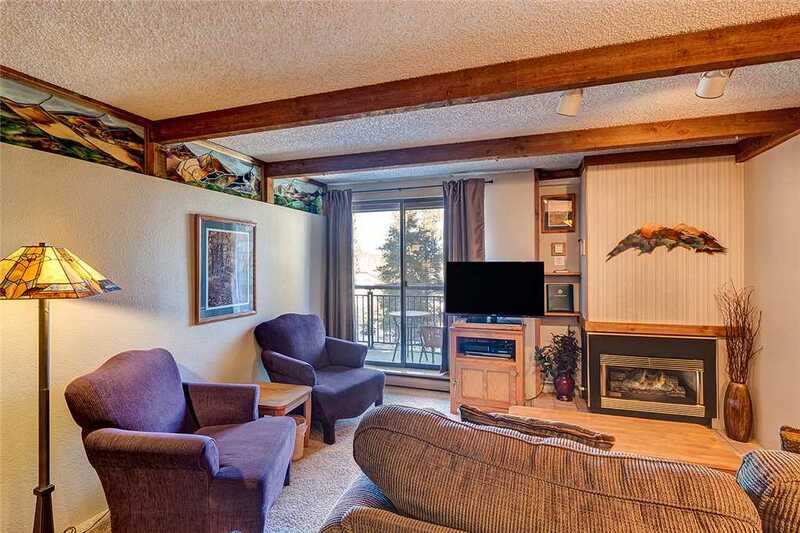 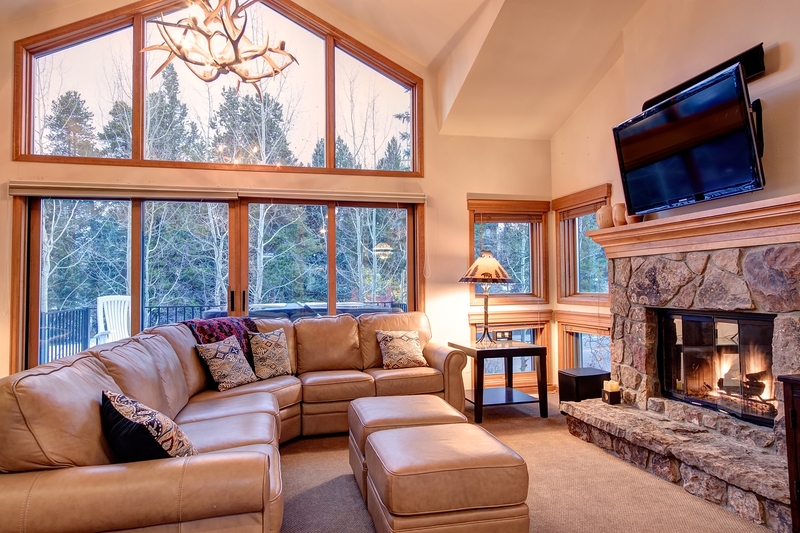 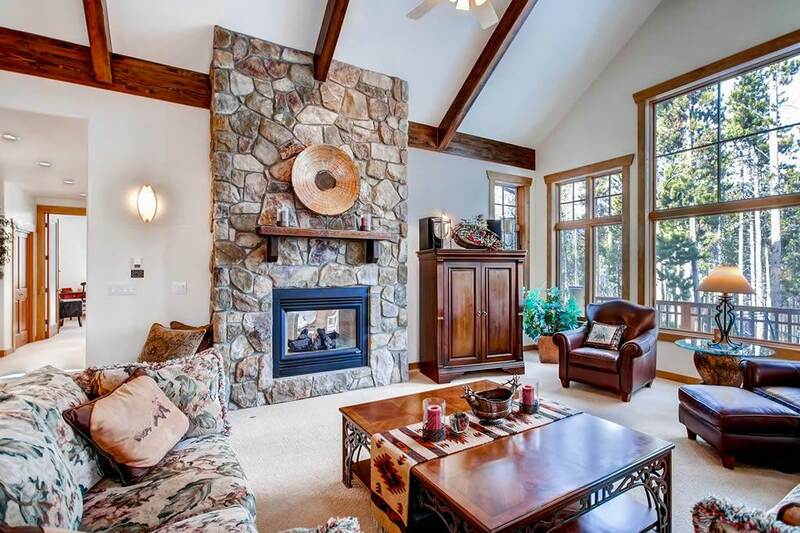 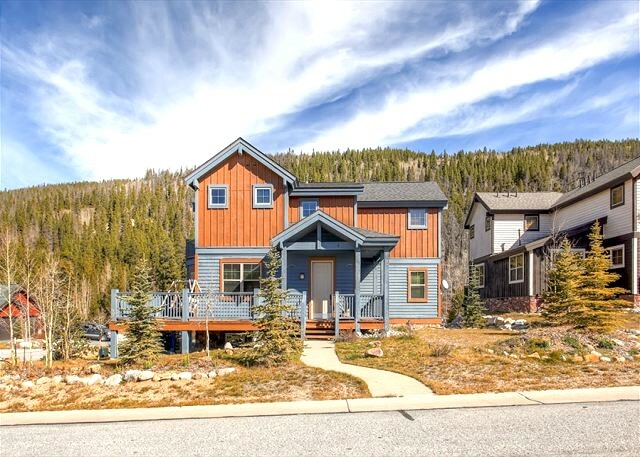 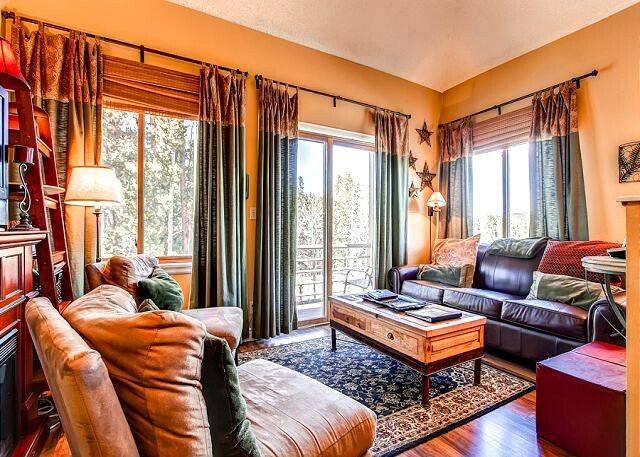 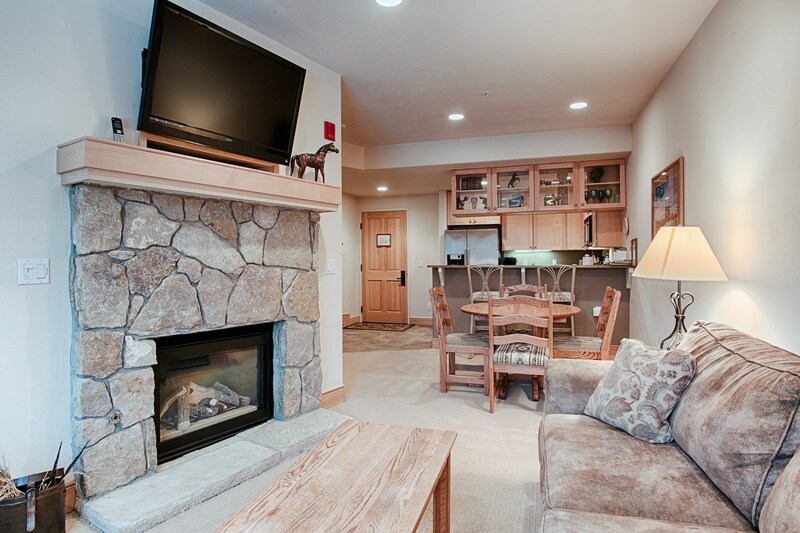 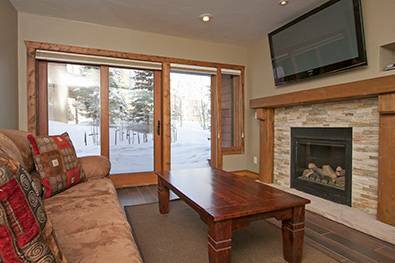 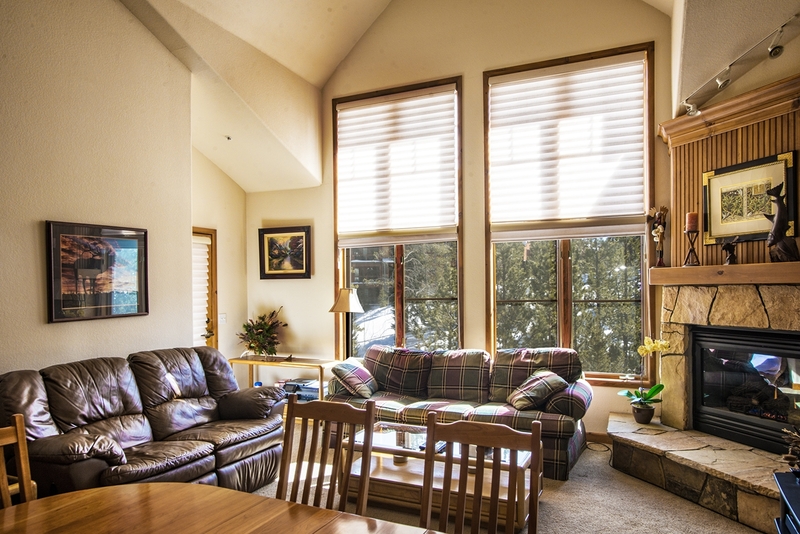 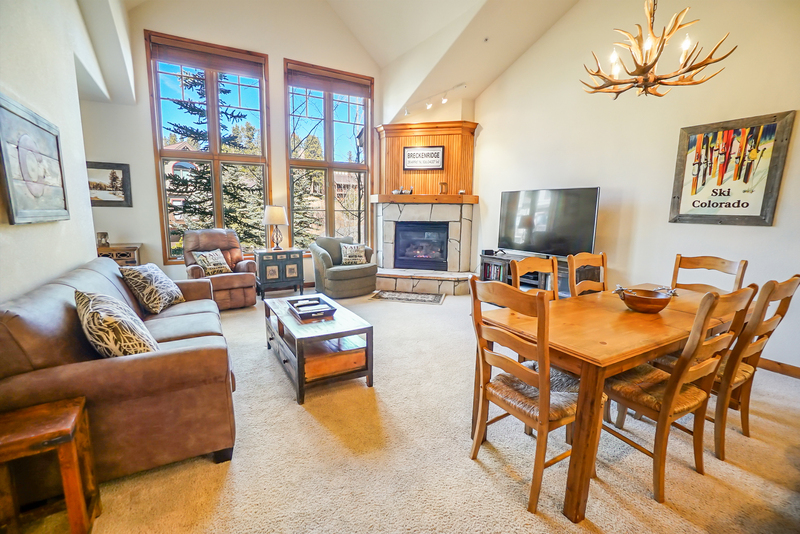 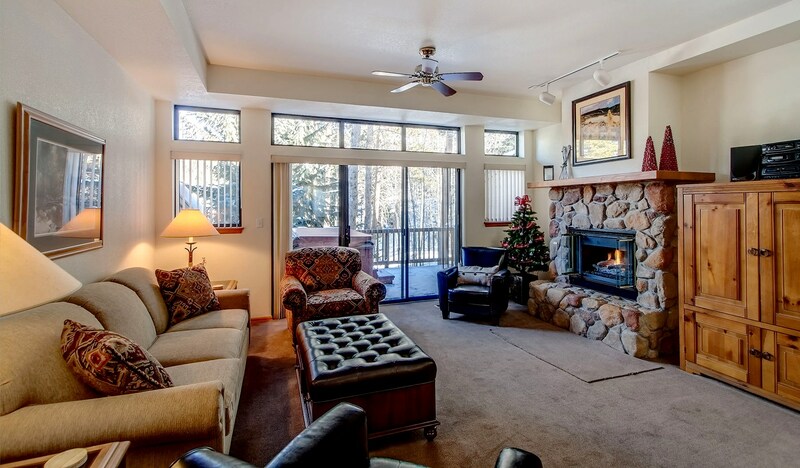 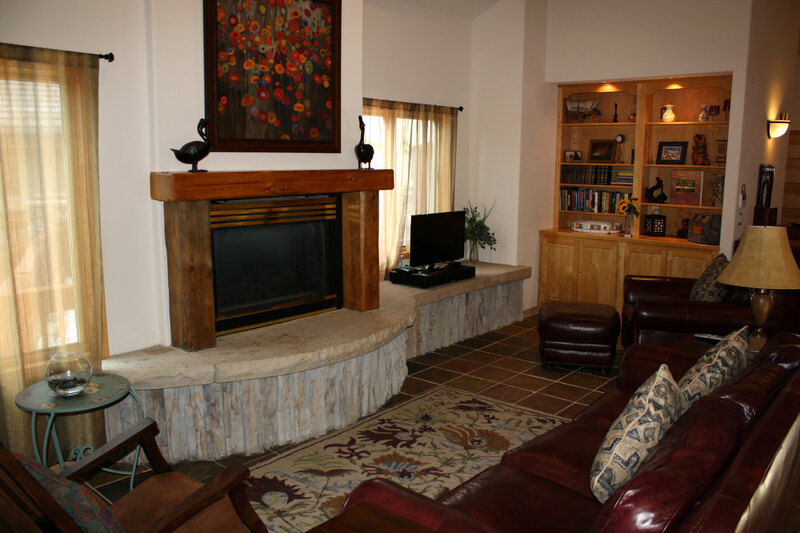 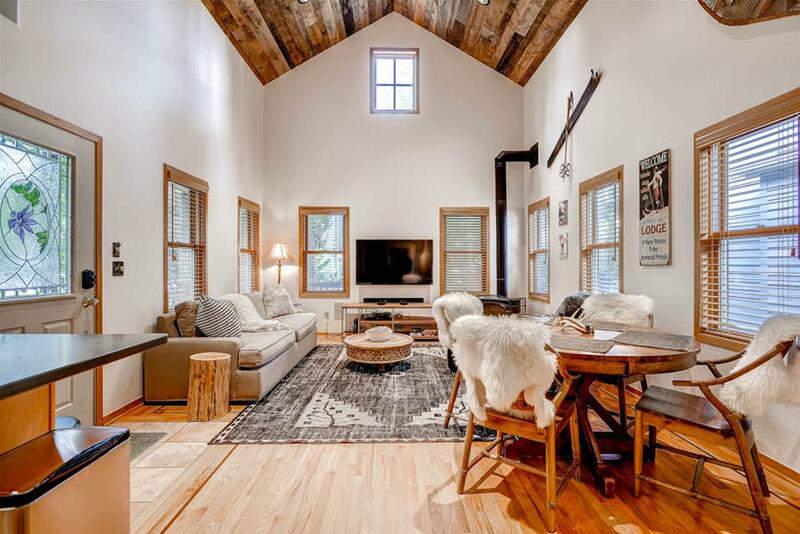 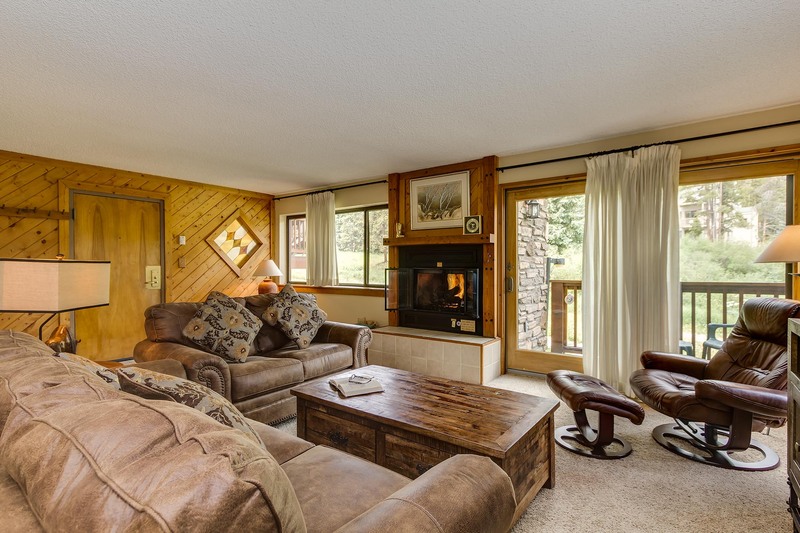 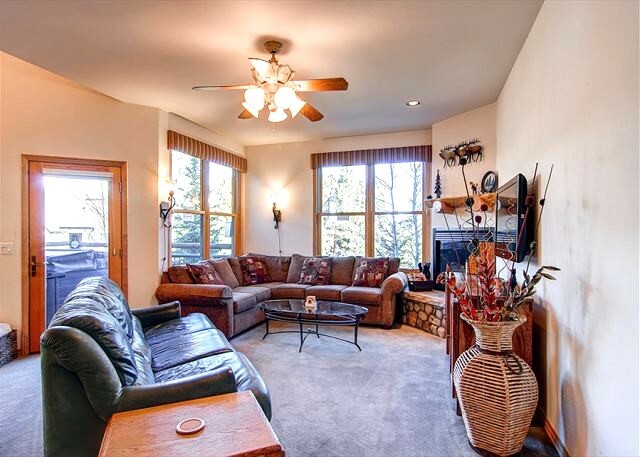 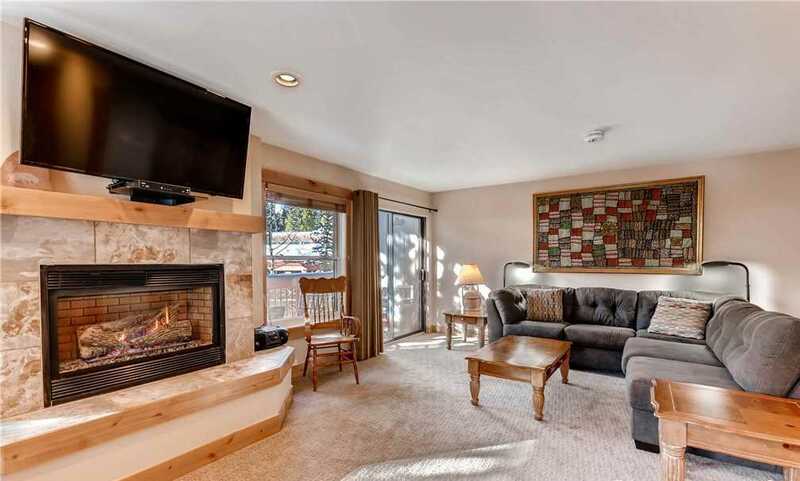 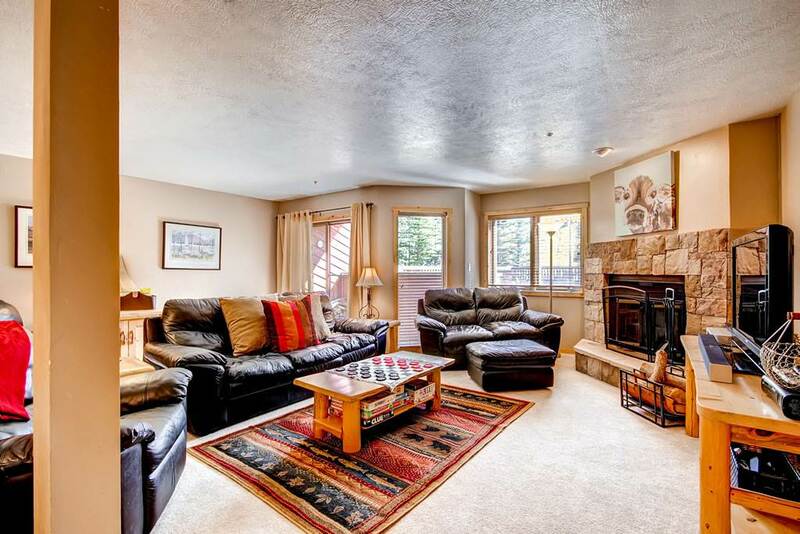 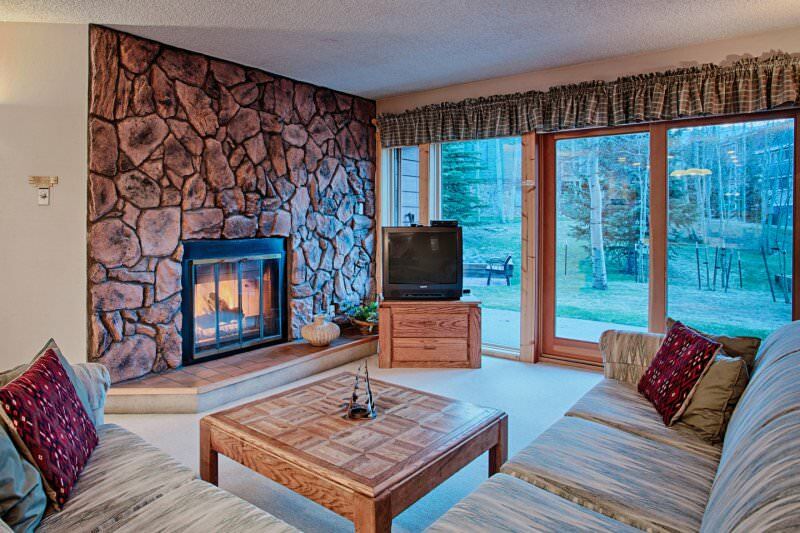 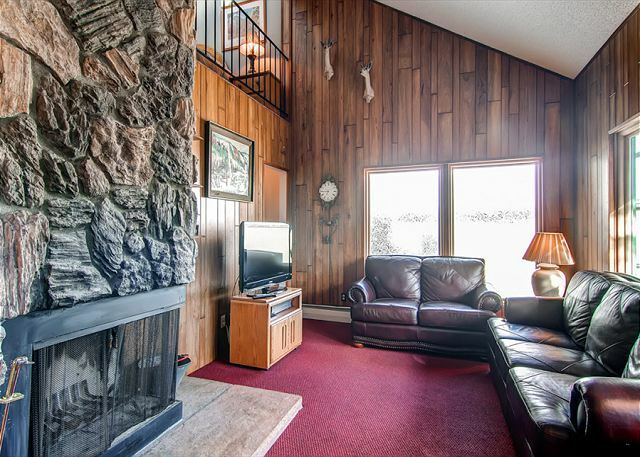 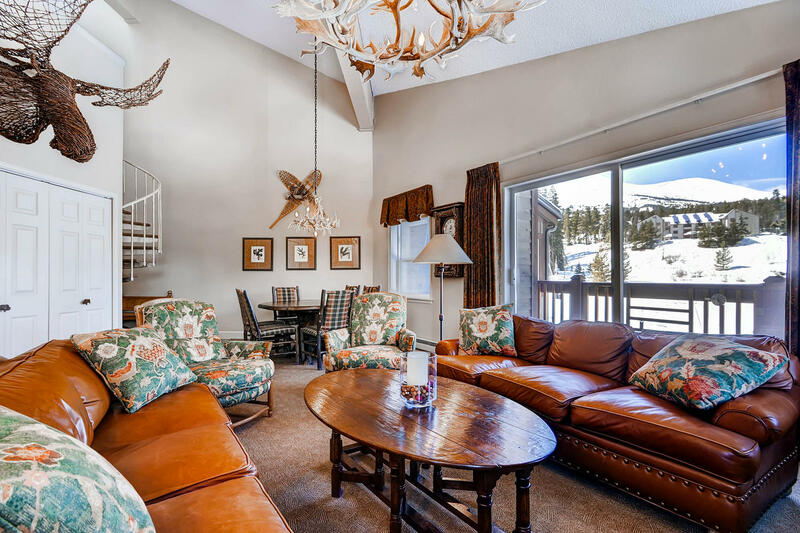 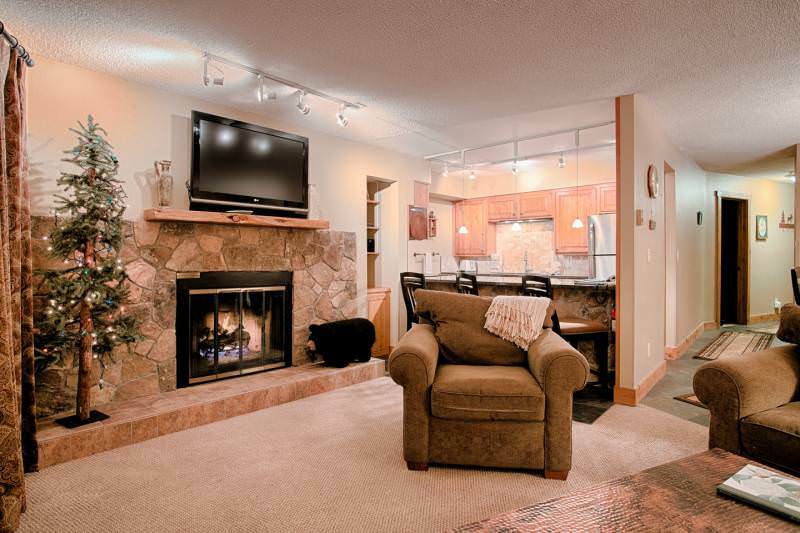 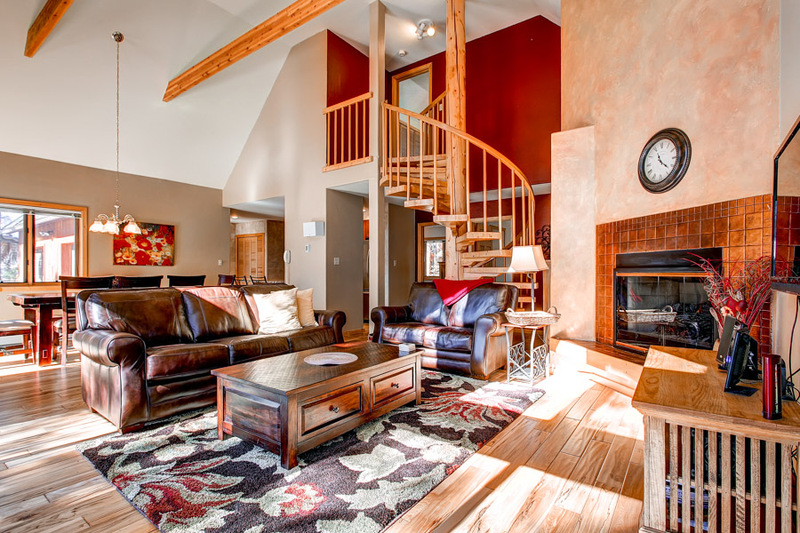 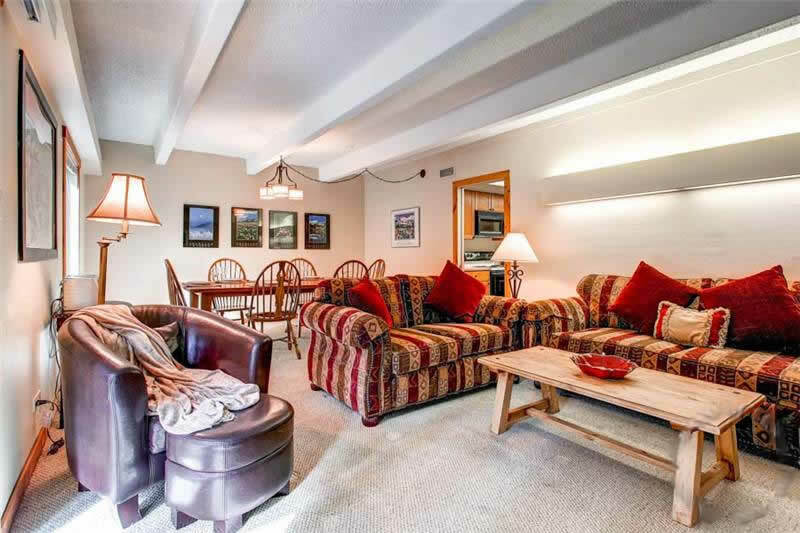 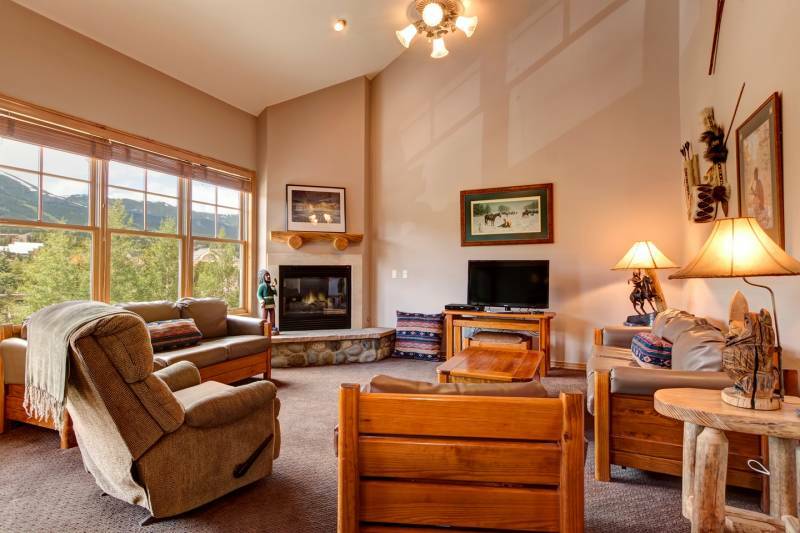 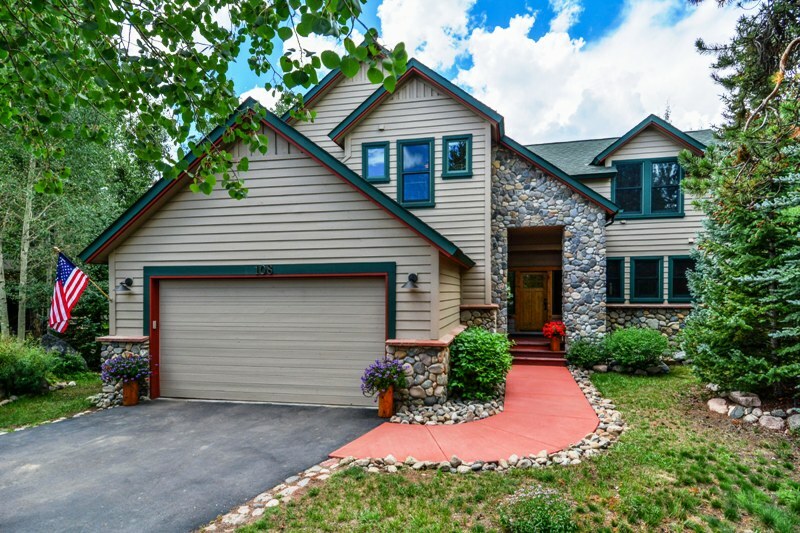 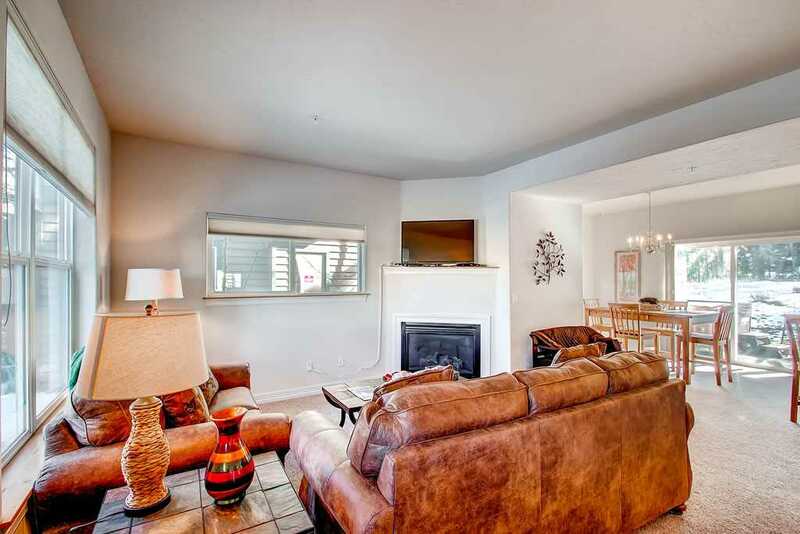 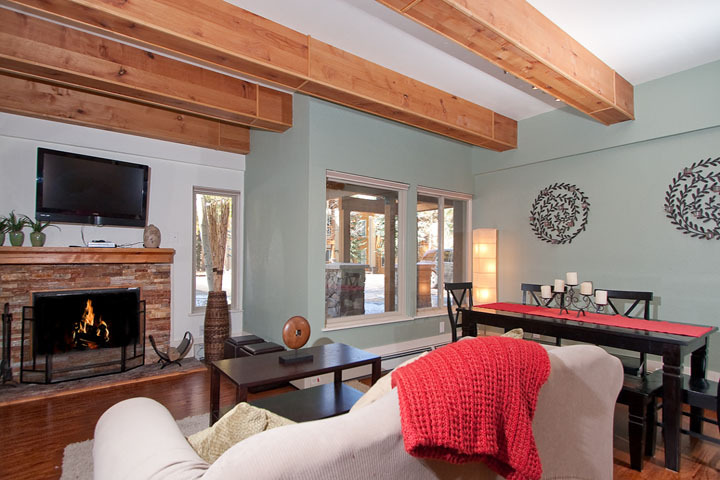 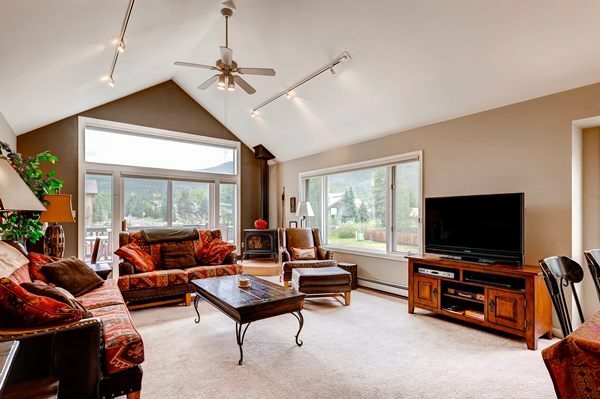 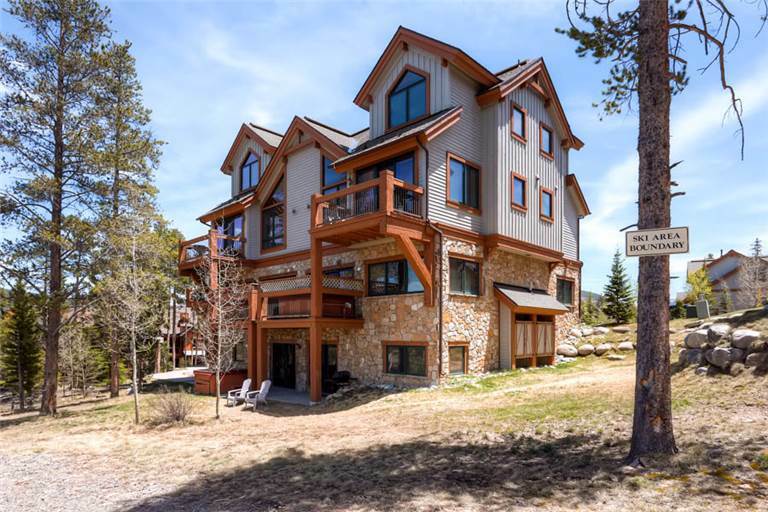 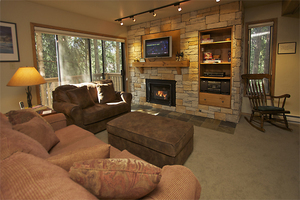 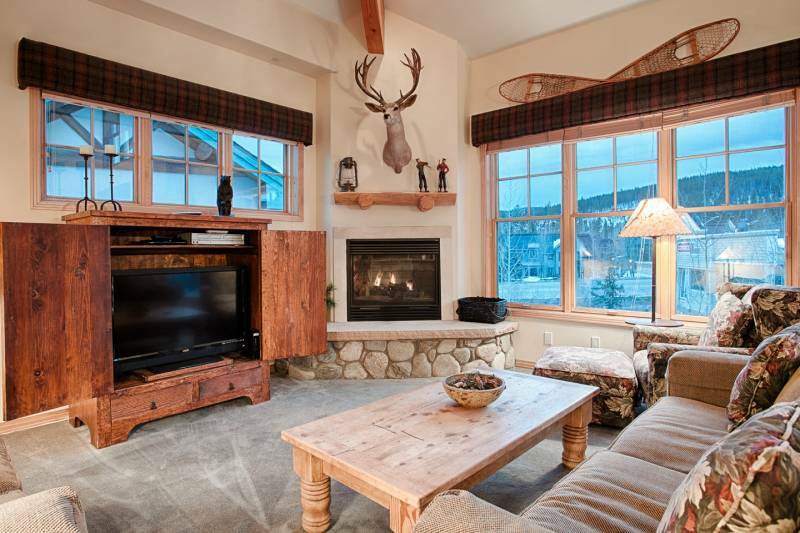 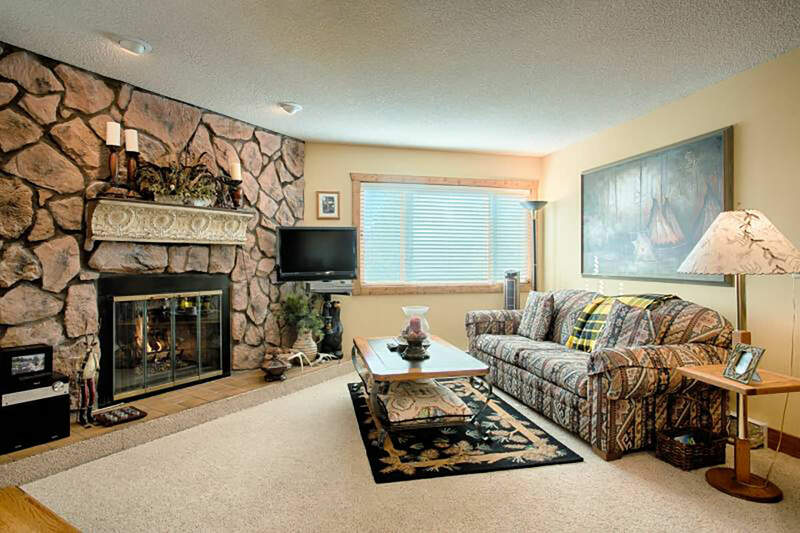 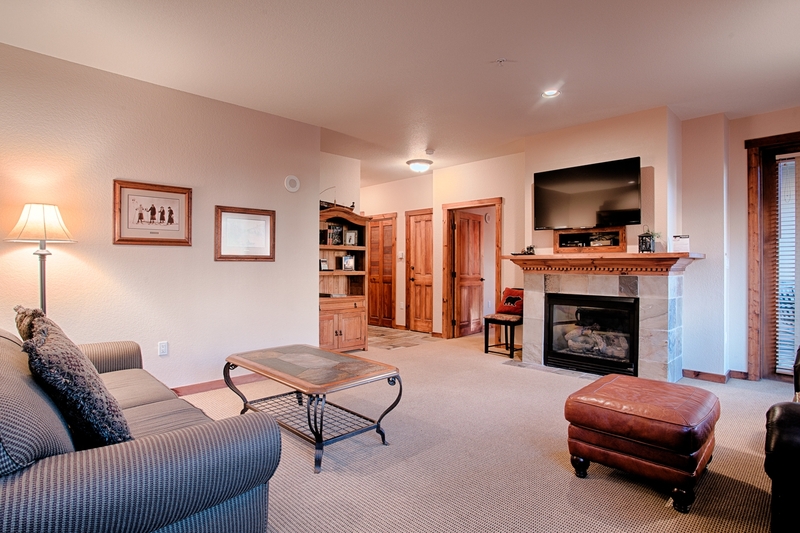 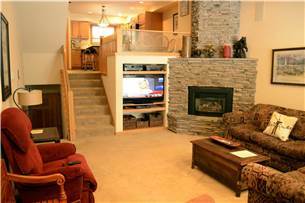 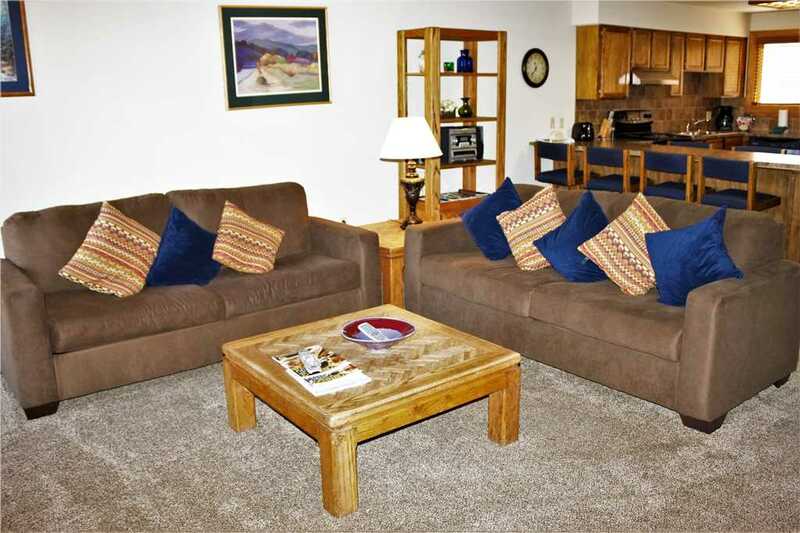 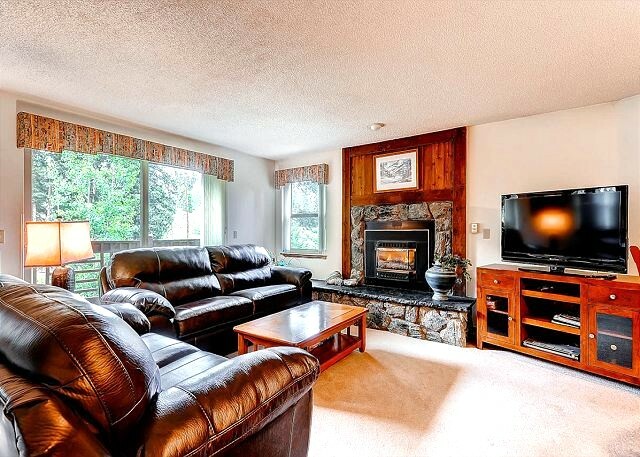 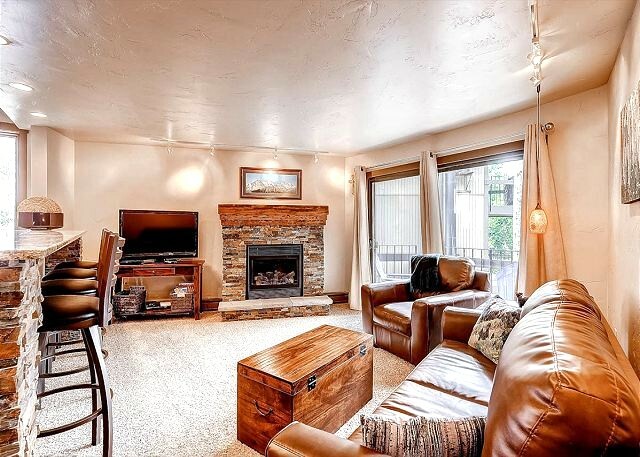 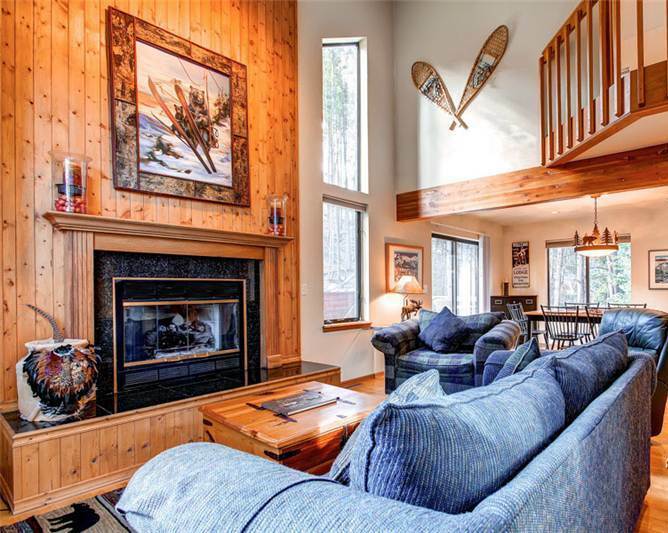 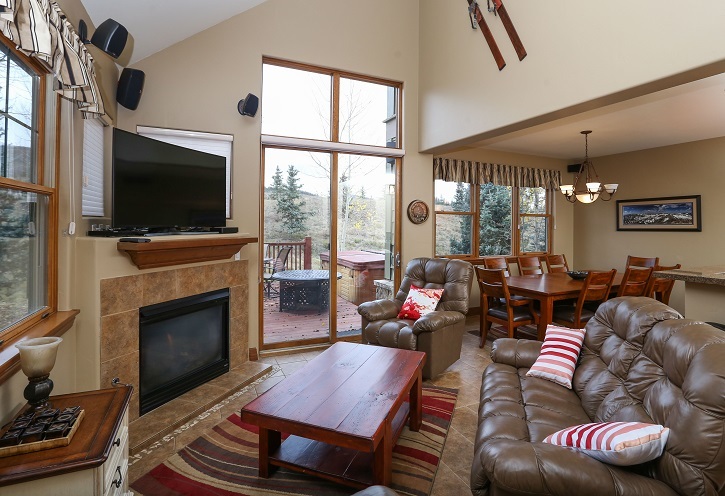 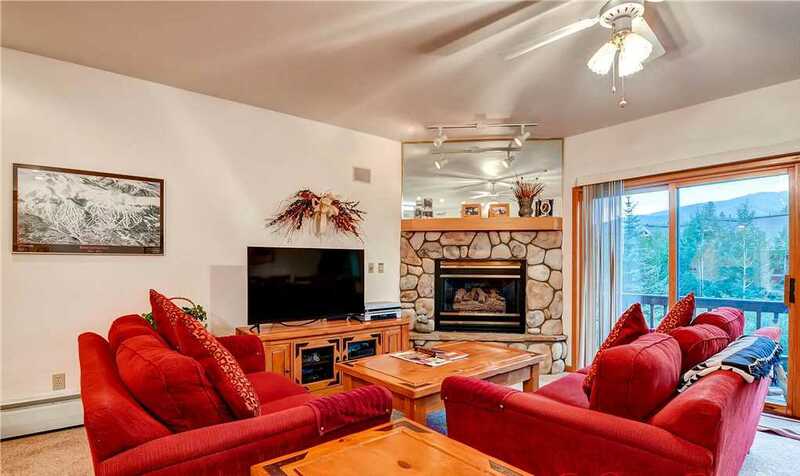 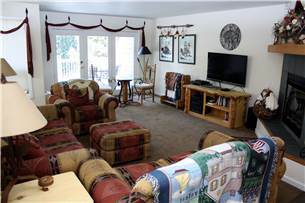 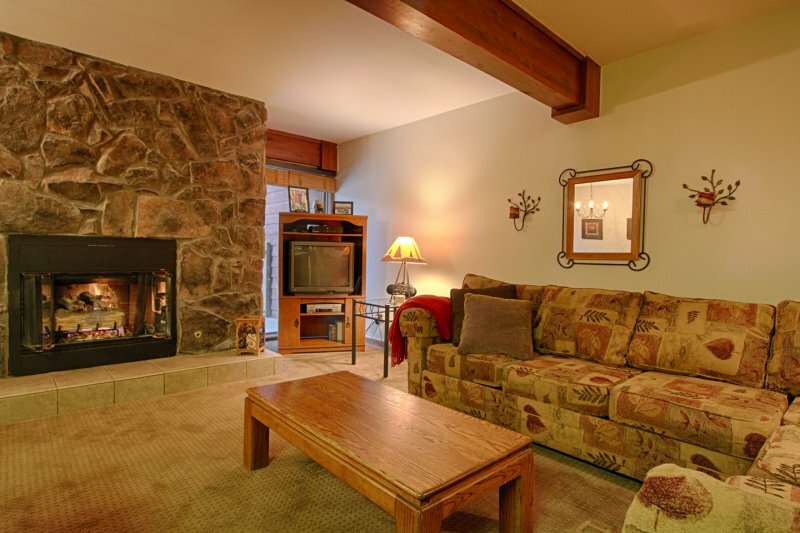 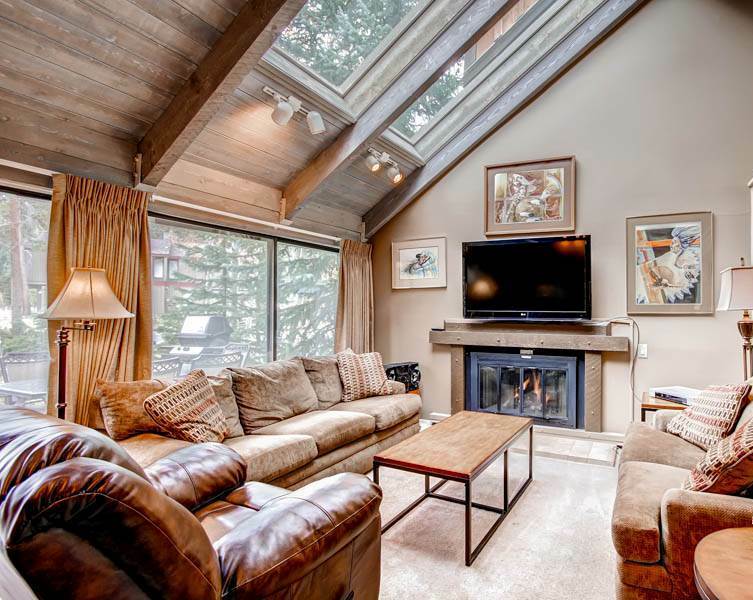 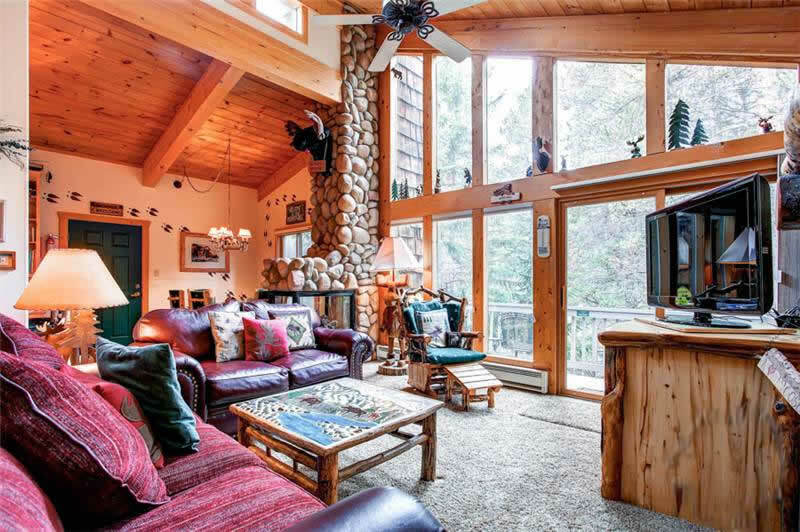 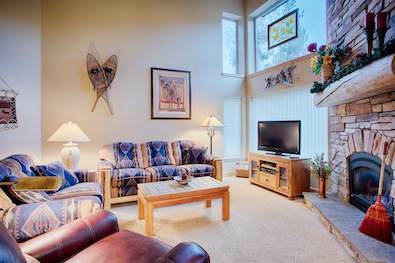 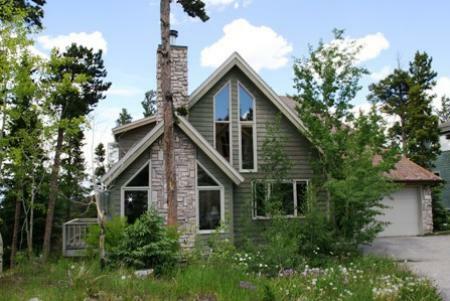 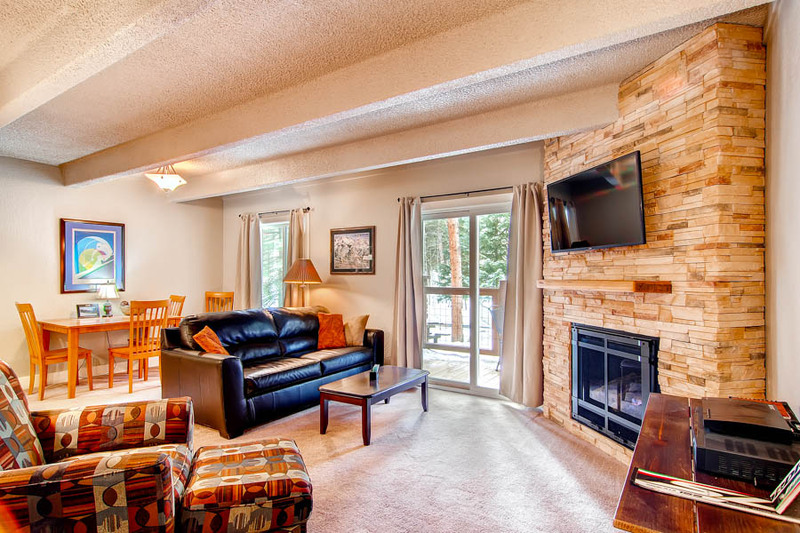 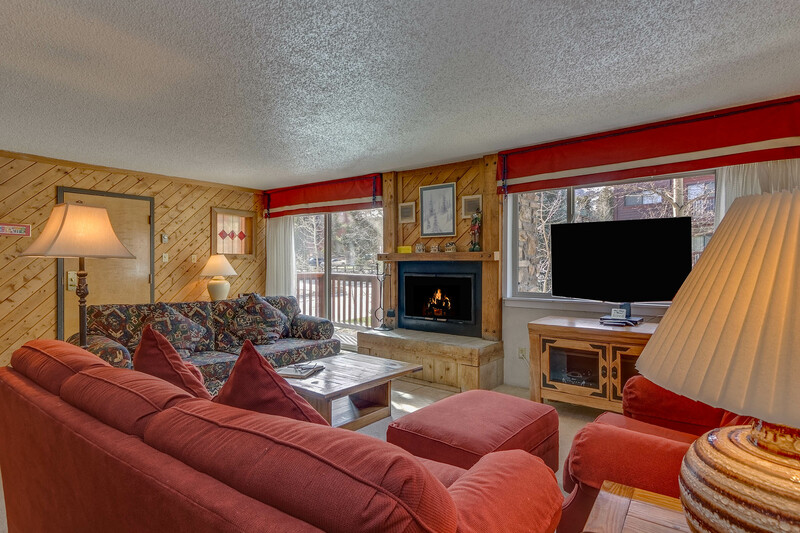 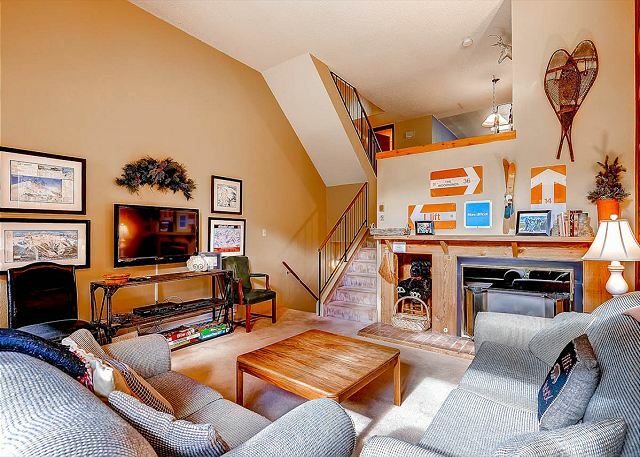 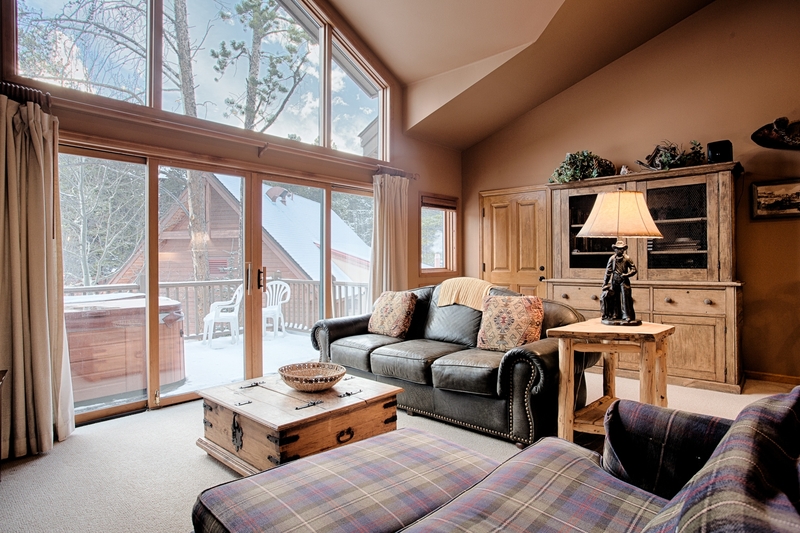 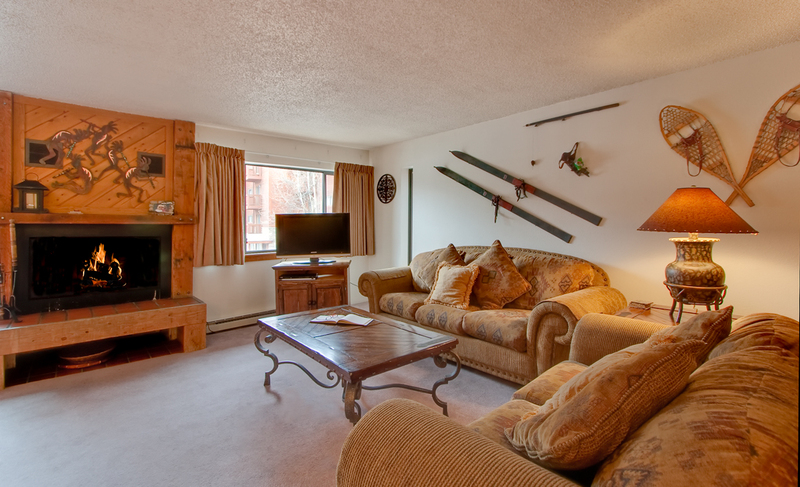 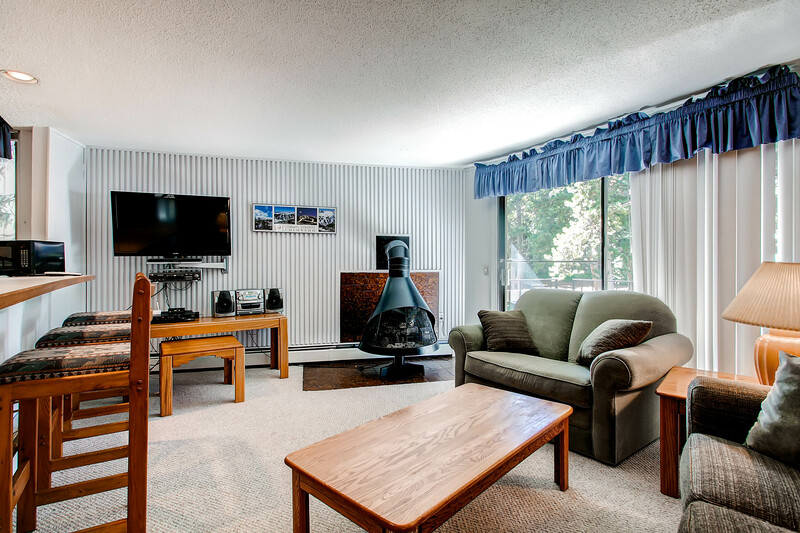 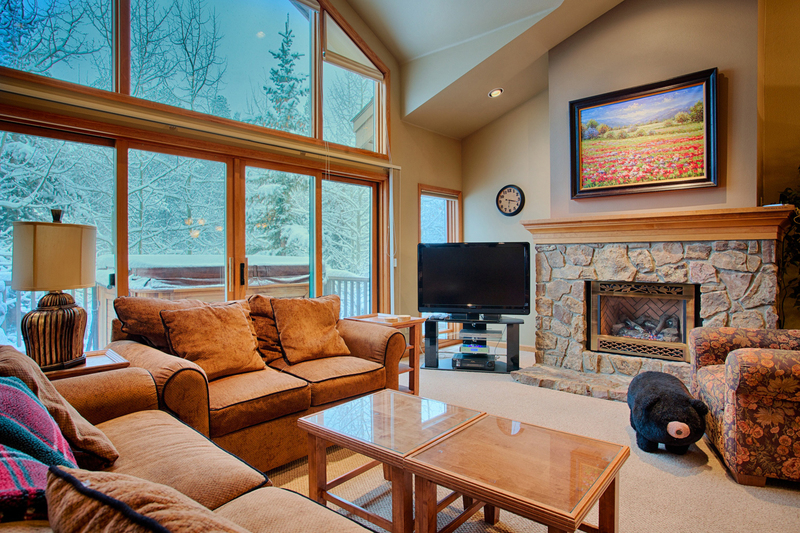 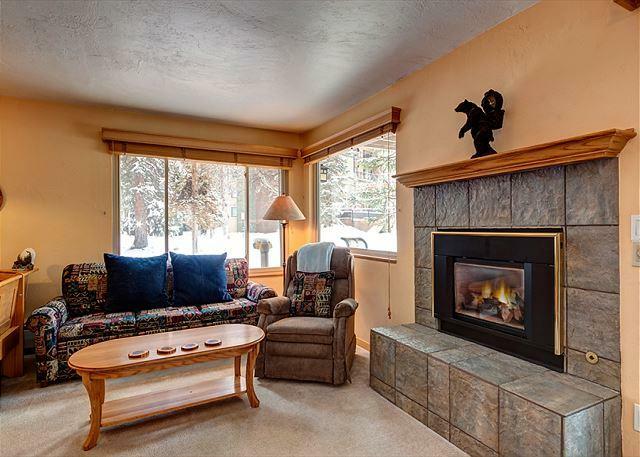 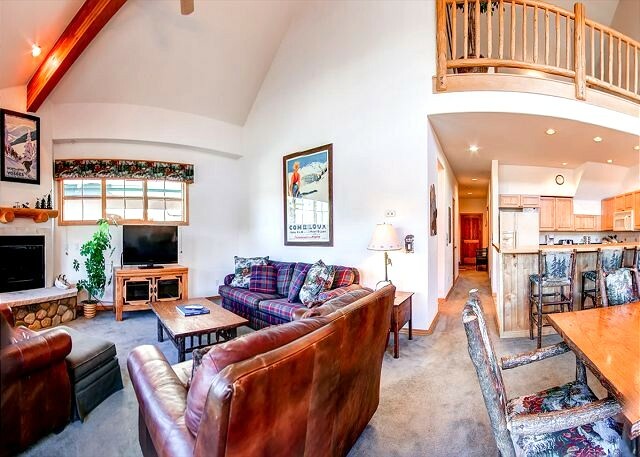 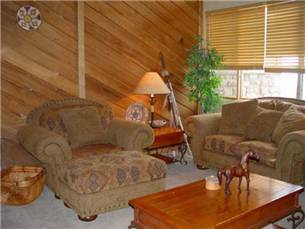 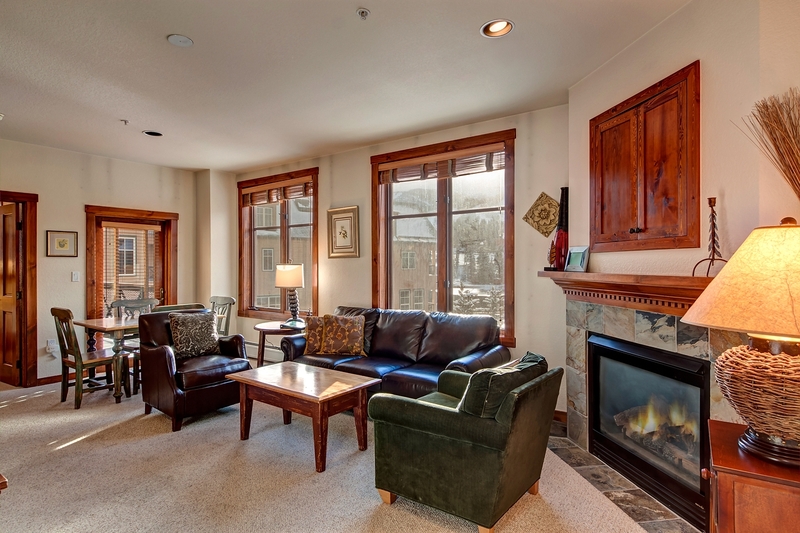 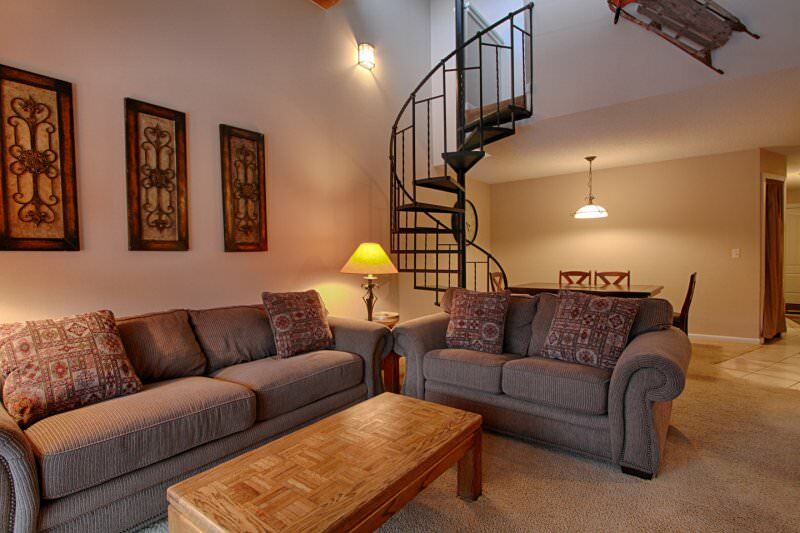 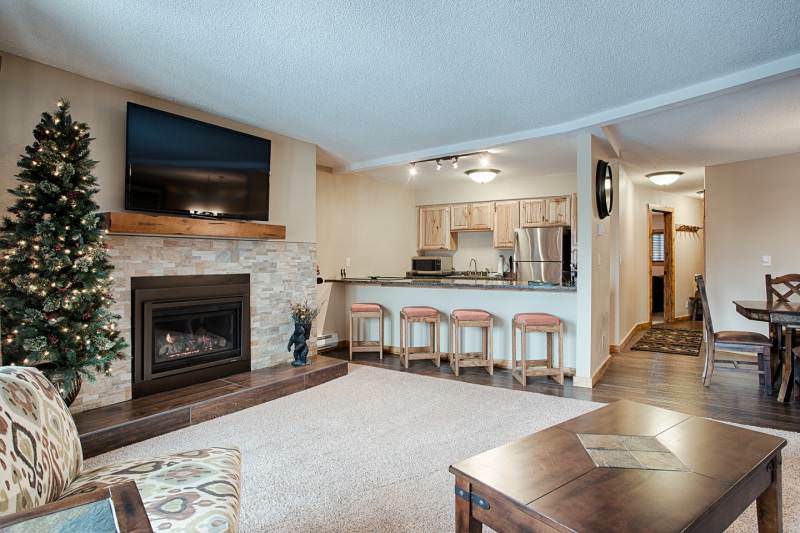 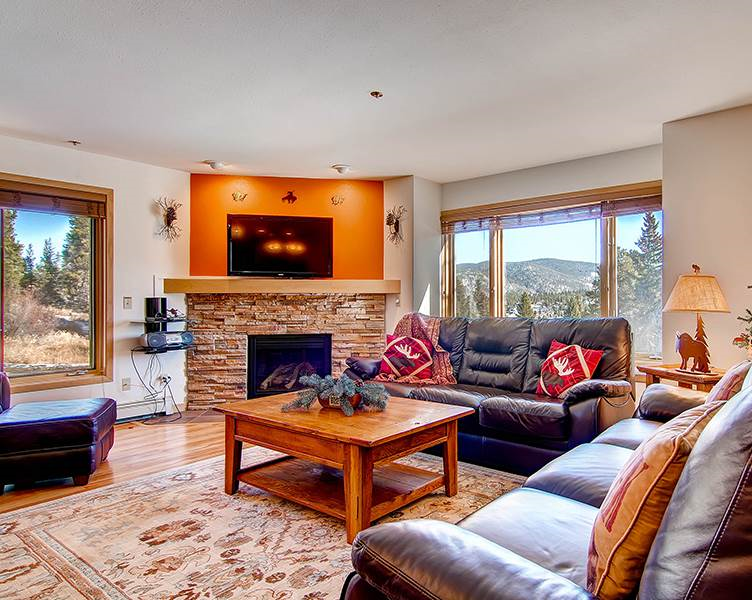 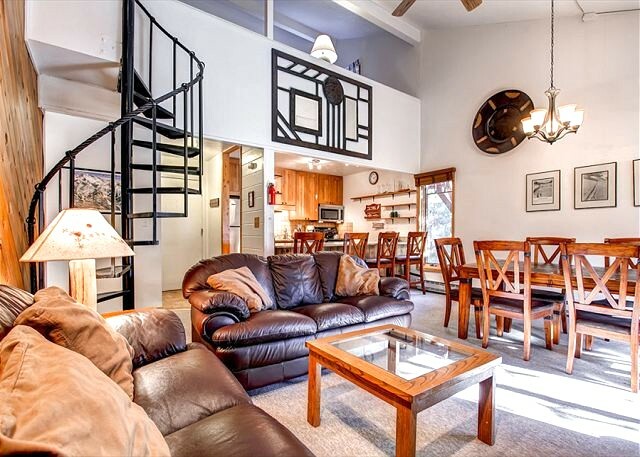 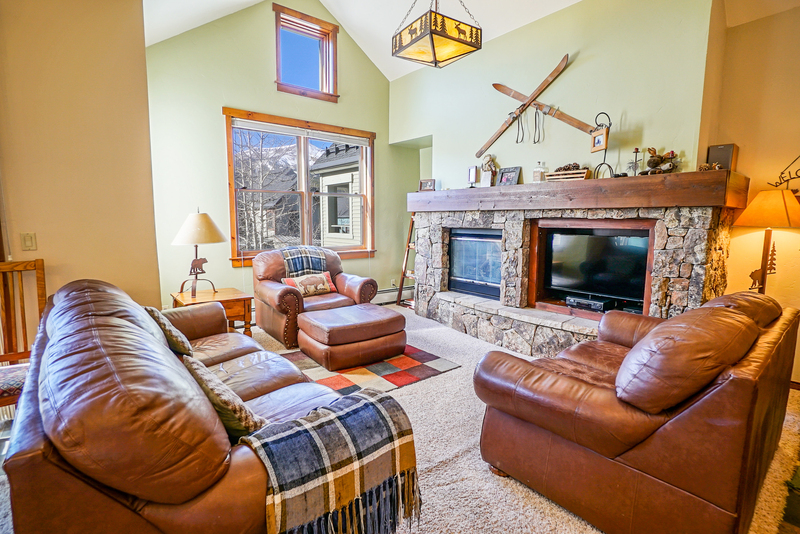 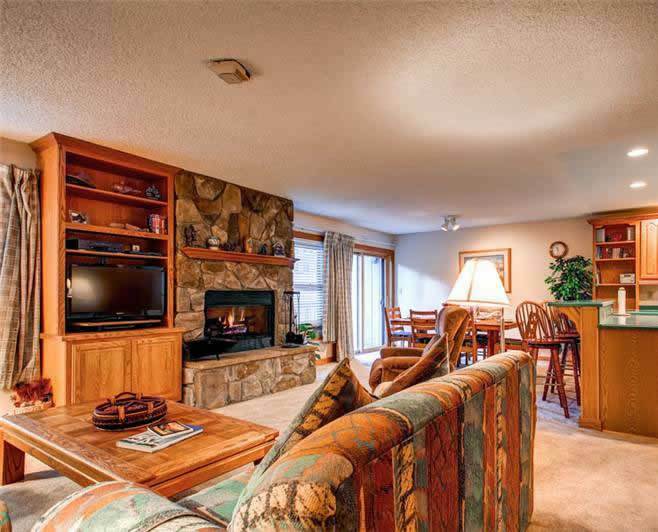 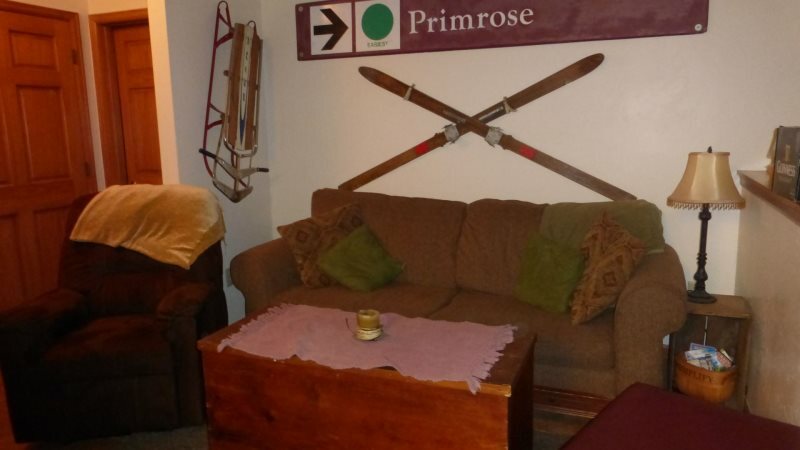 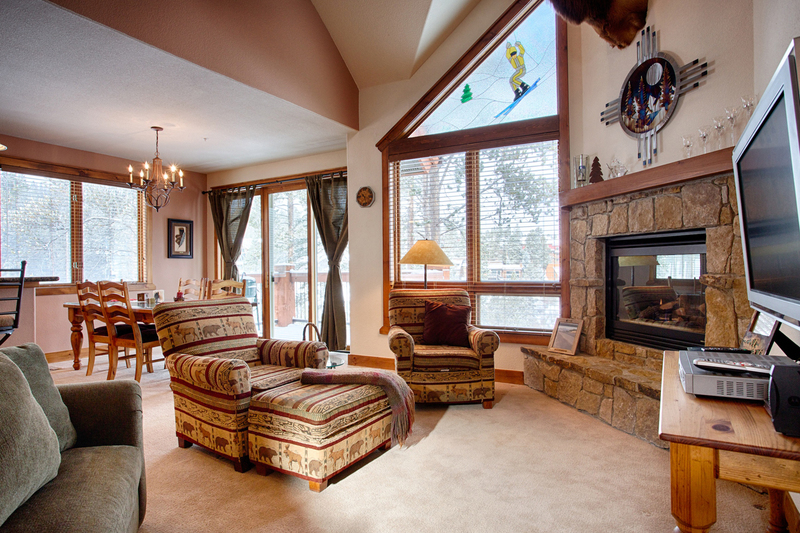 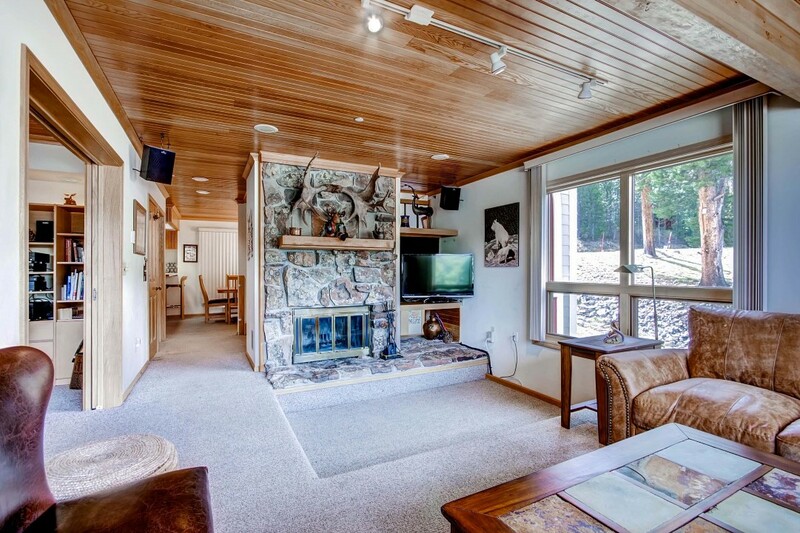 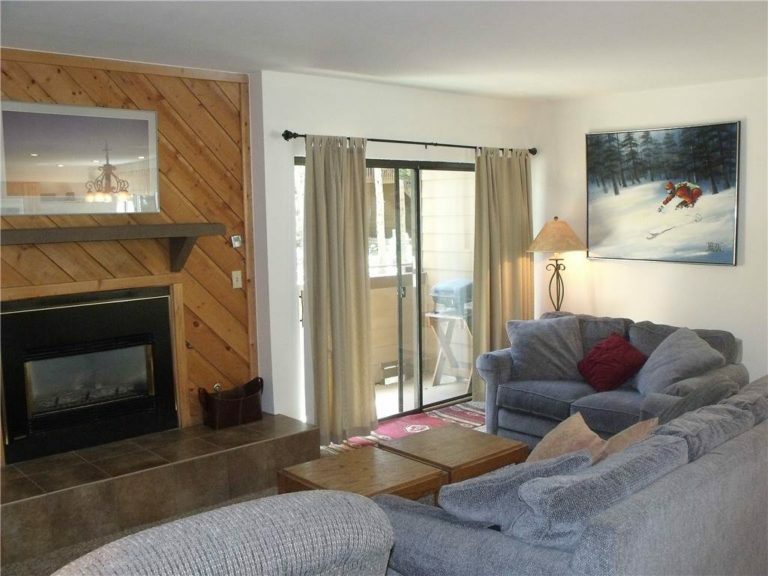 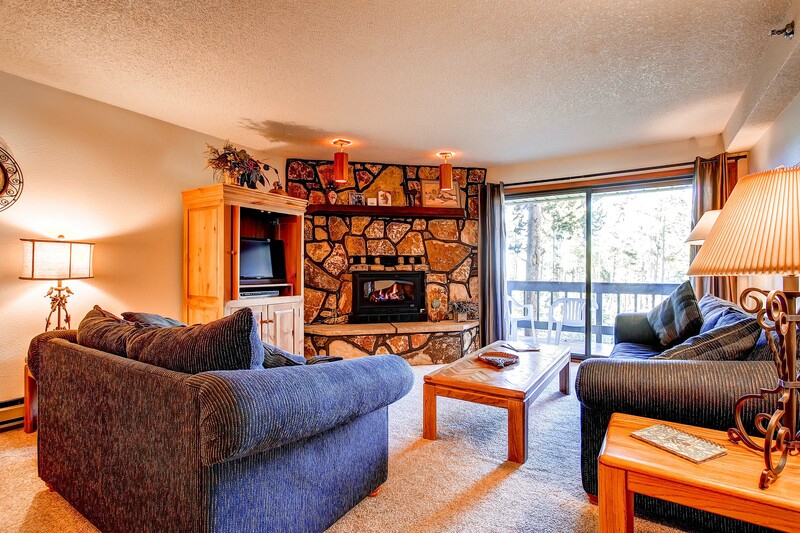 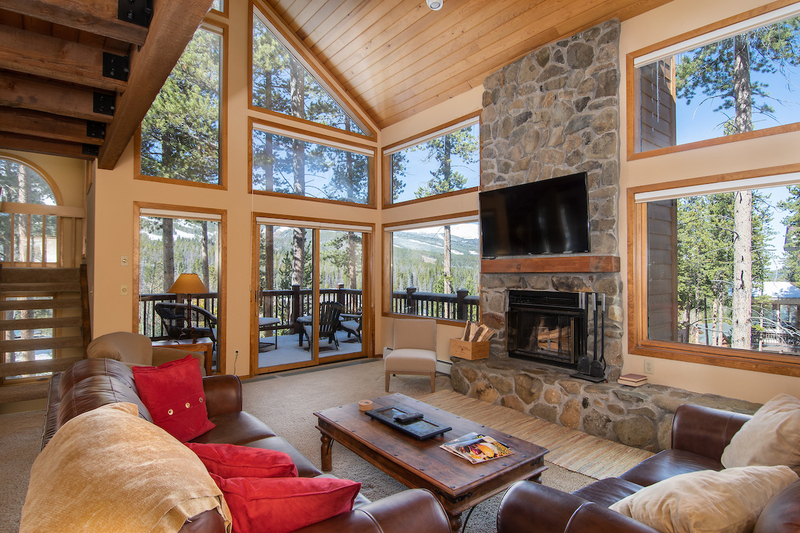 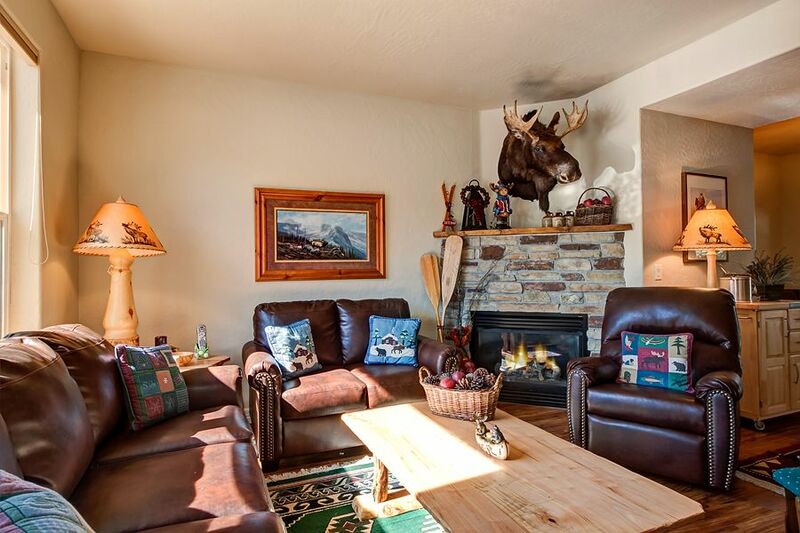 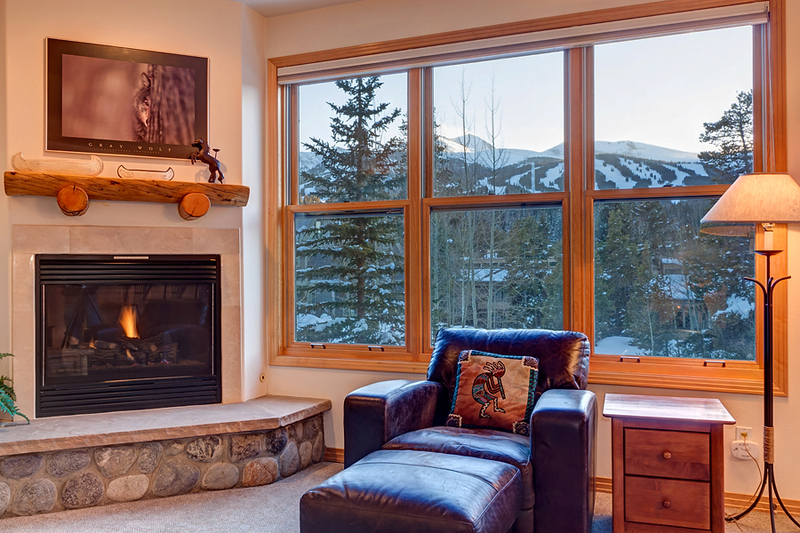 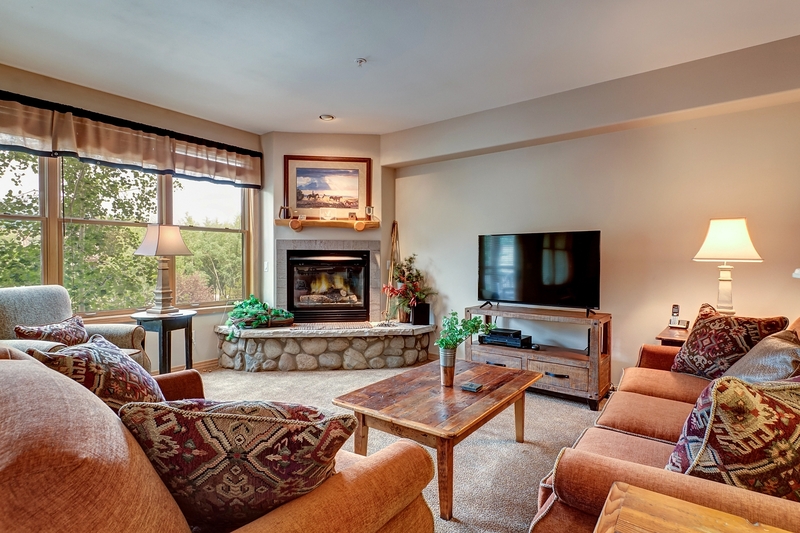 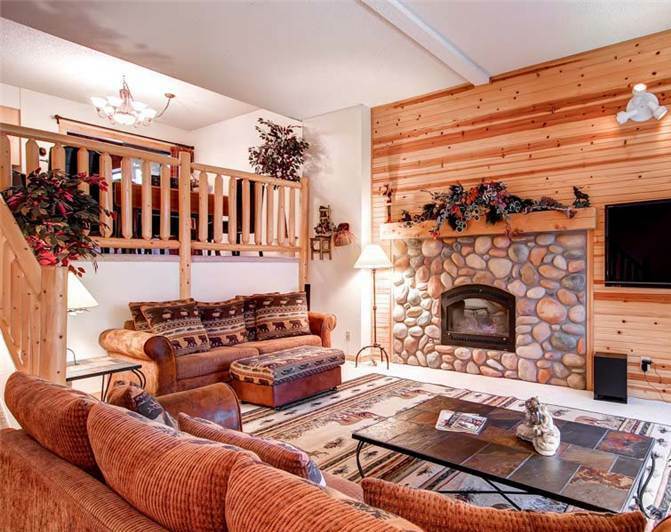 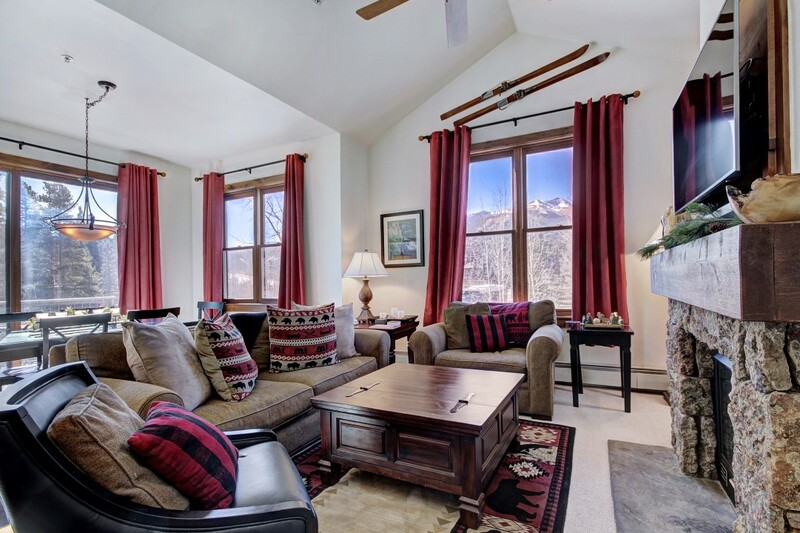 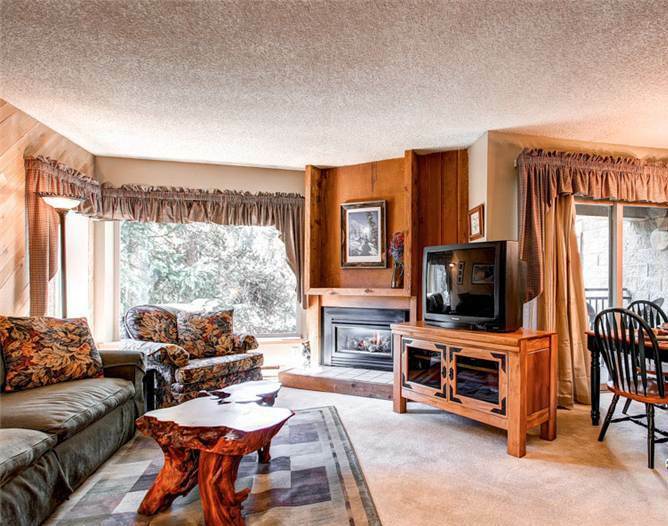 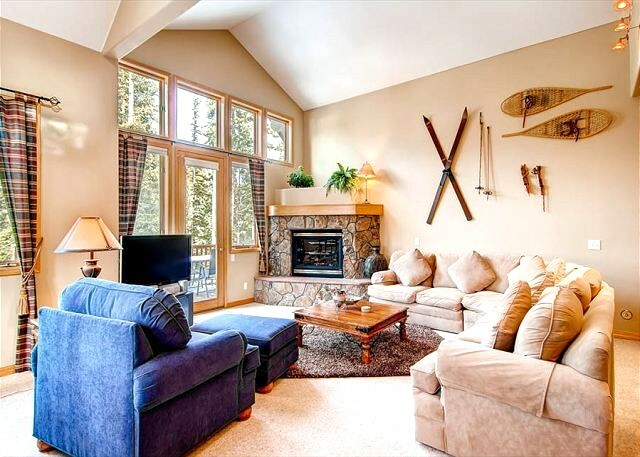 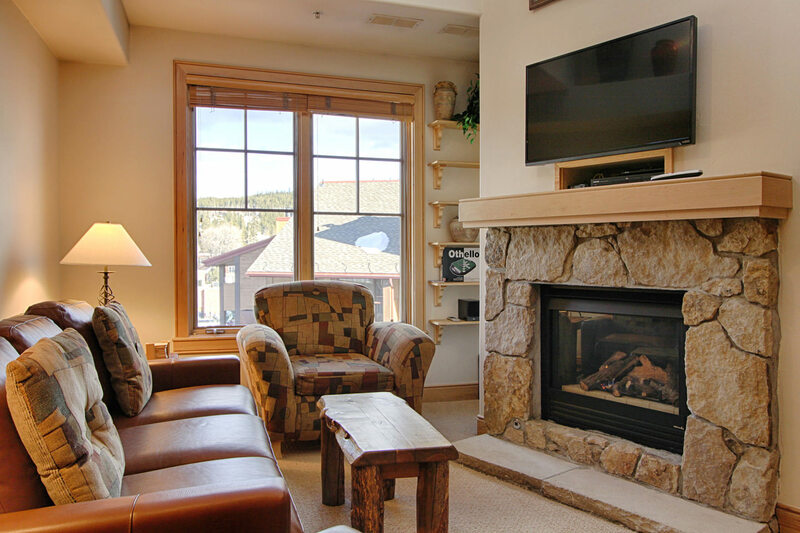 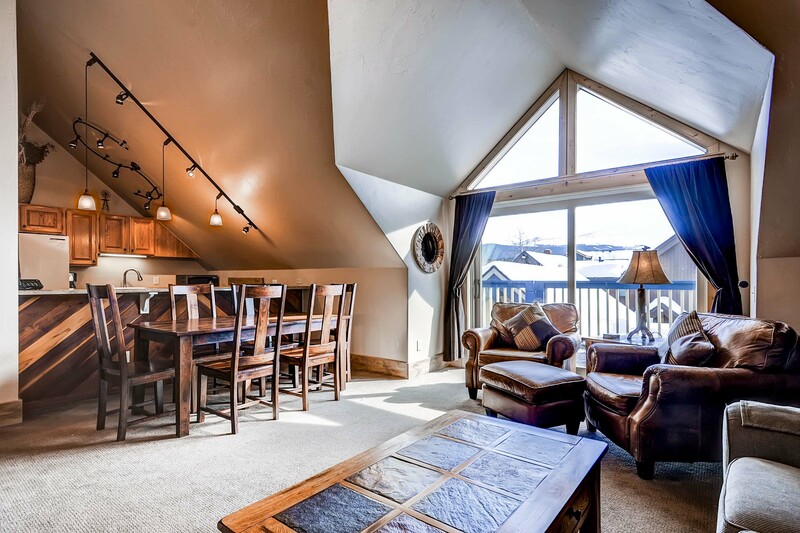 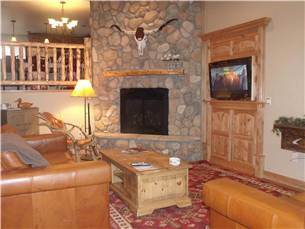 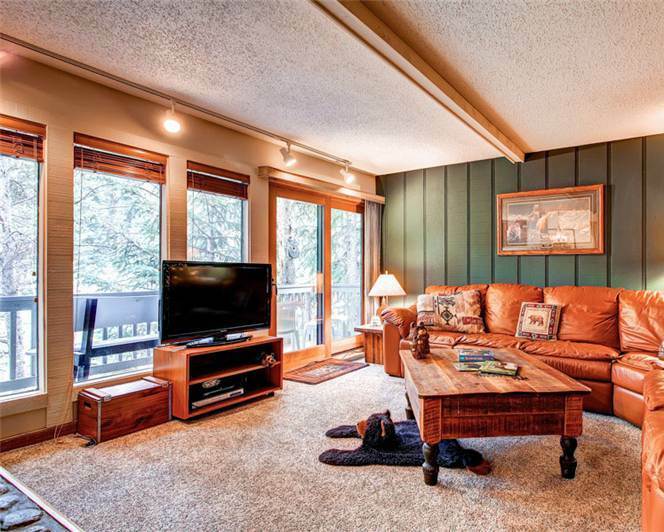 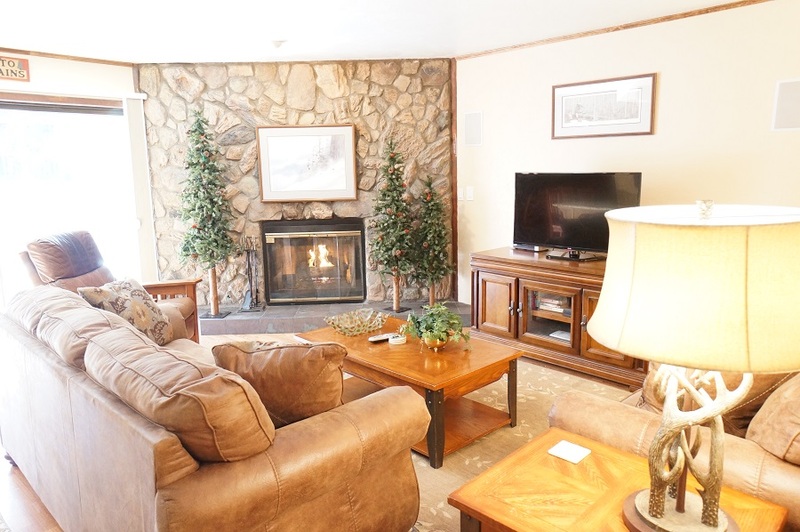 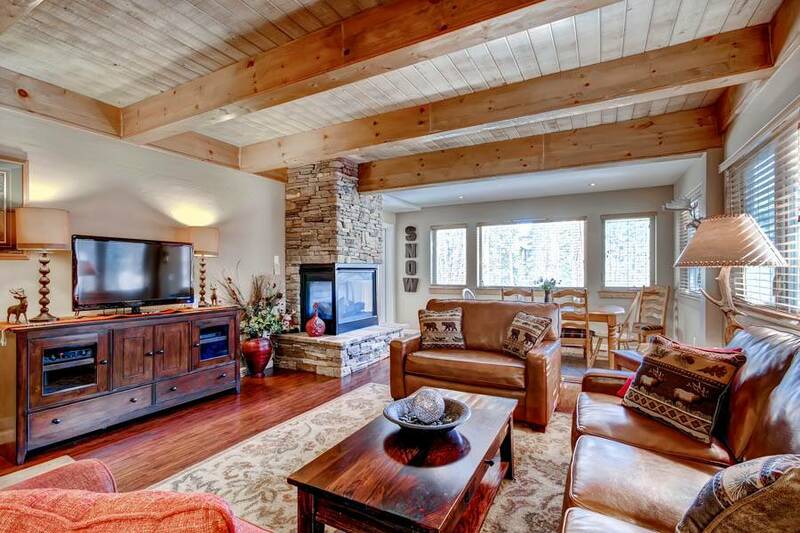 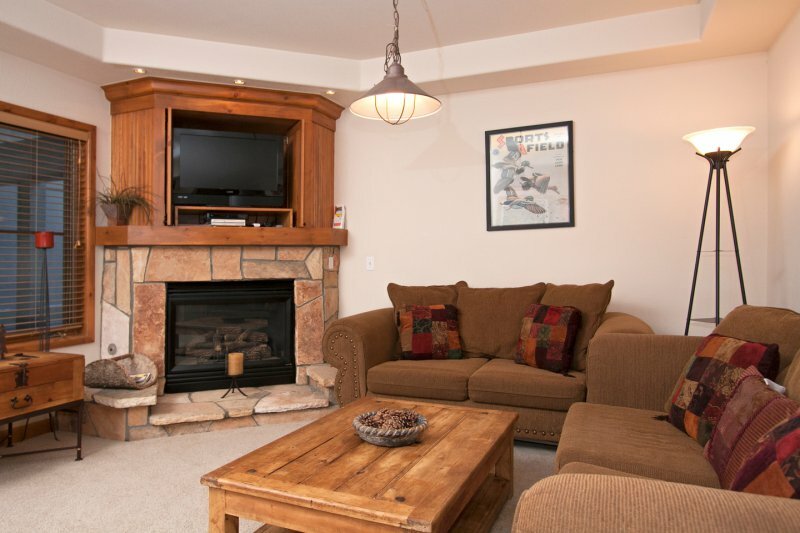 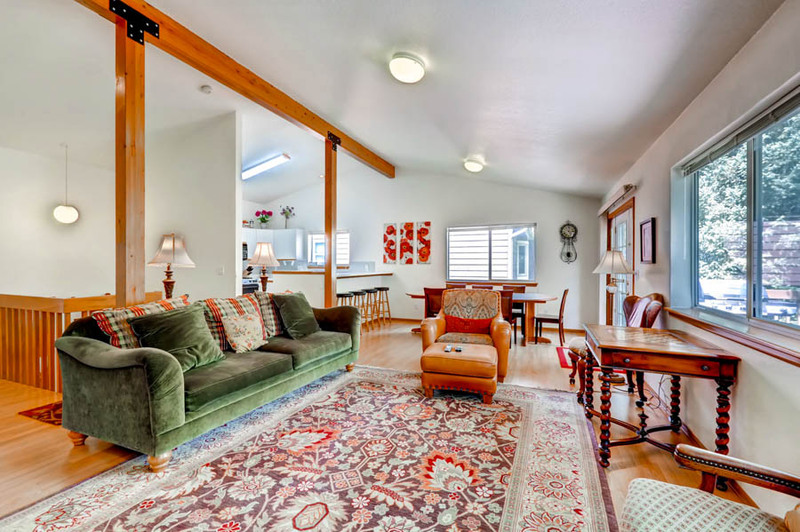 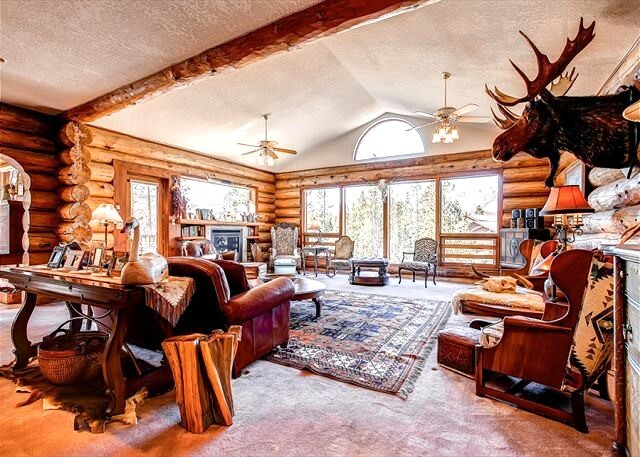 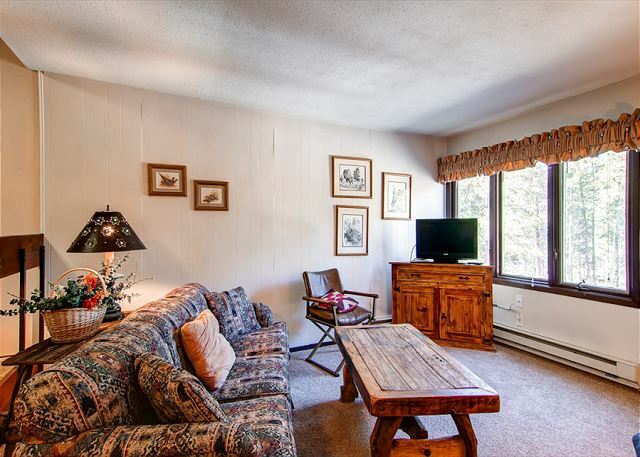 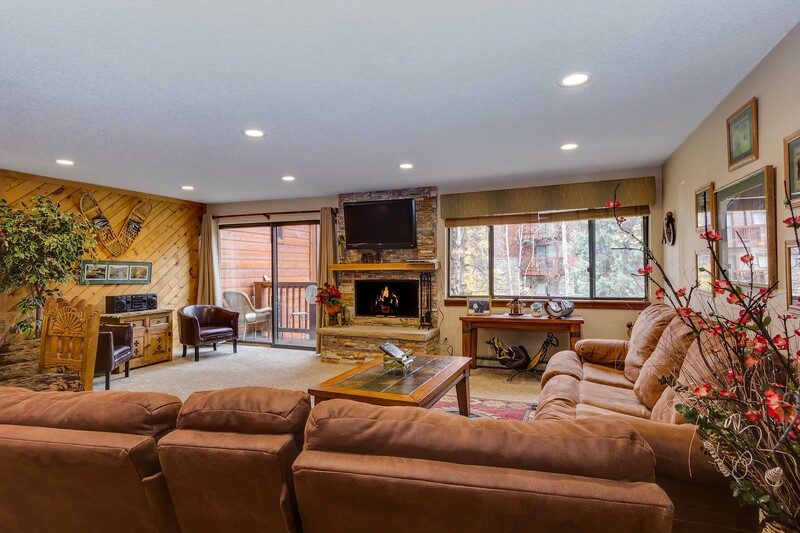 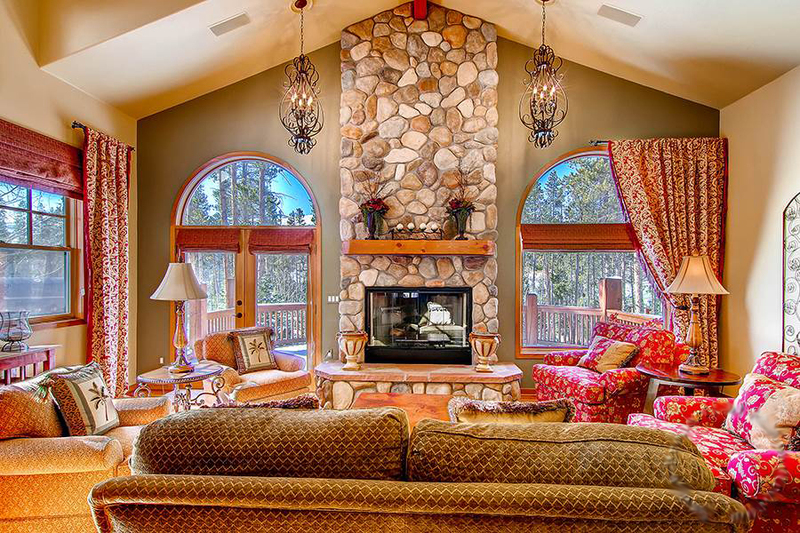 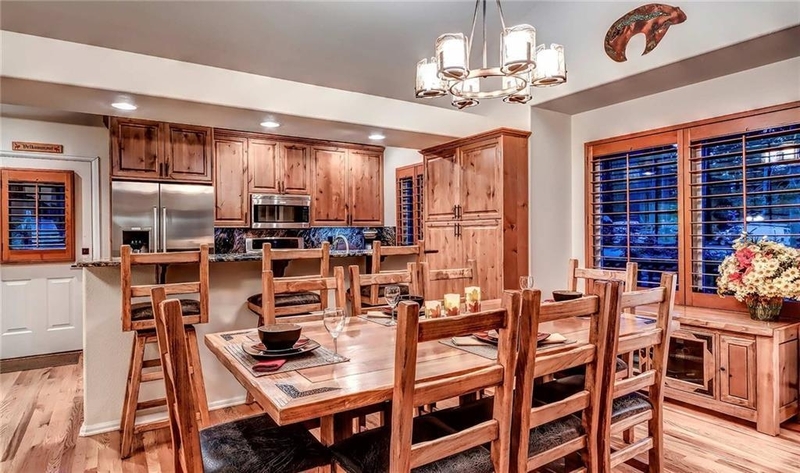 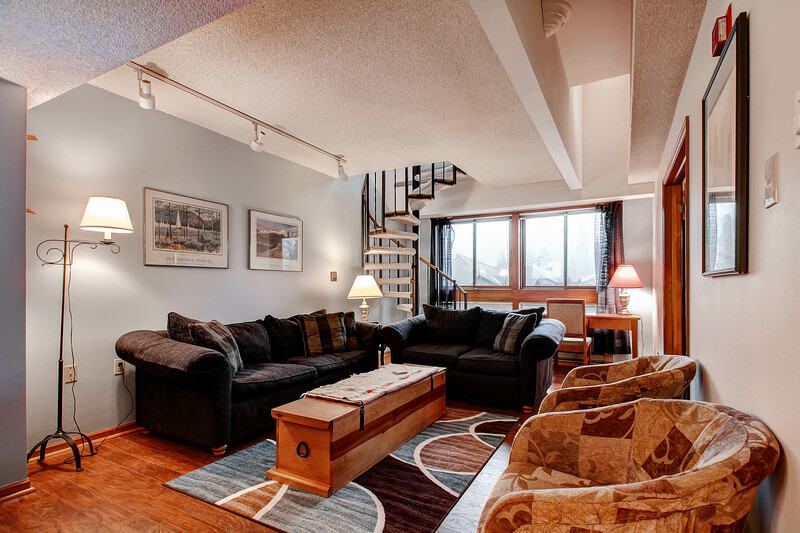 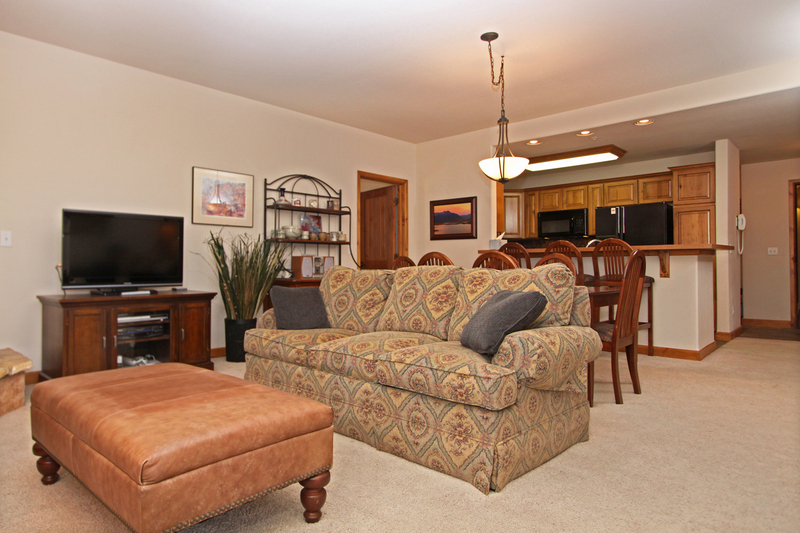 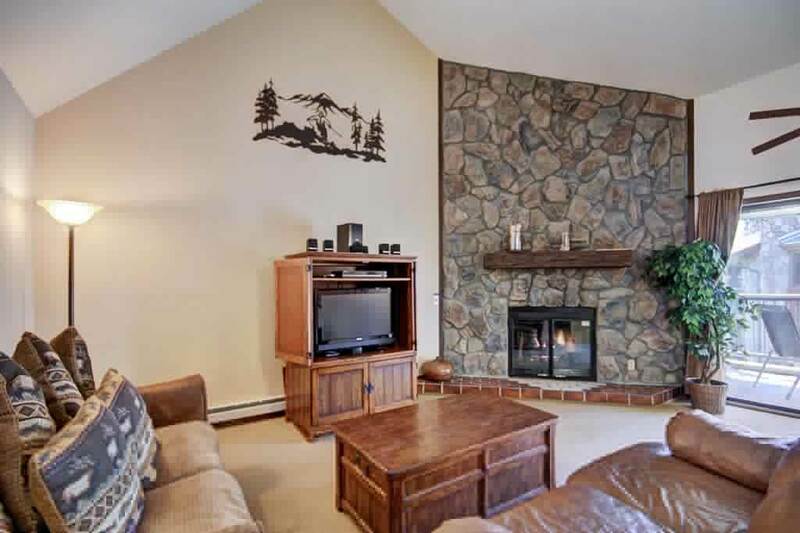 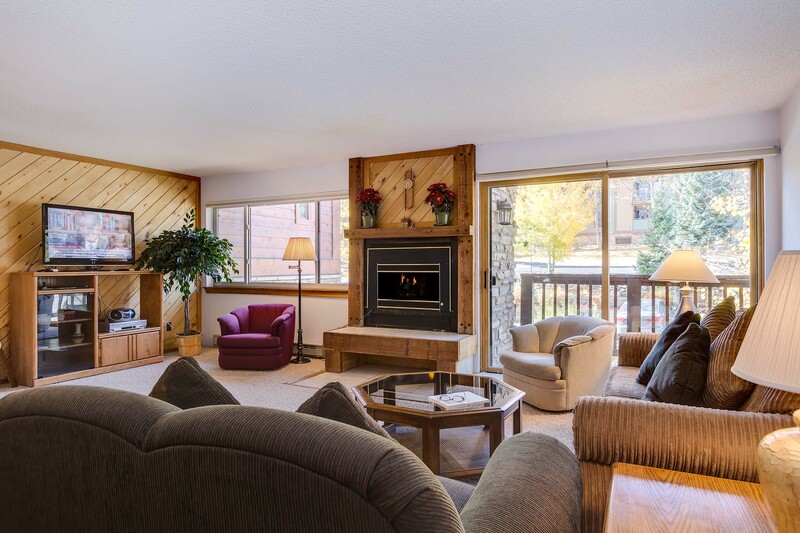 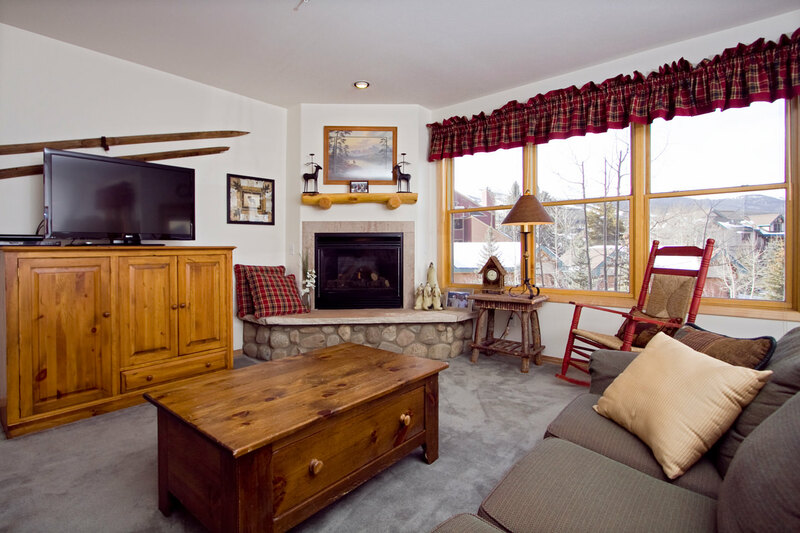 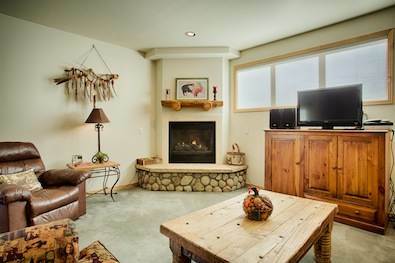 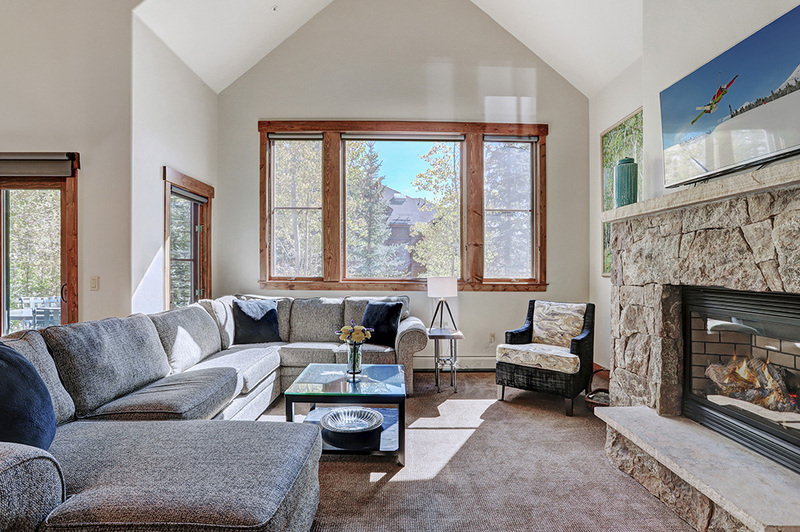 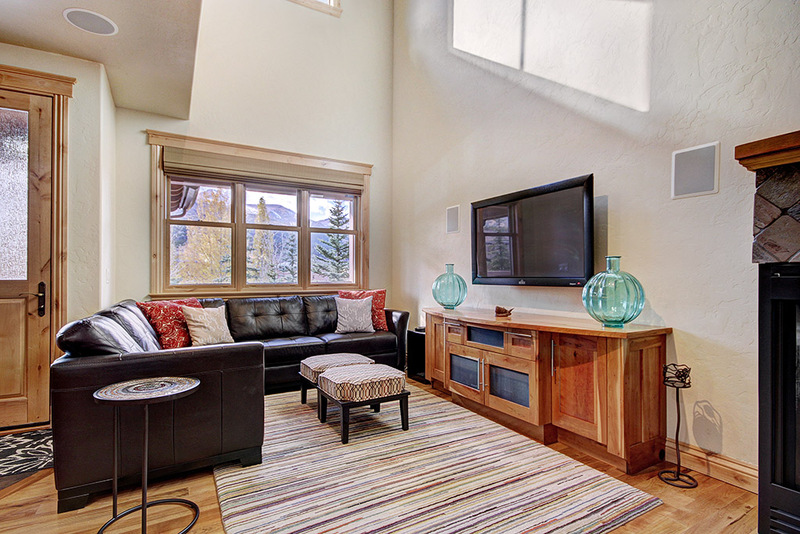 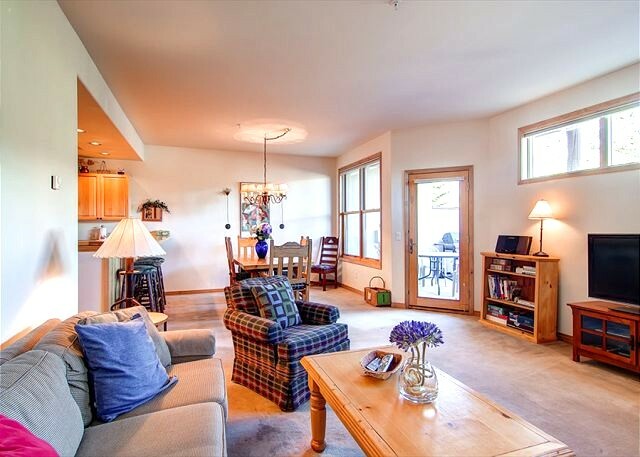 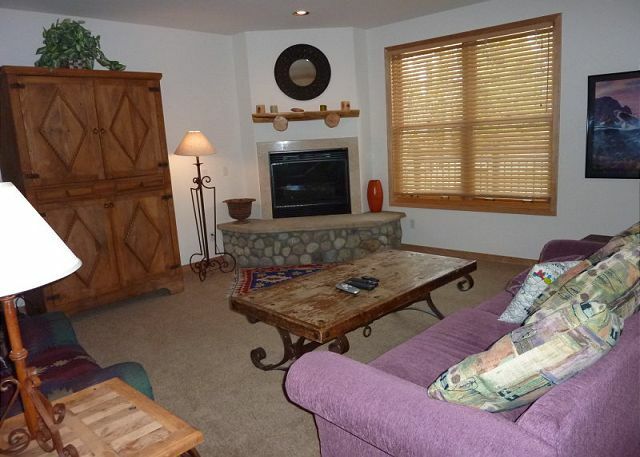 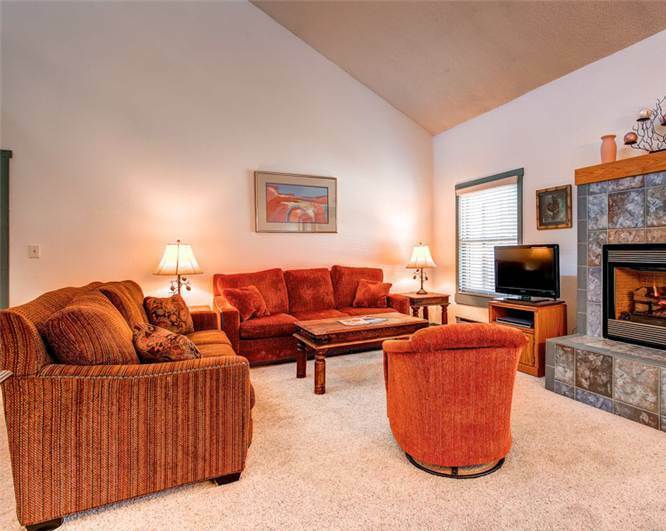 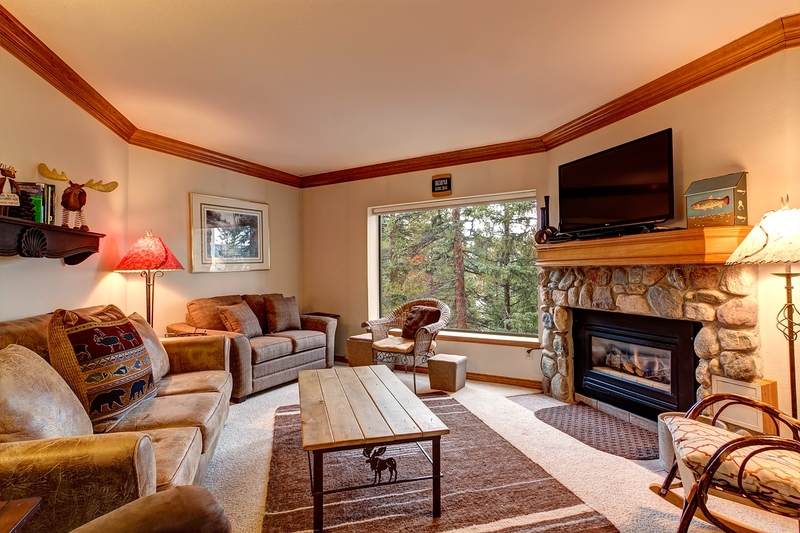 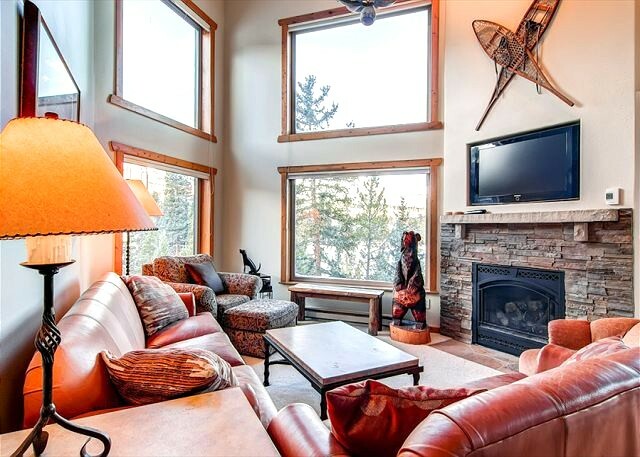 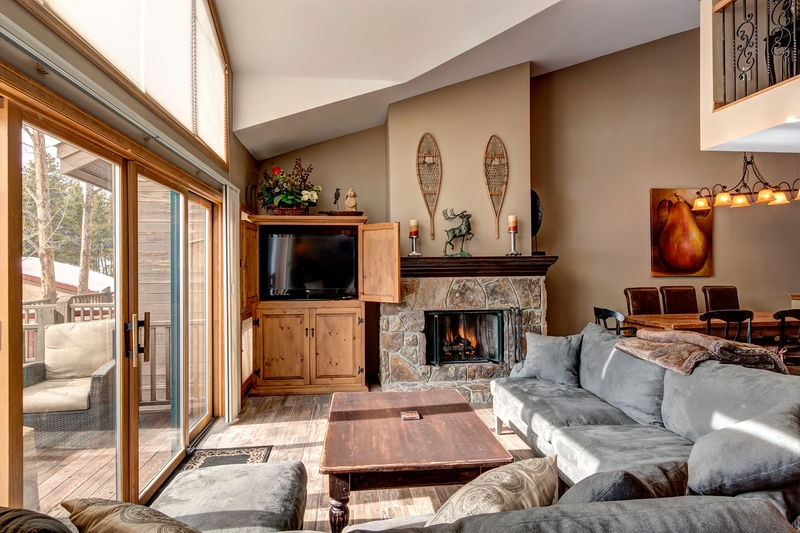 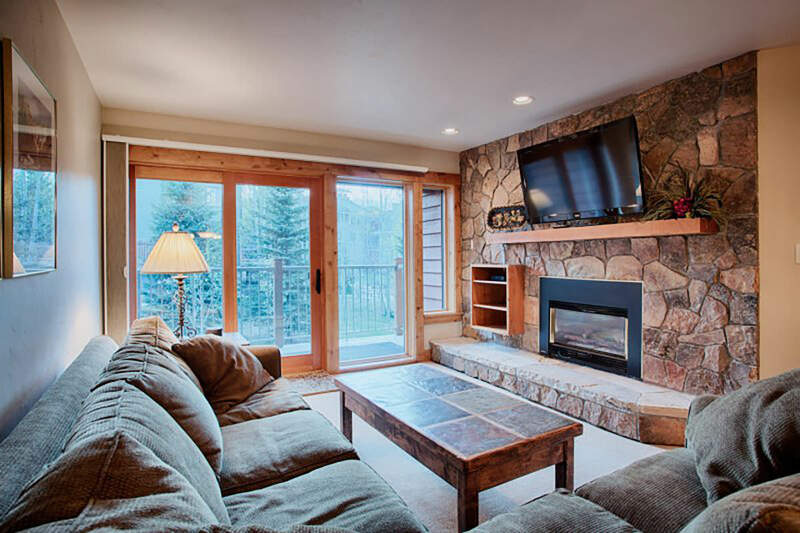 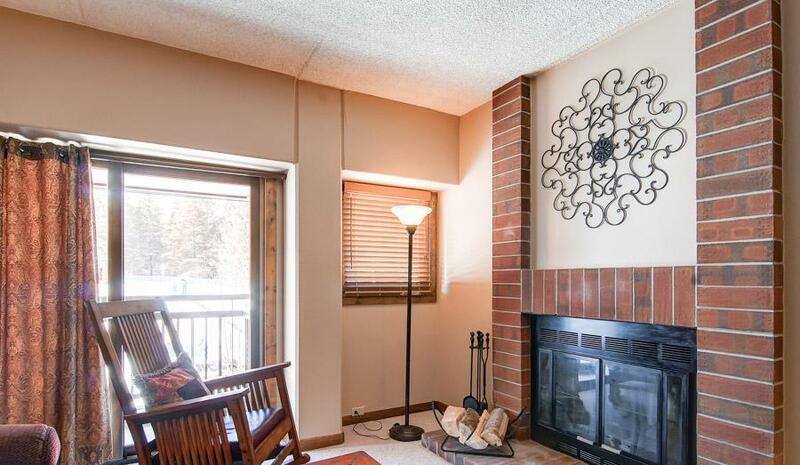 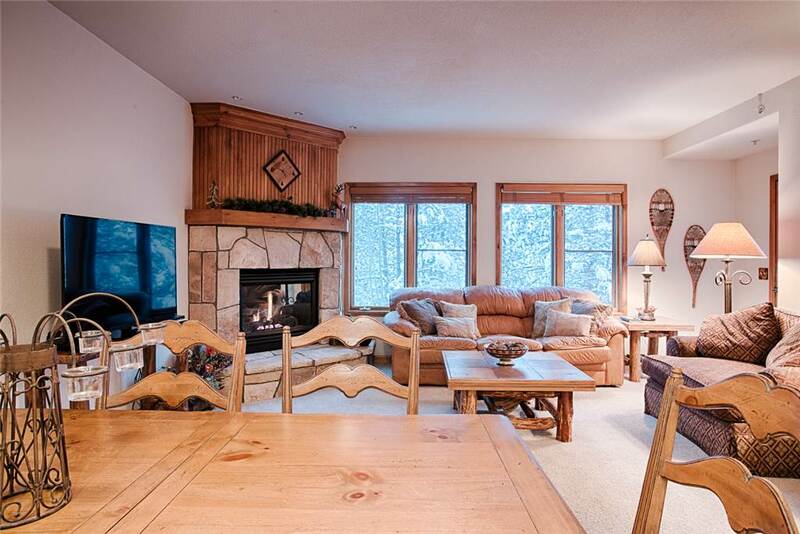 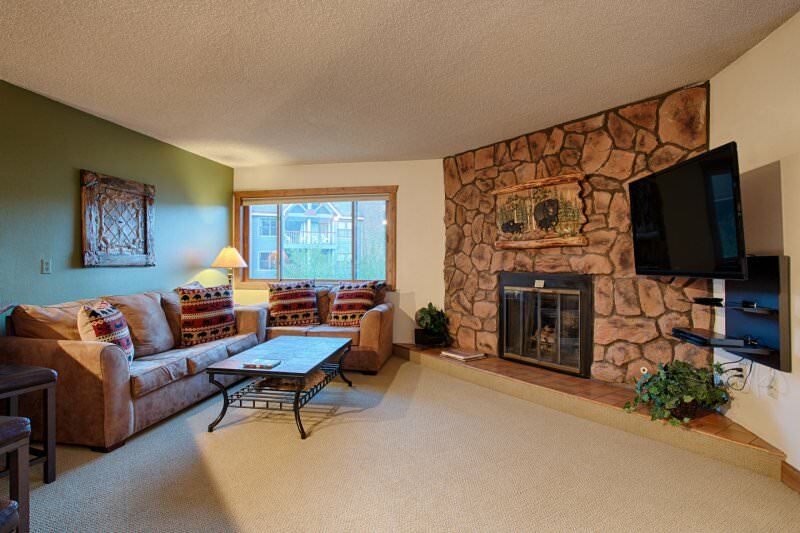 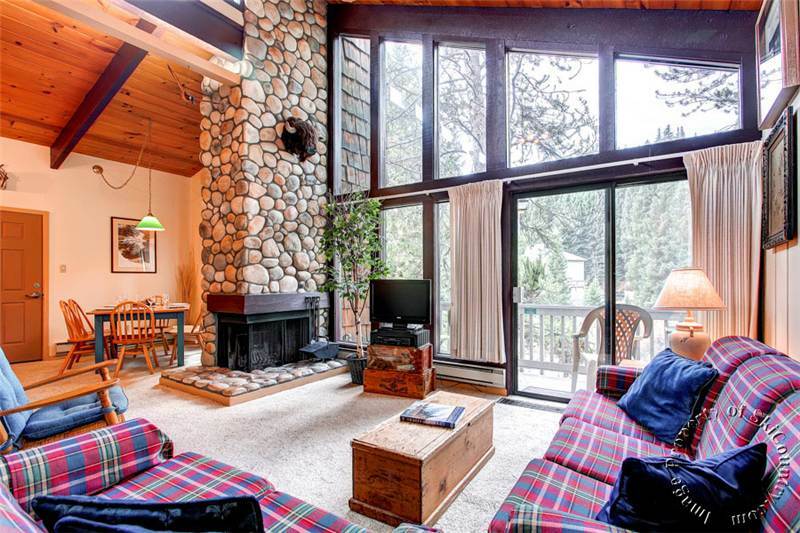 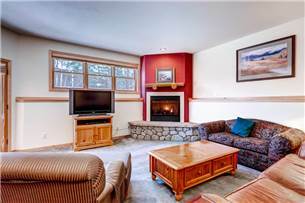 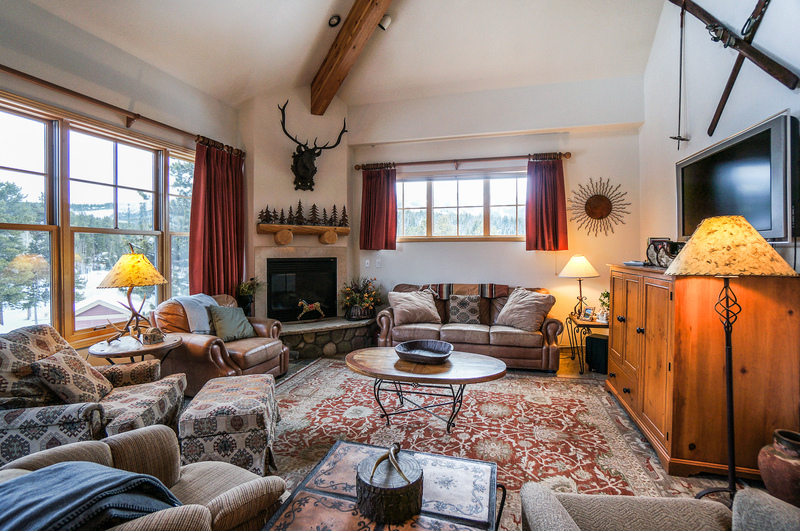 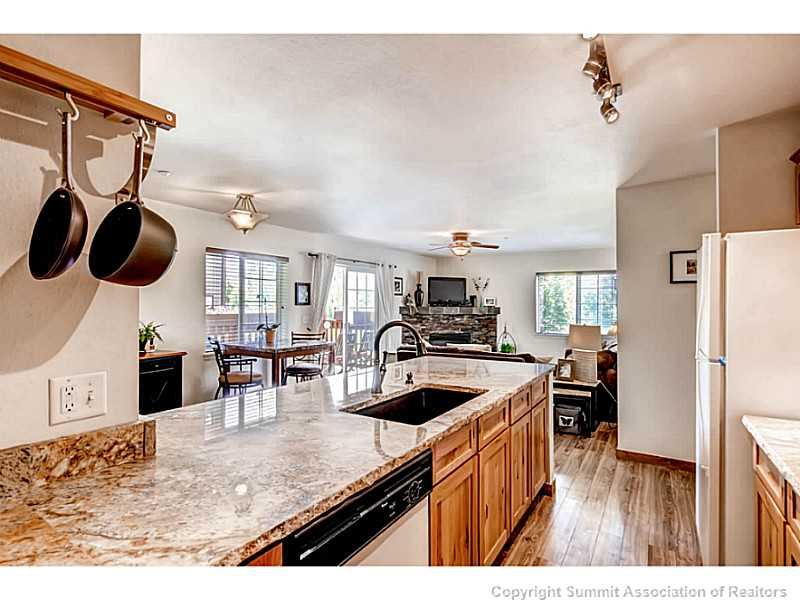 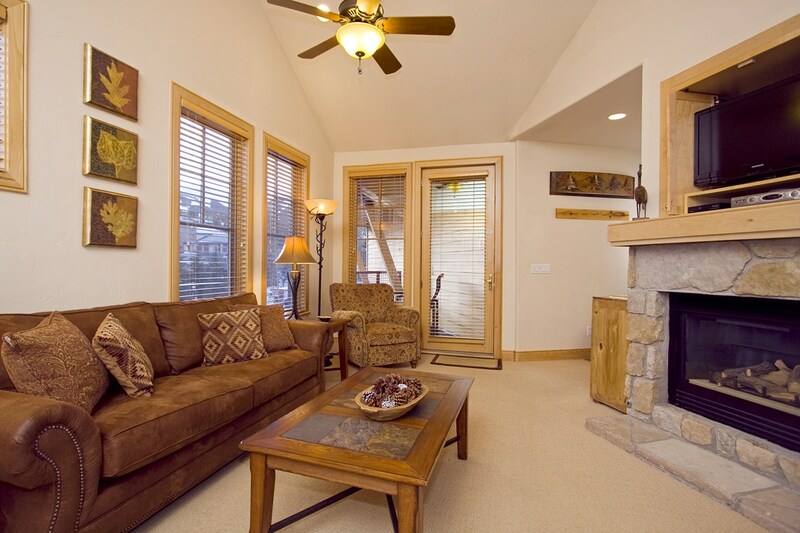 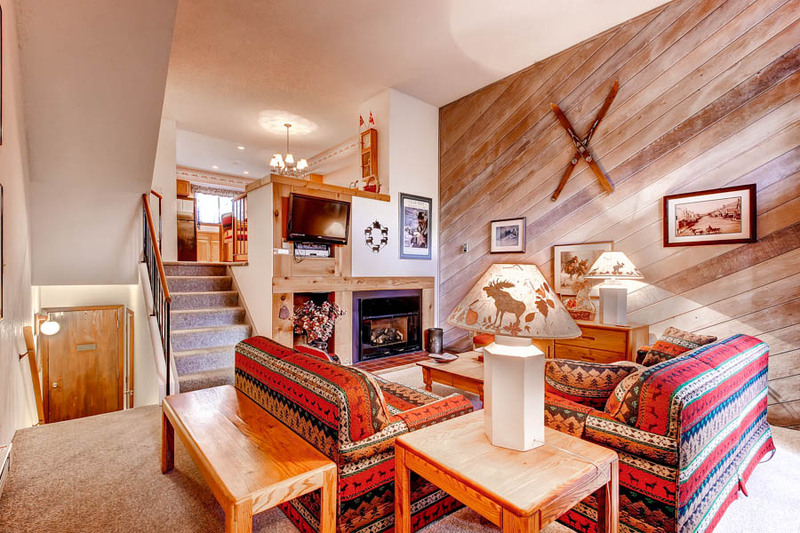 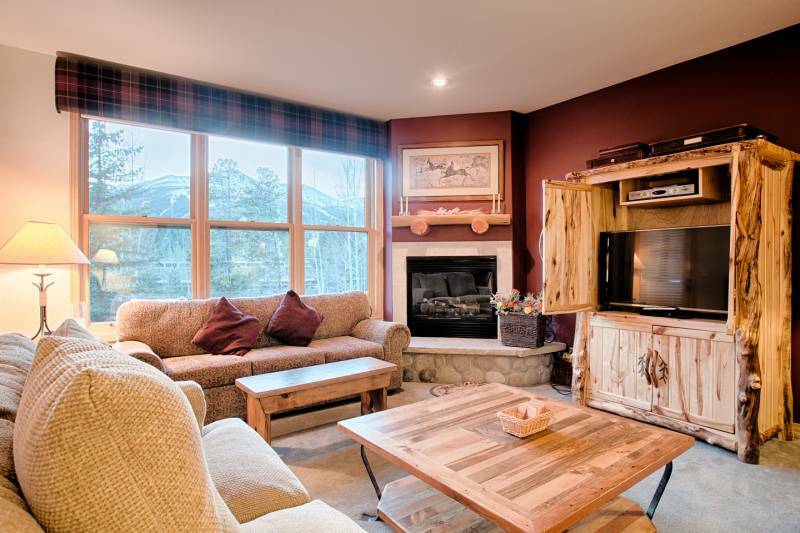 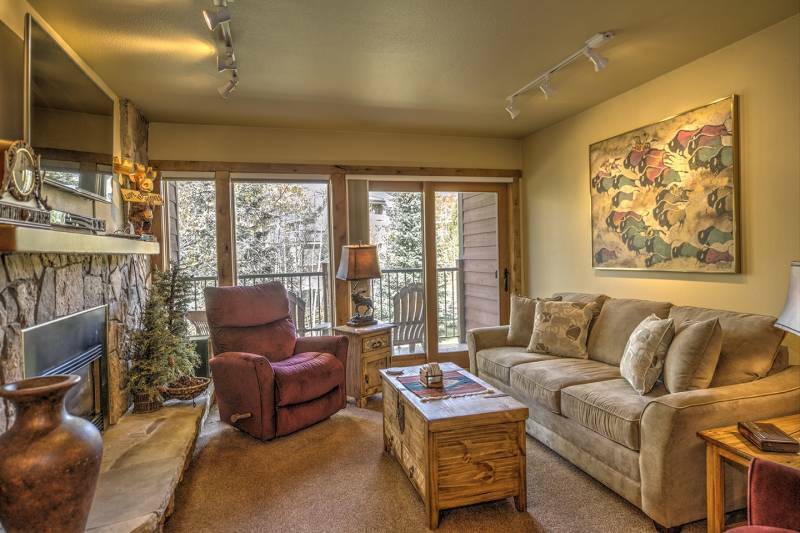 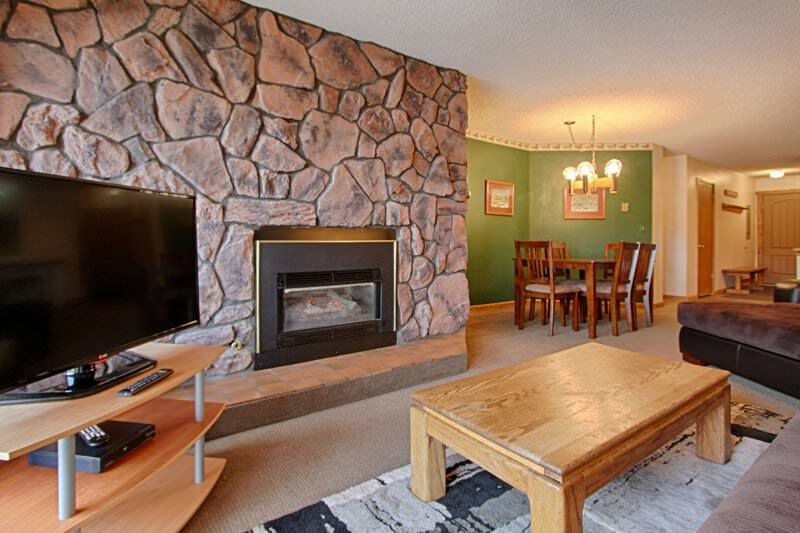 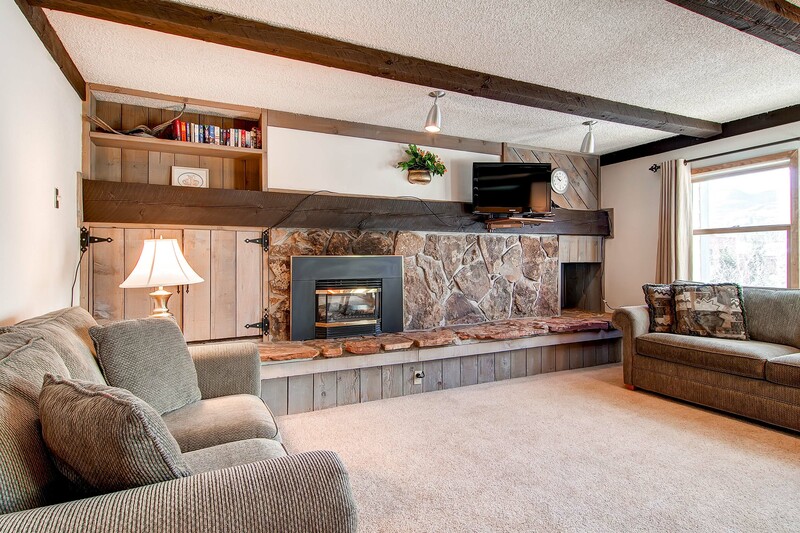 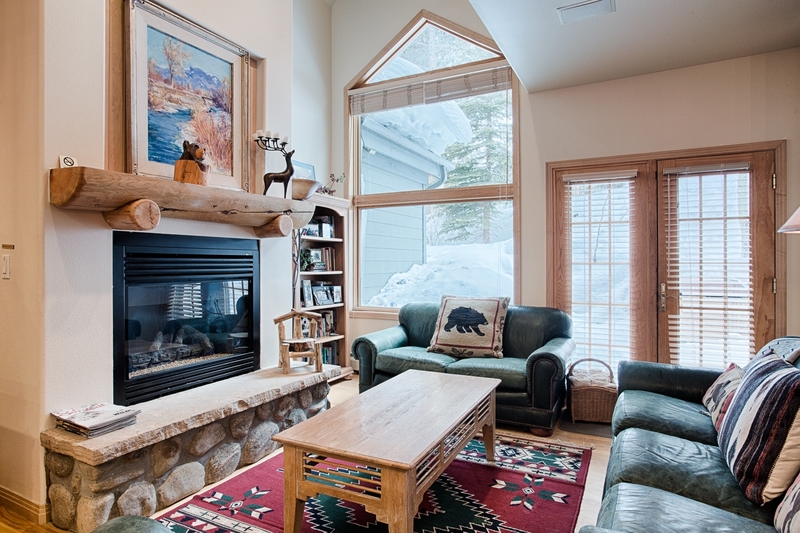 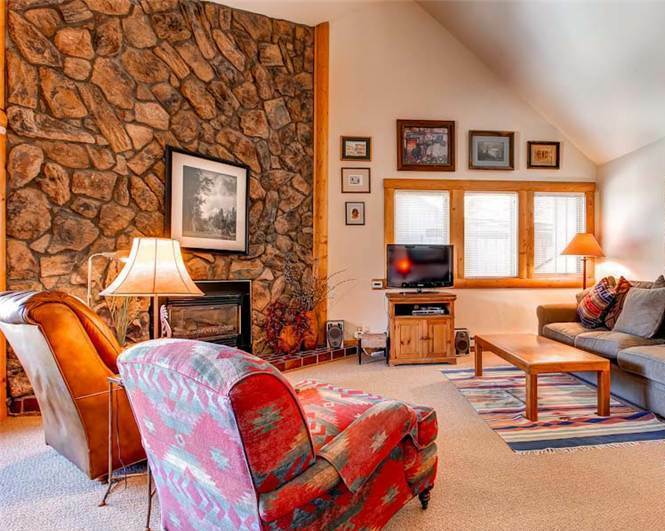 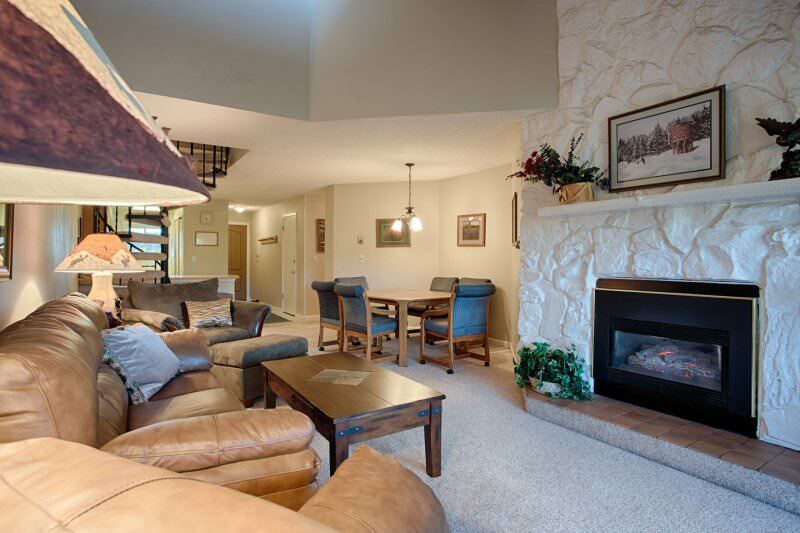 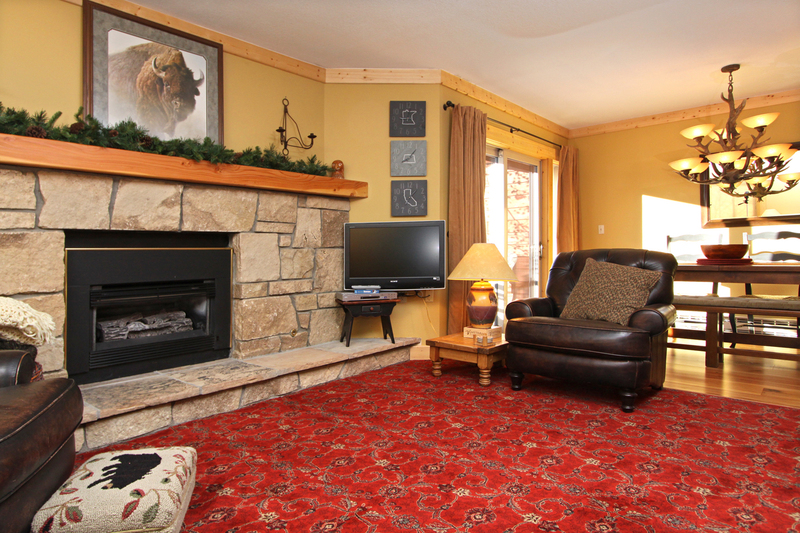 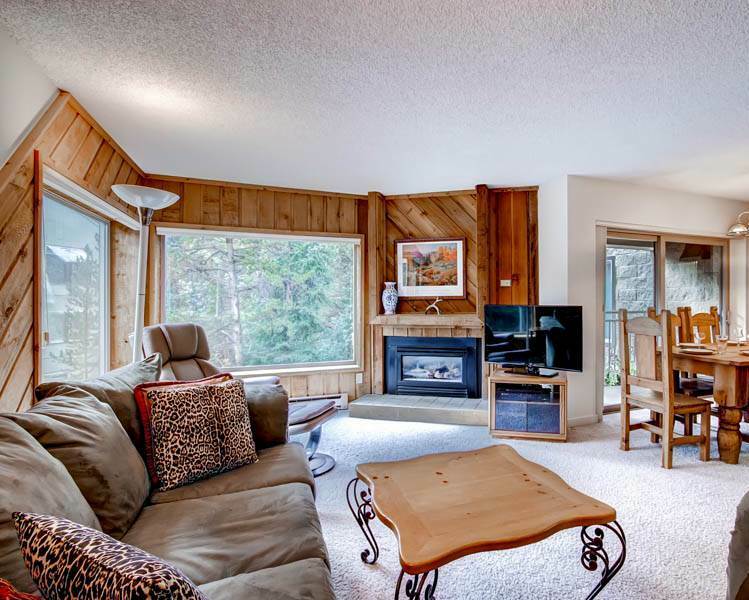 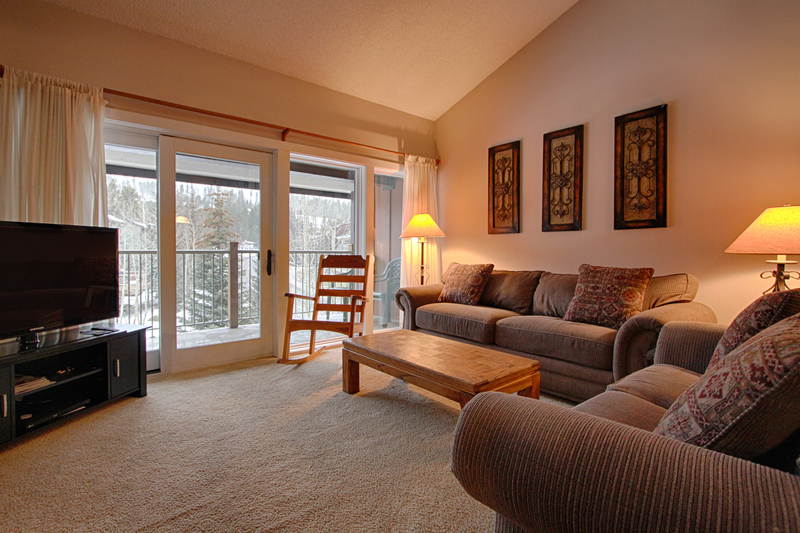 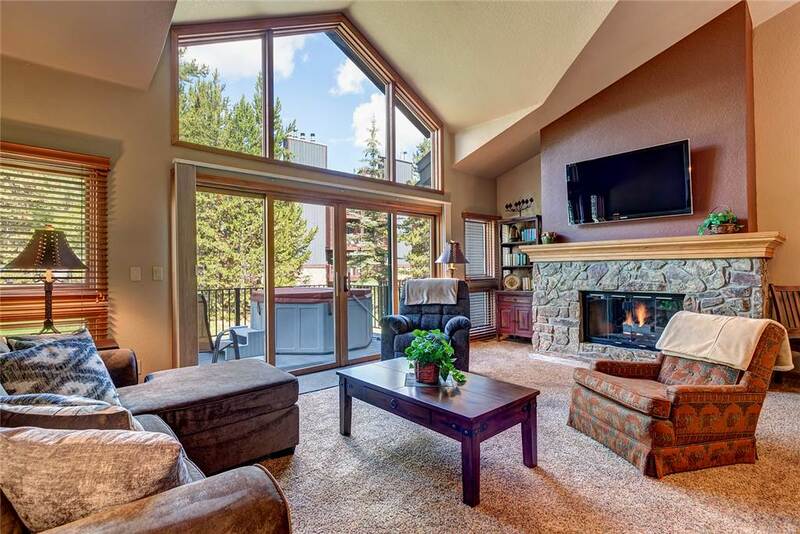 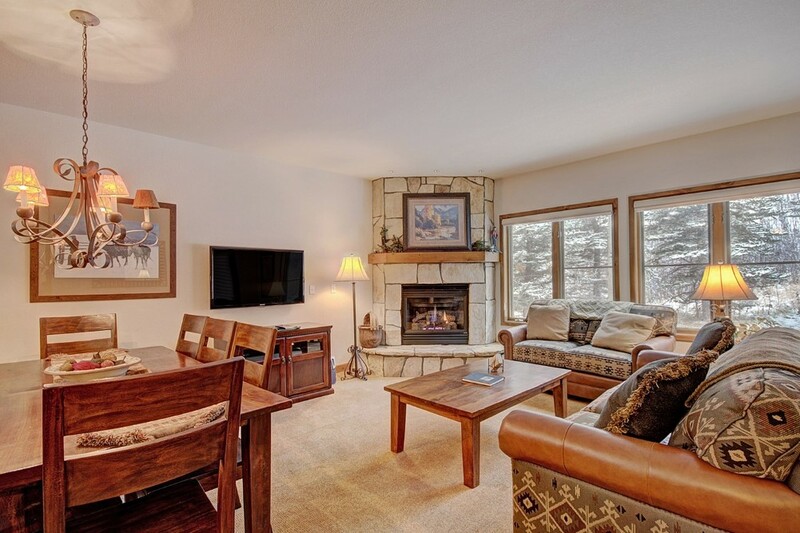 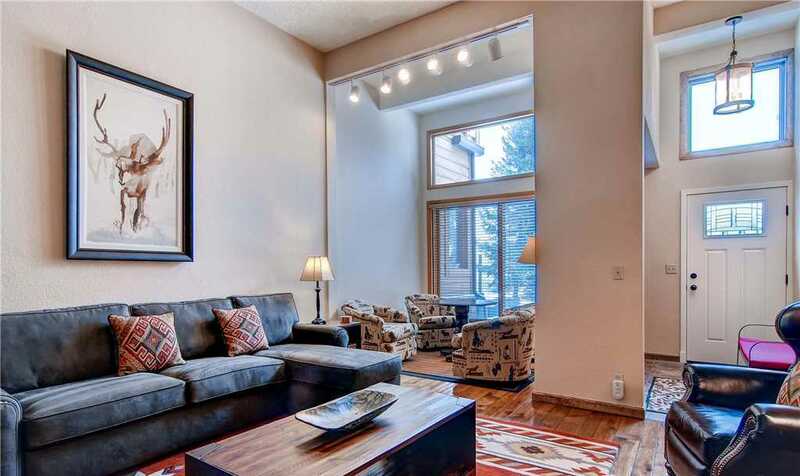 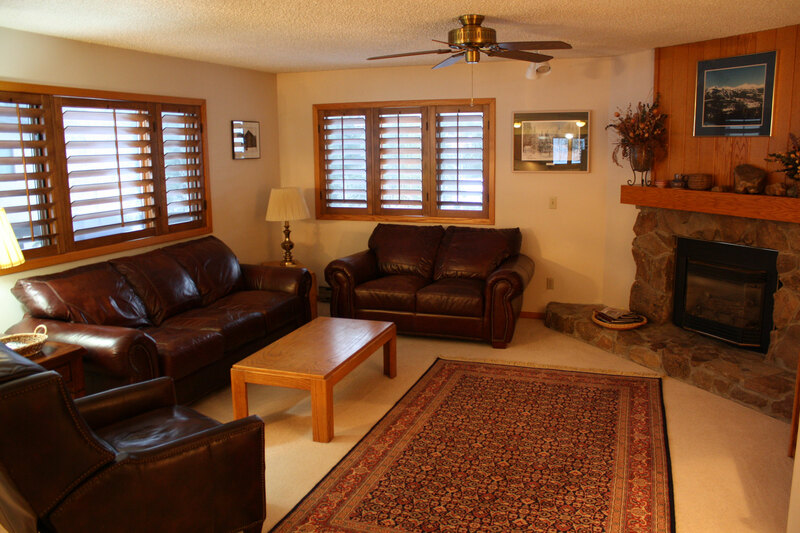 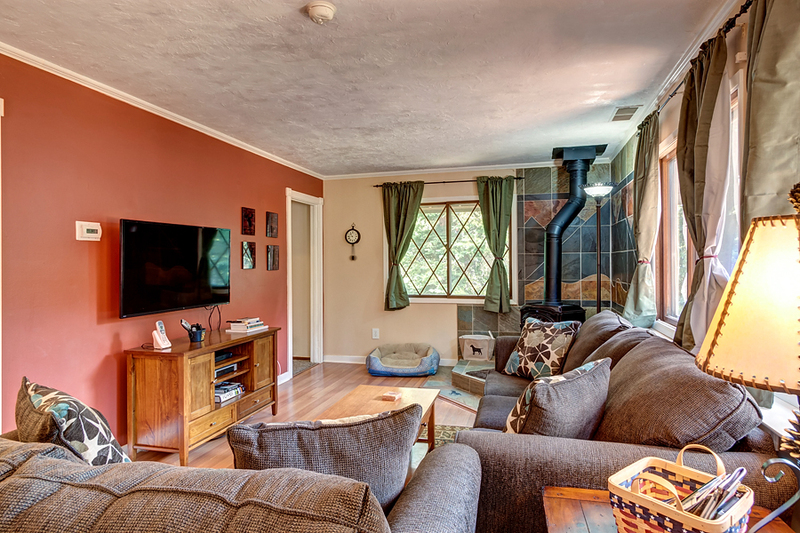 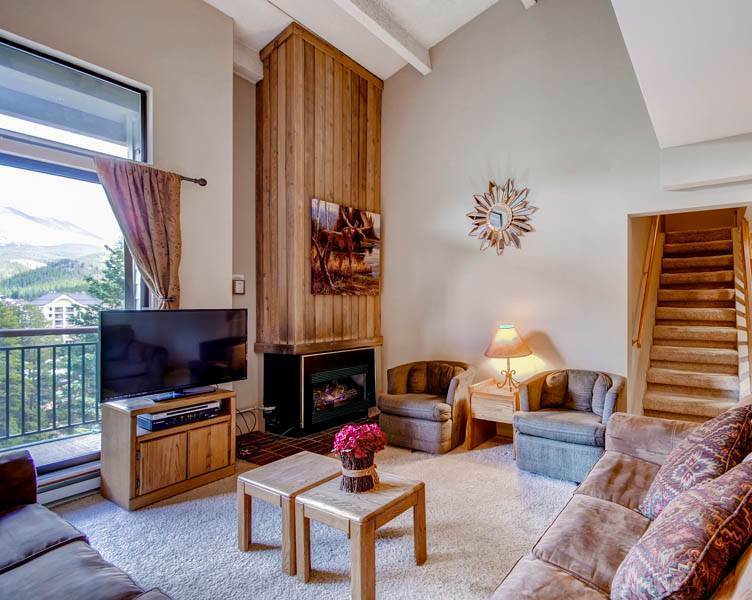 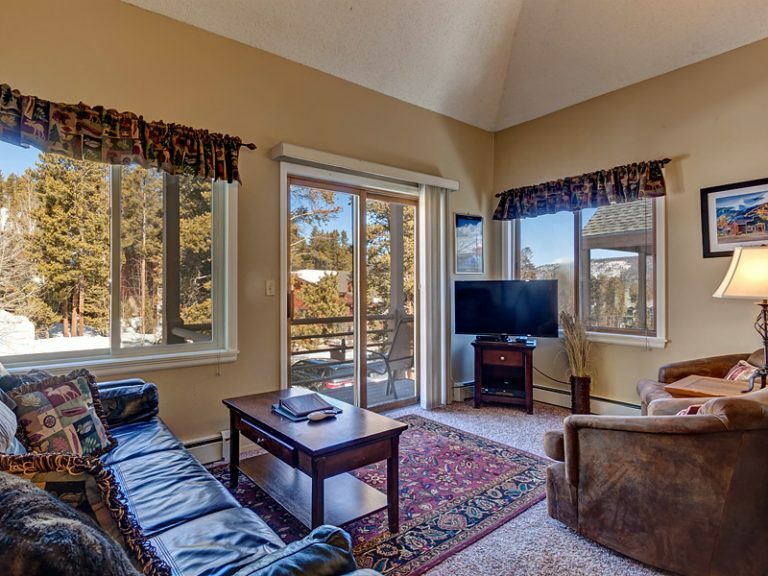 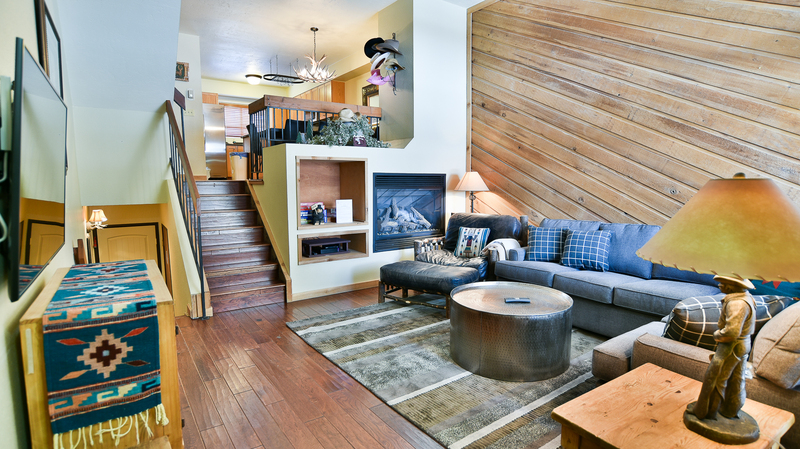 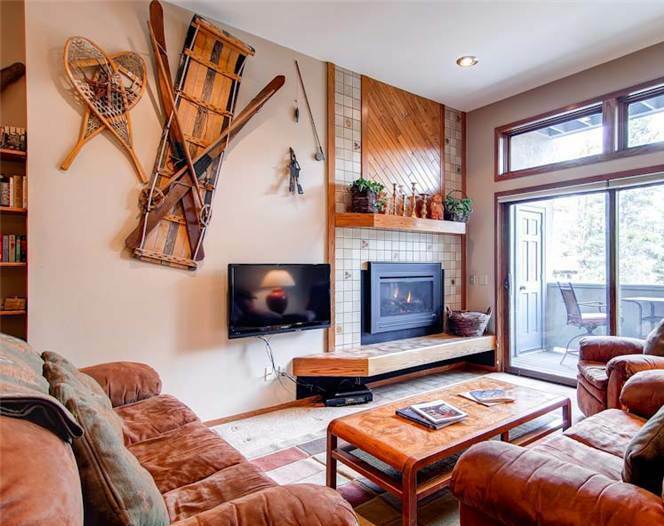 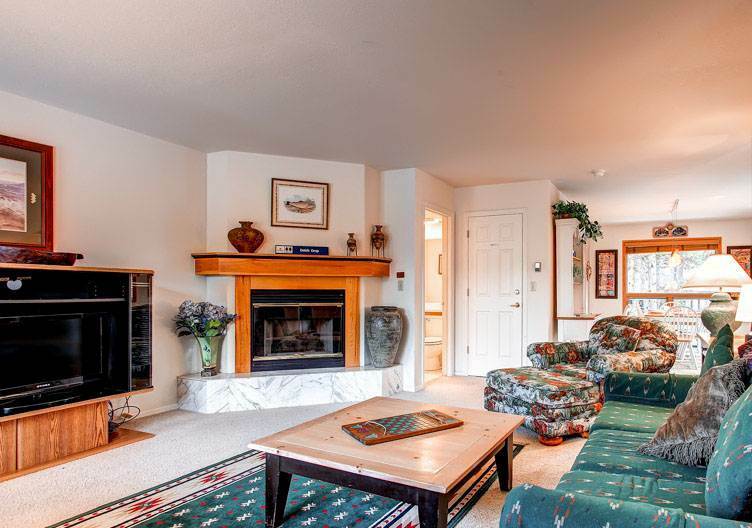 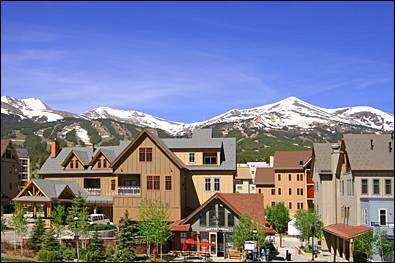 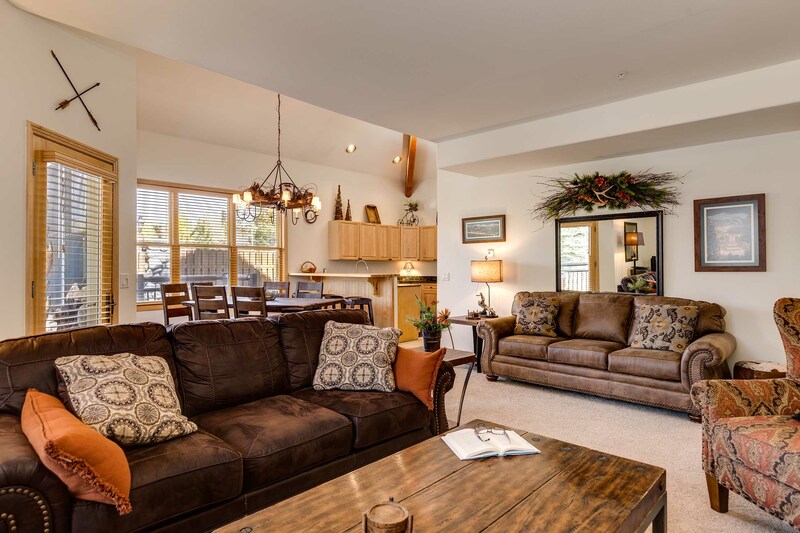 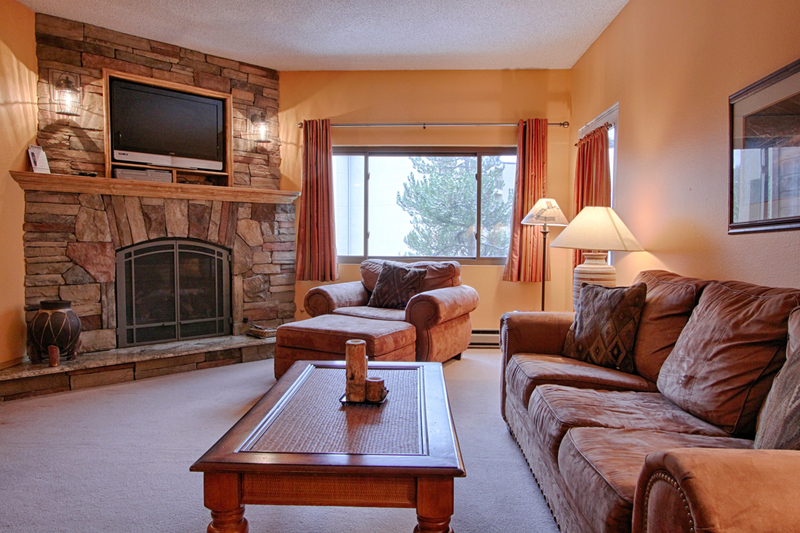 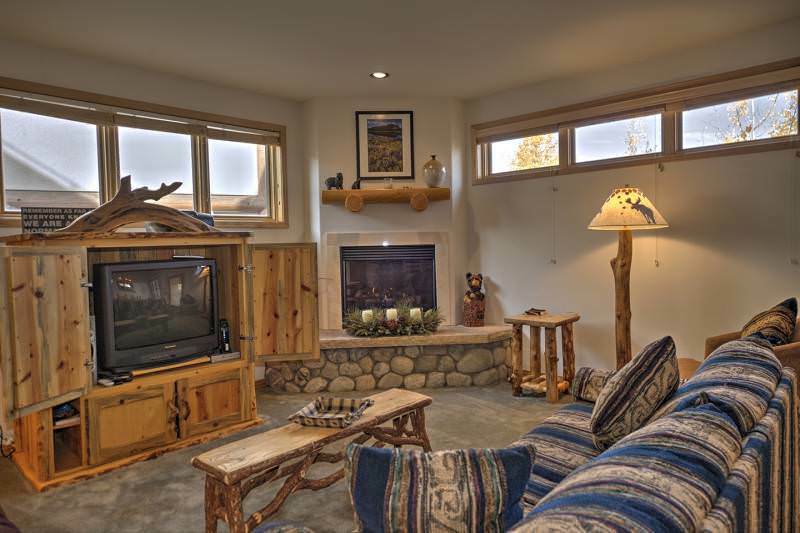 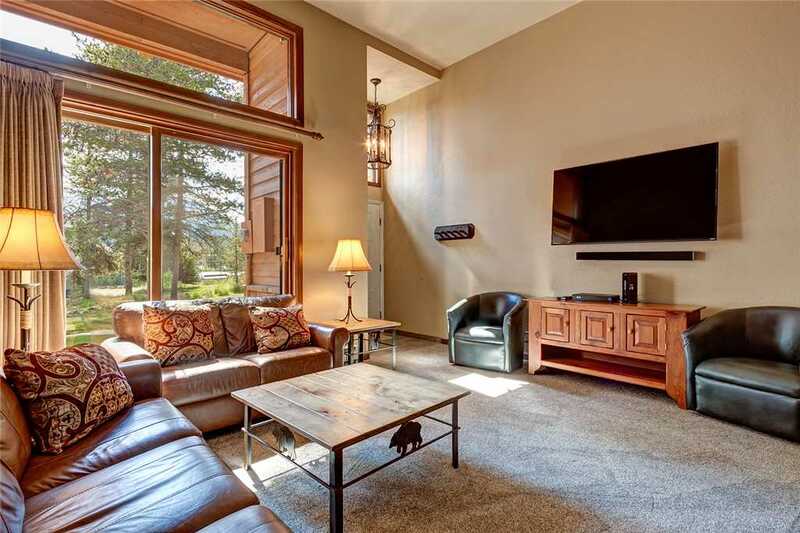 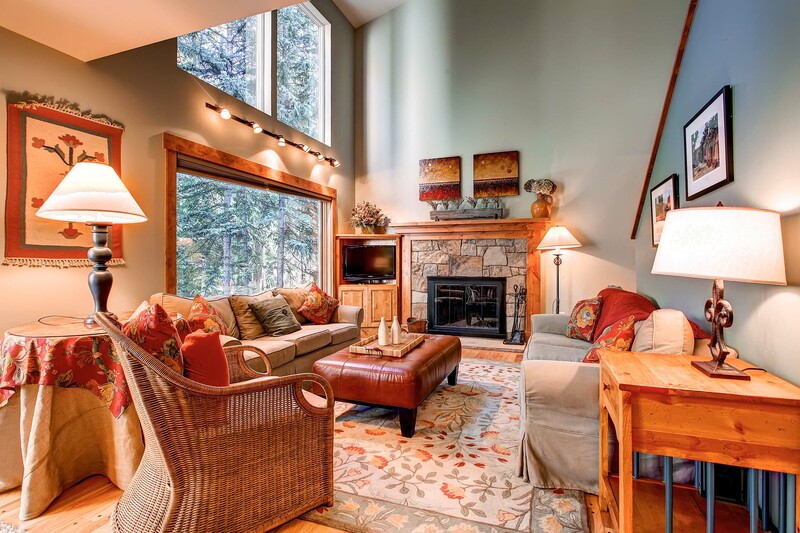 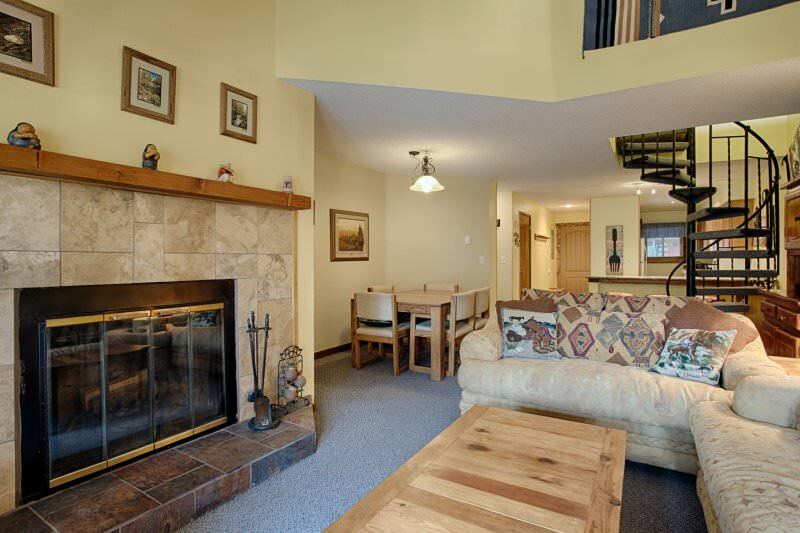 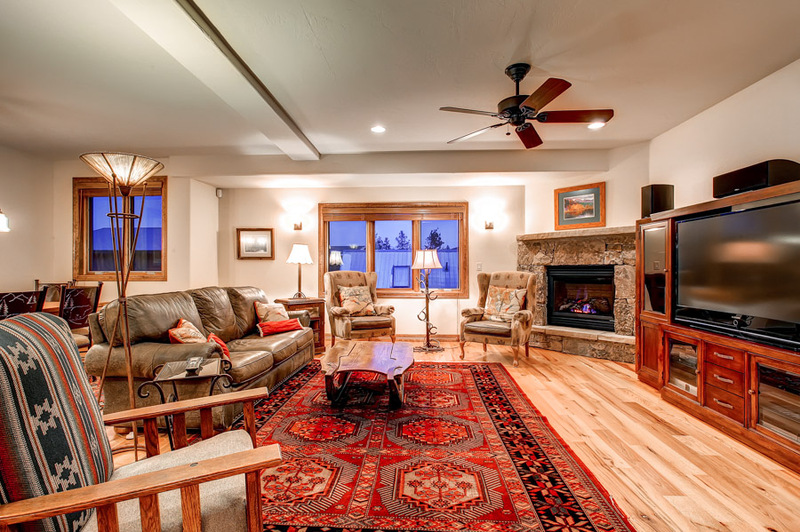 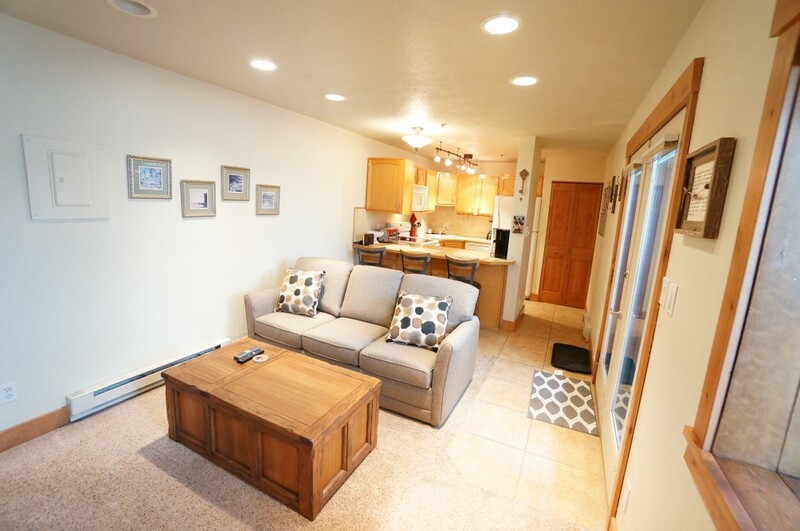 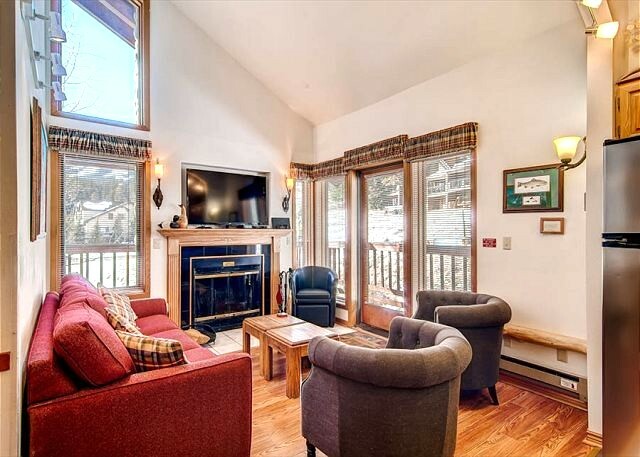 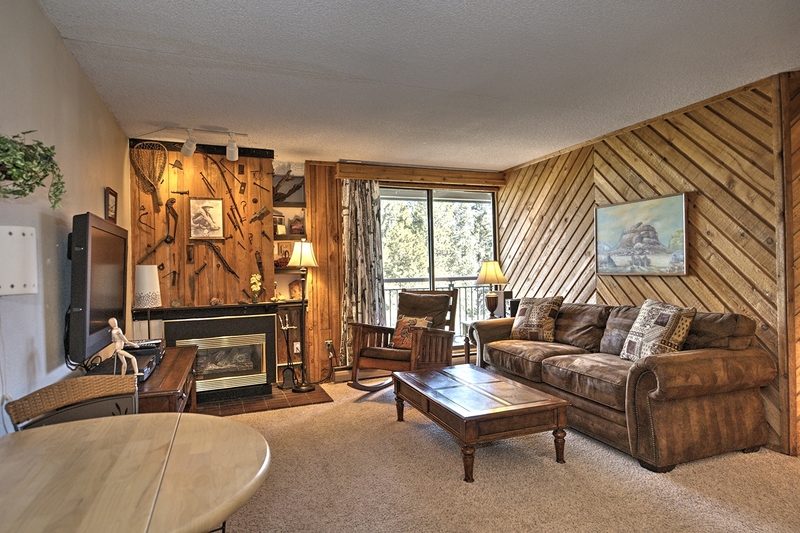 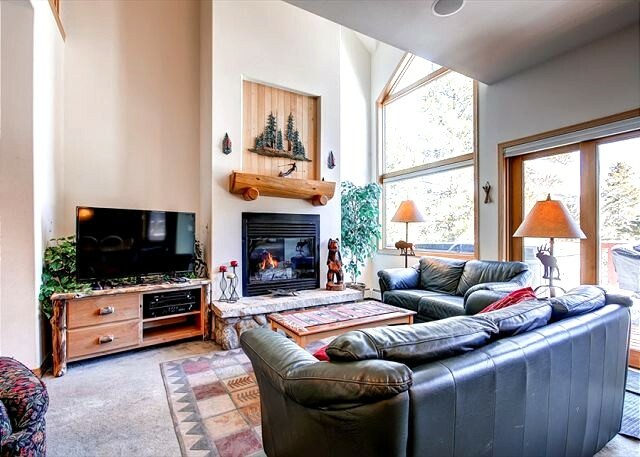 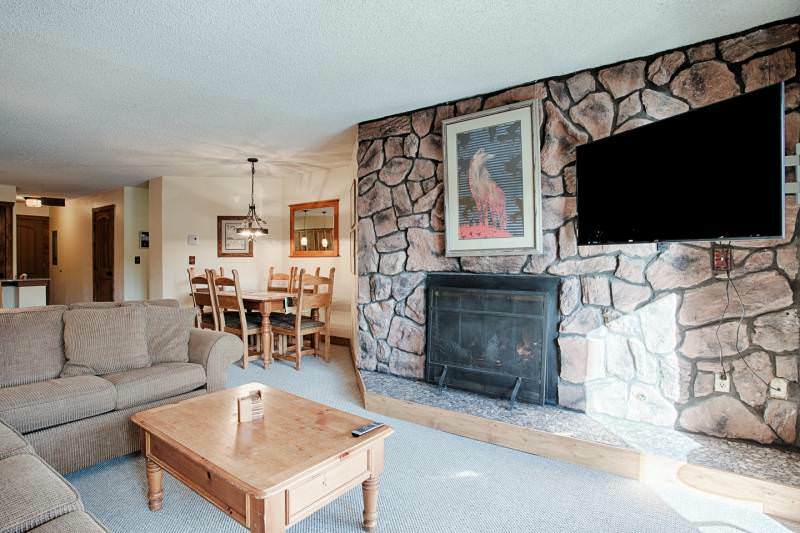 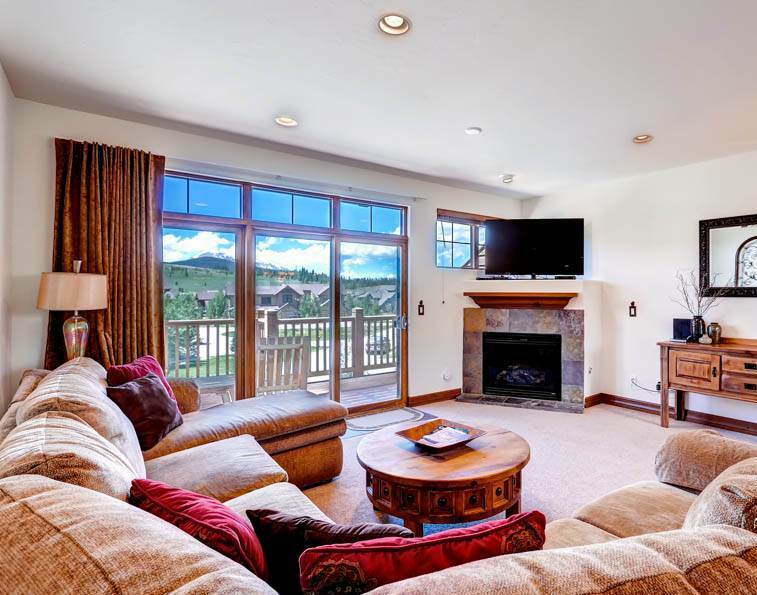 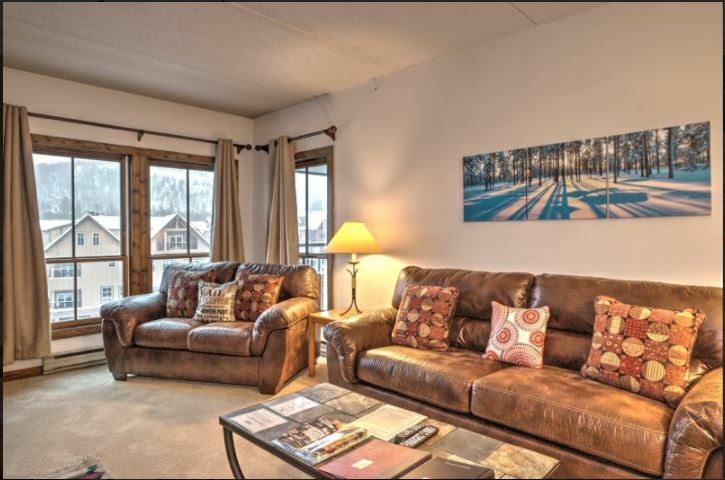 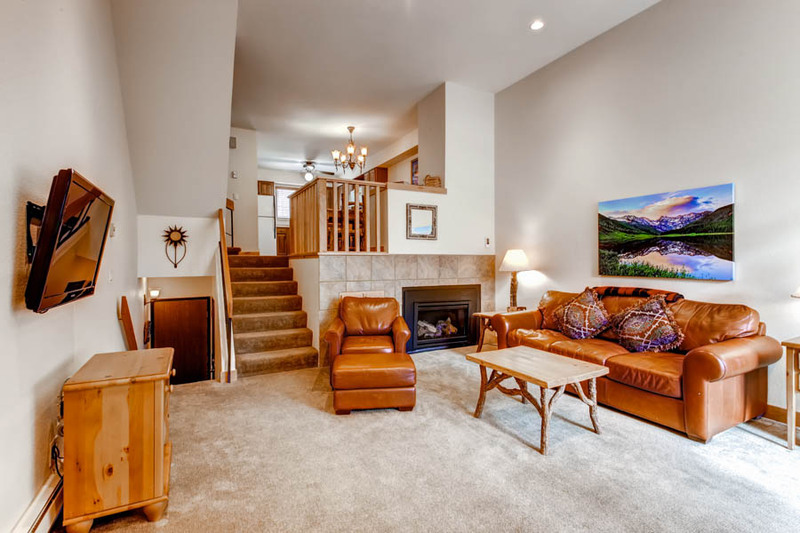 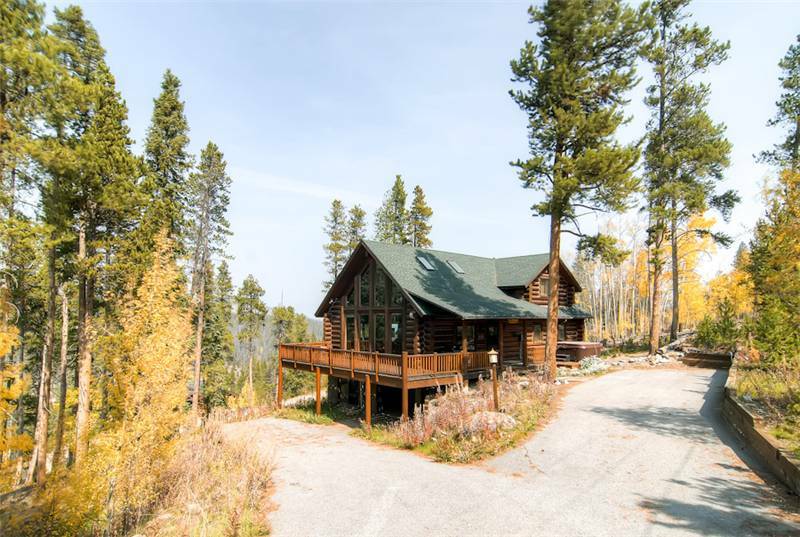 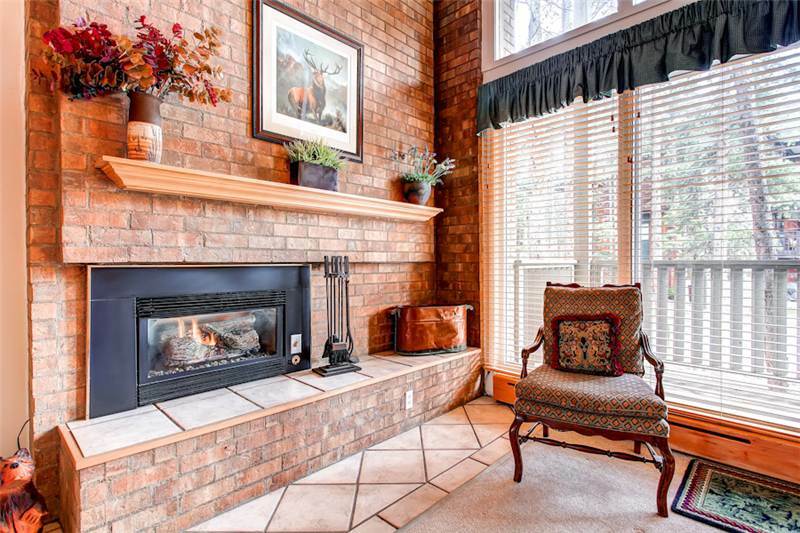 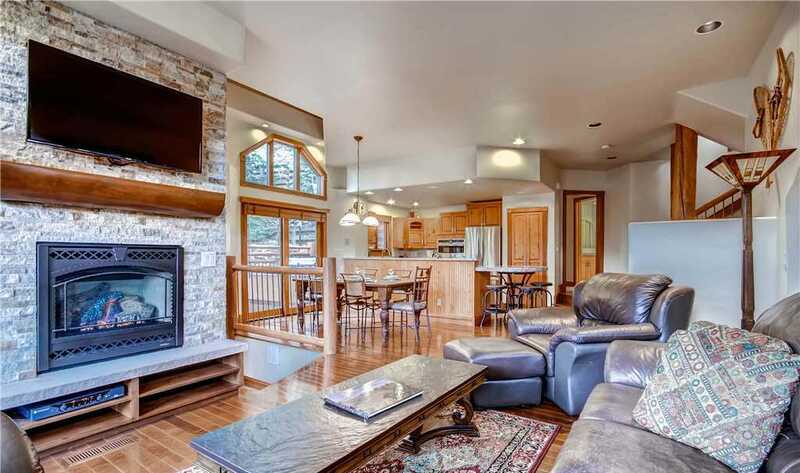 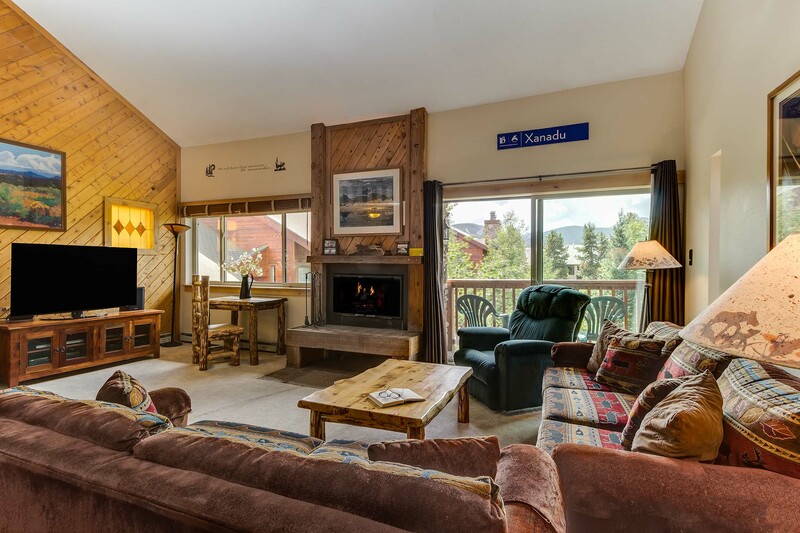 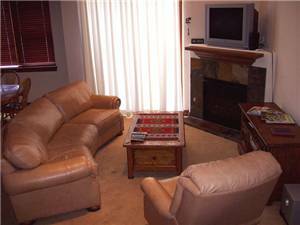 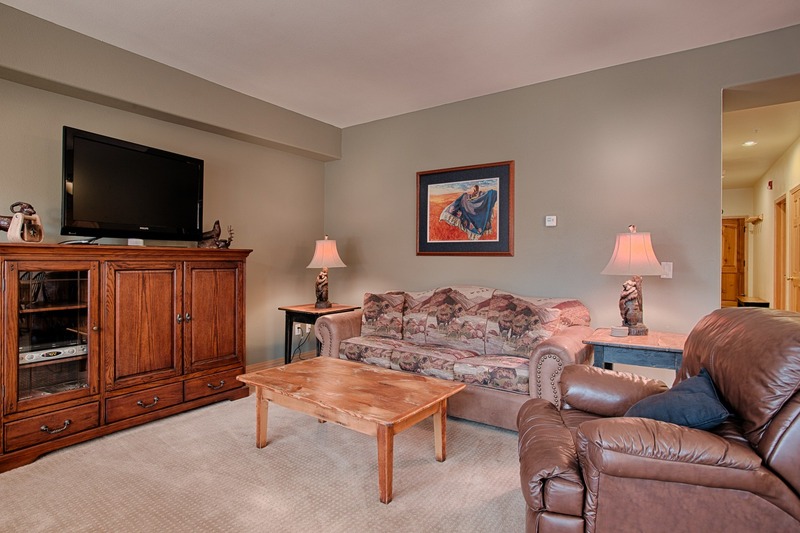 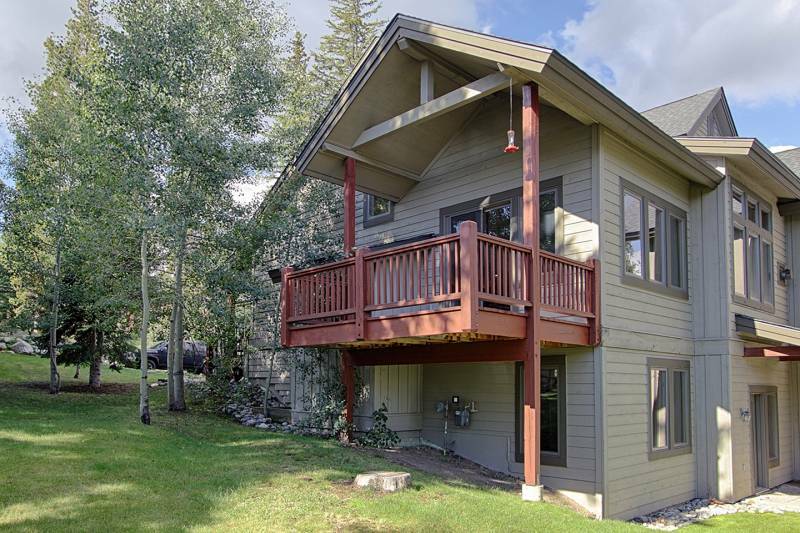 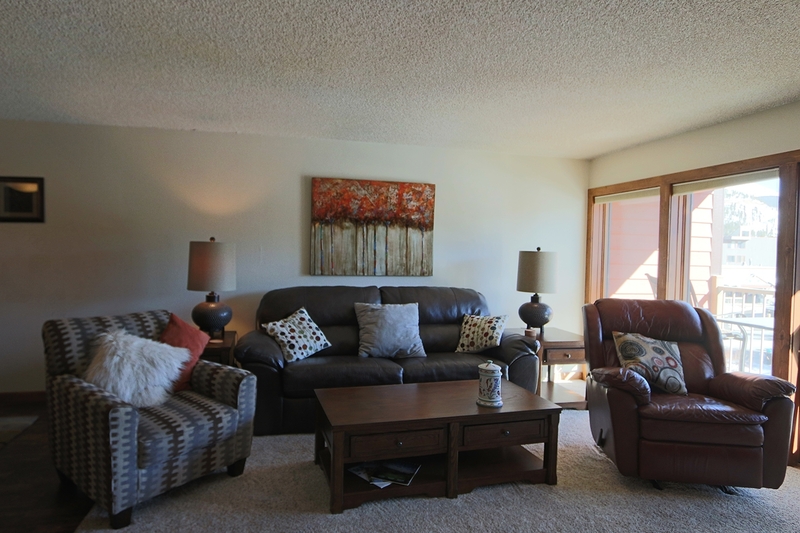 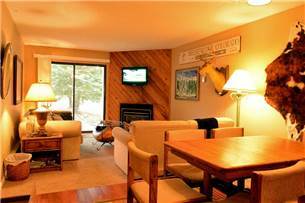 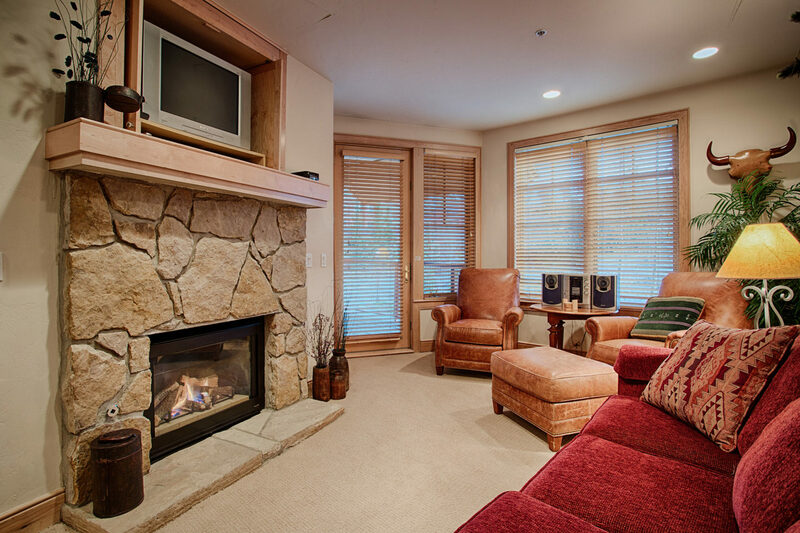 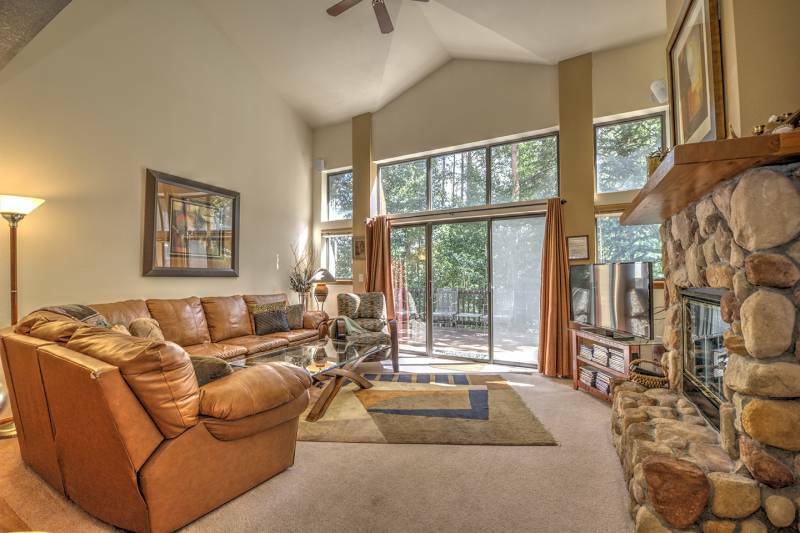 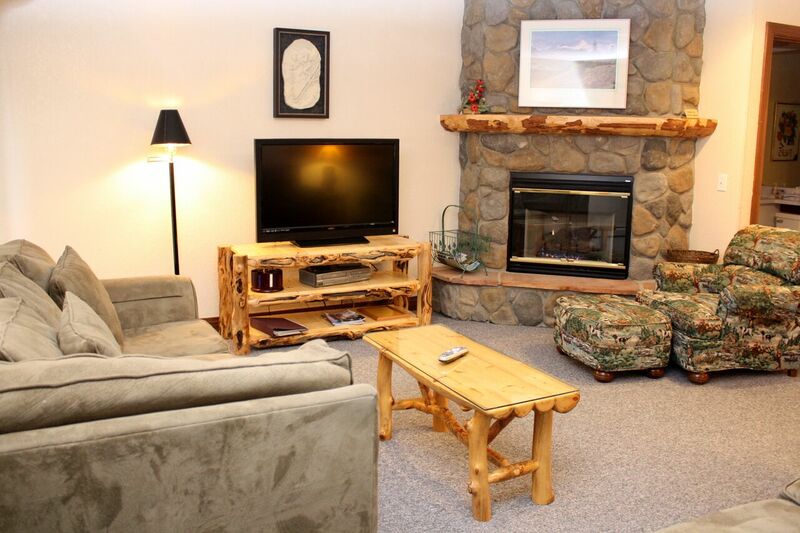 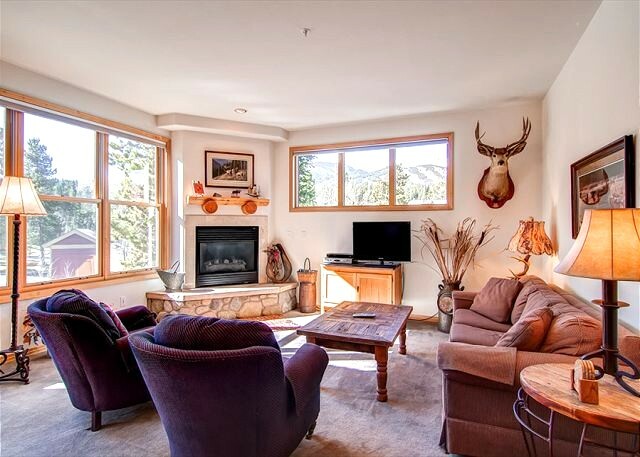 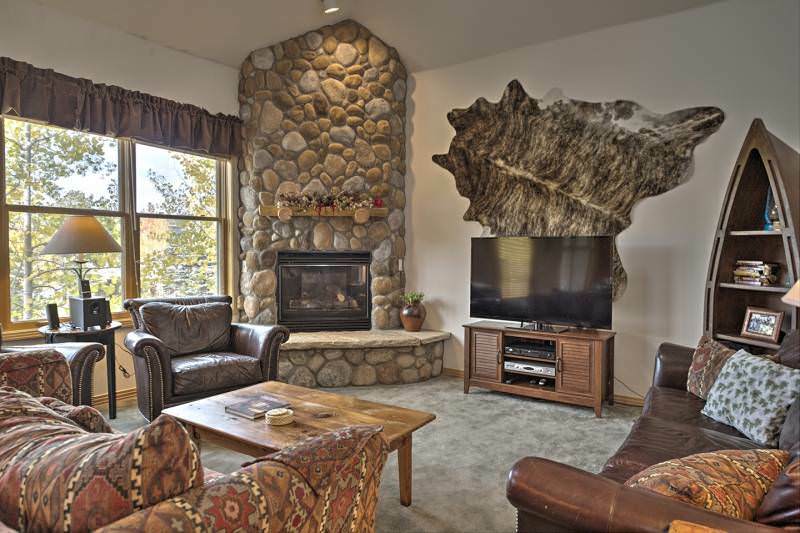 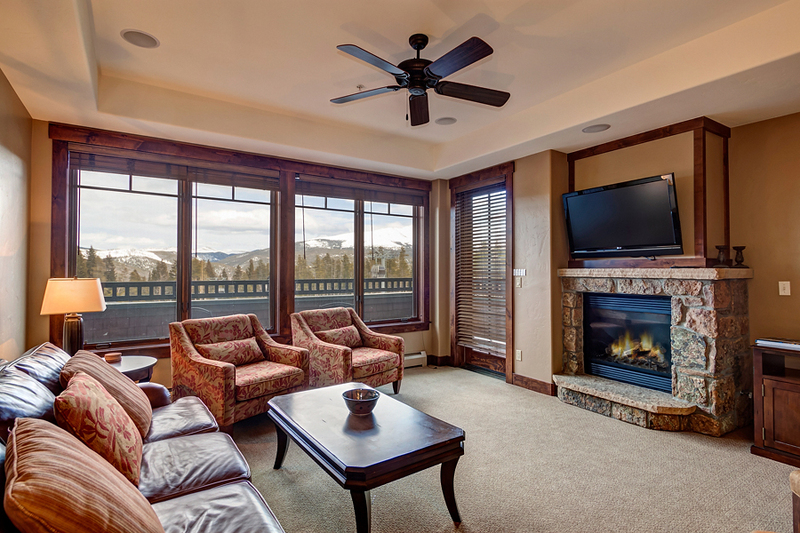 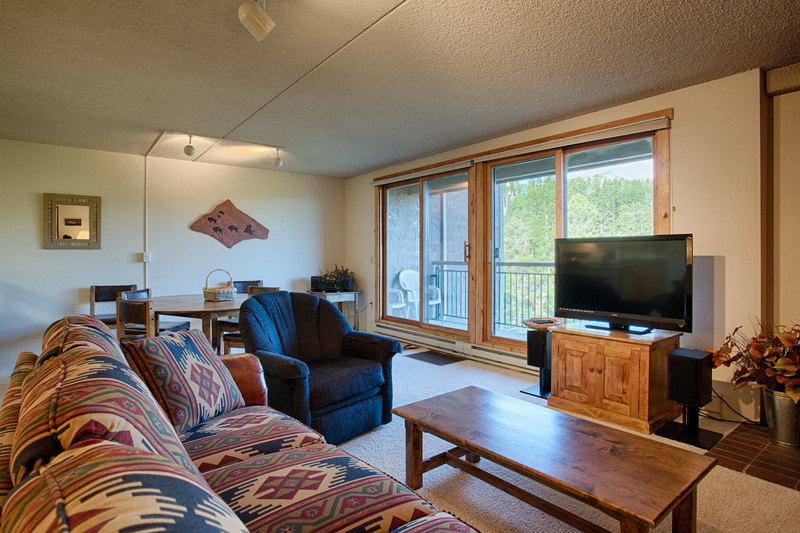 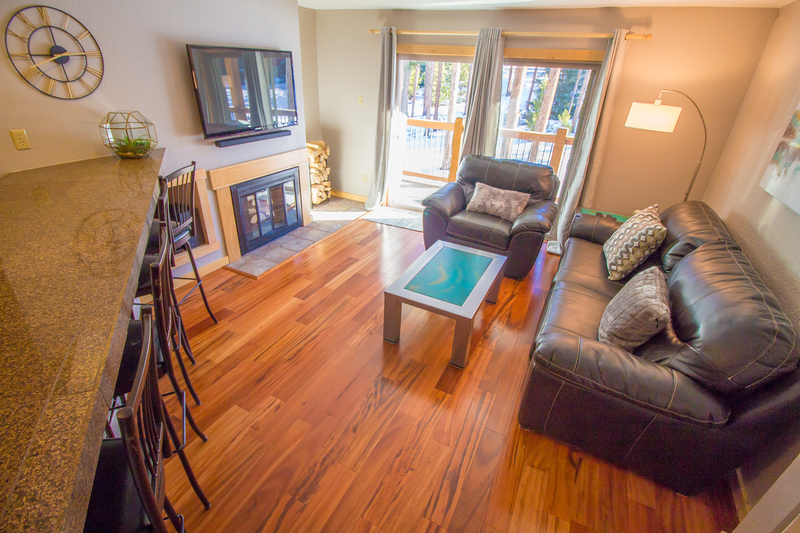 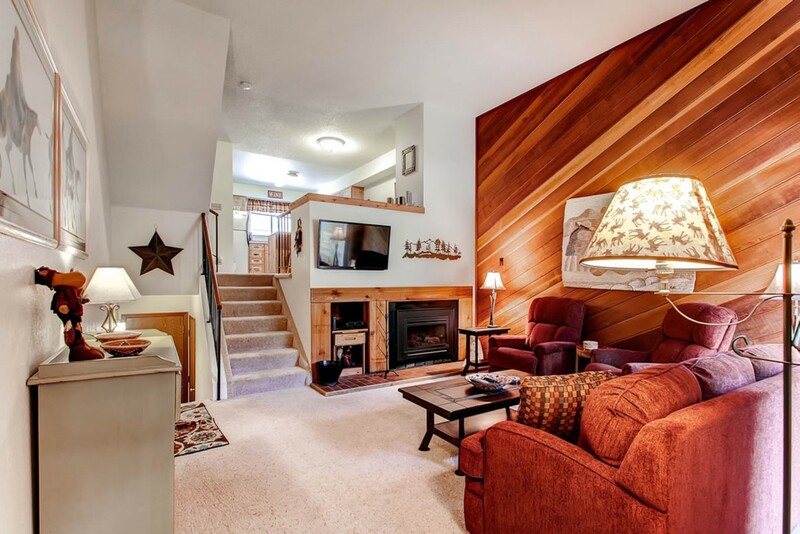 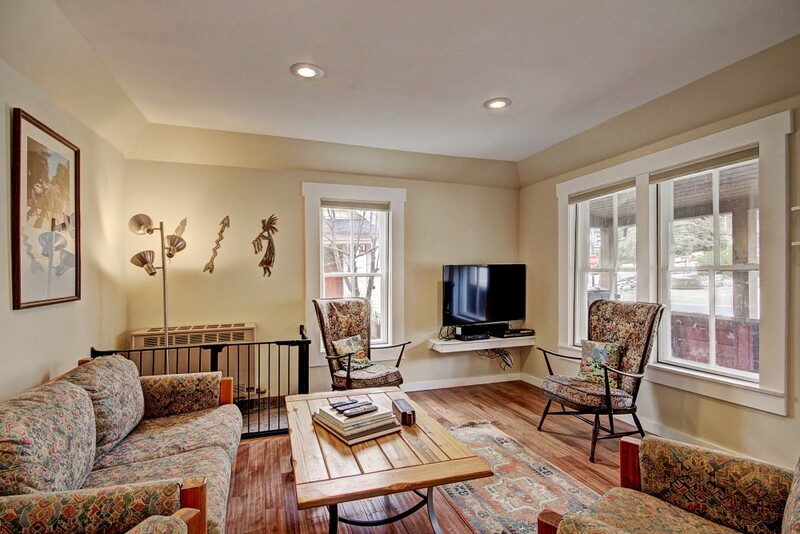 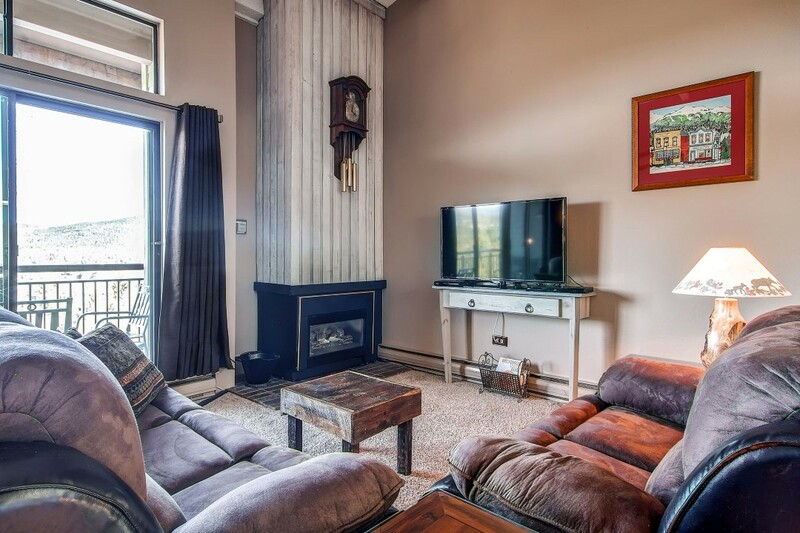 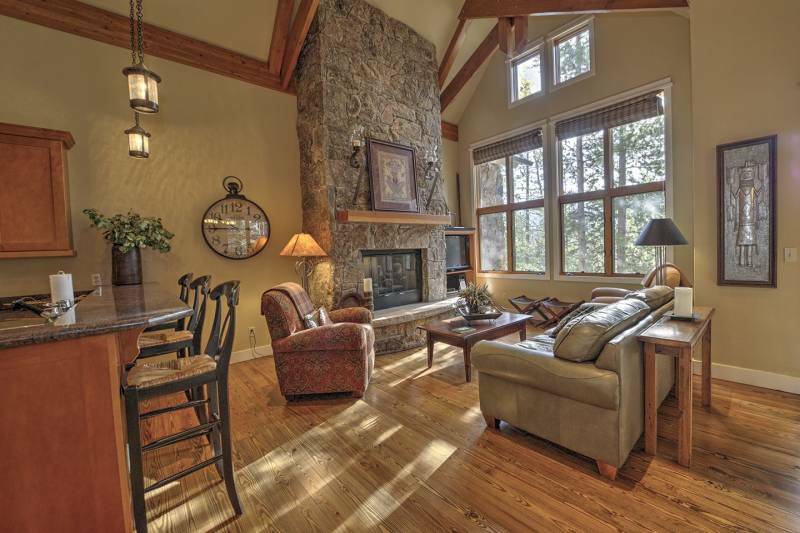 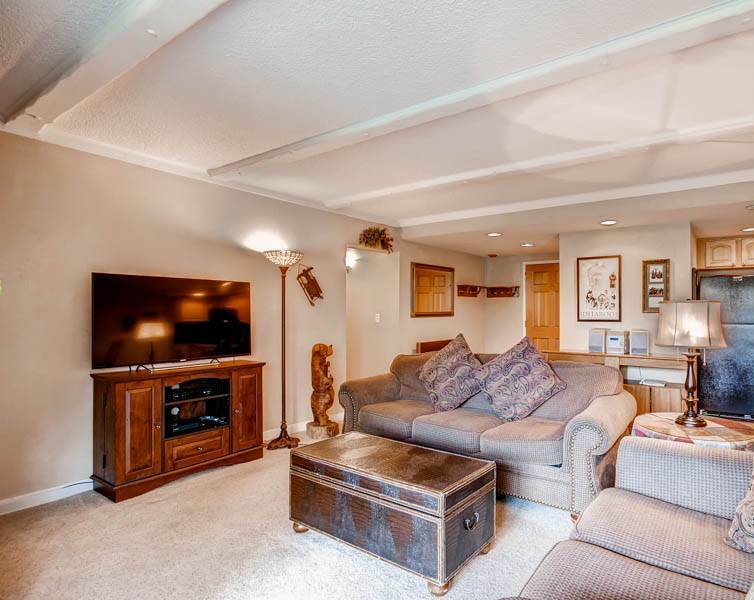 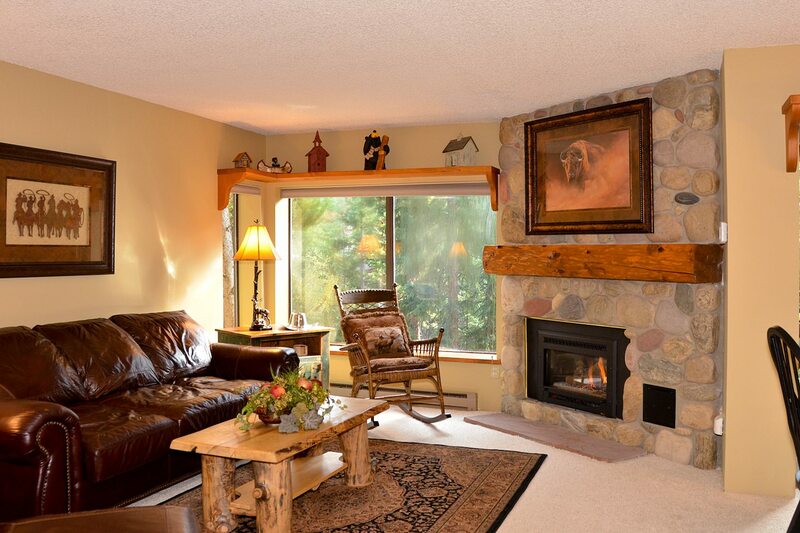 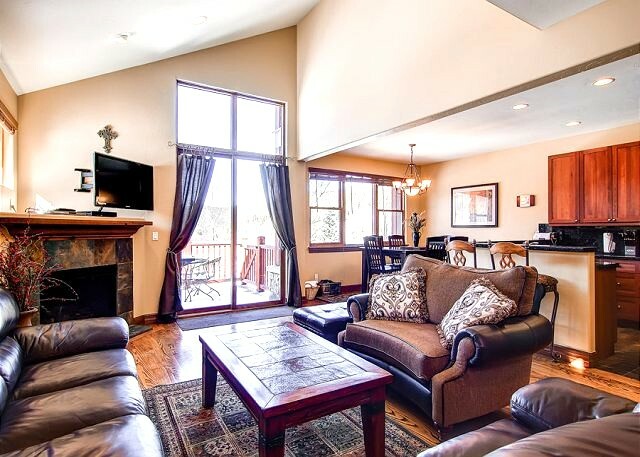 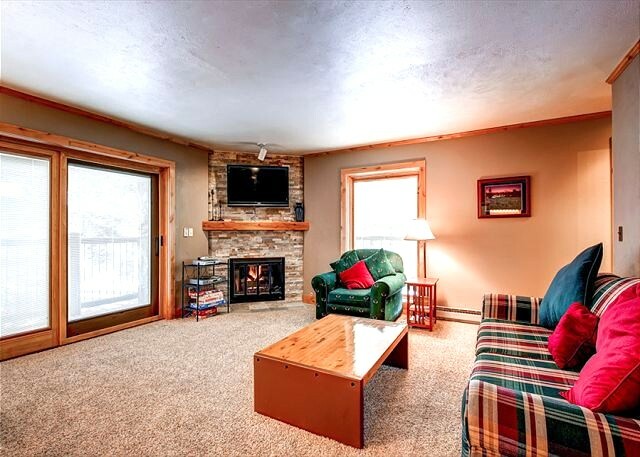 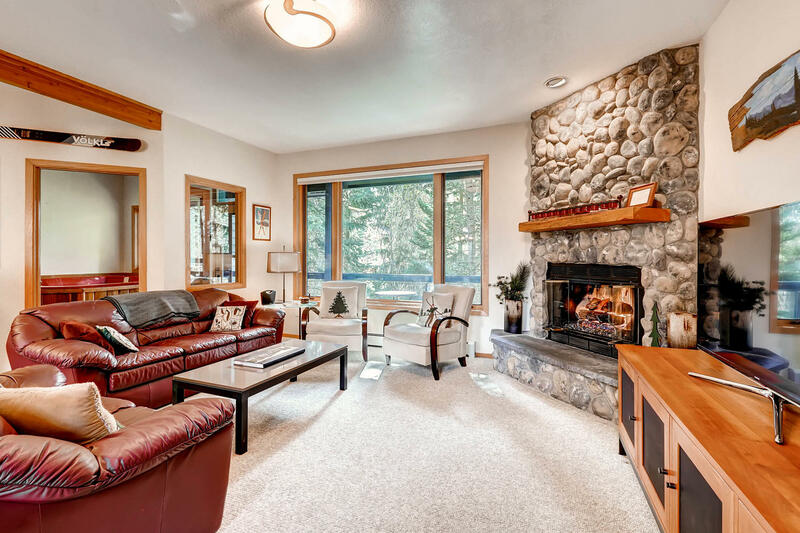 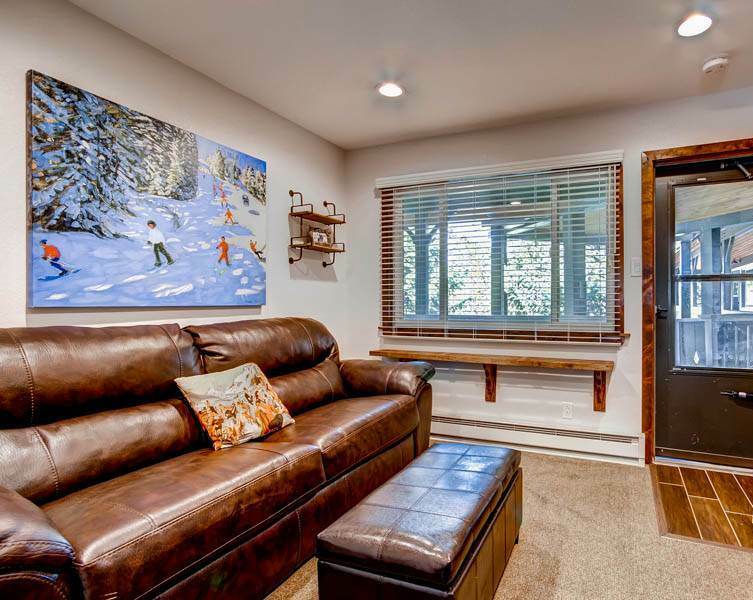 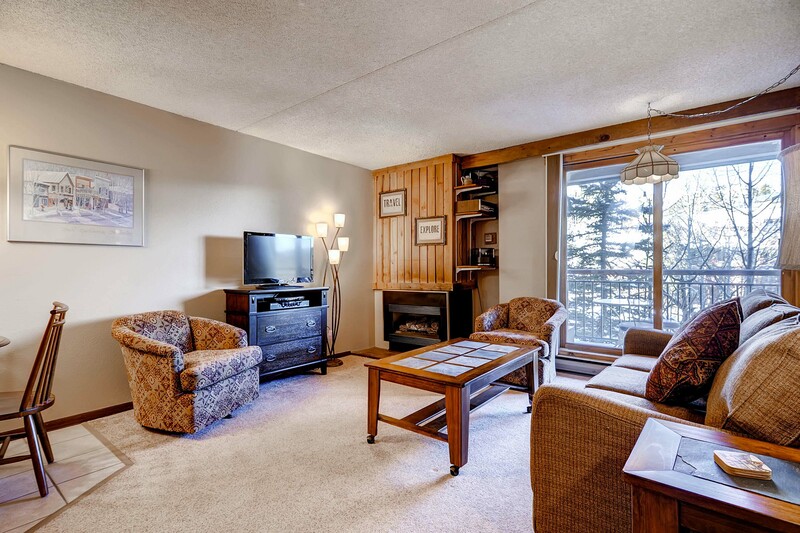 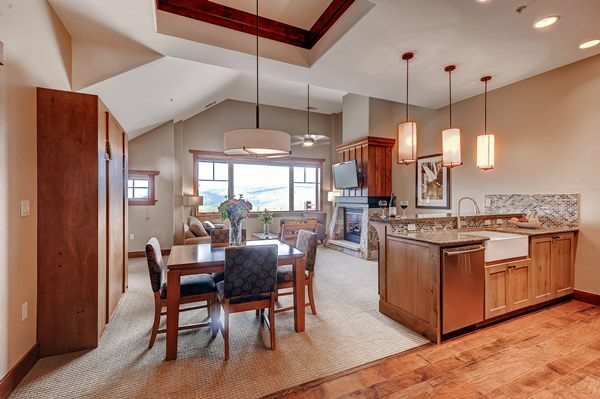 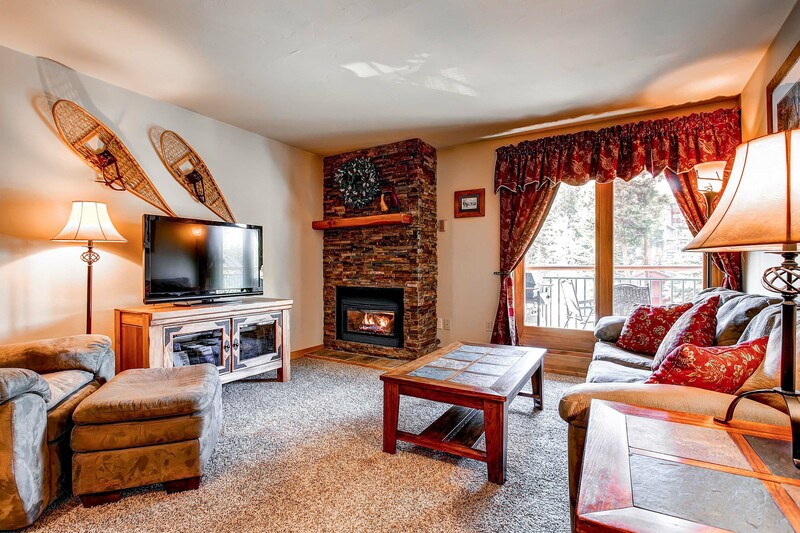 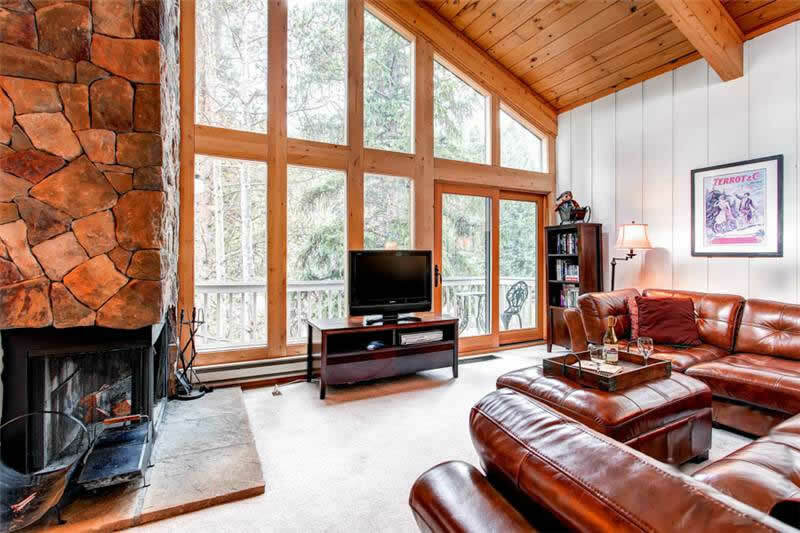 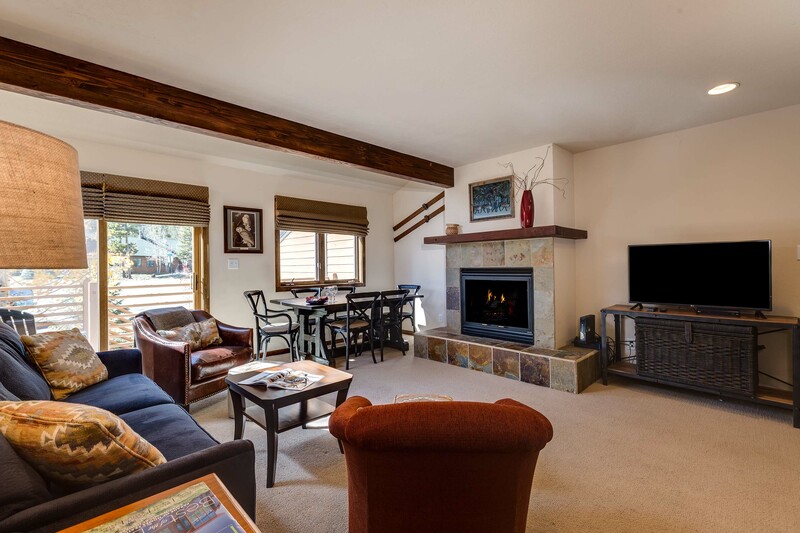 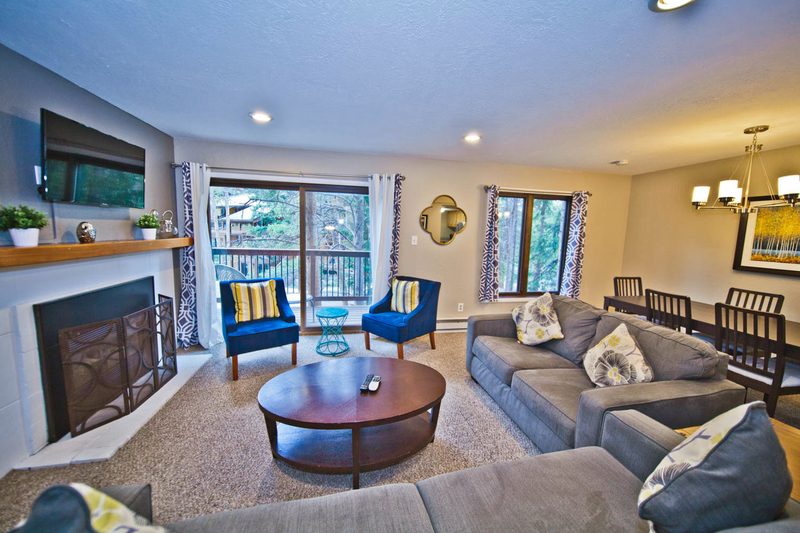 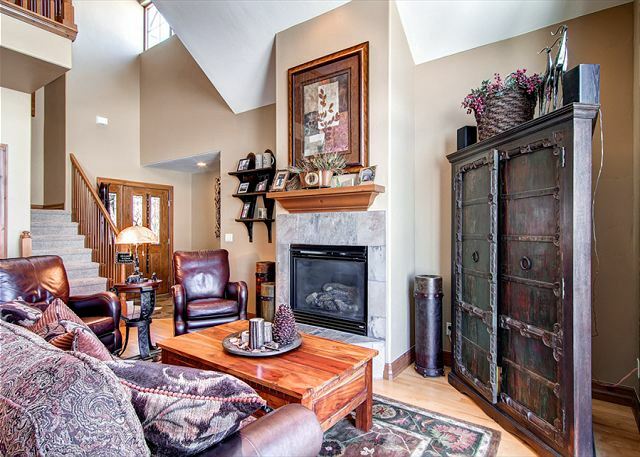 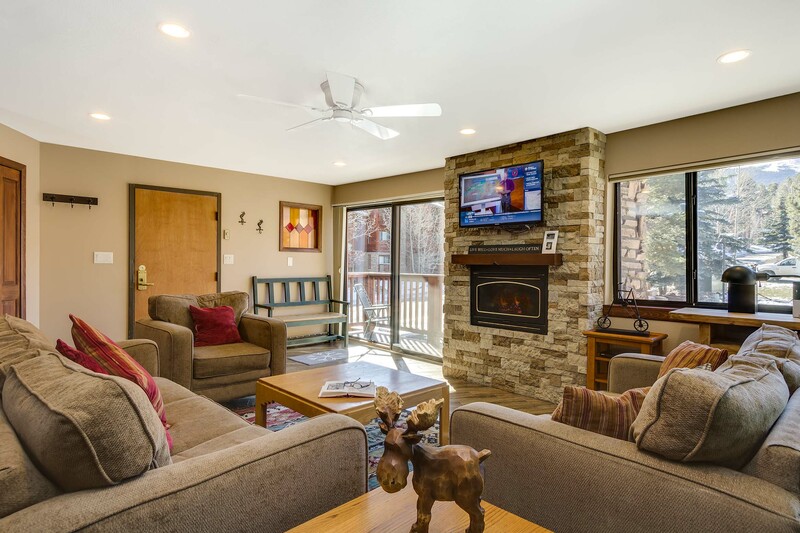 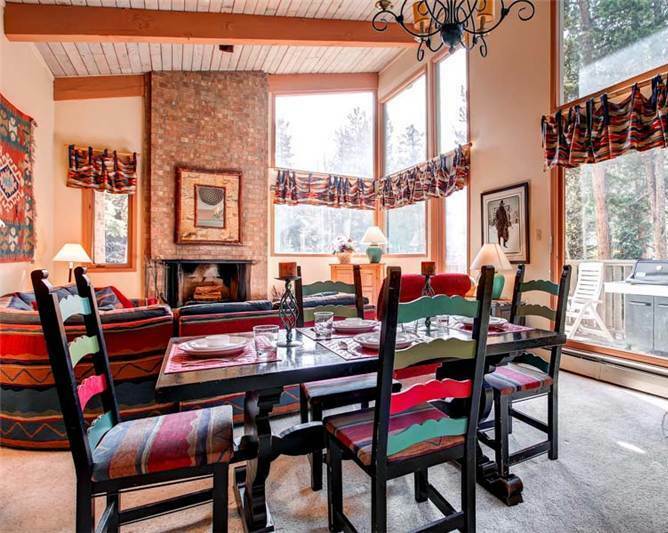 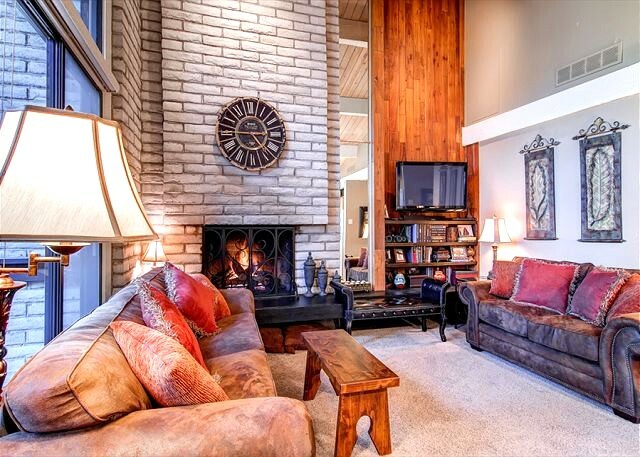 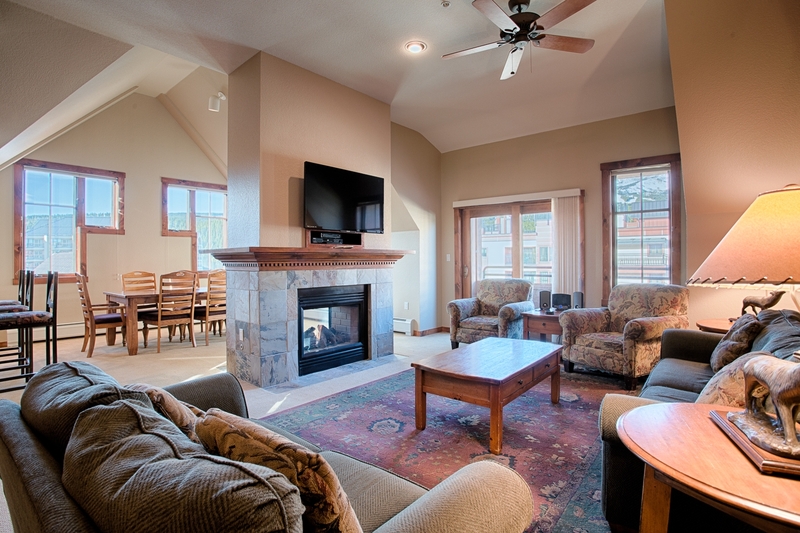 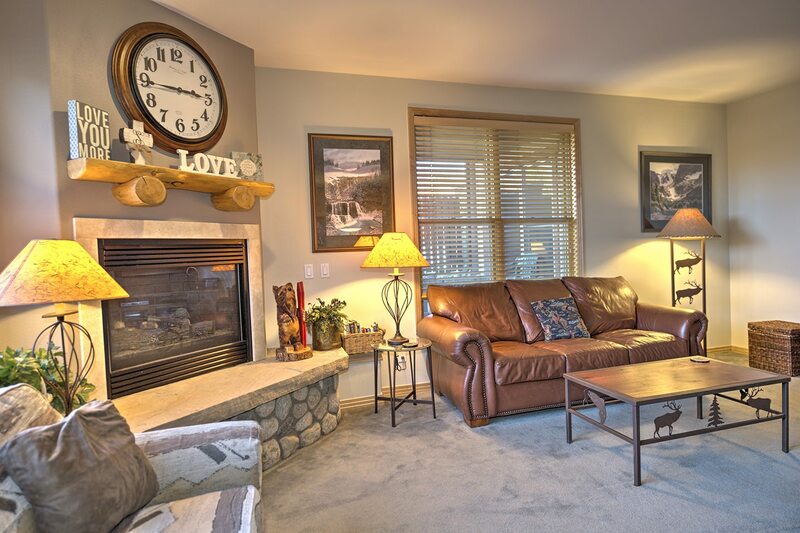 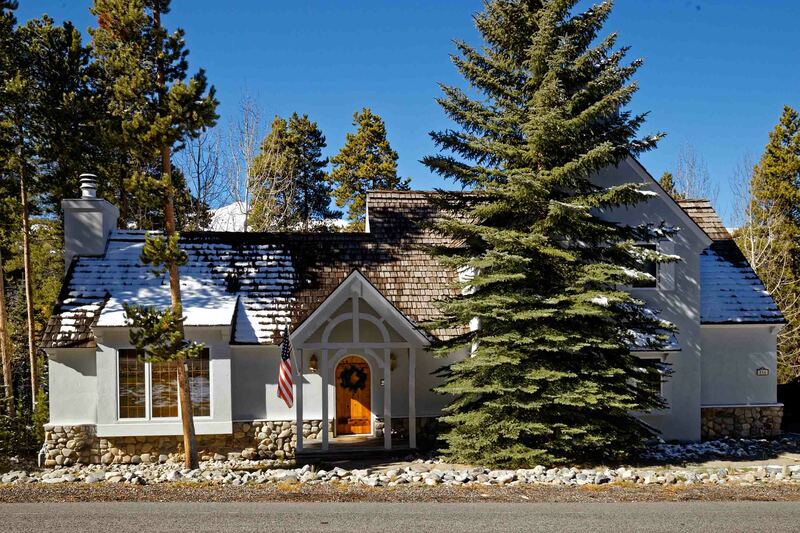 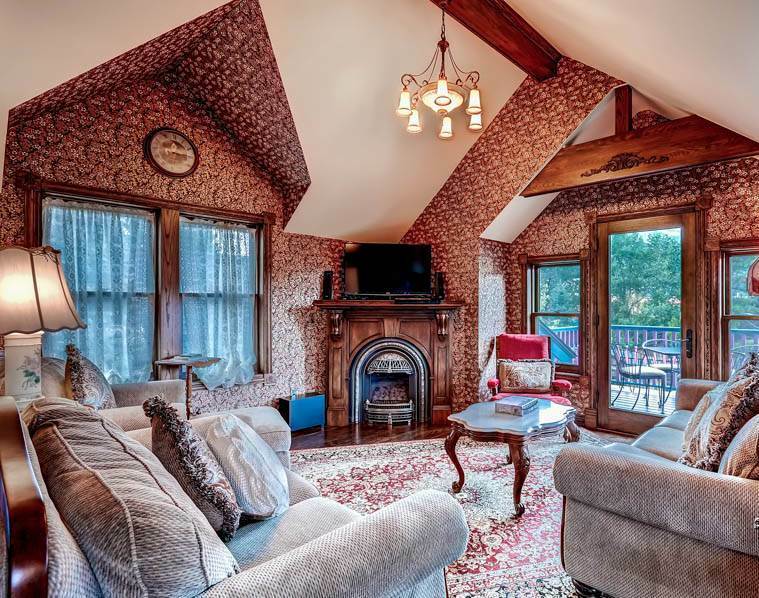 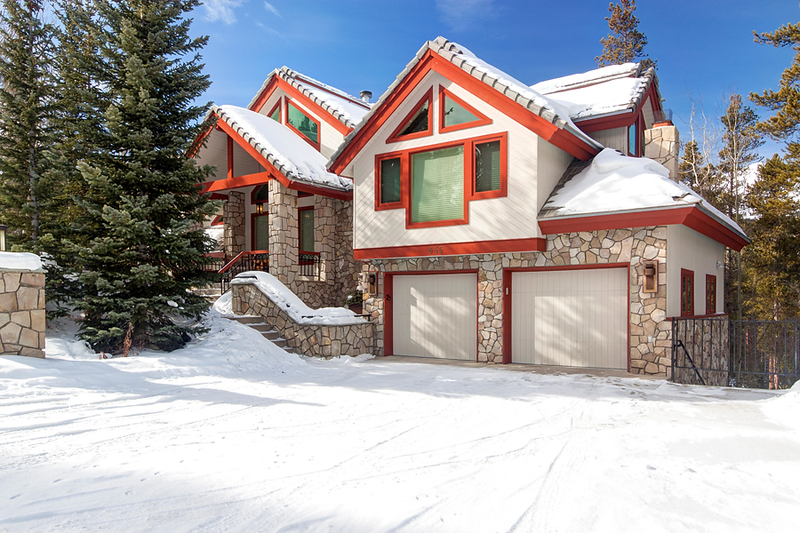 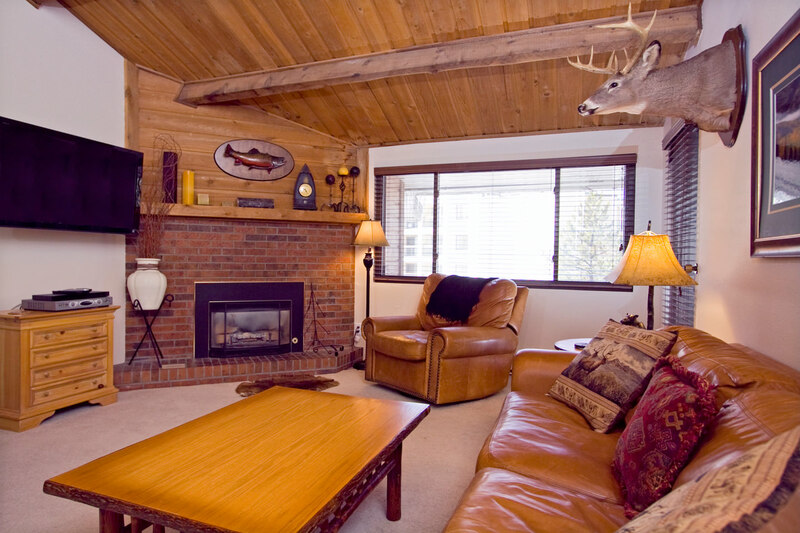 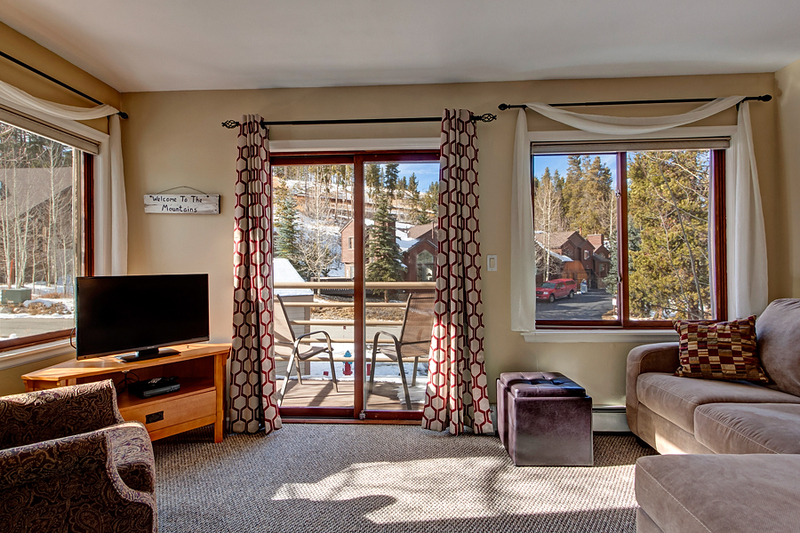 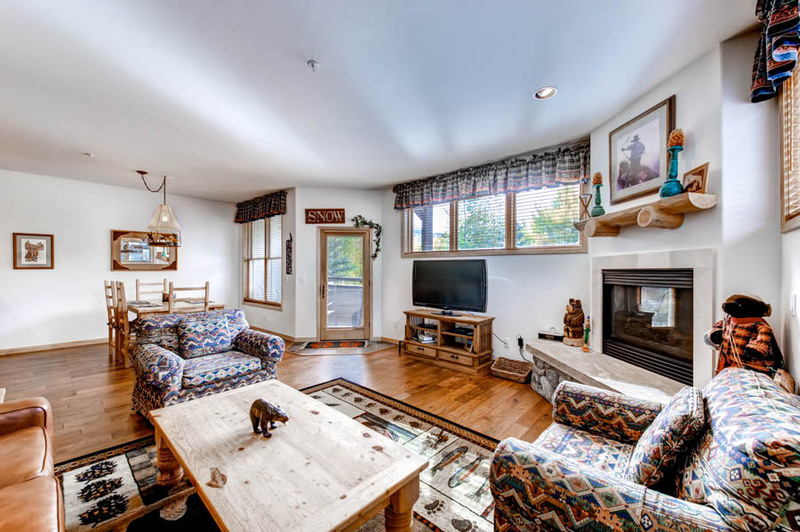 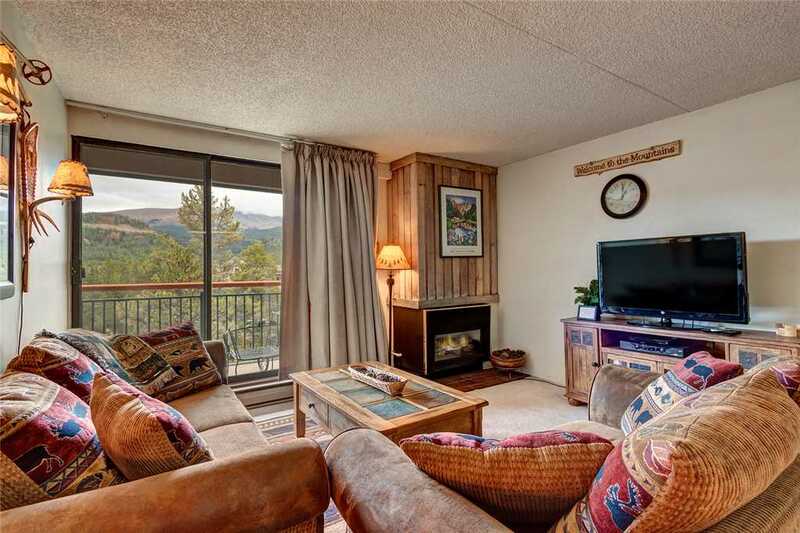 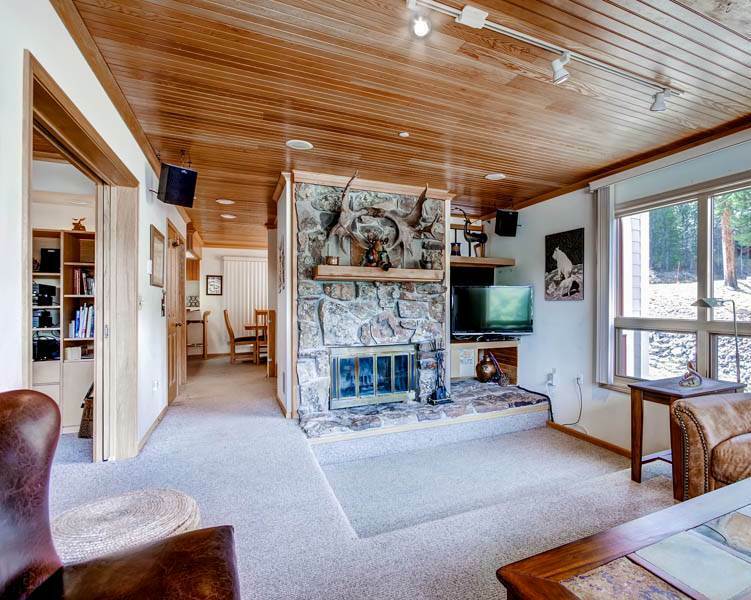 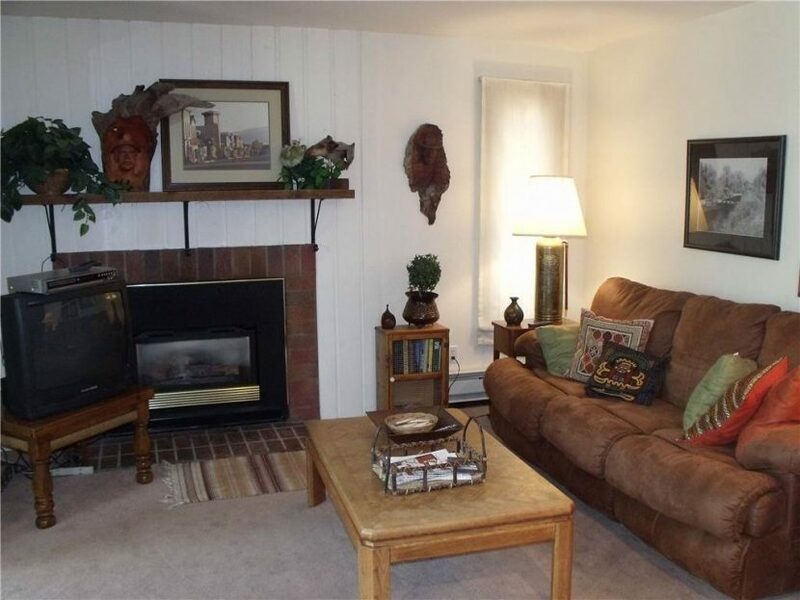 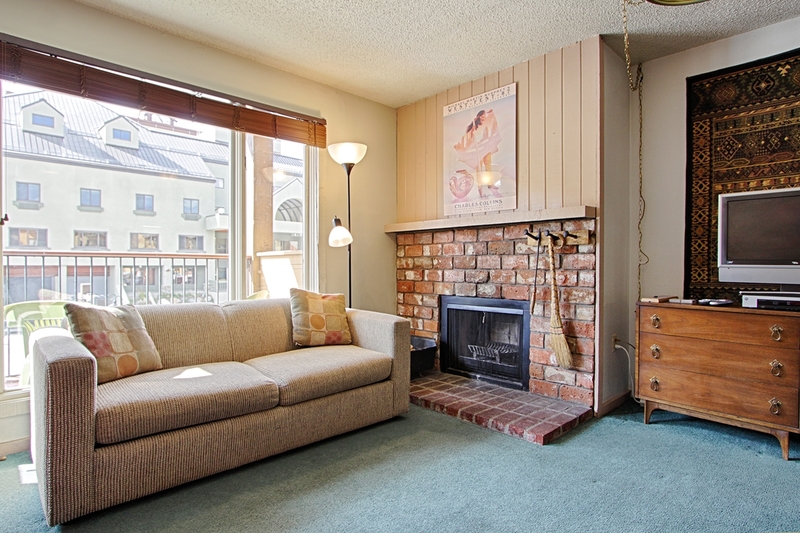 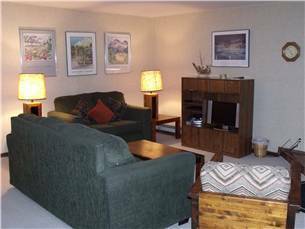 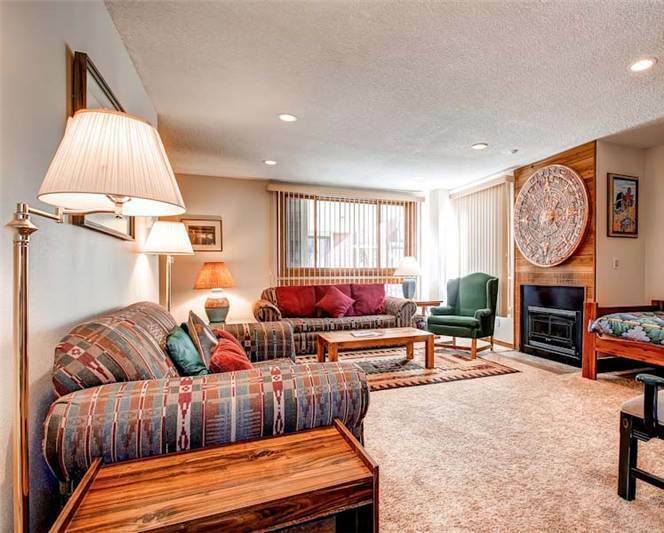 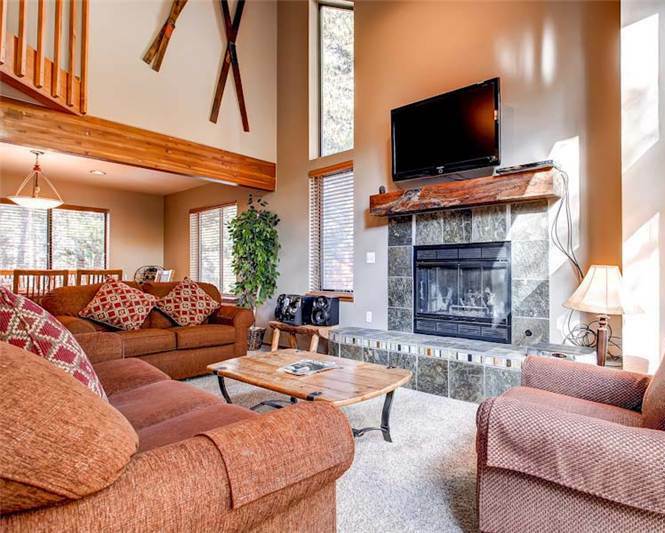 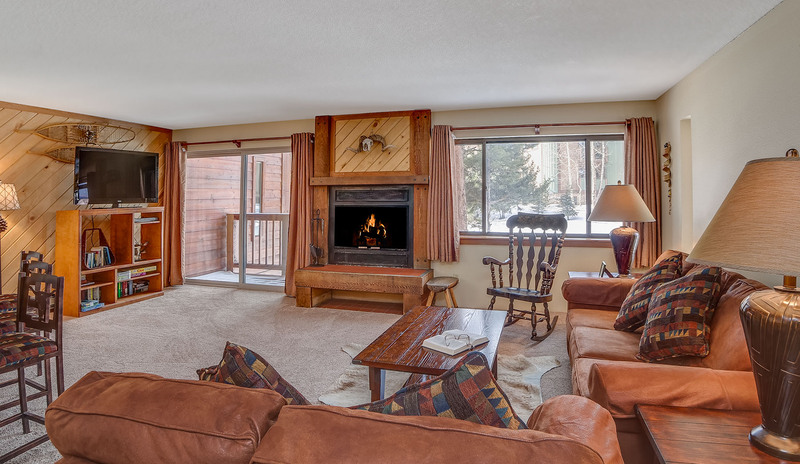 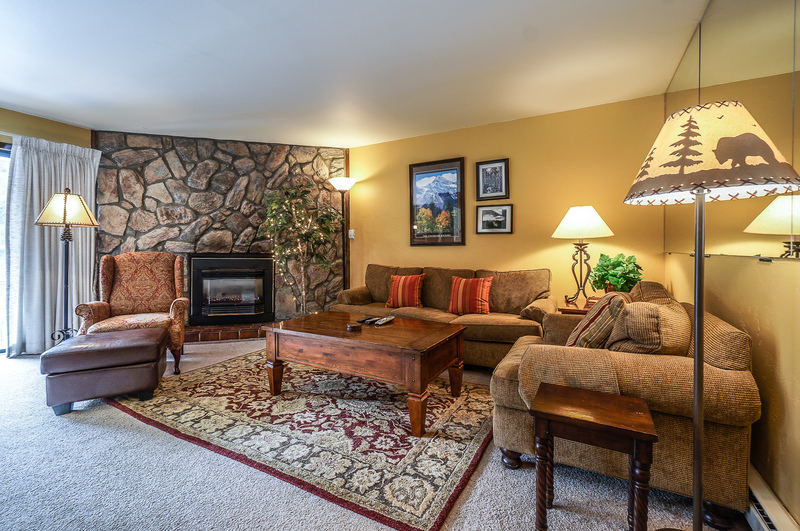 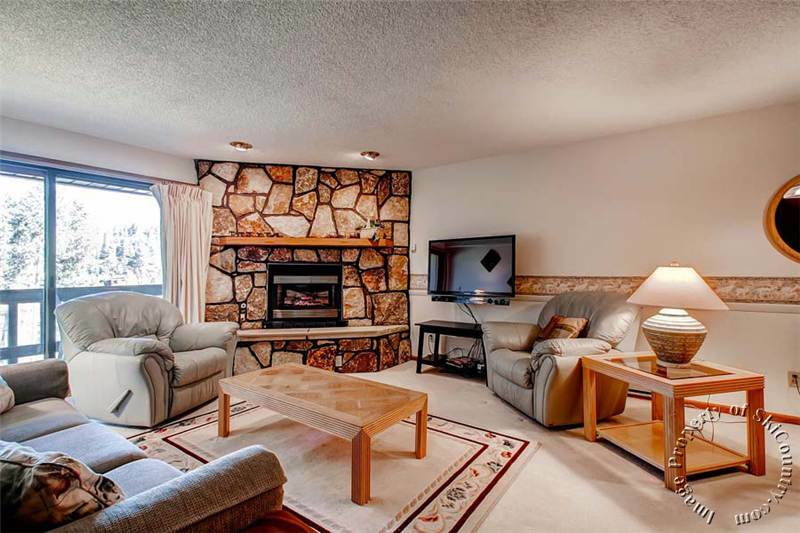 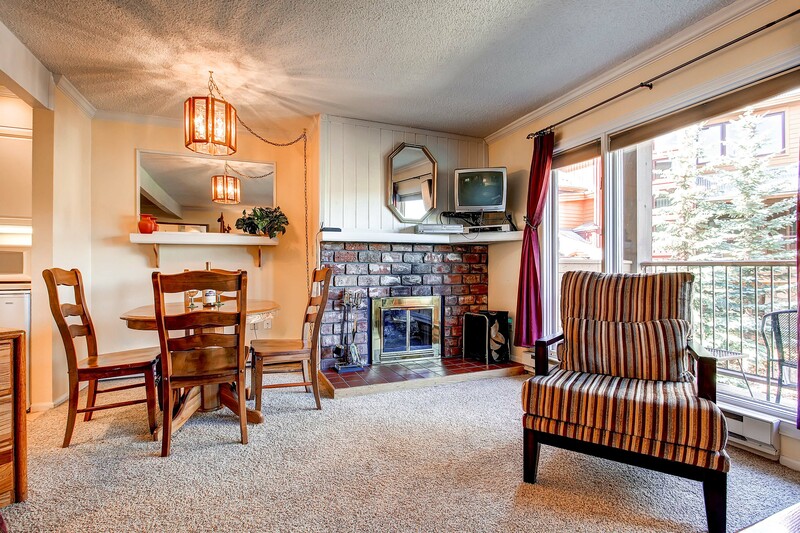 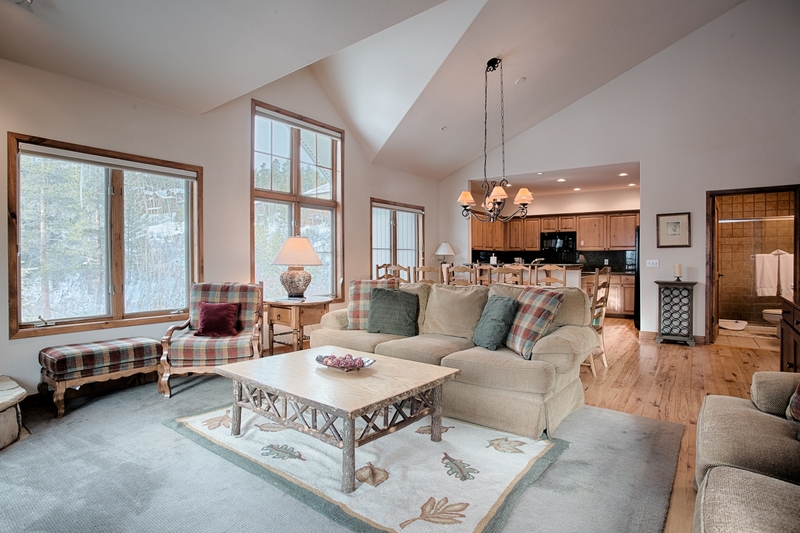 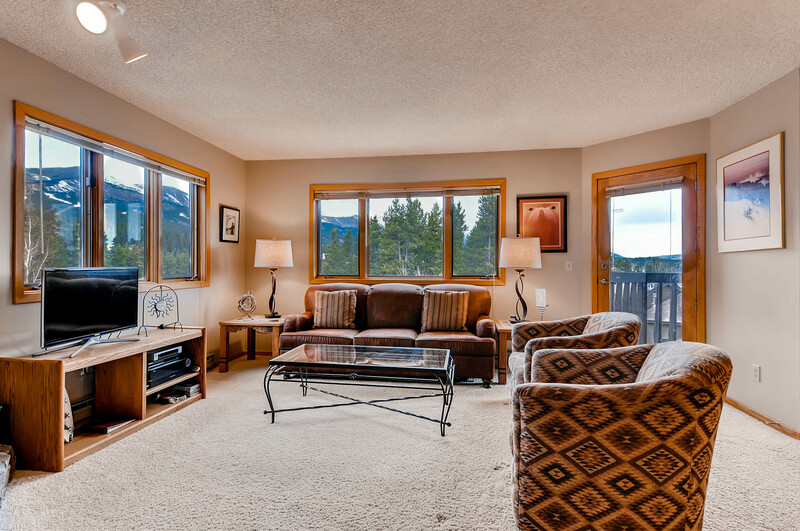 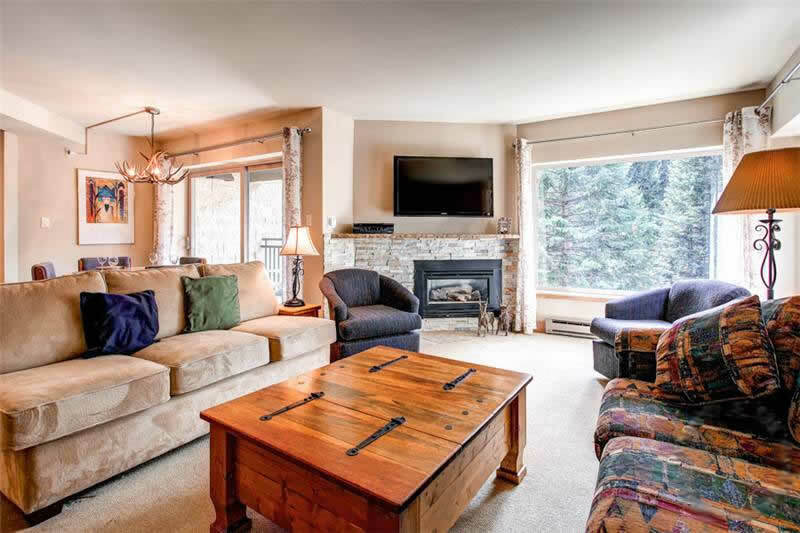 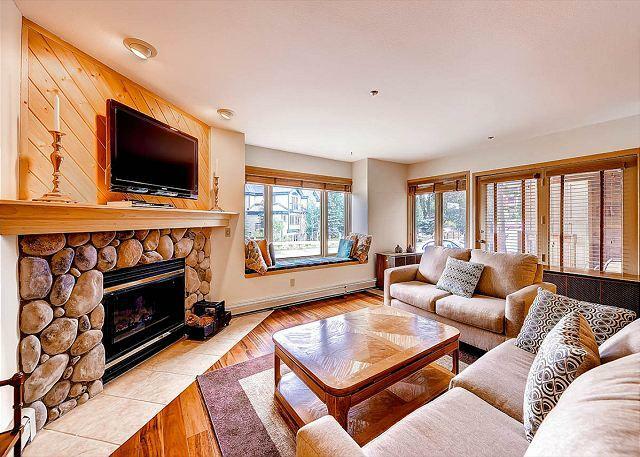 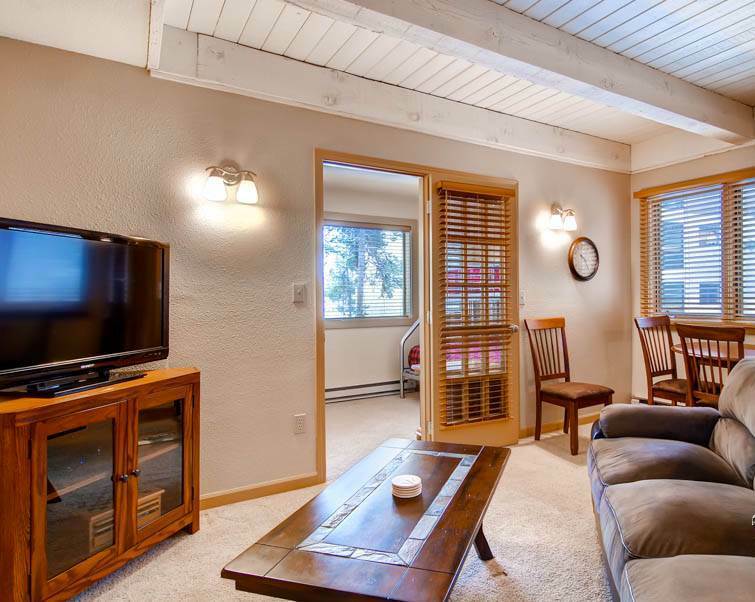 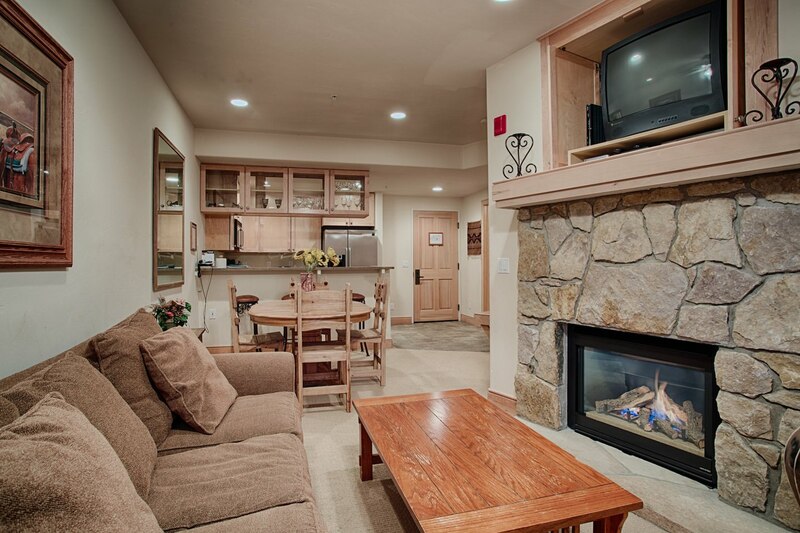 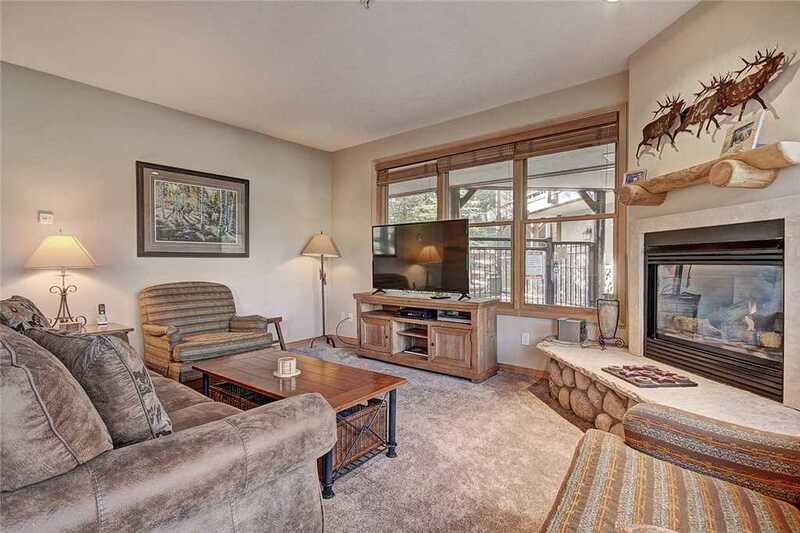 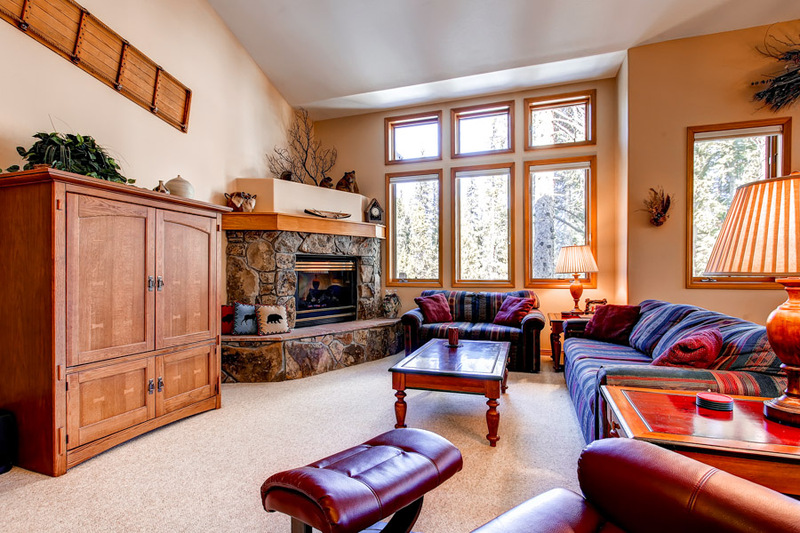 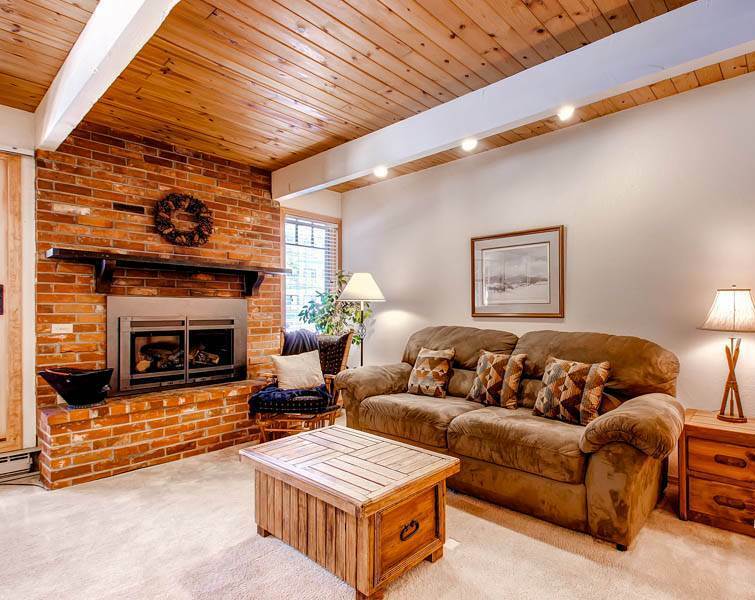 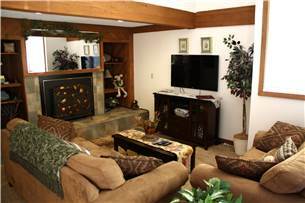 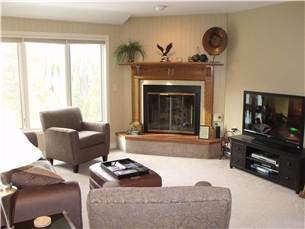 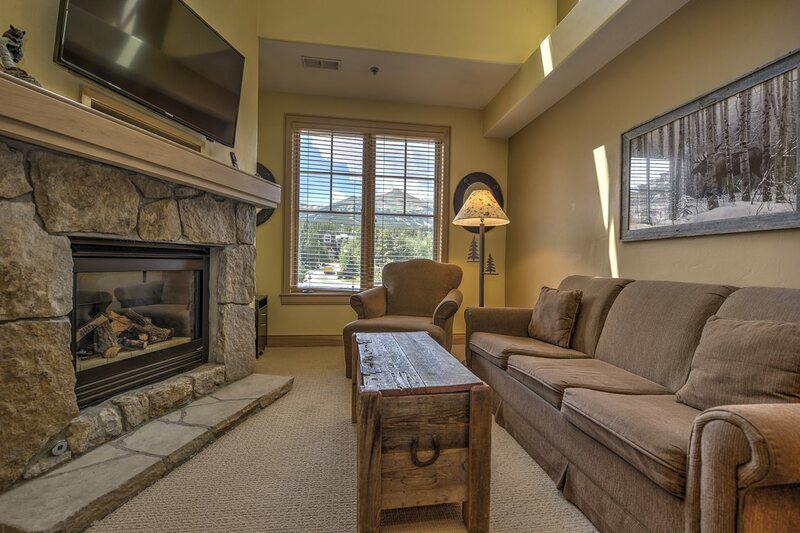 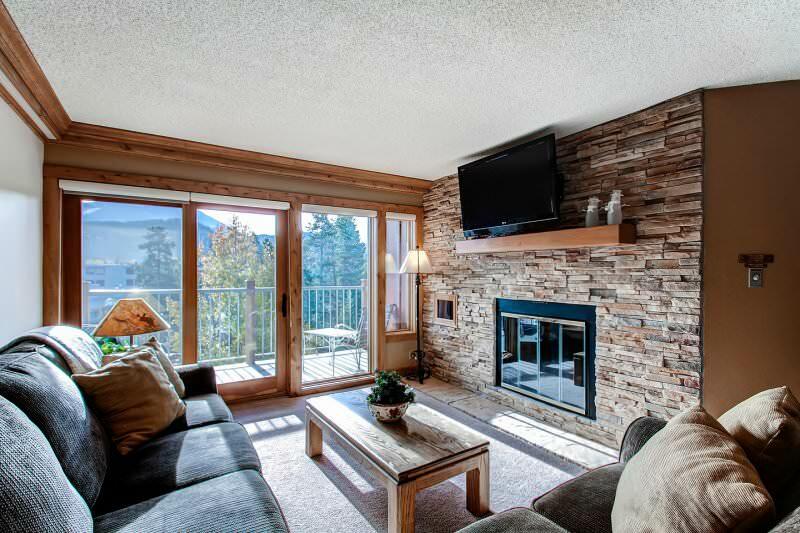 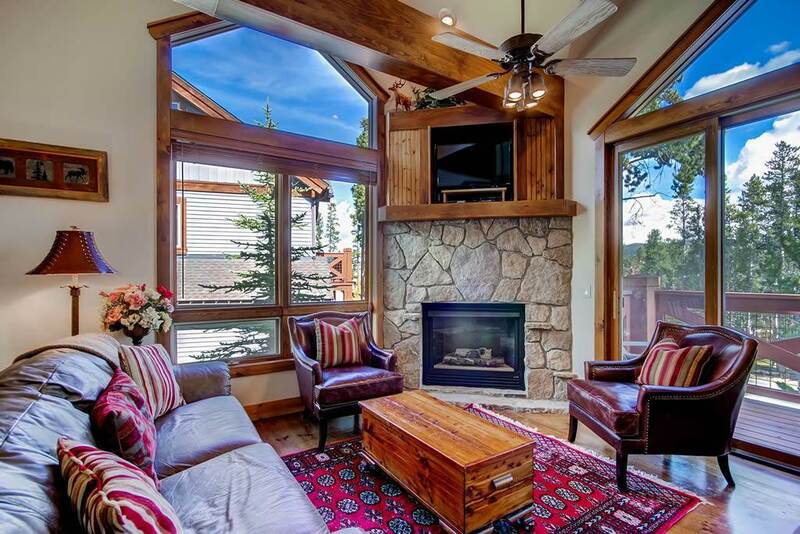 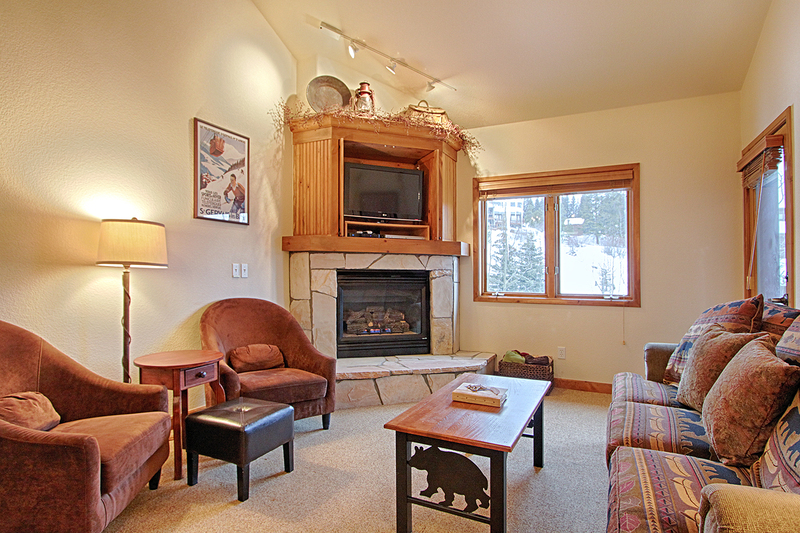 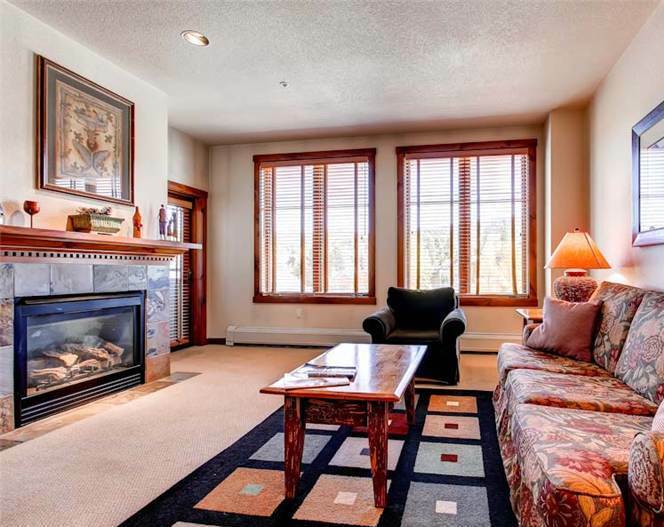 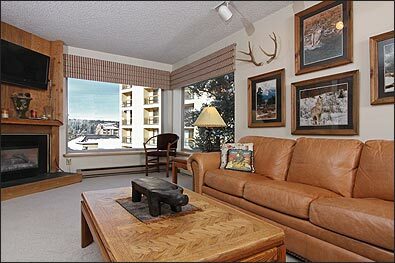 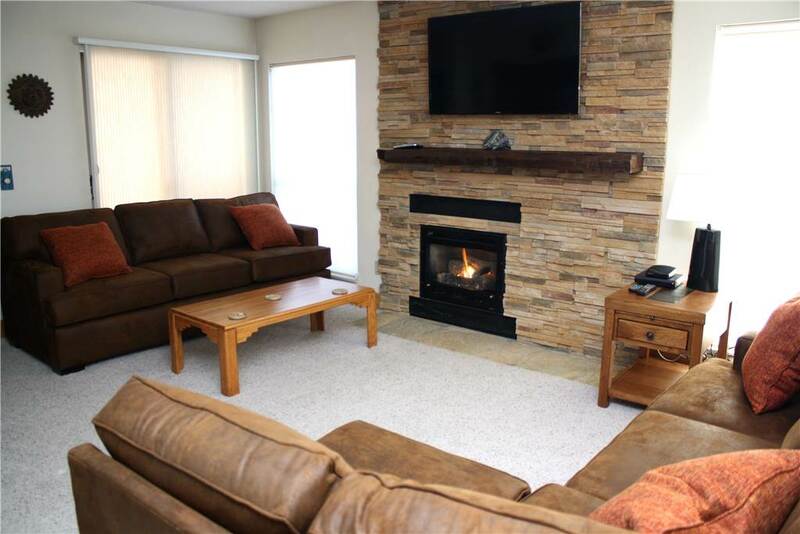 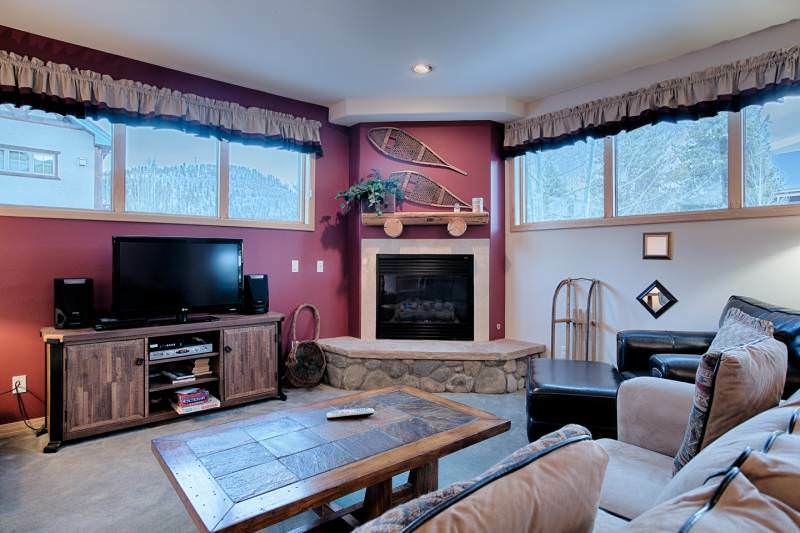 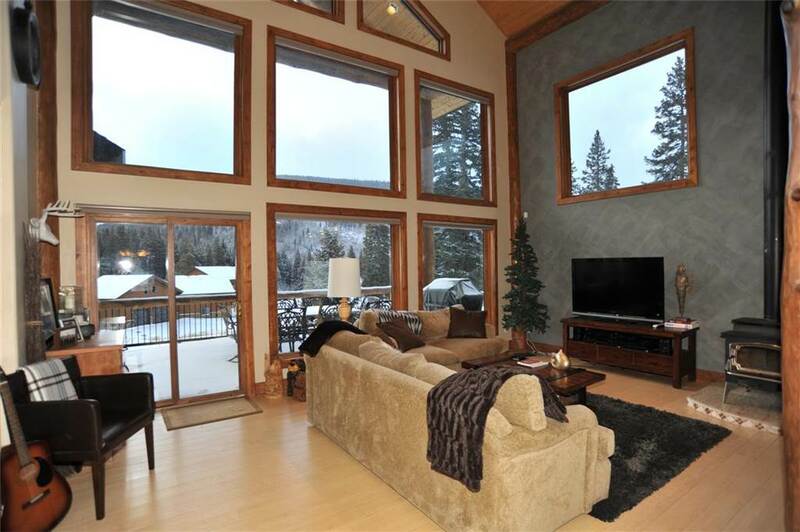 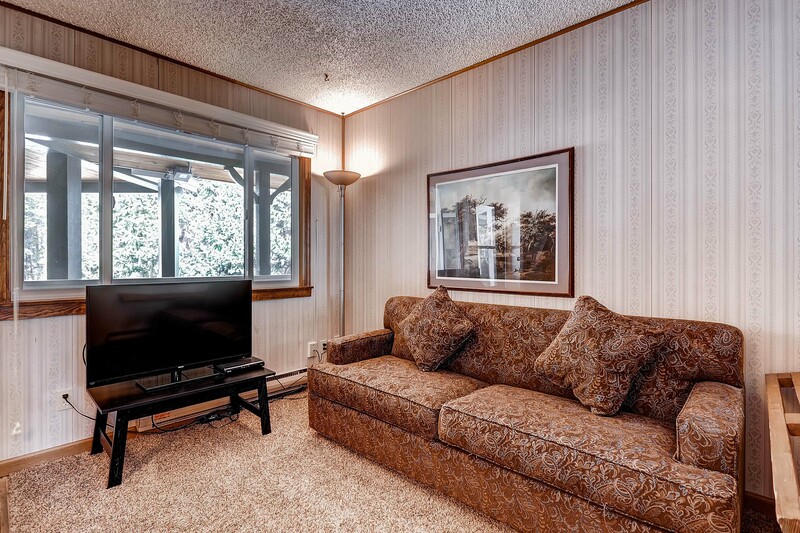 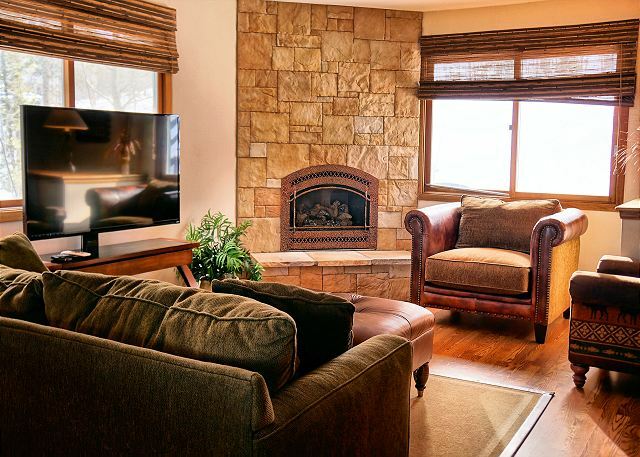 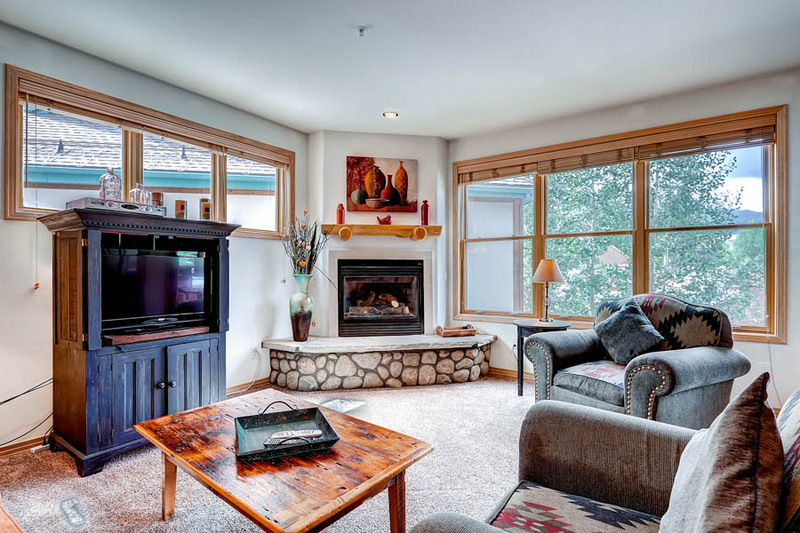 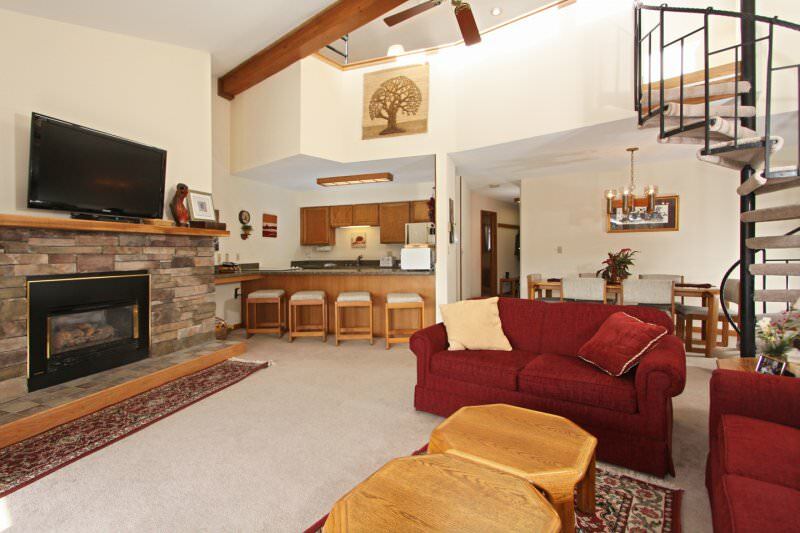 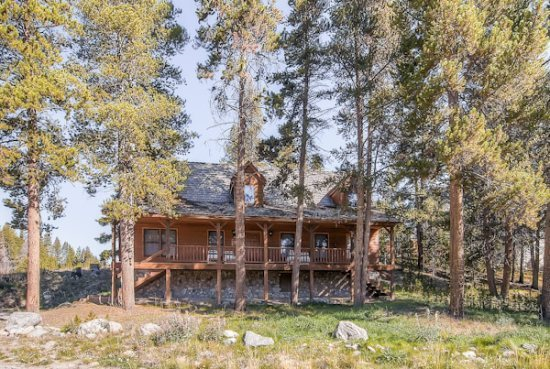 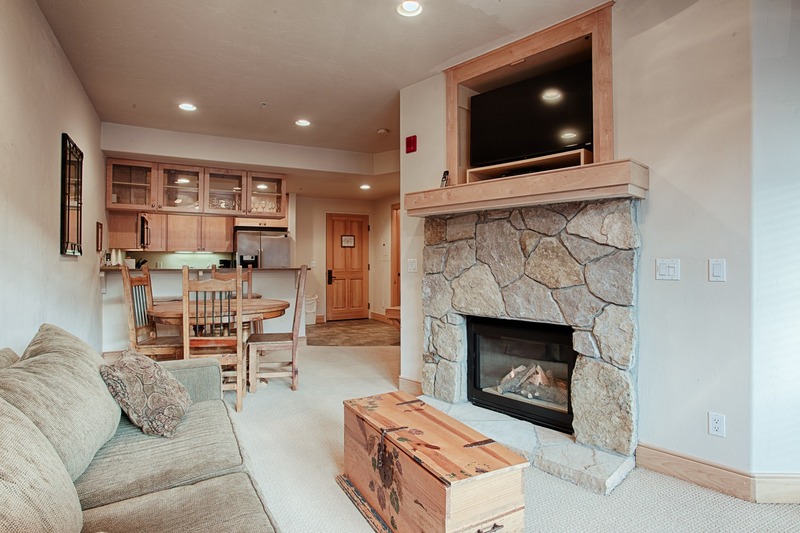 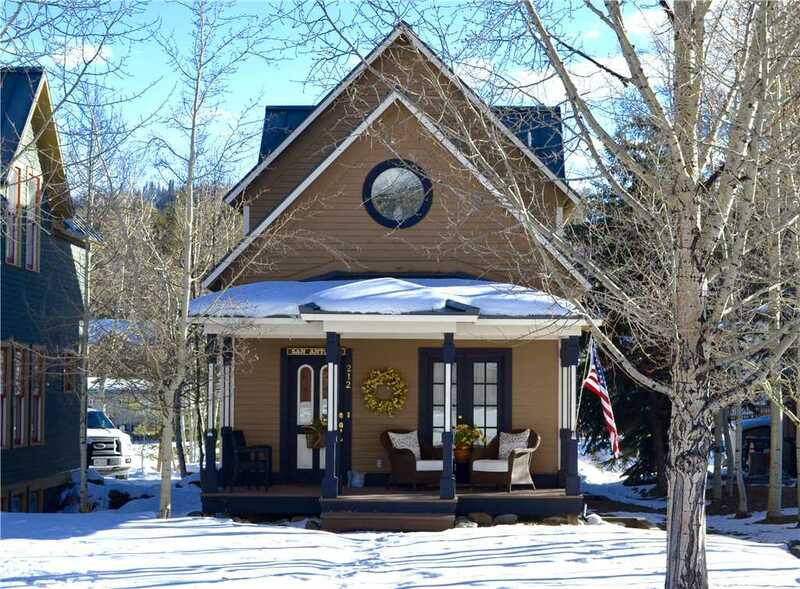 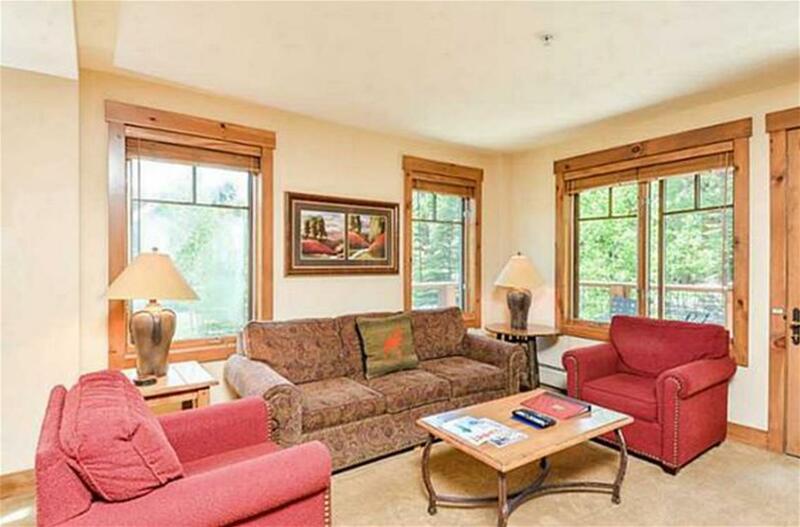 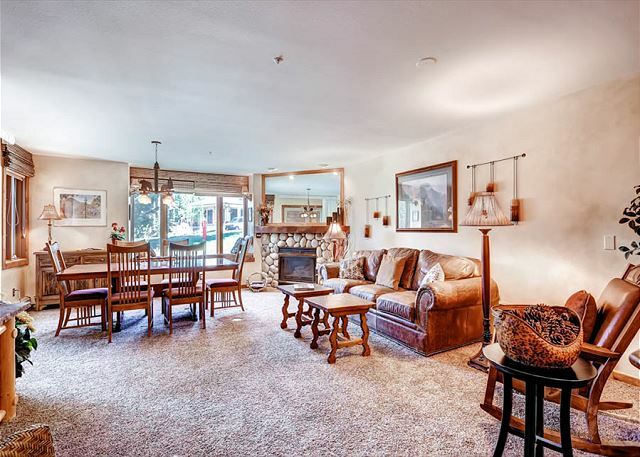 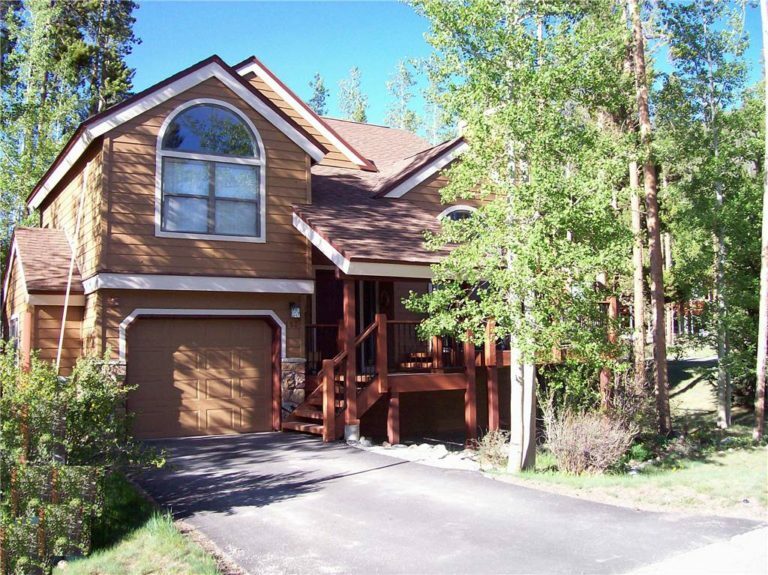 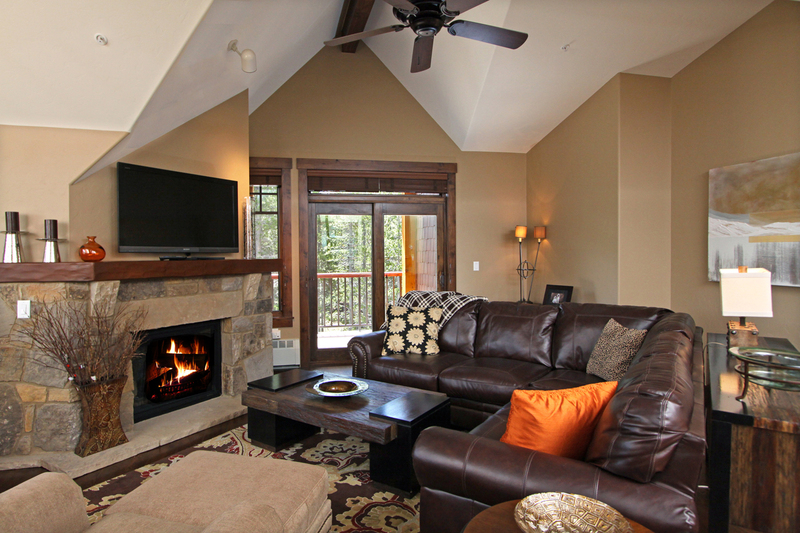 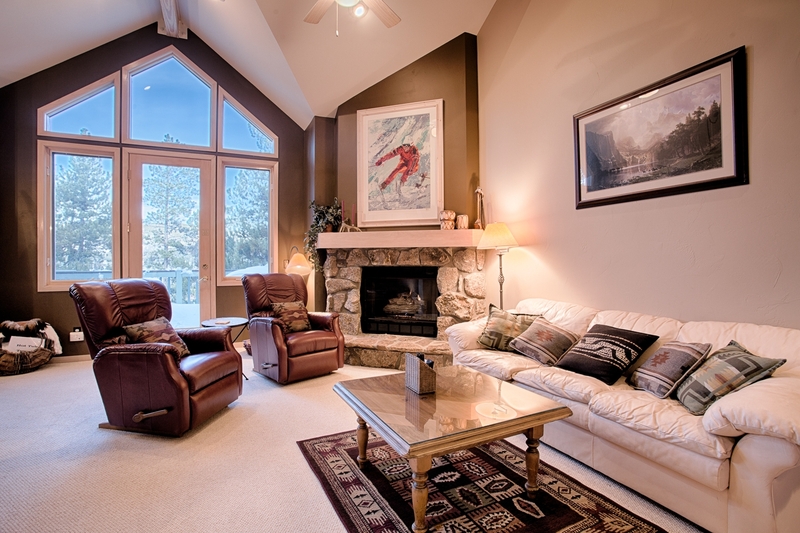 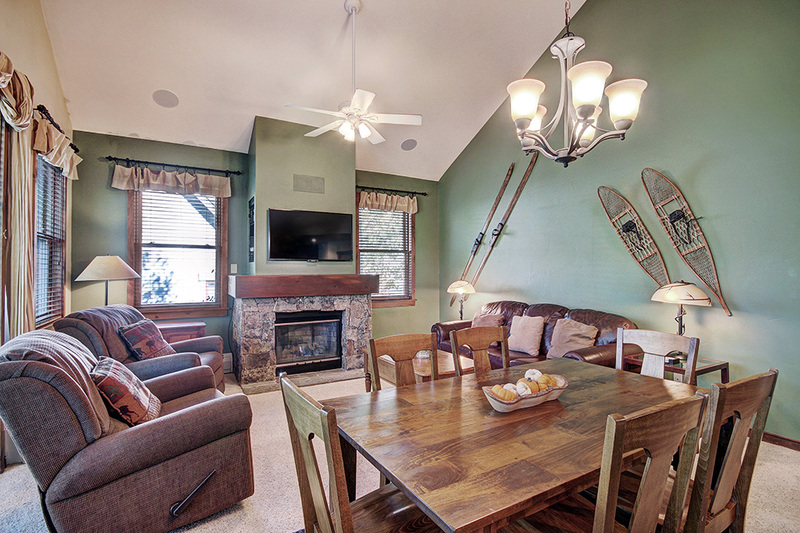 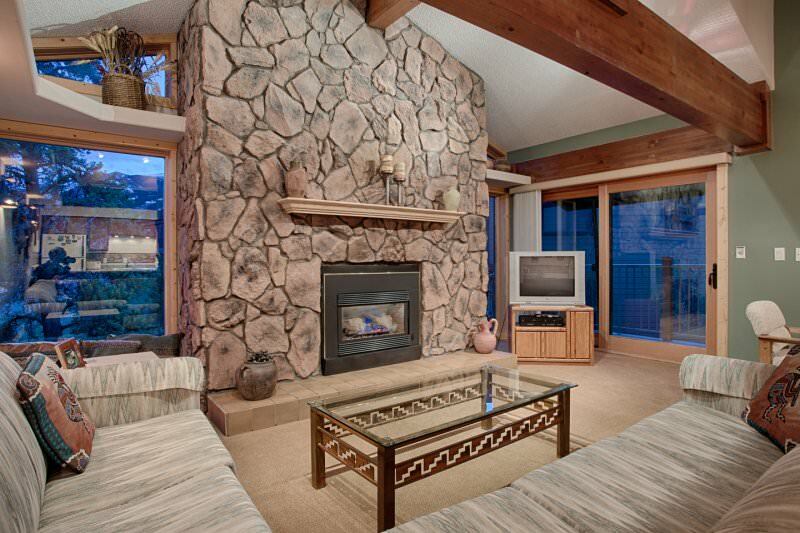 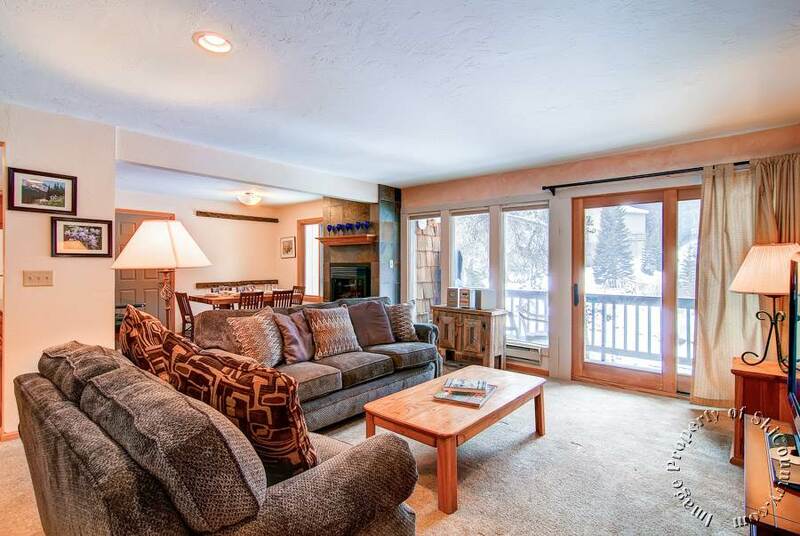 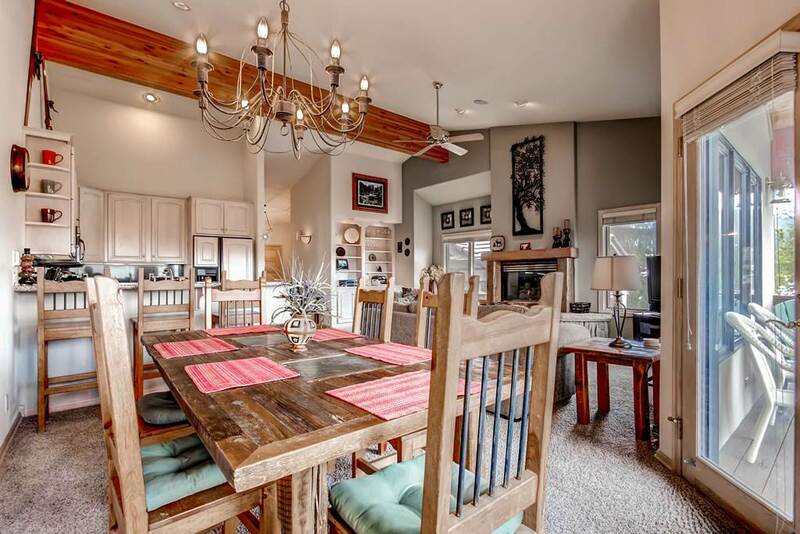 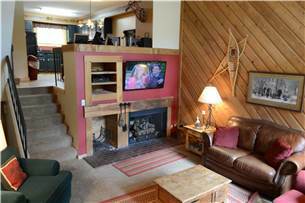 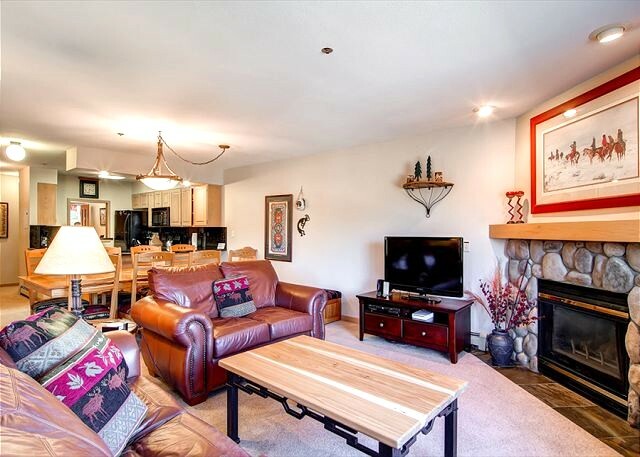 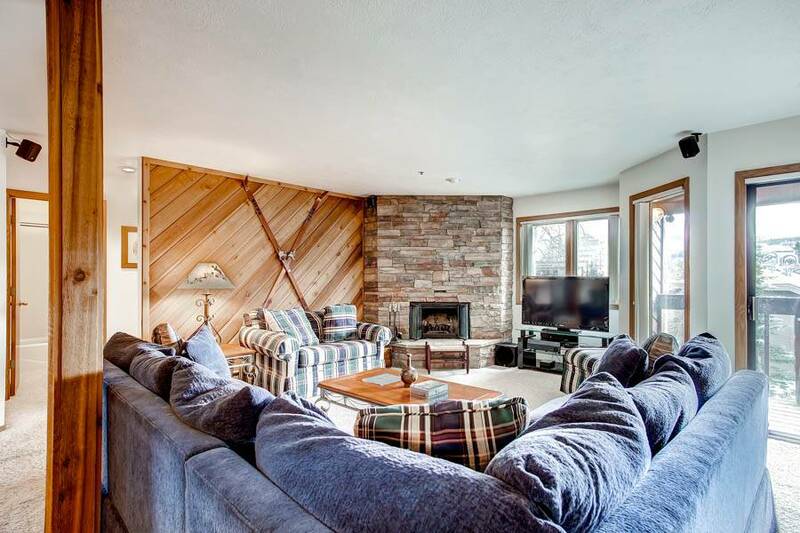 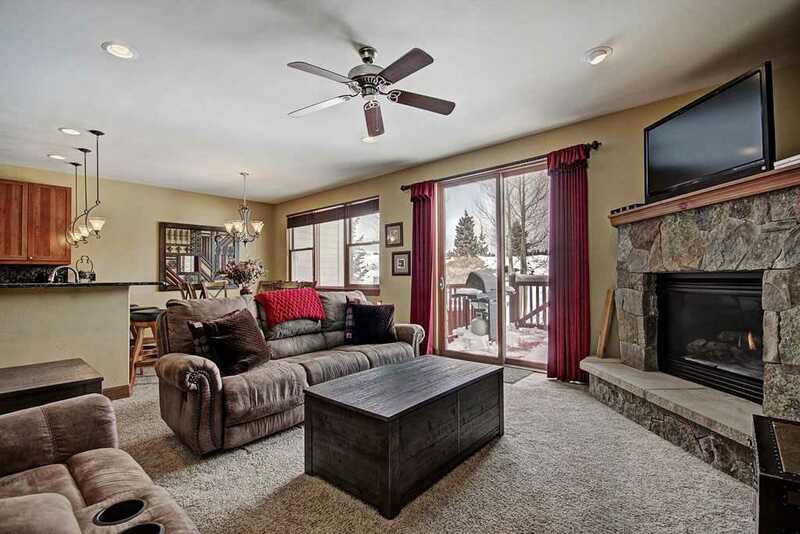 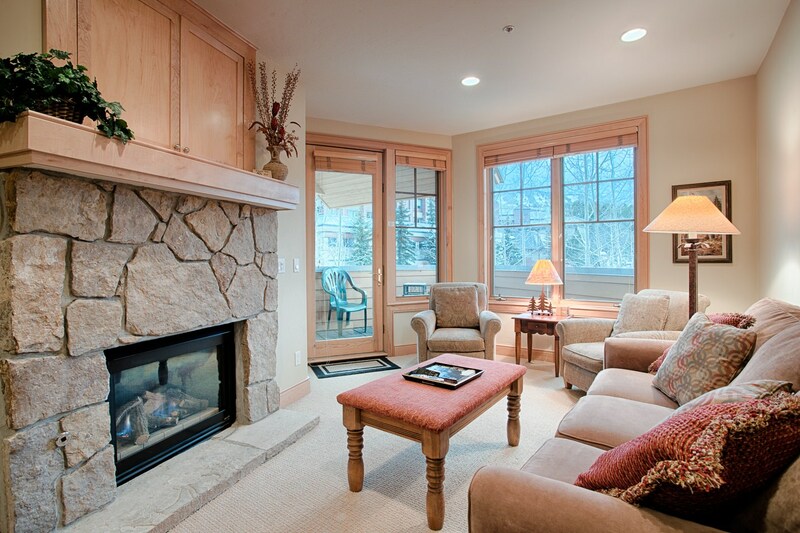 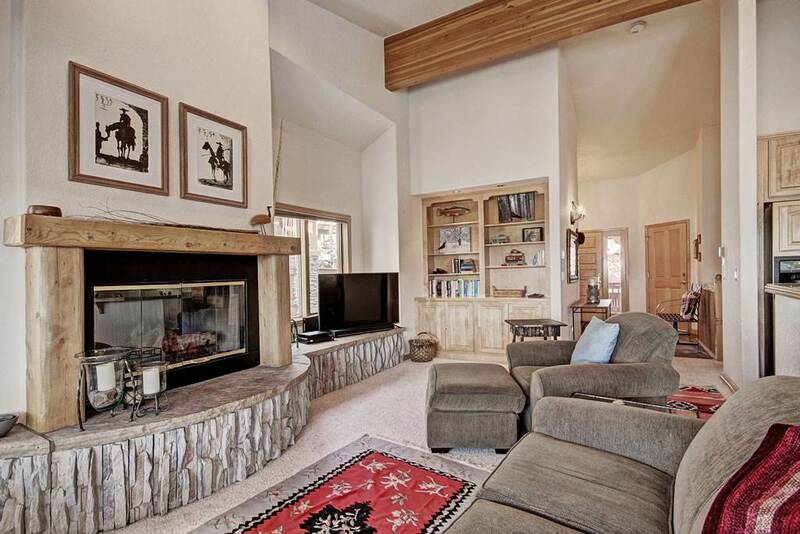 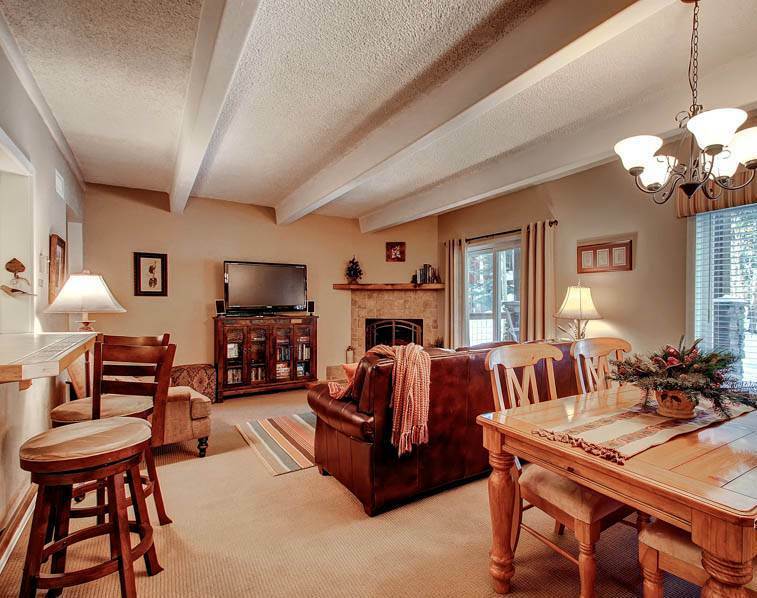 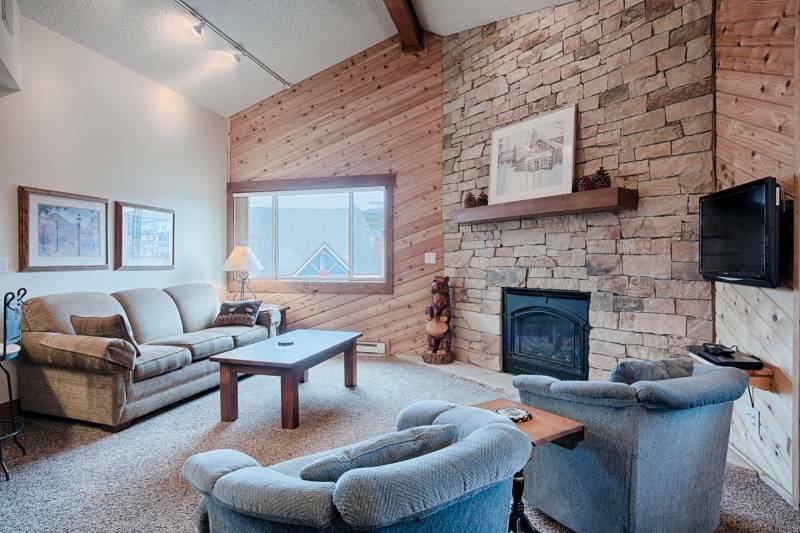 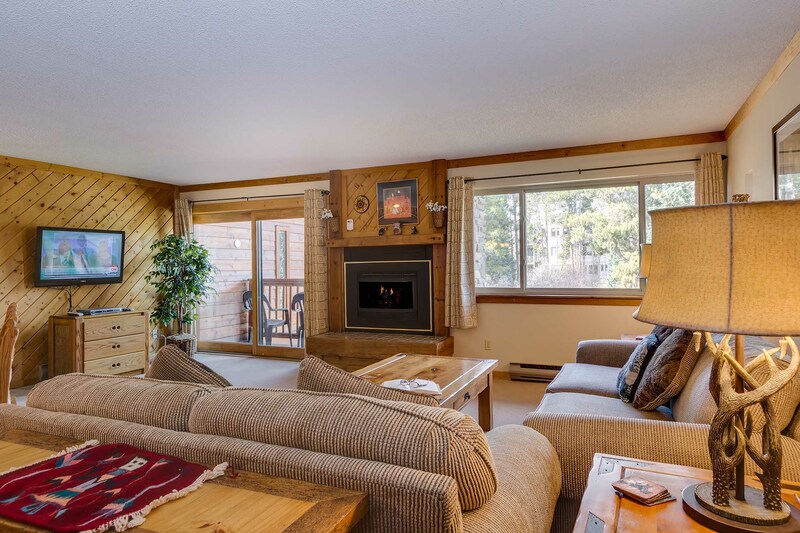 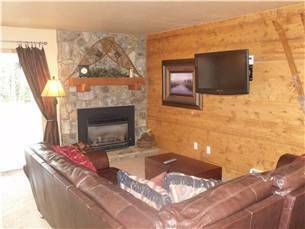 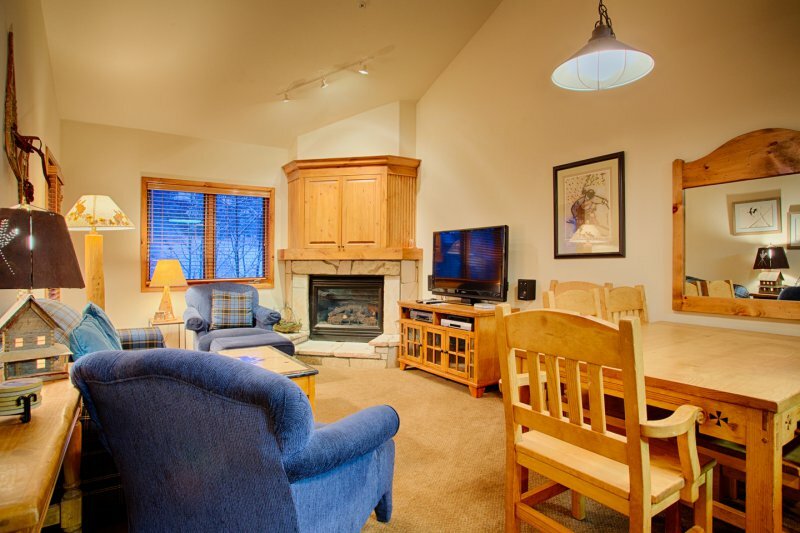 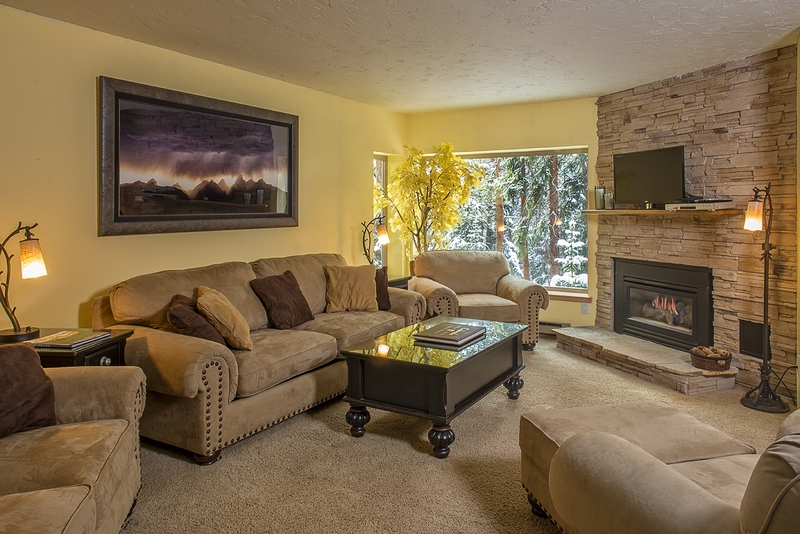 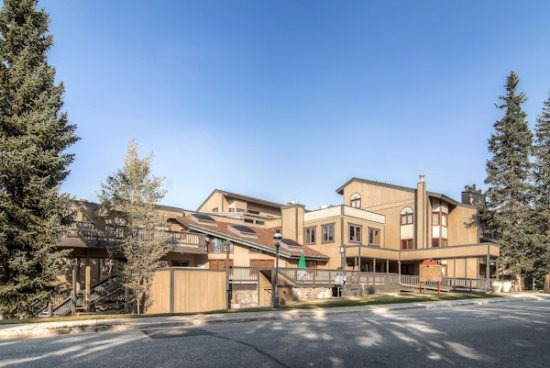 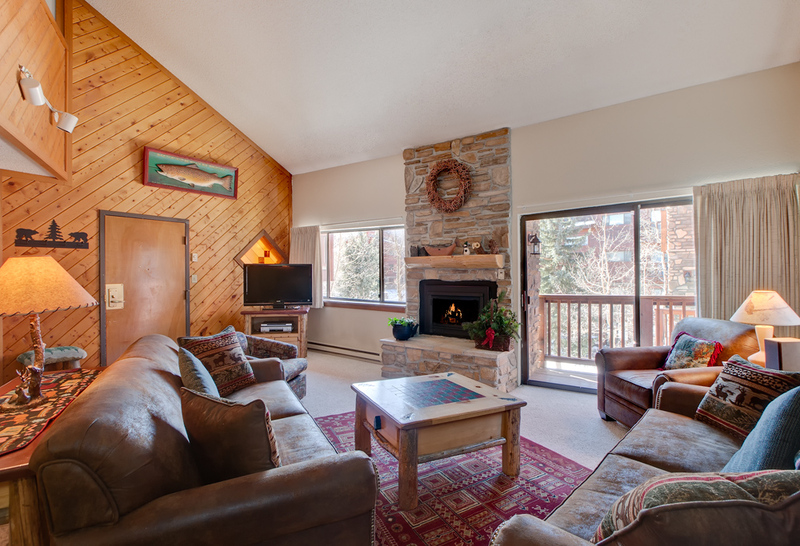 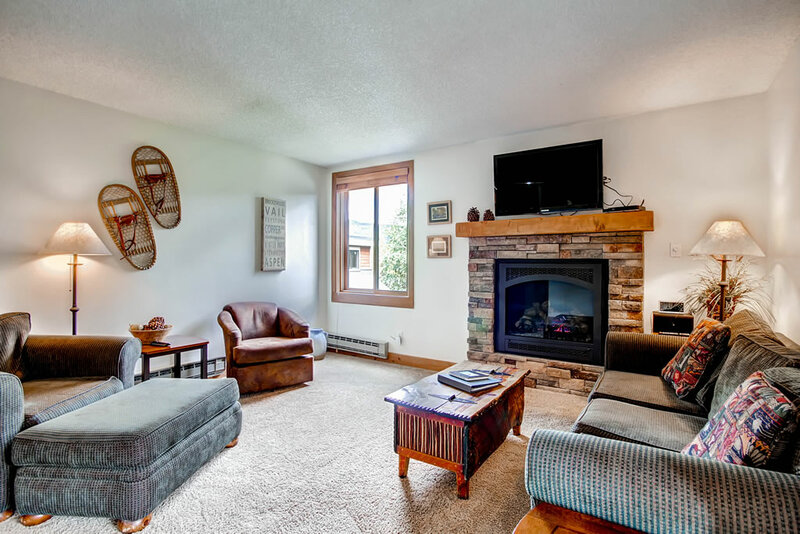 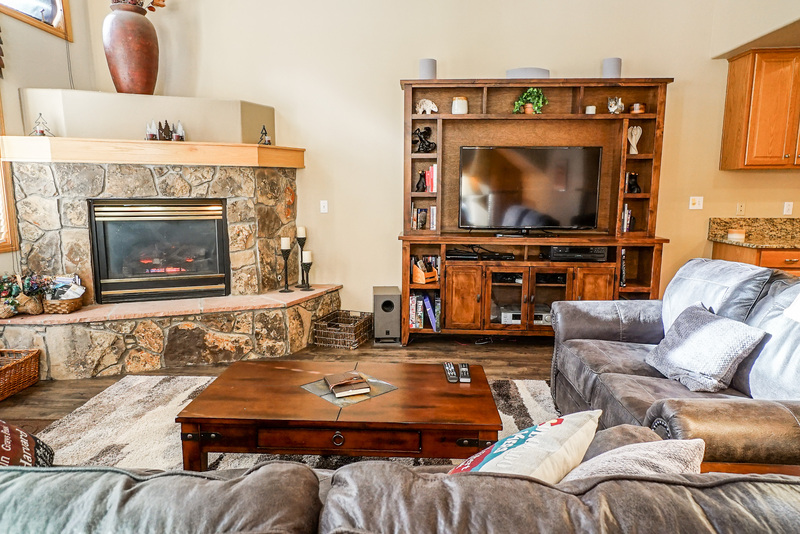 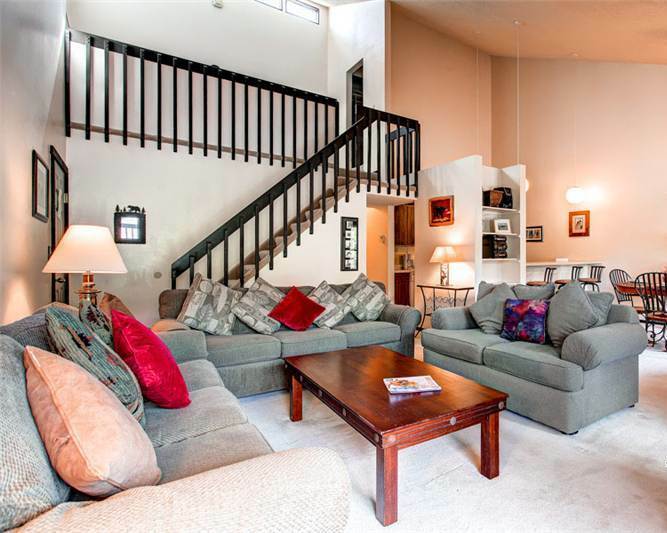 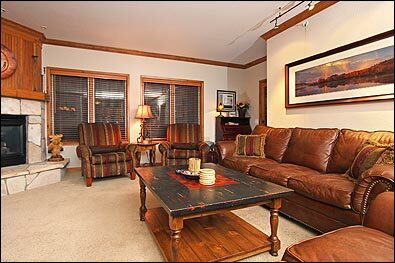 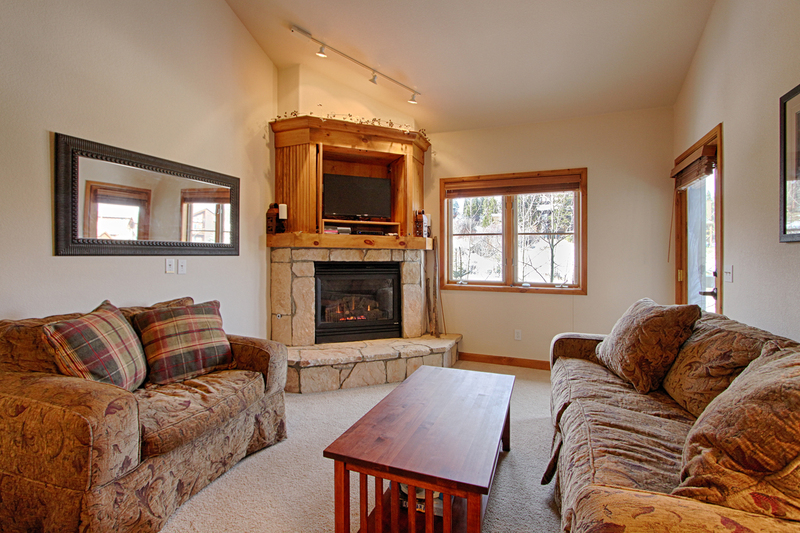 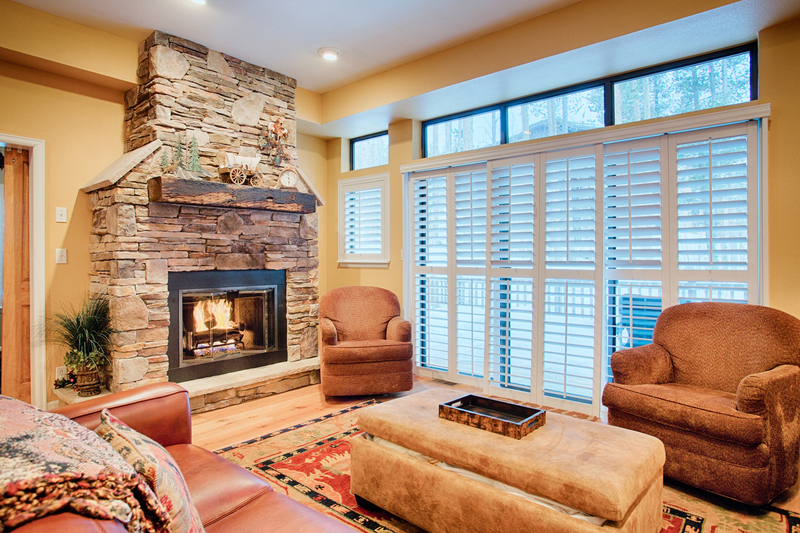 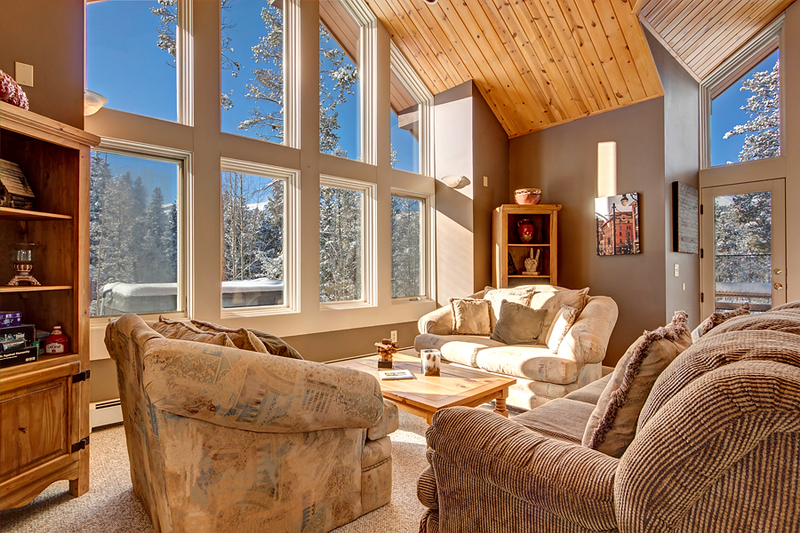 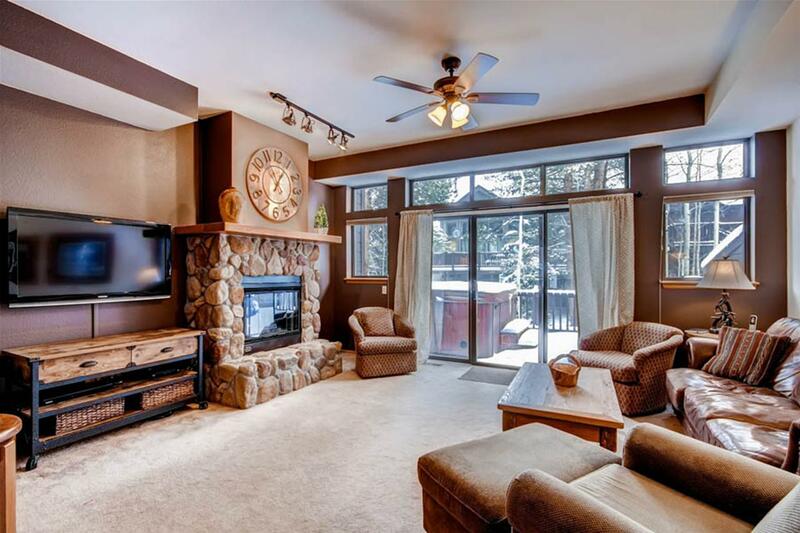 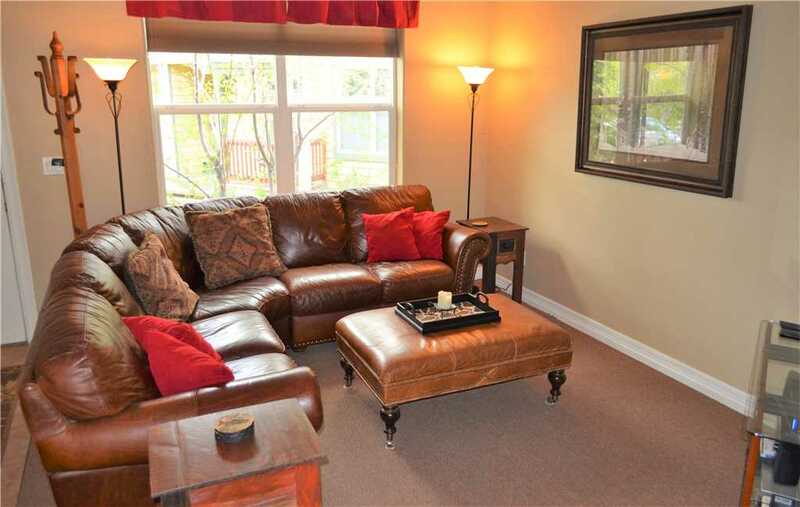 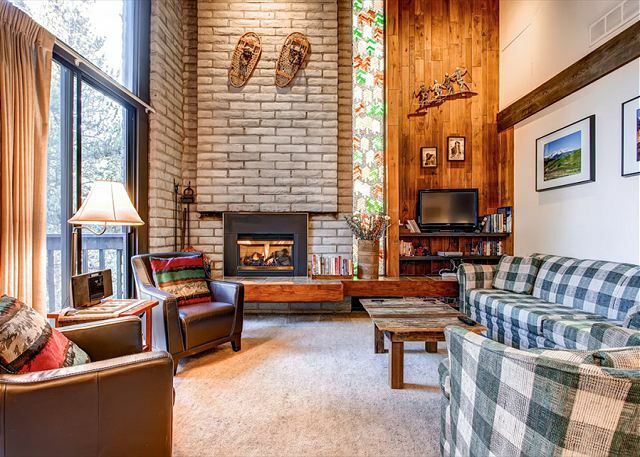 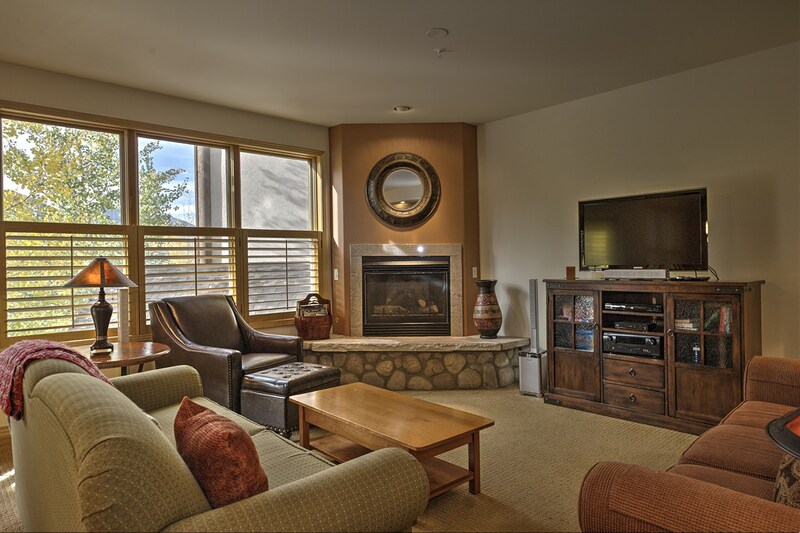 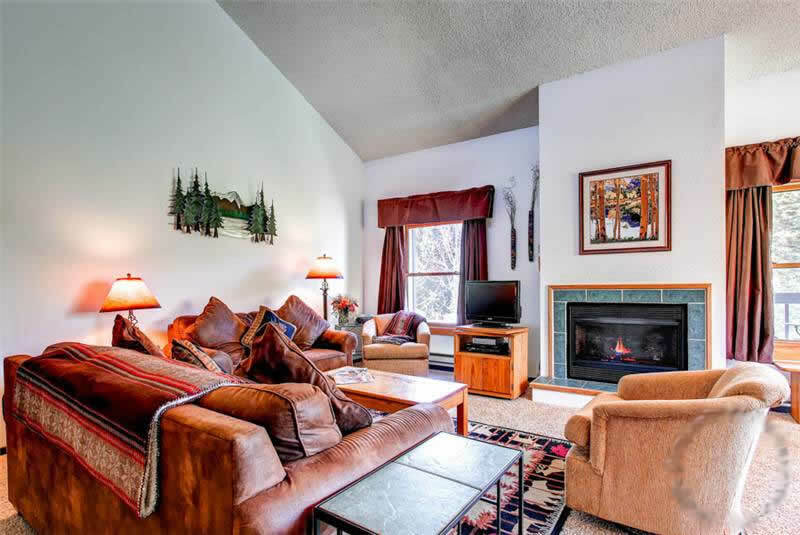 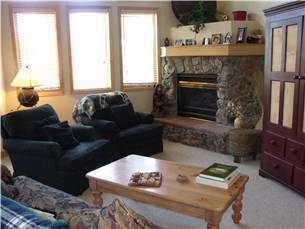 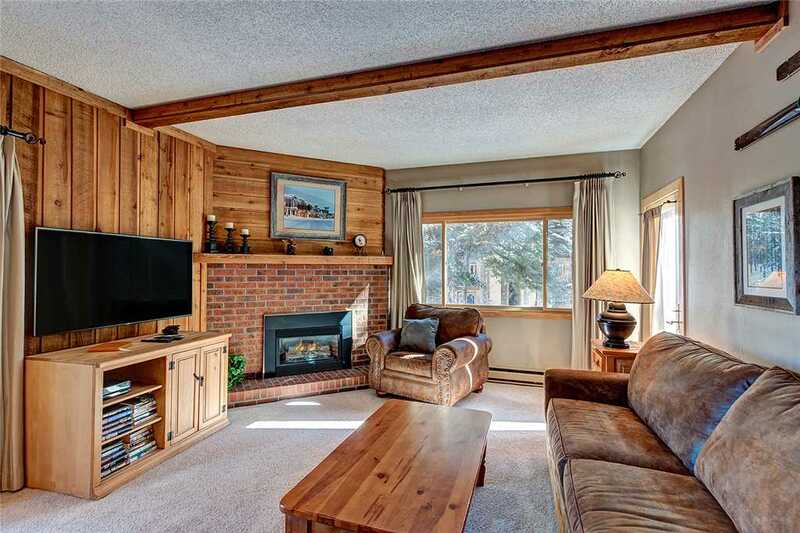 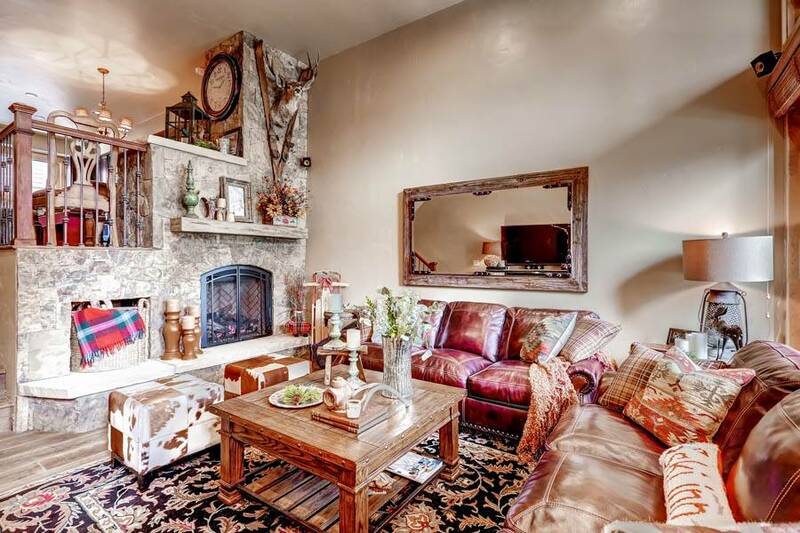 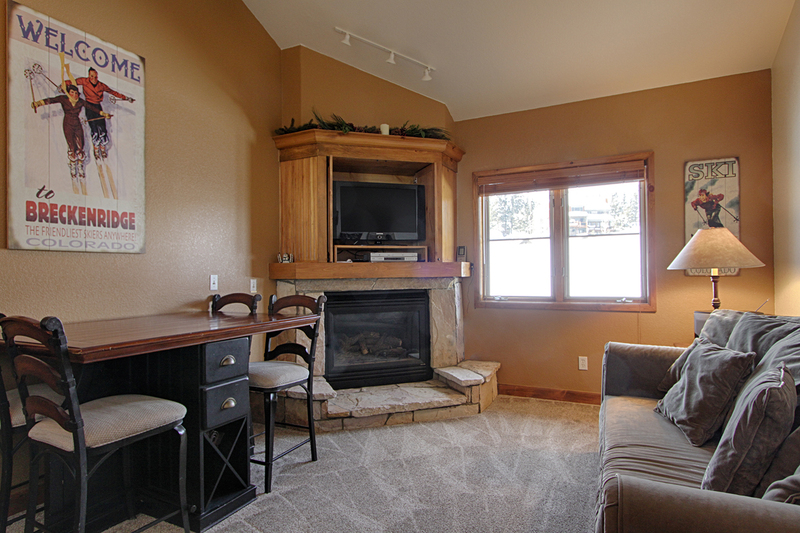 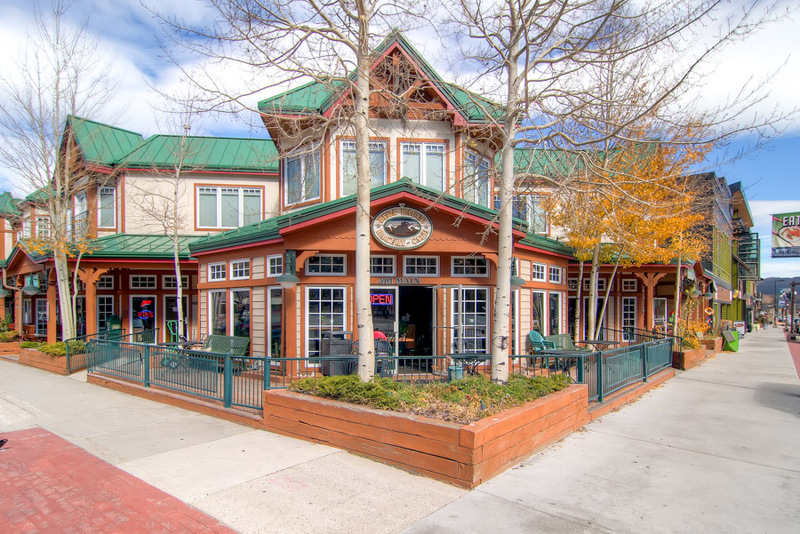 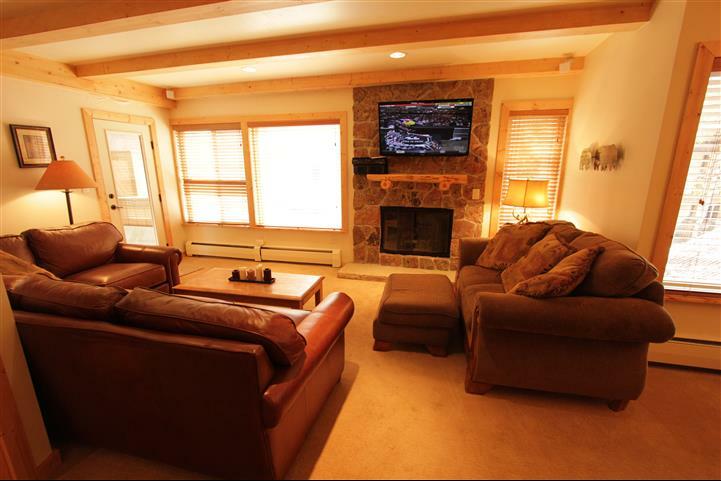 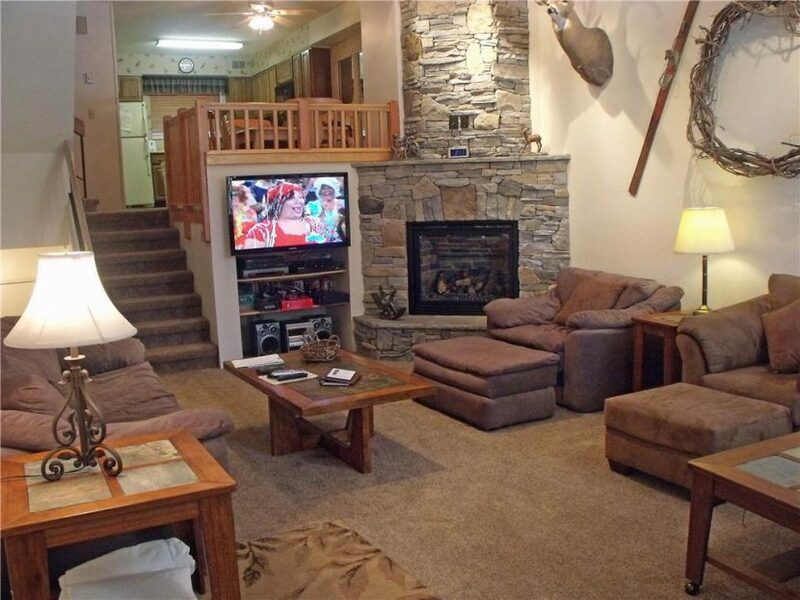 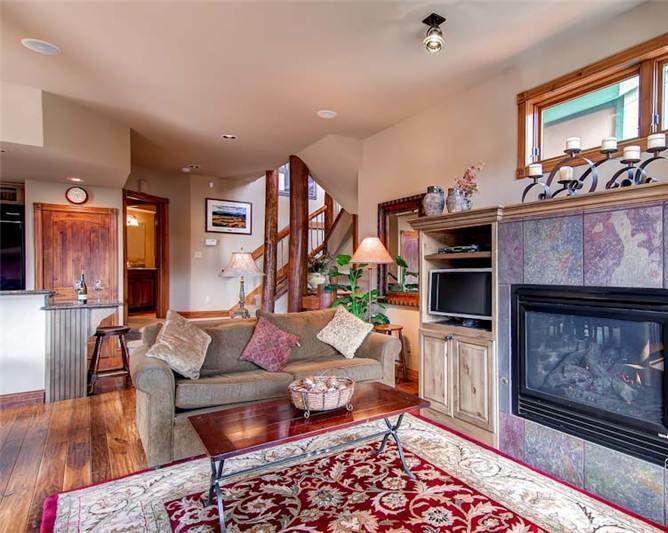 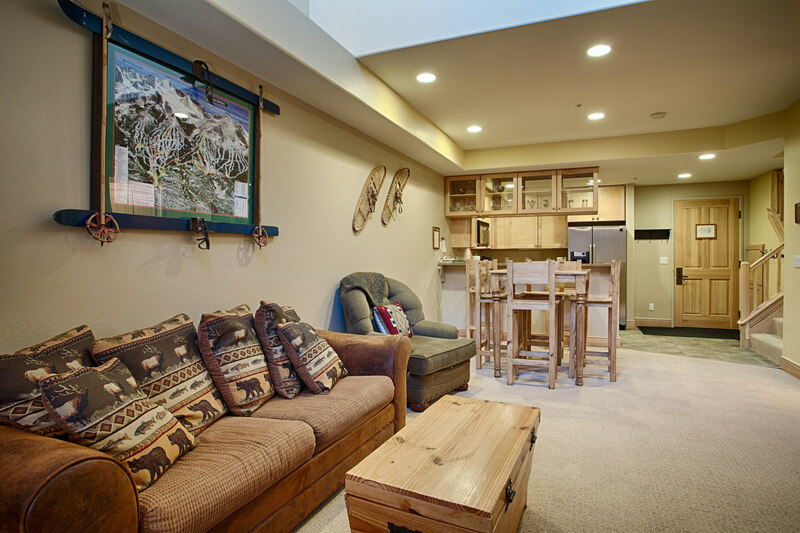 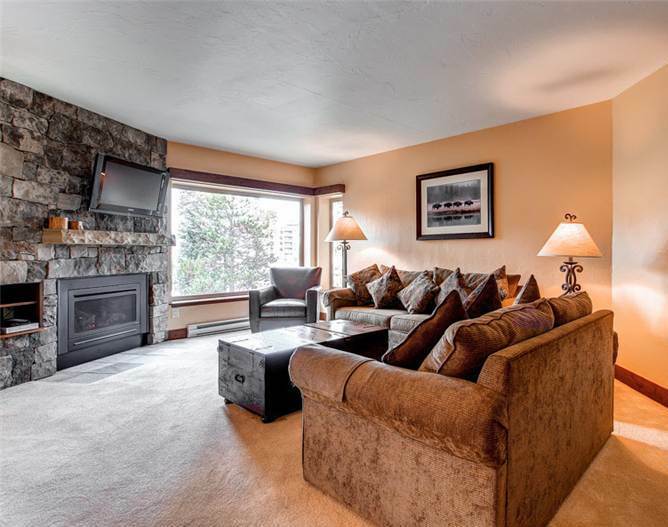 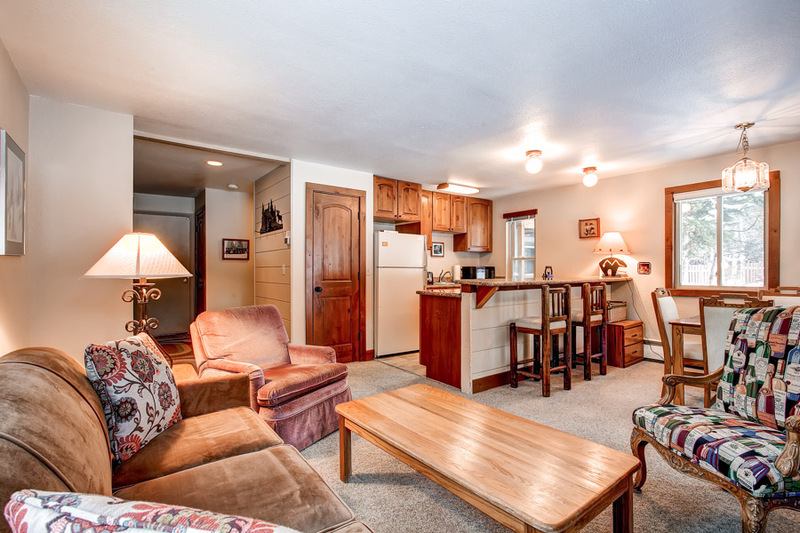 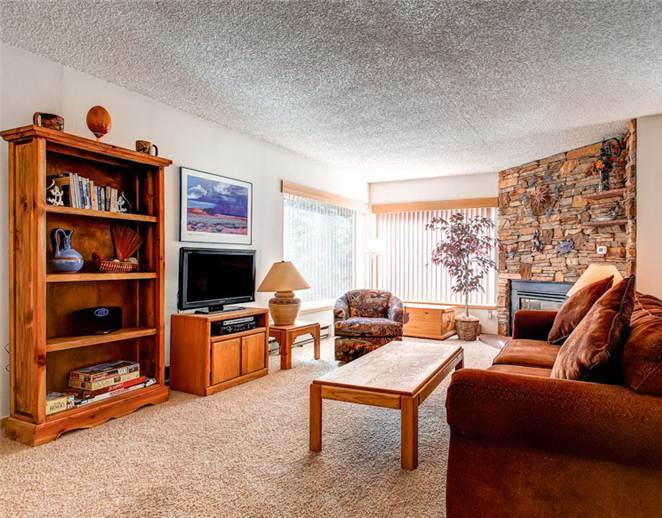 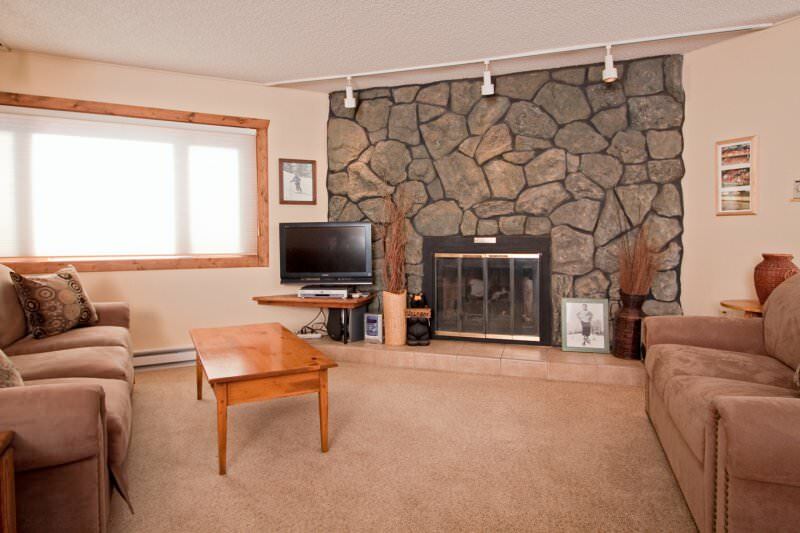 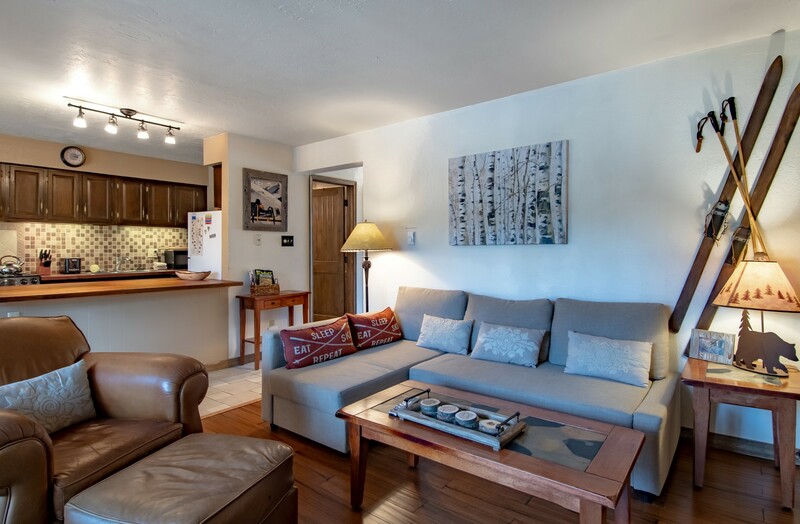 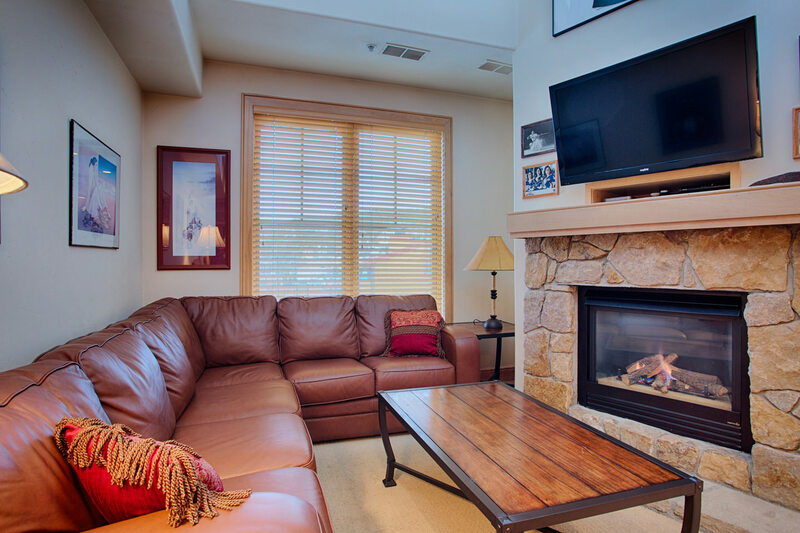 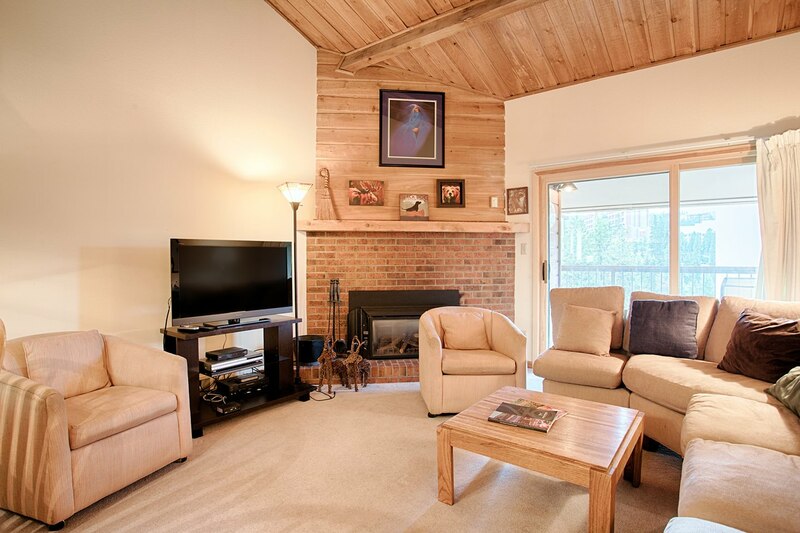 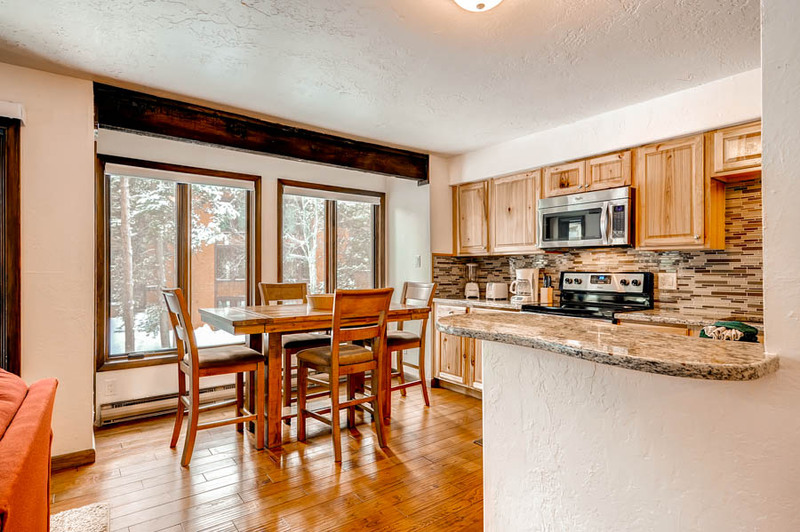 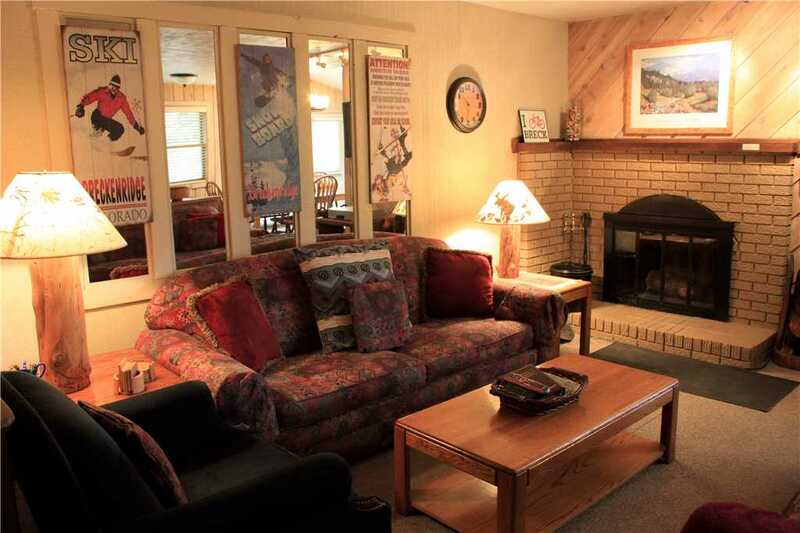 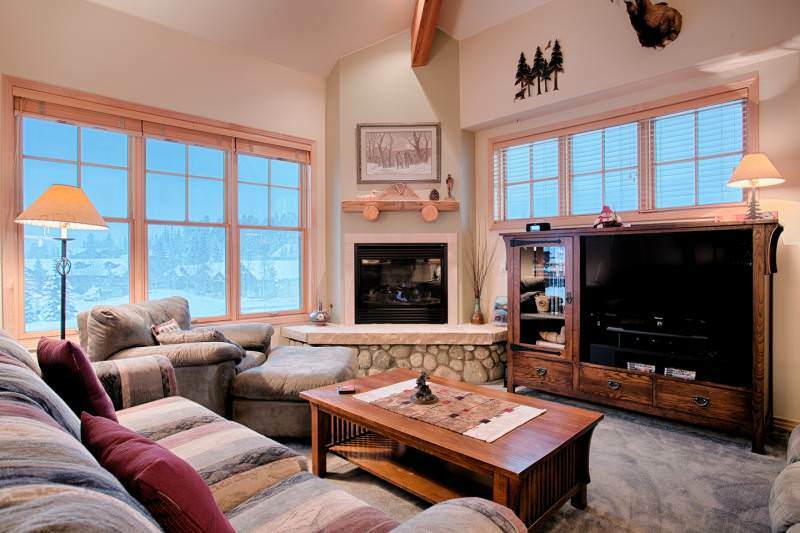 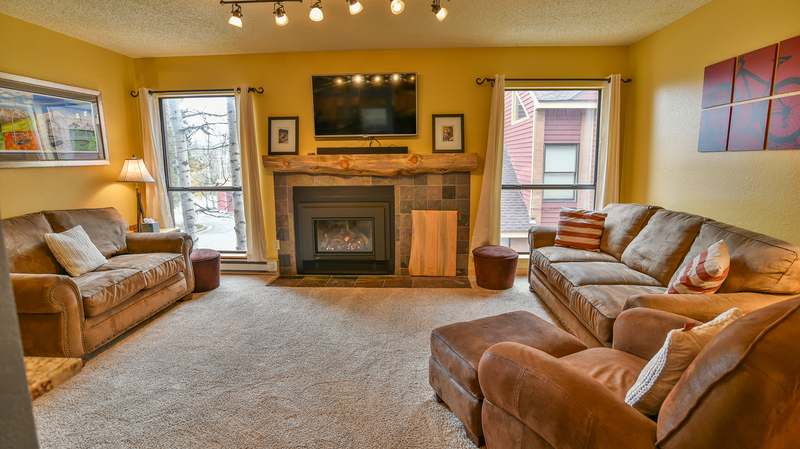 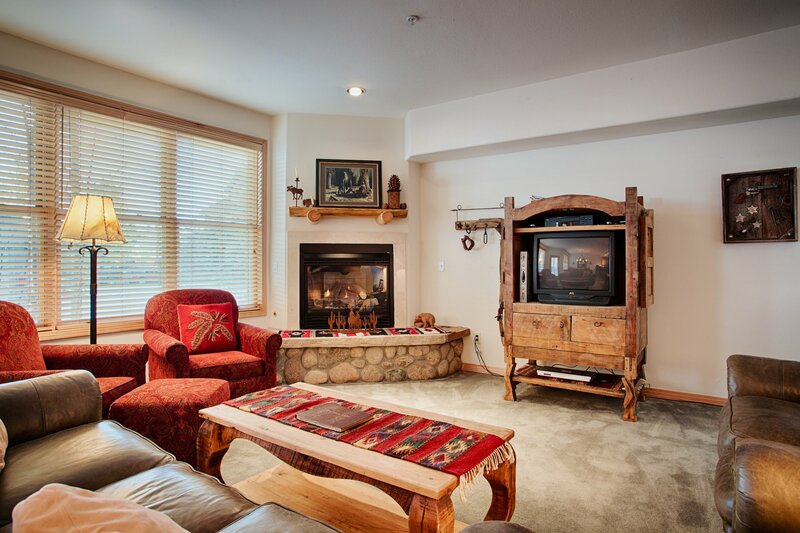 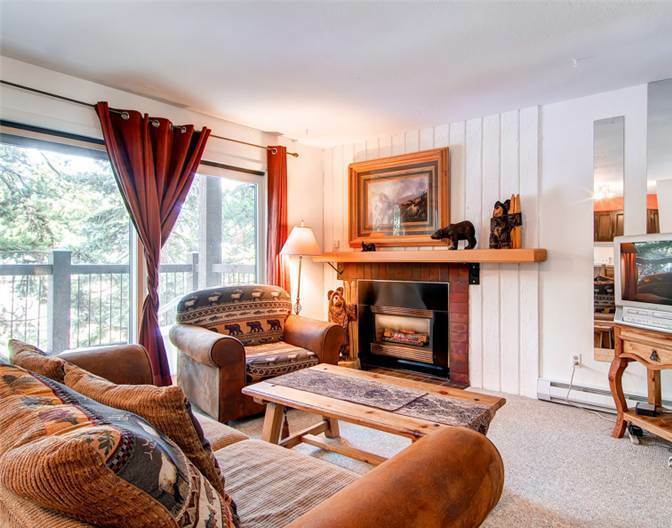 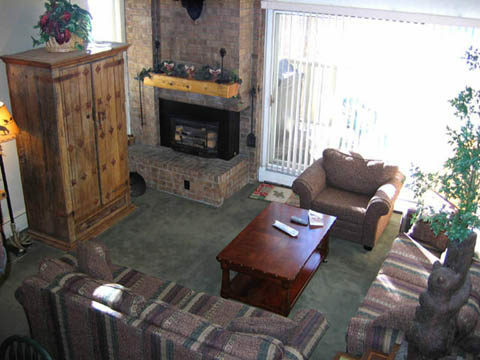 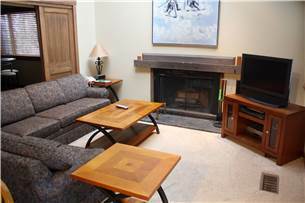 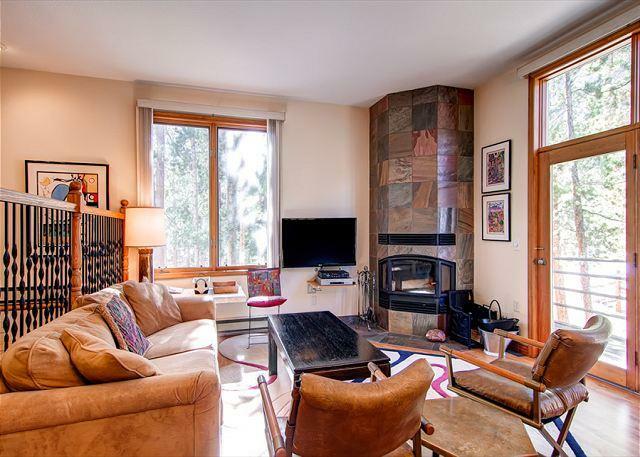 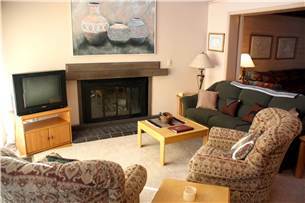 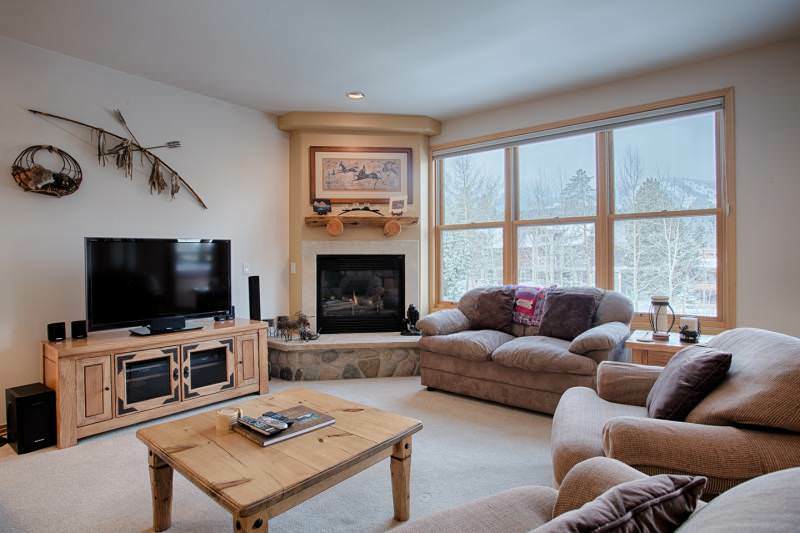 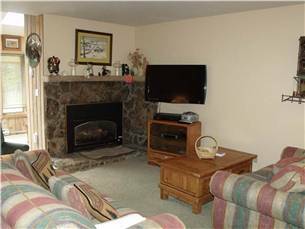 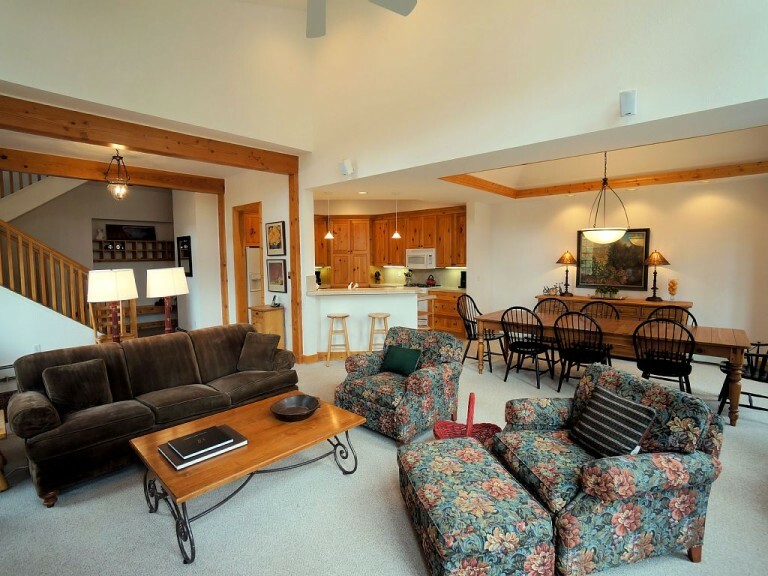 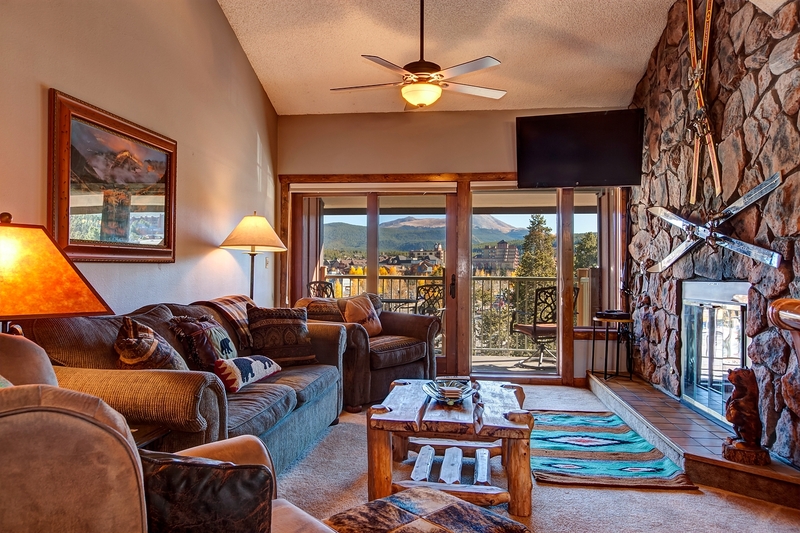 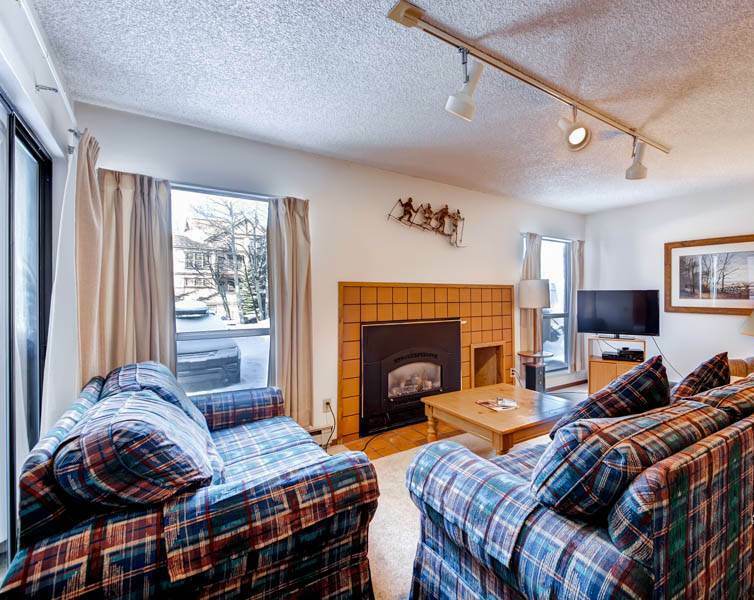 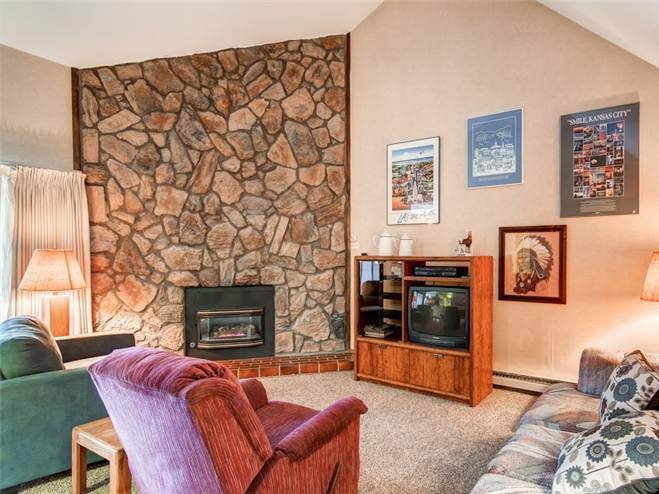 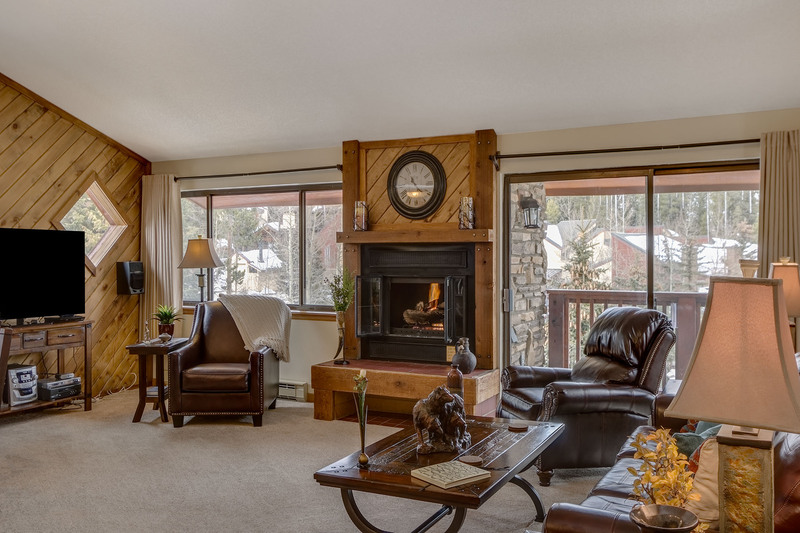 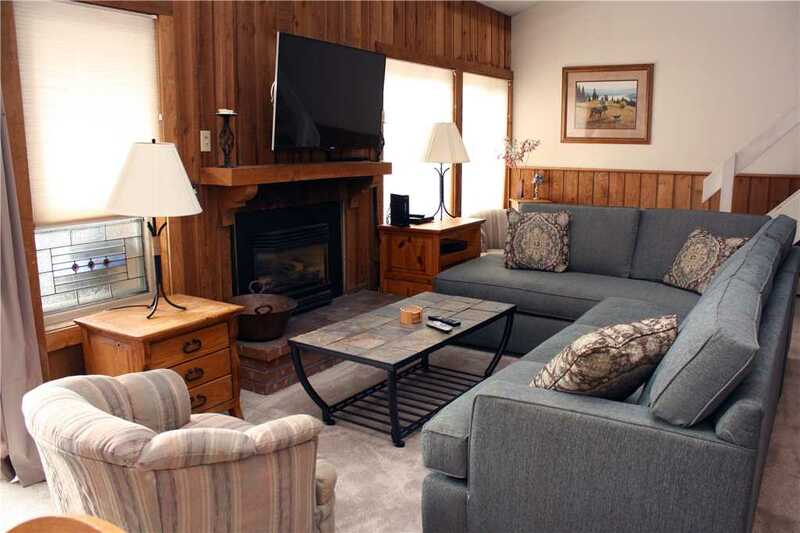 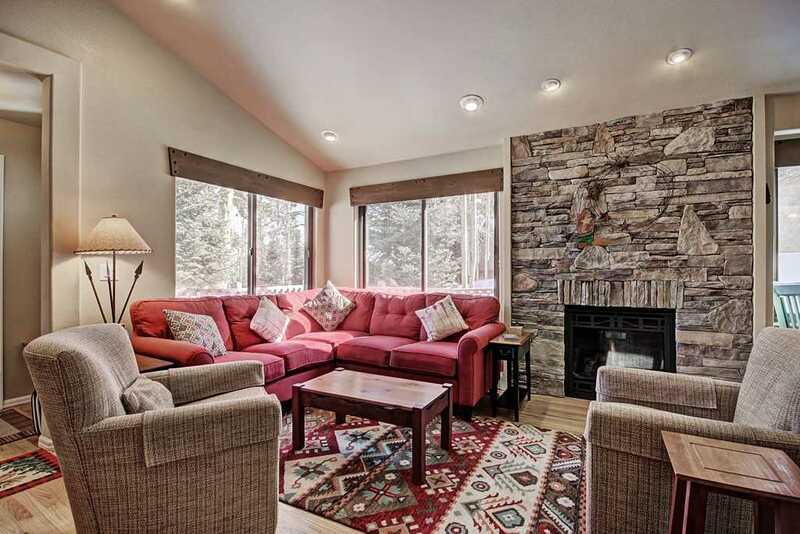 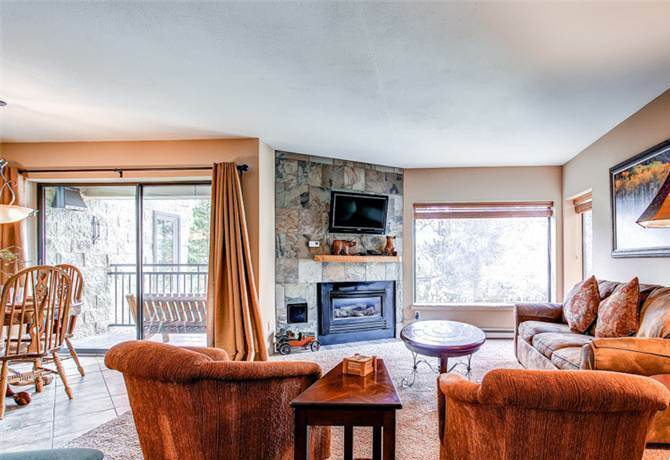 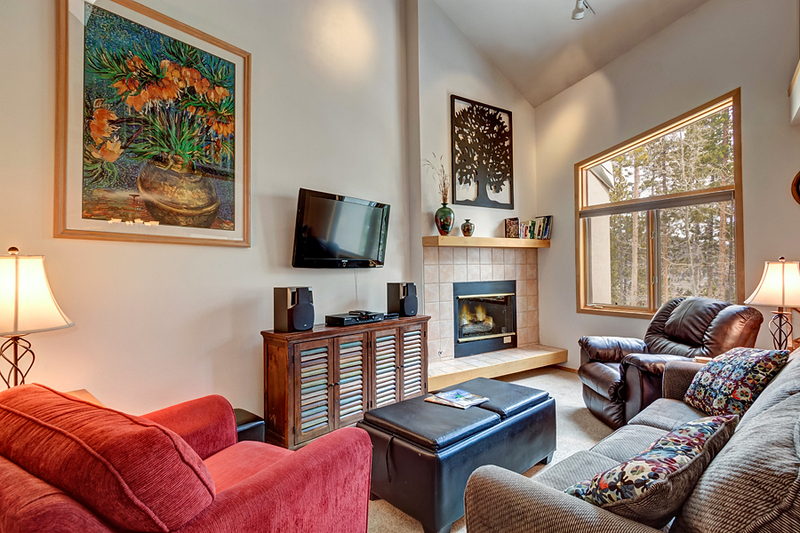 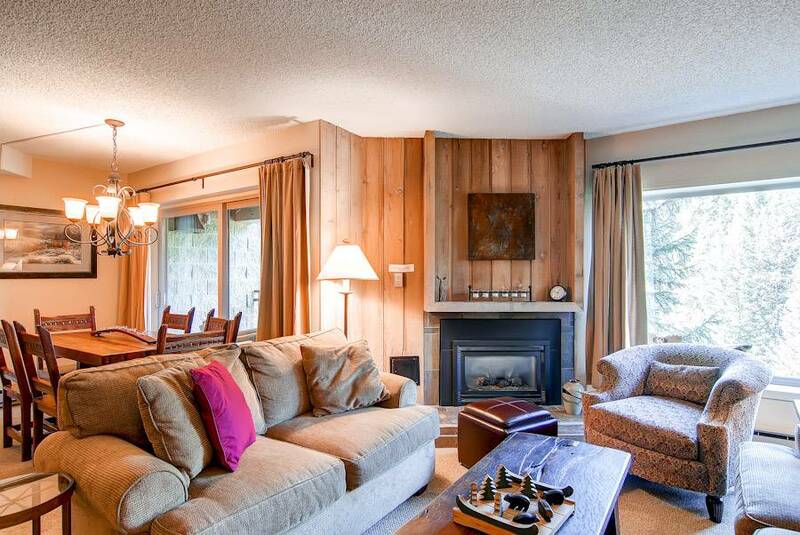 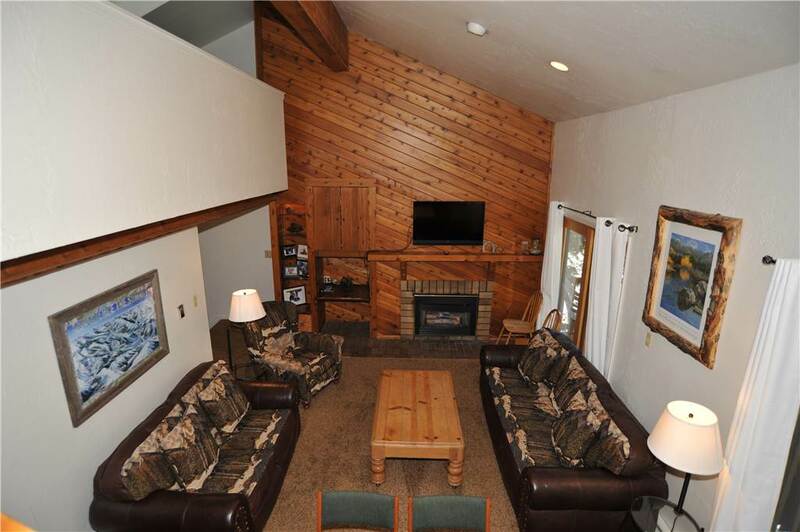 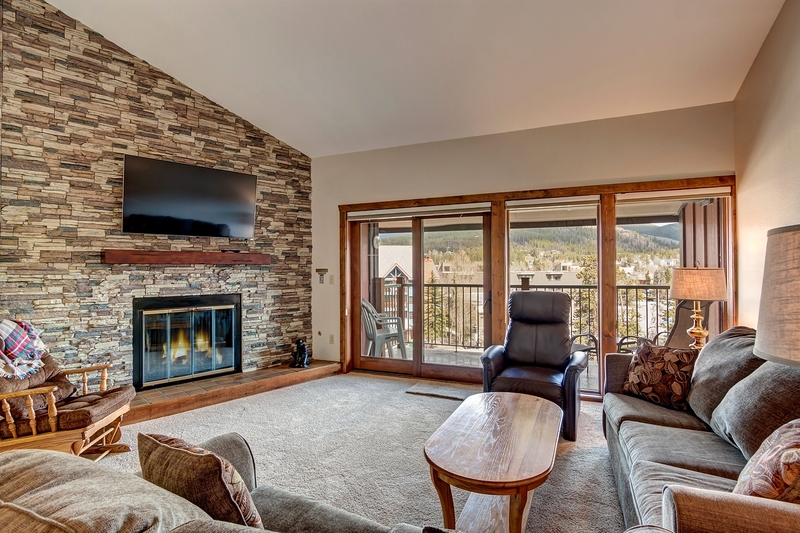 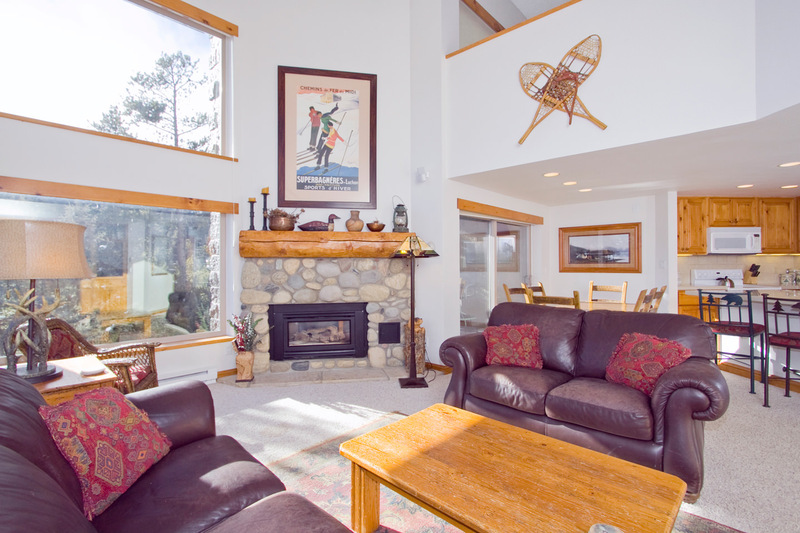 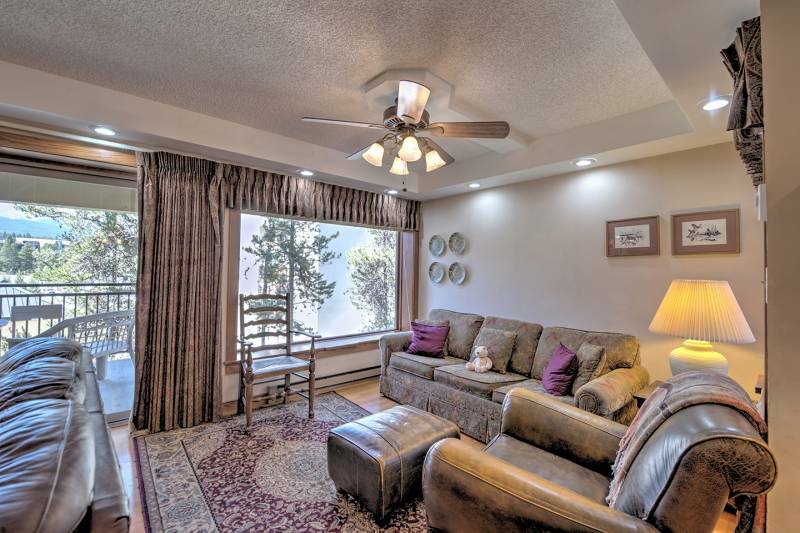 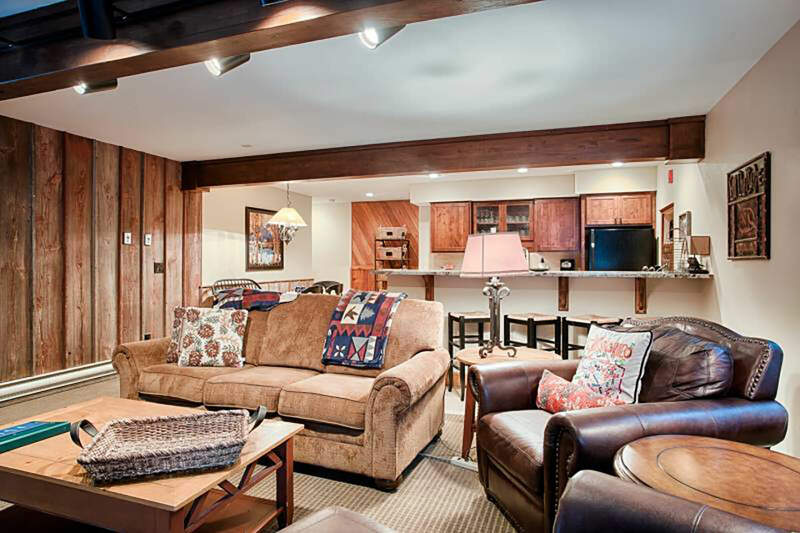 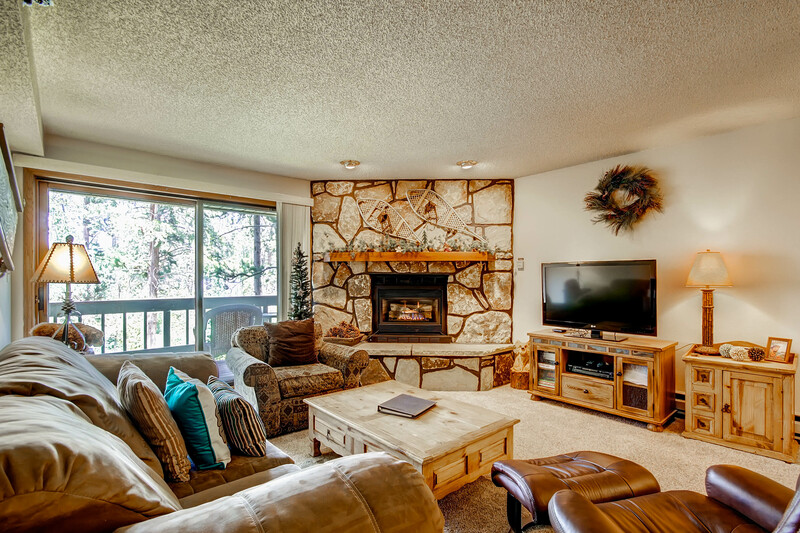 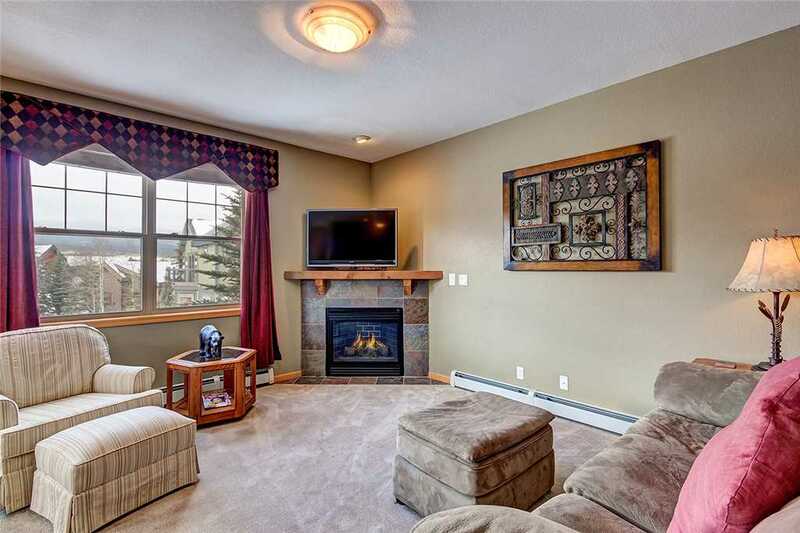 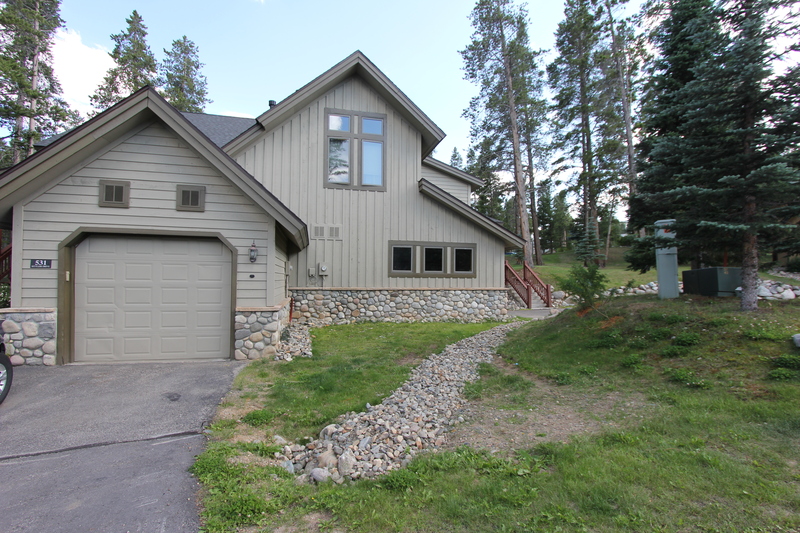 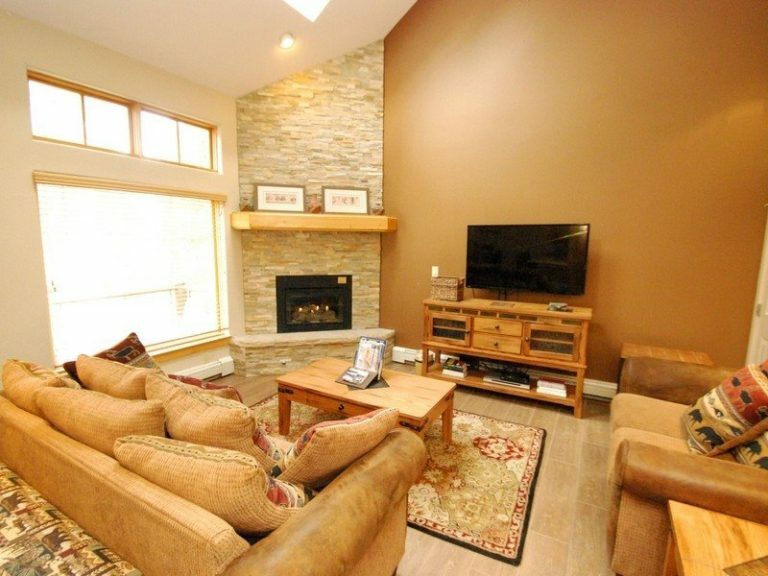 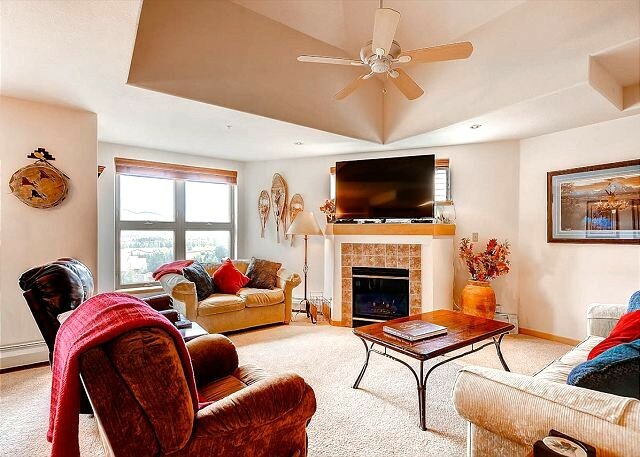 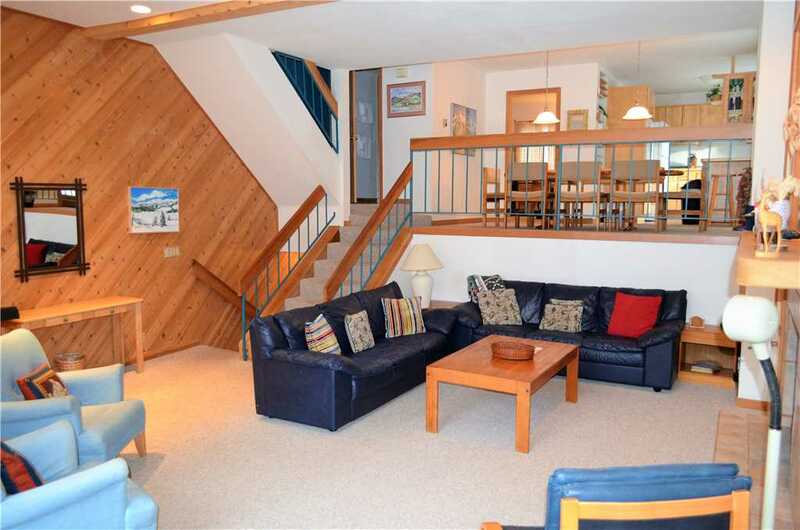 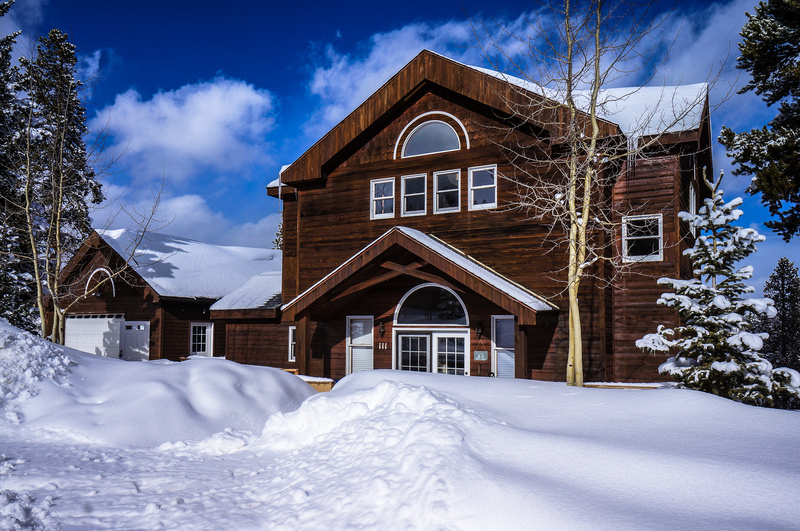 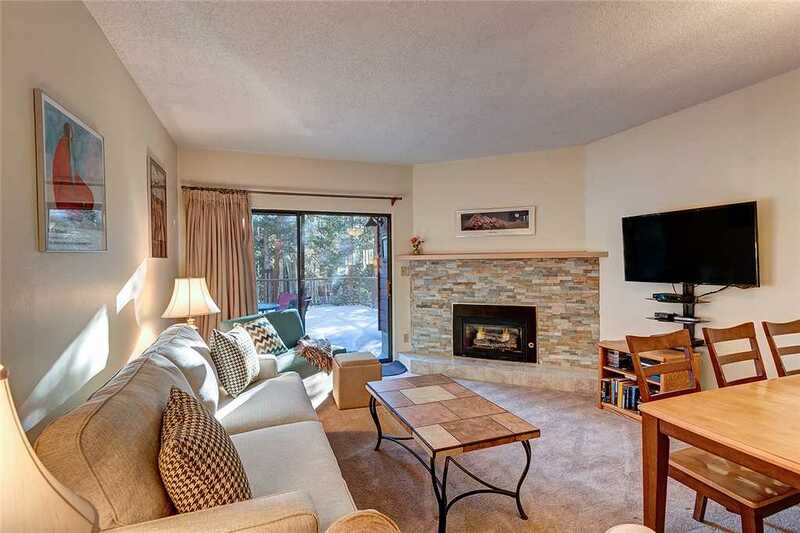 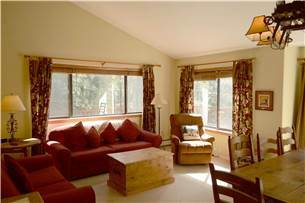 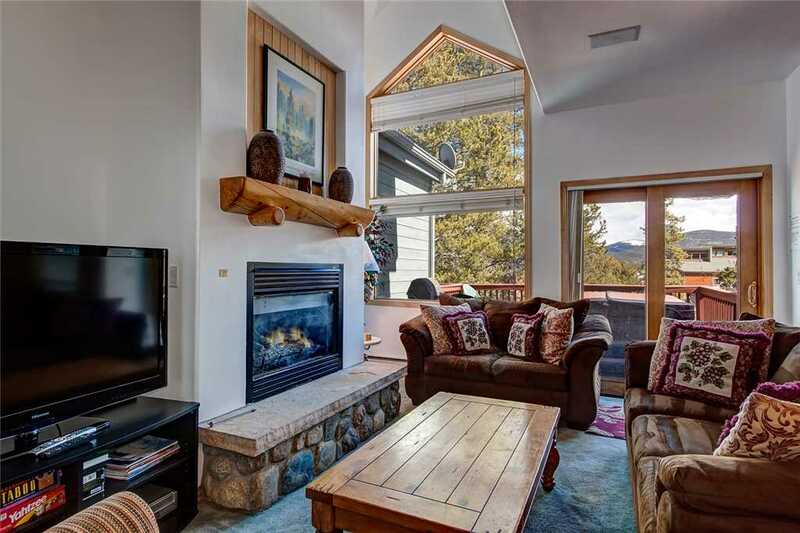 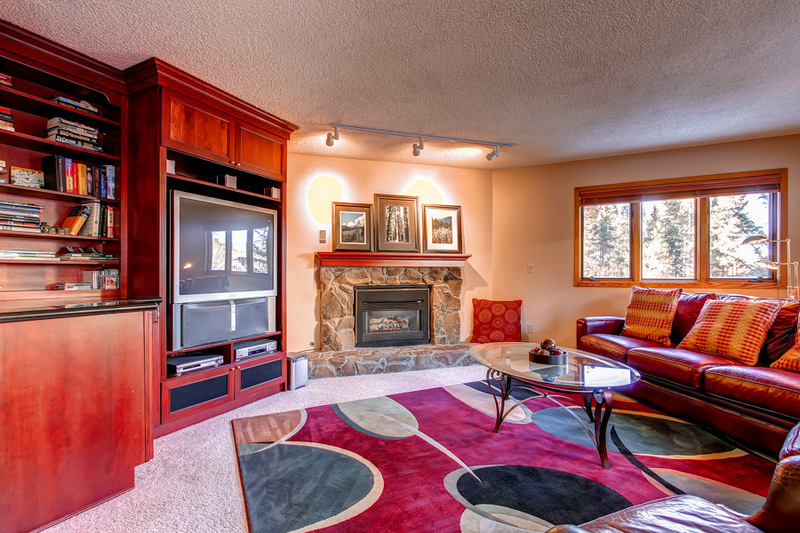 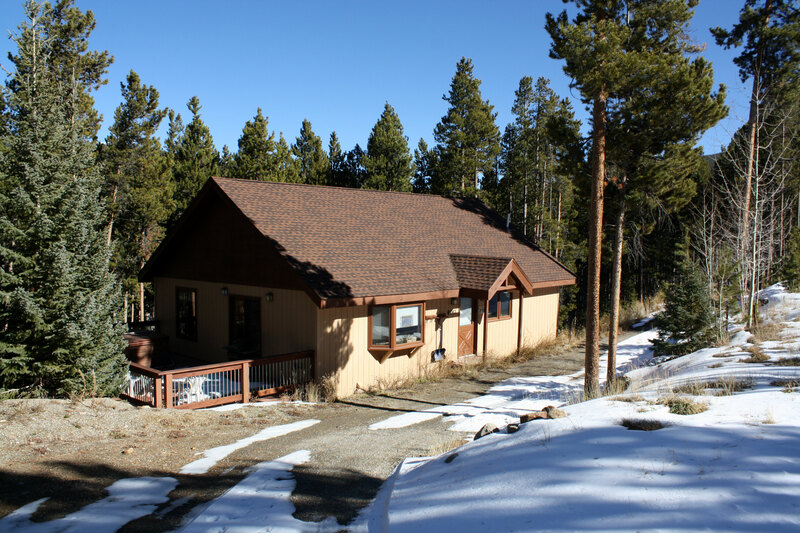 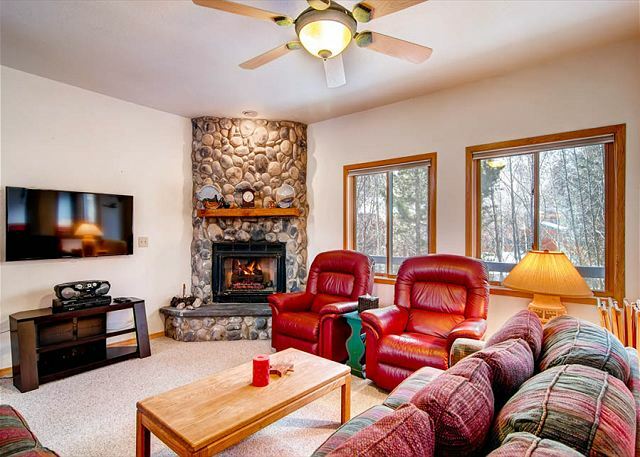 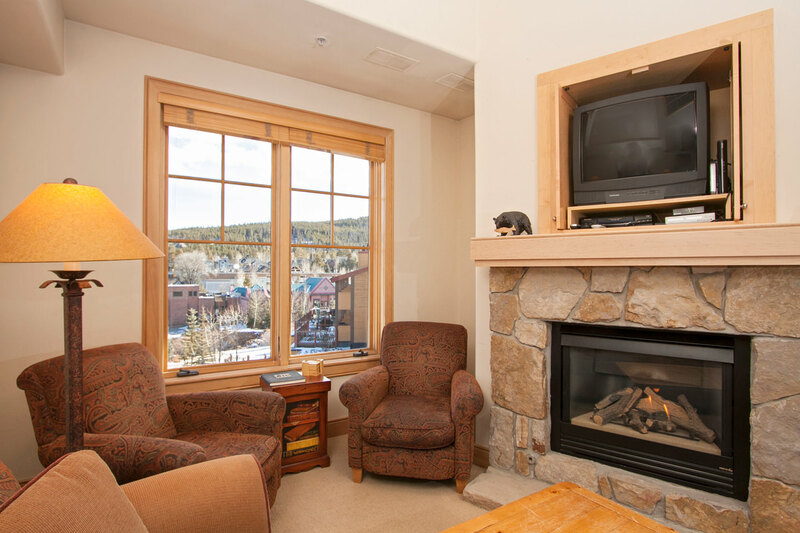 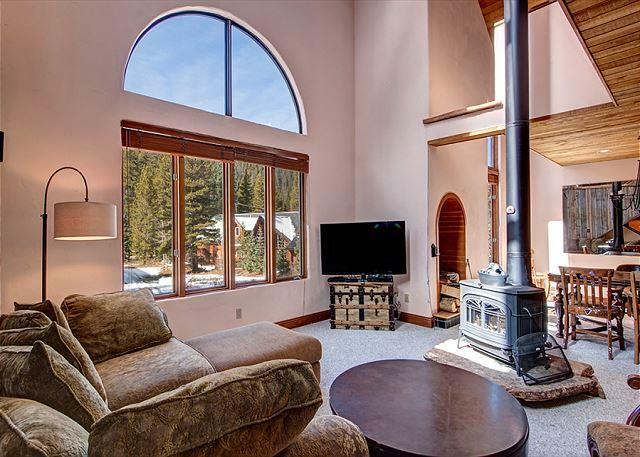 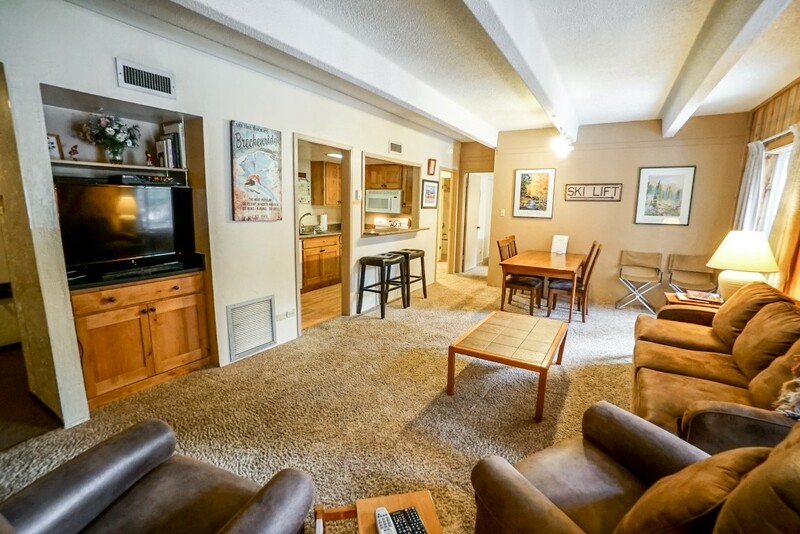 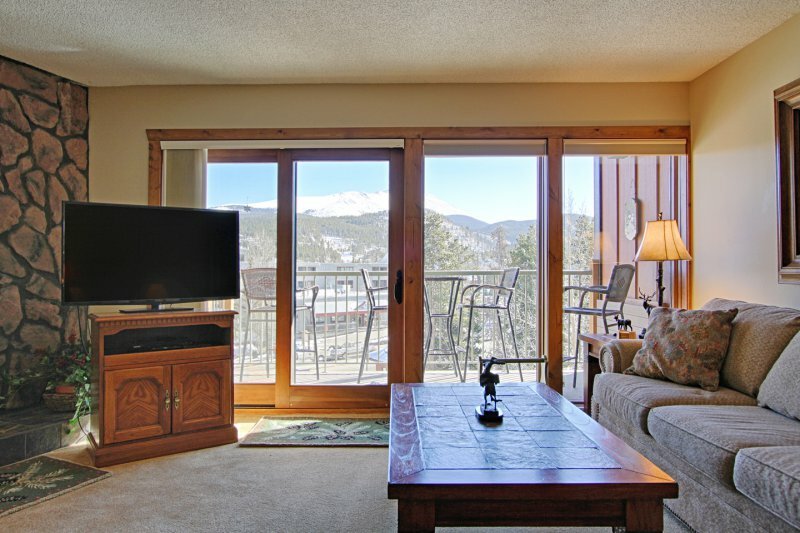 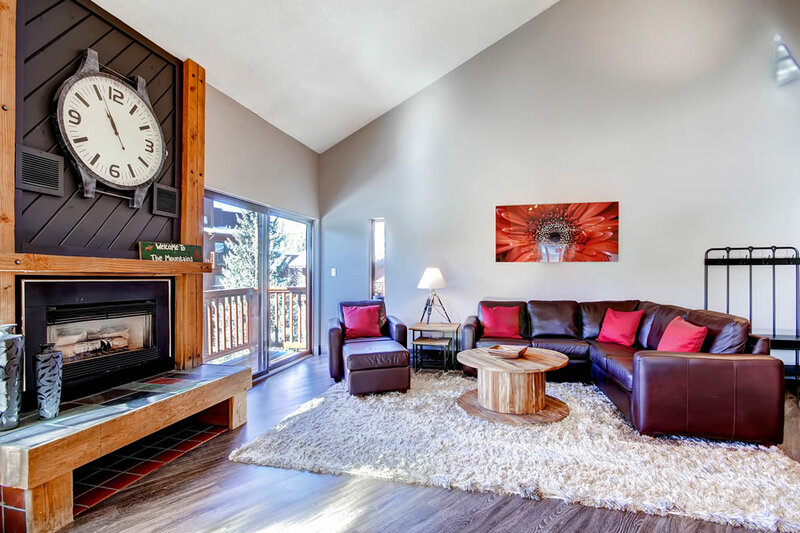 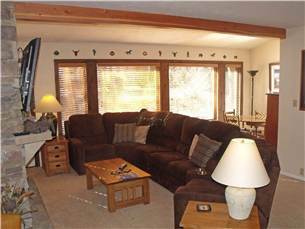 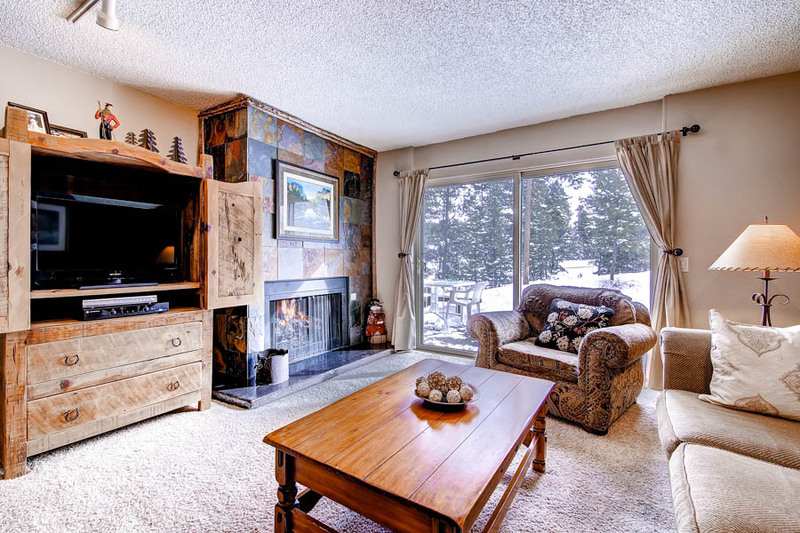 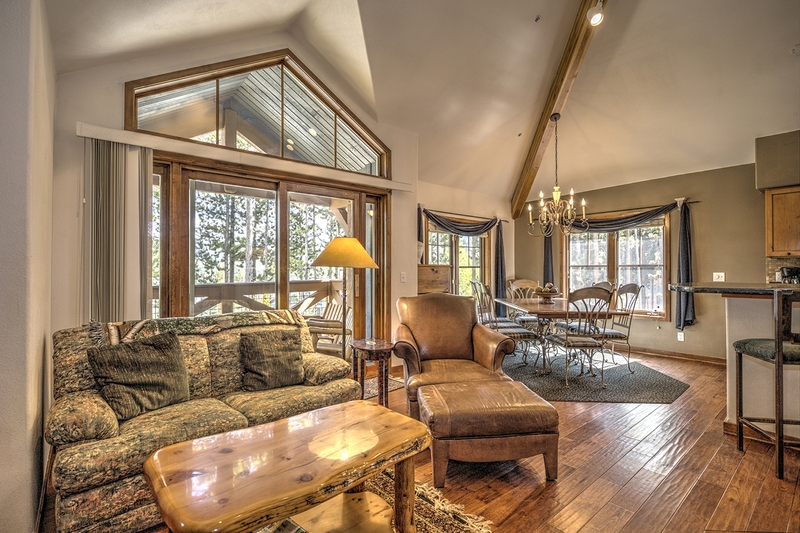 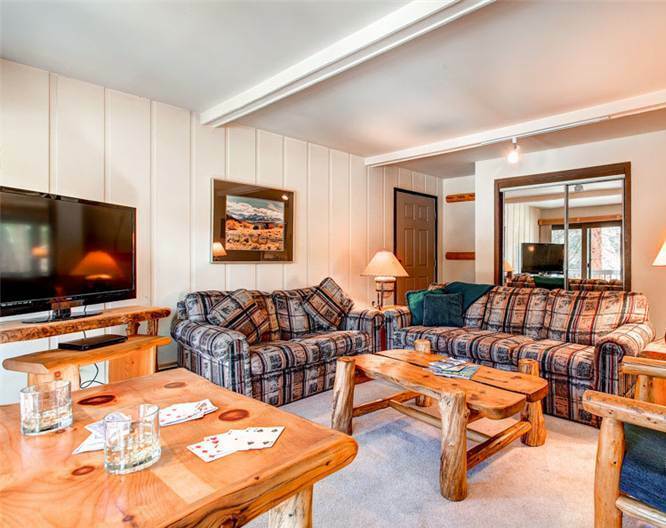 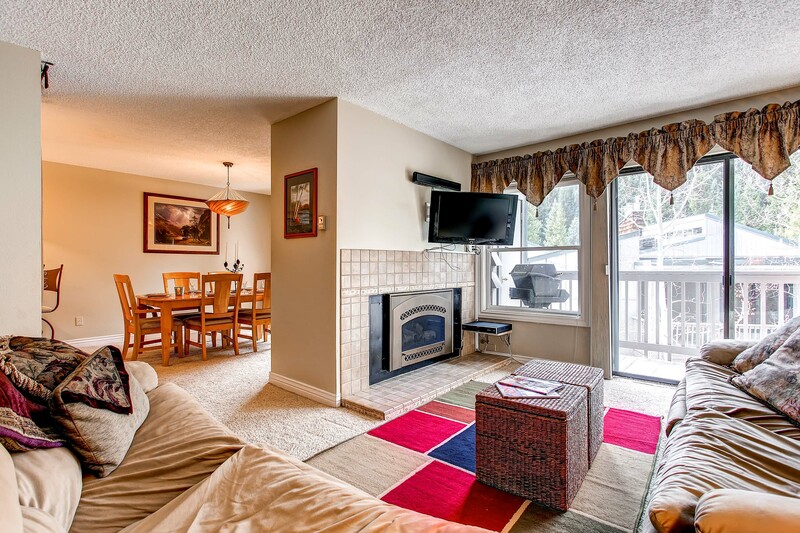 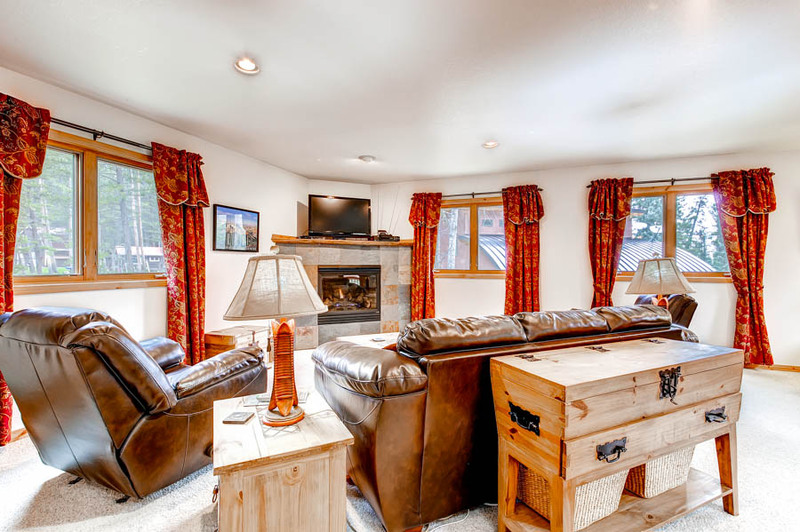 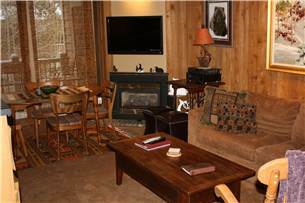 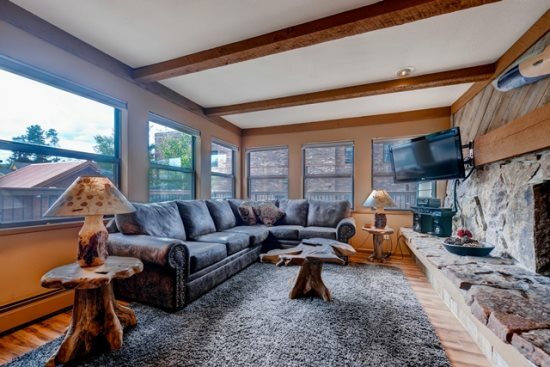 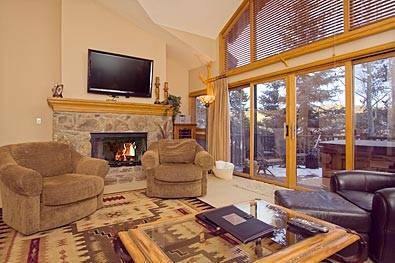 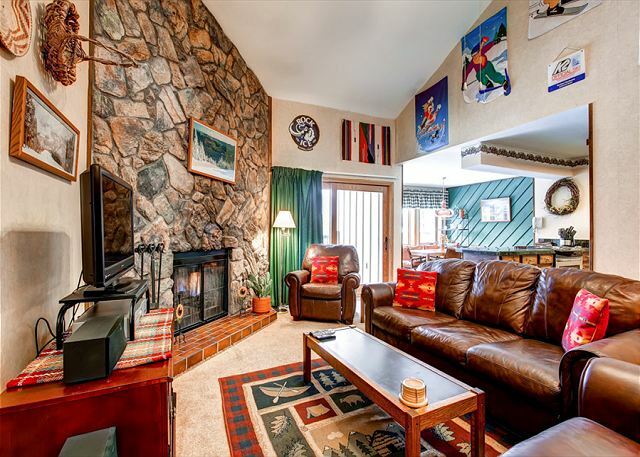 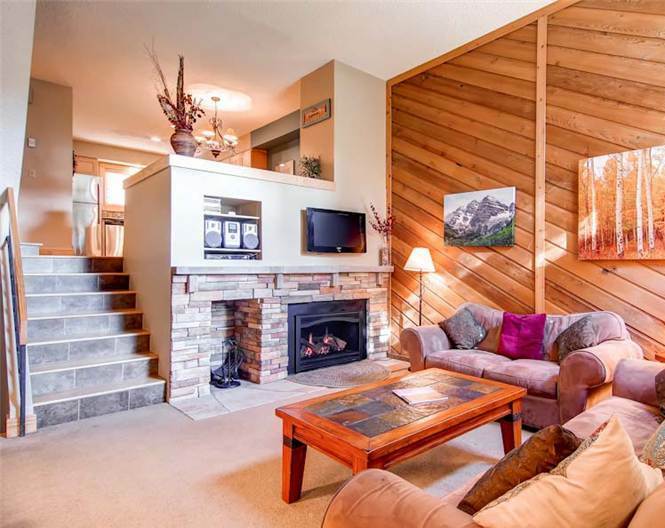 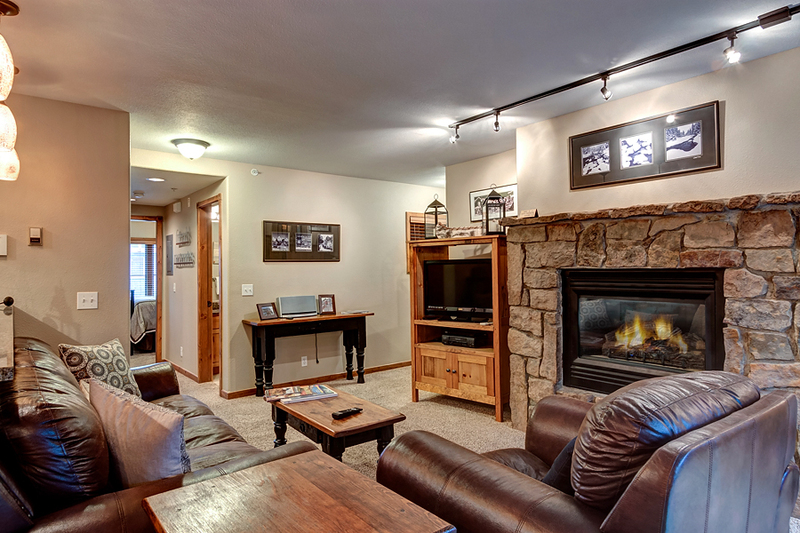 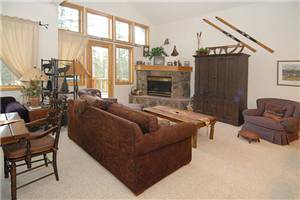 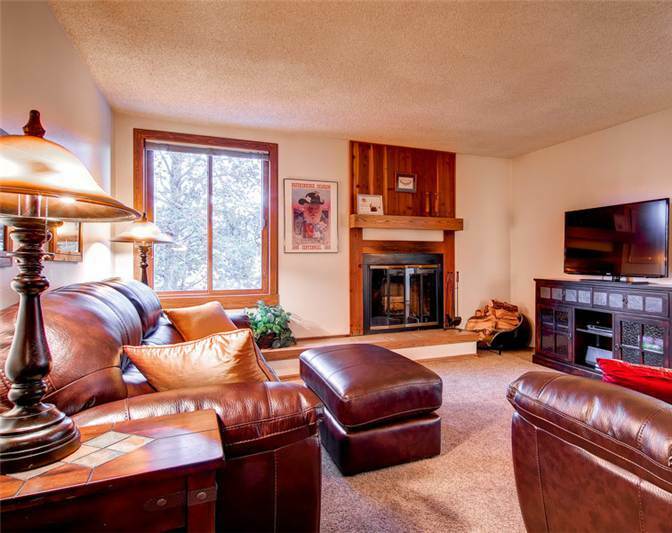 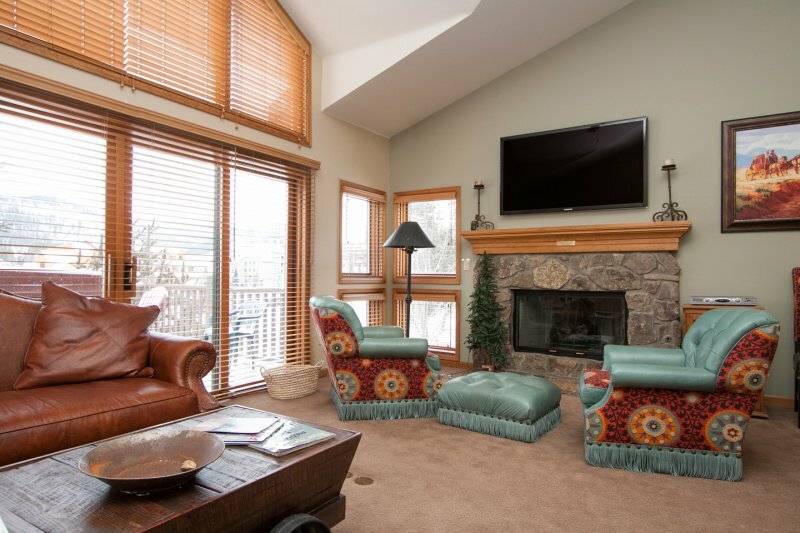 The carpeted living room has cozy wood-burning fireplace (firewood included), aspen rocker, comfortable couches, aspen coffee table, end tables, shelving, mountain-themed lamps, and Italian tile entryway and hearth. 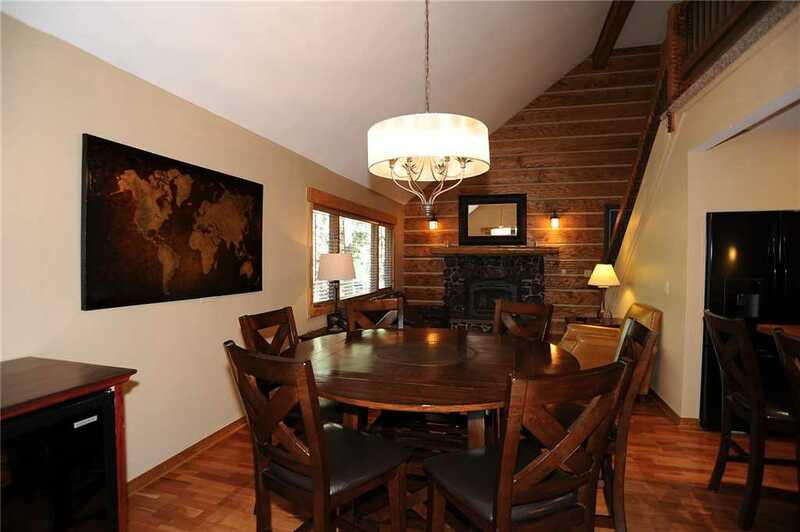 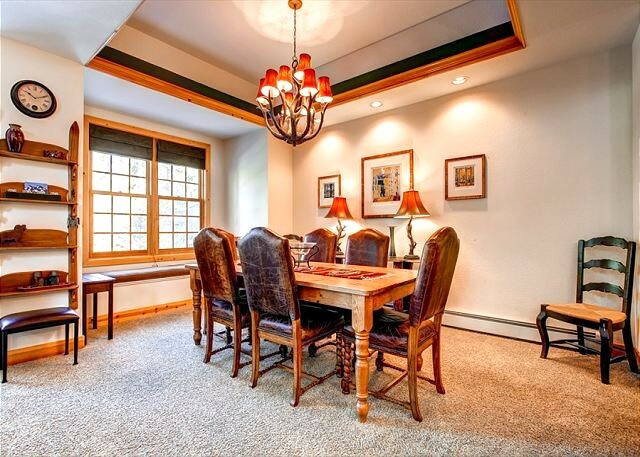 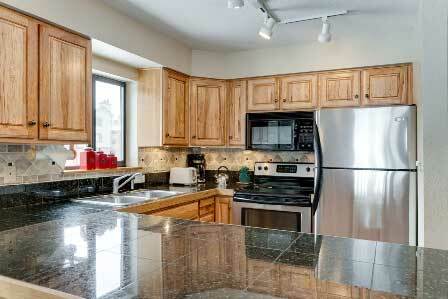 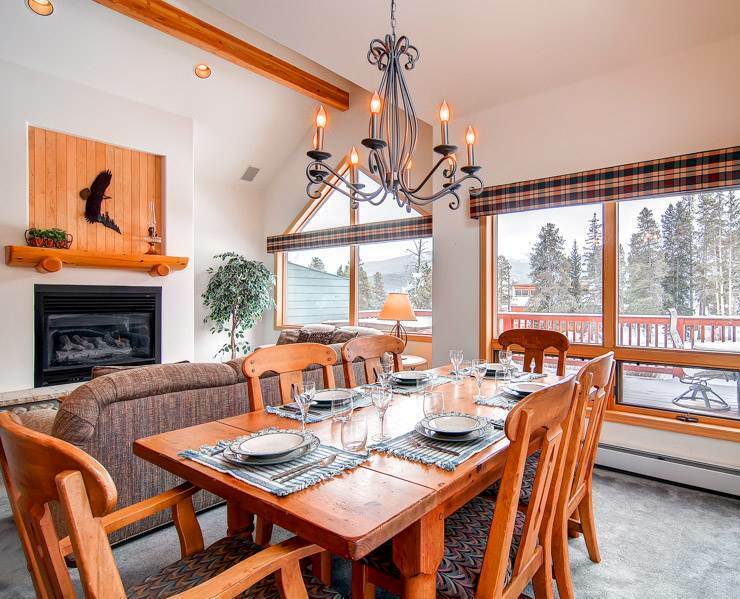 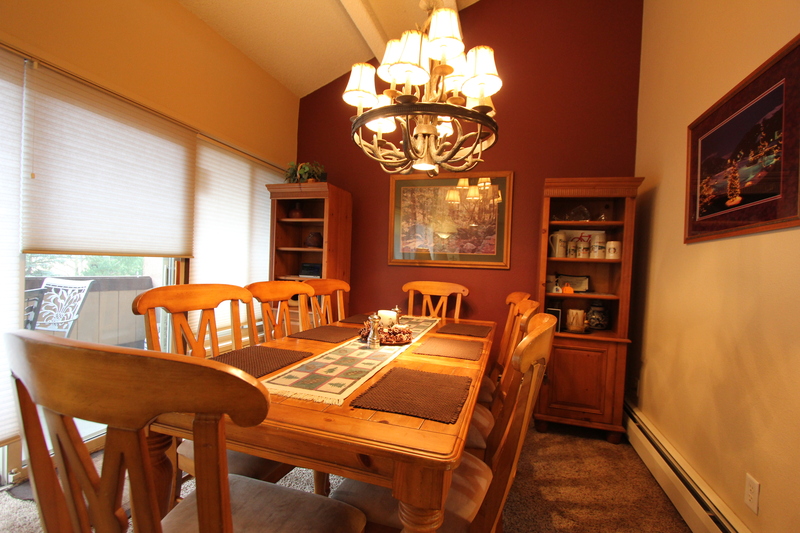 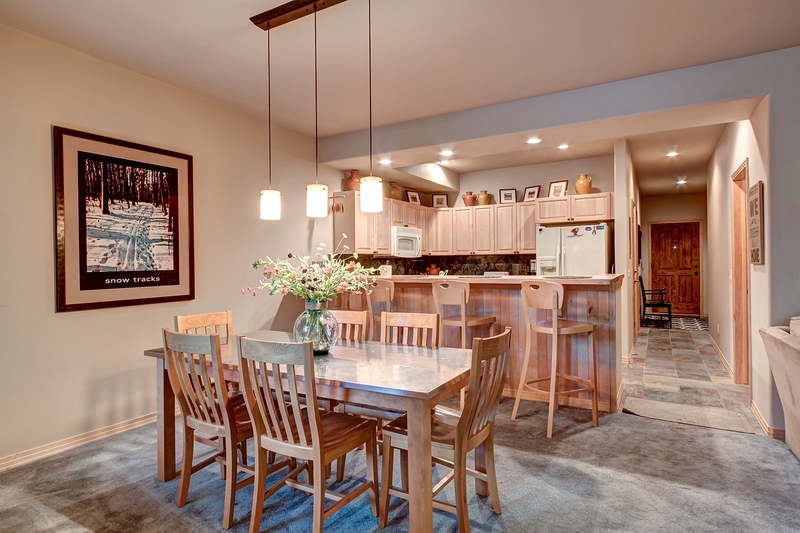 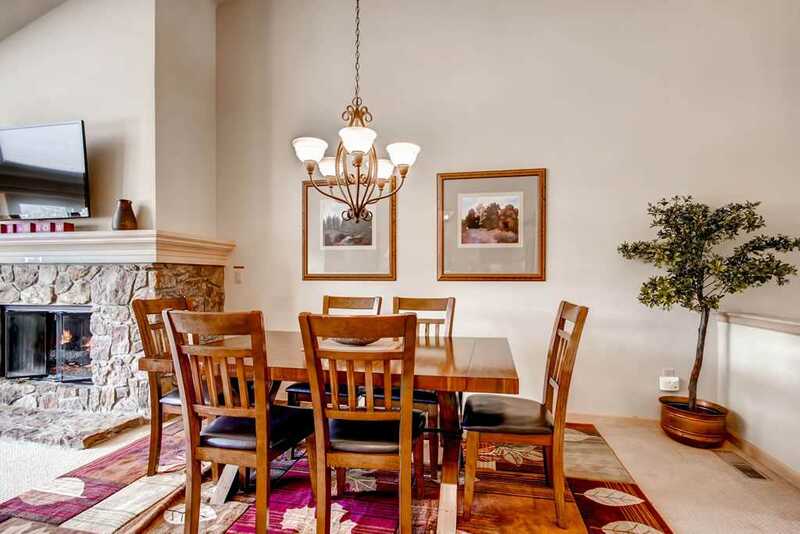 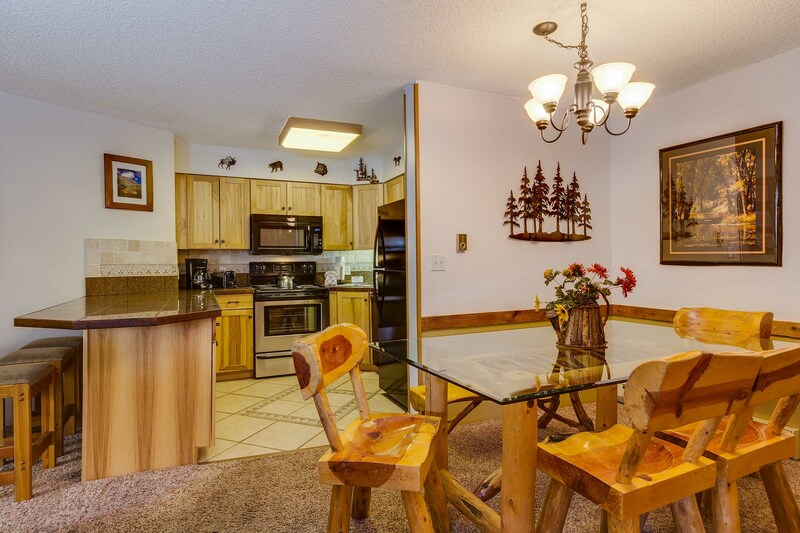 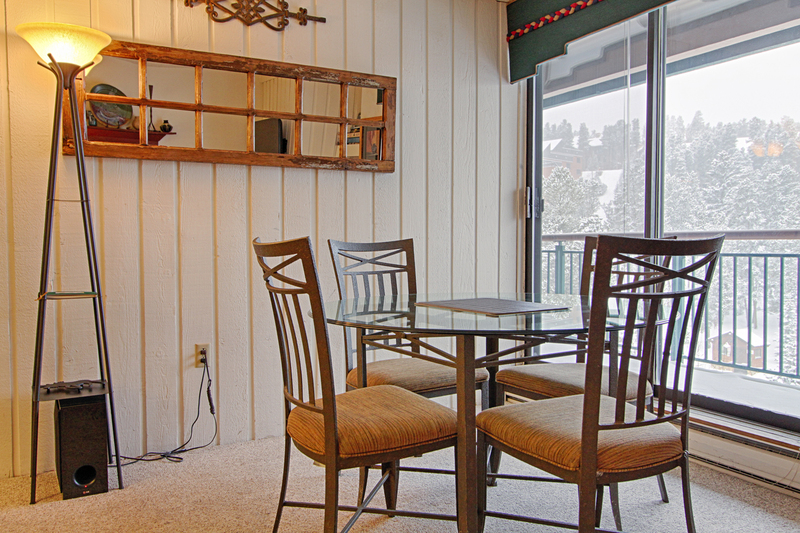 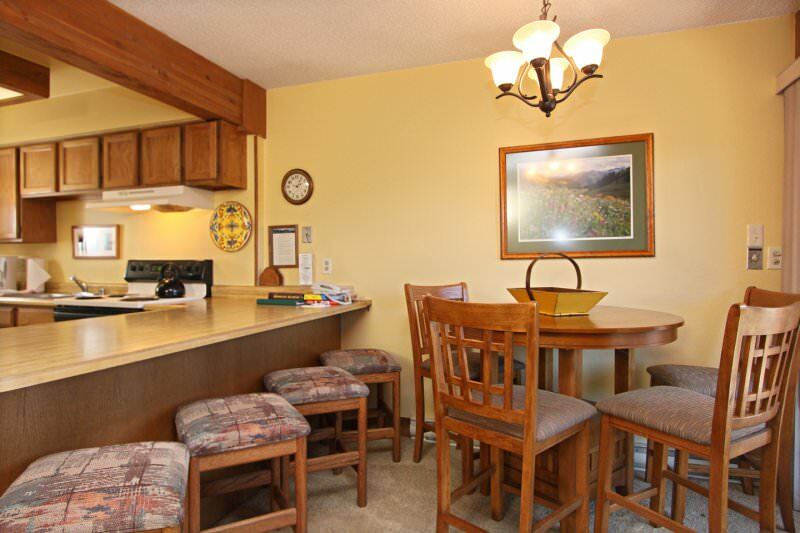 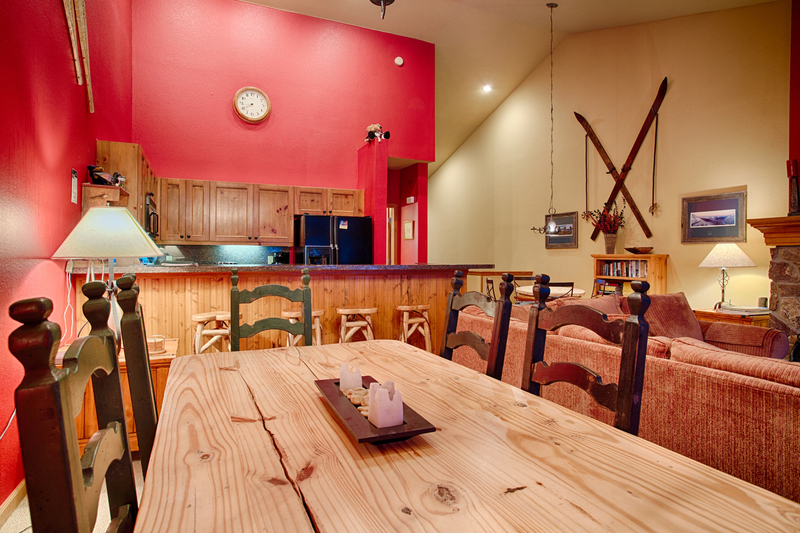 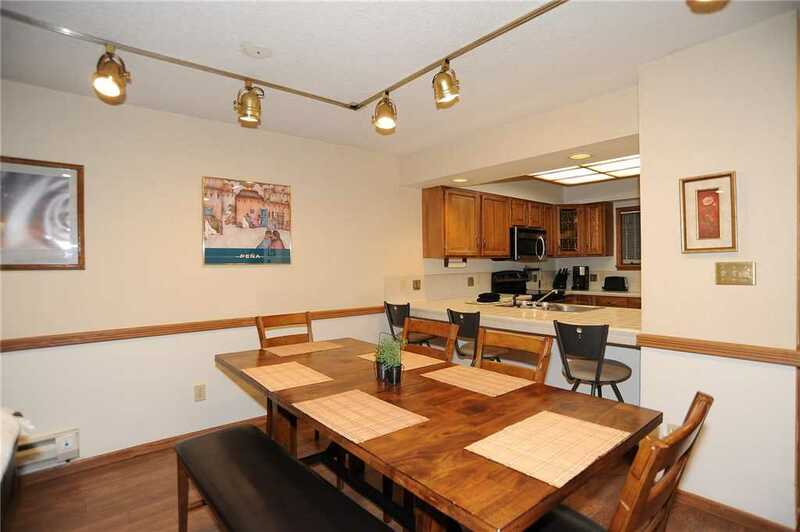 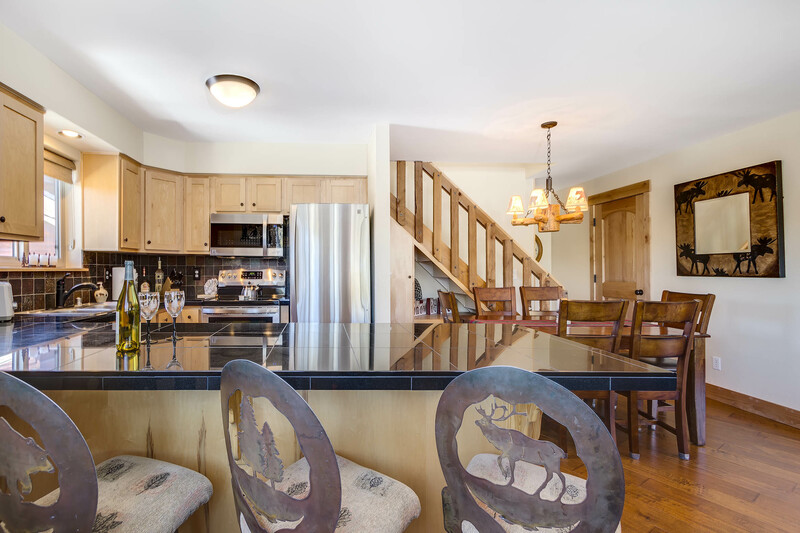 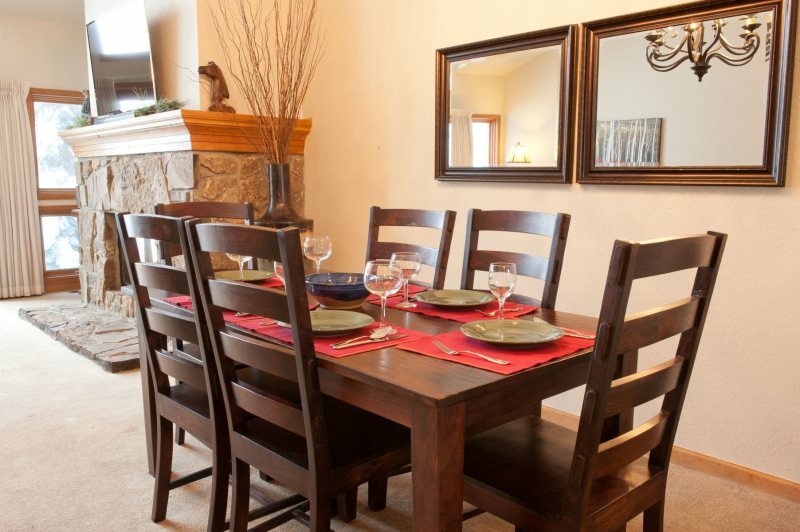 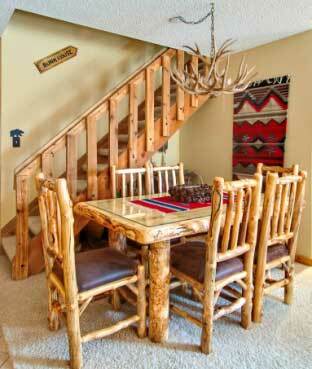 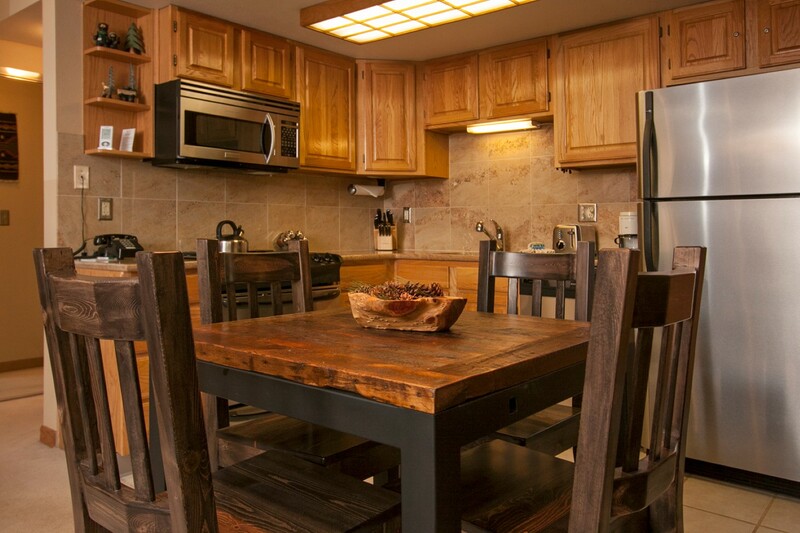 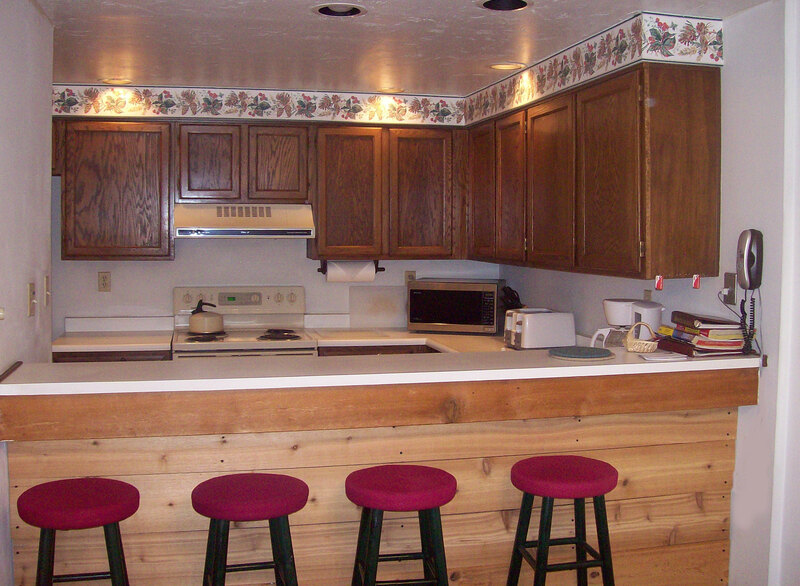 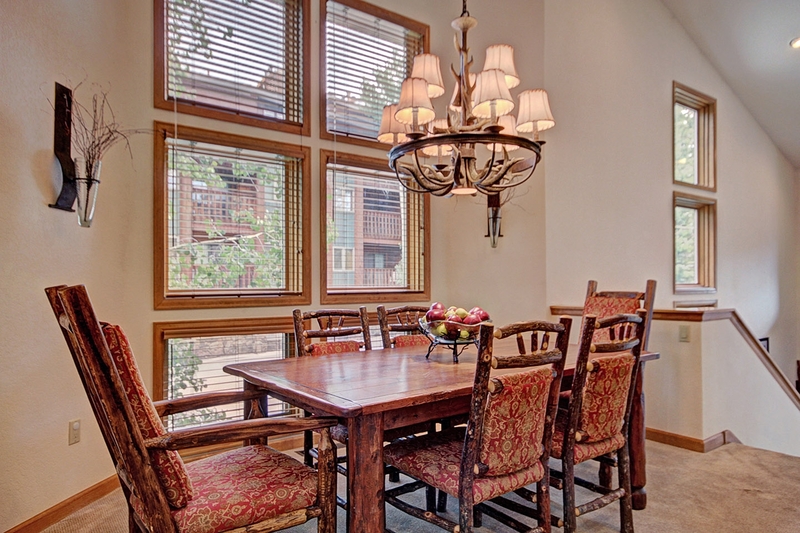 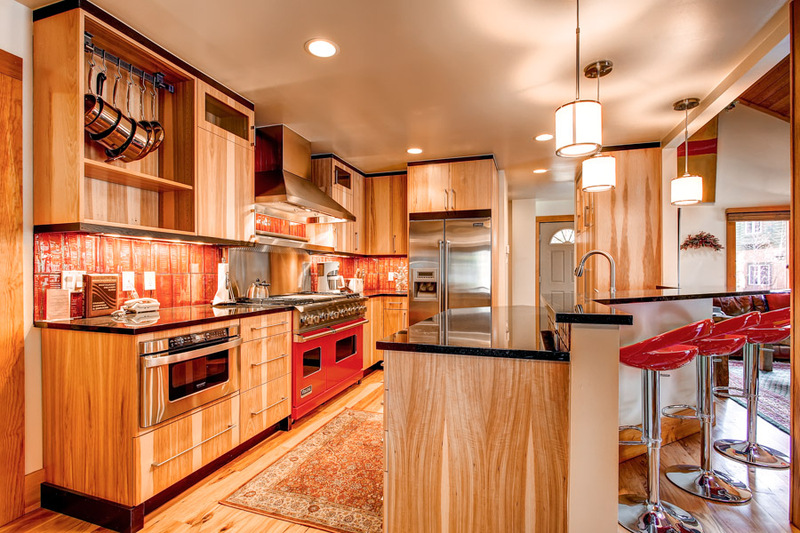 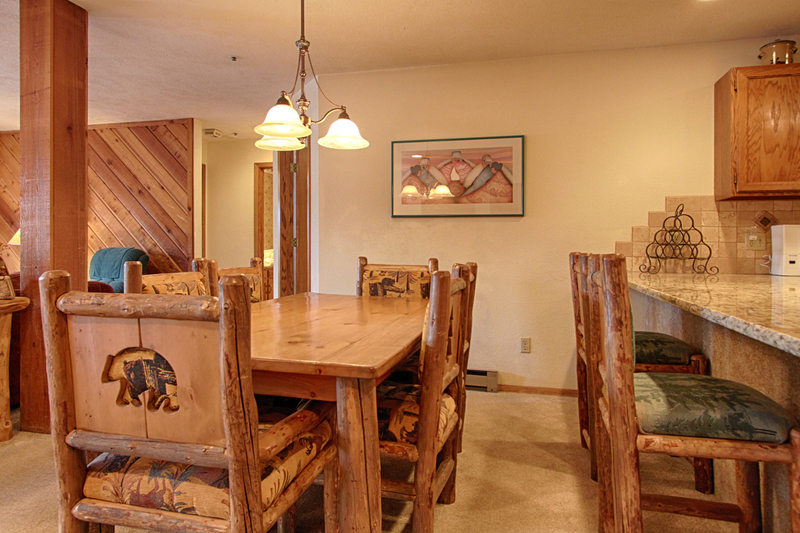 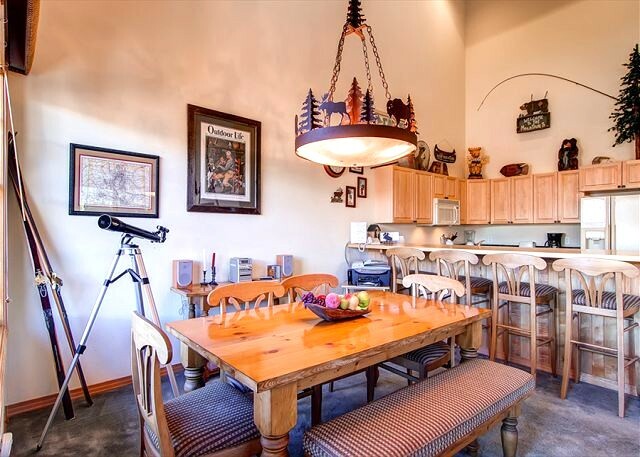 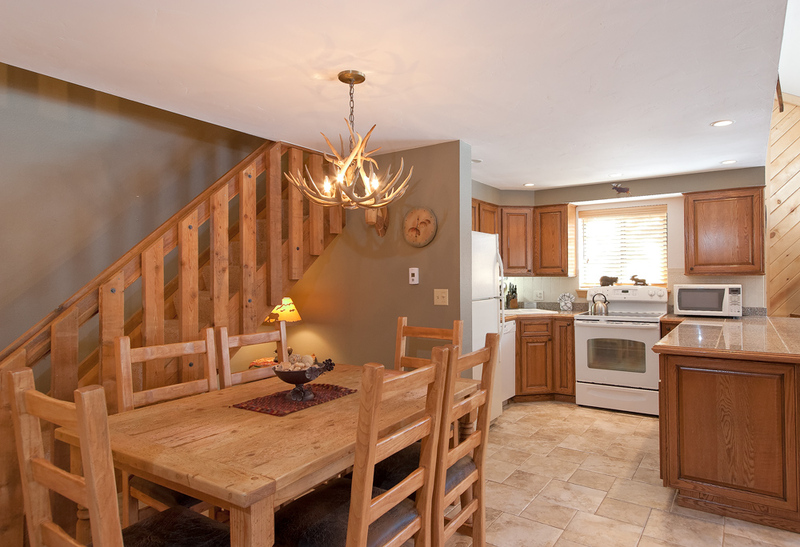 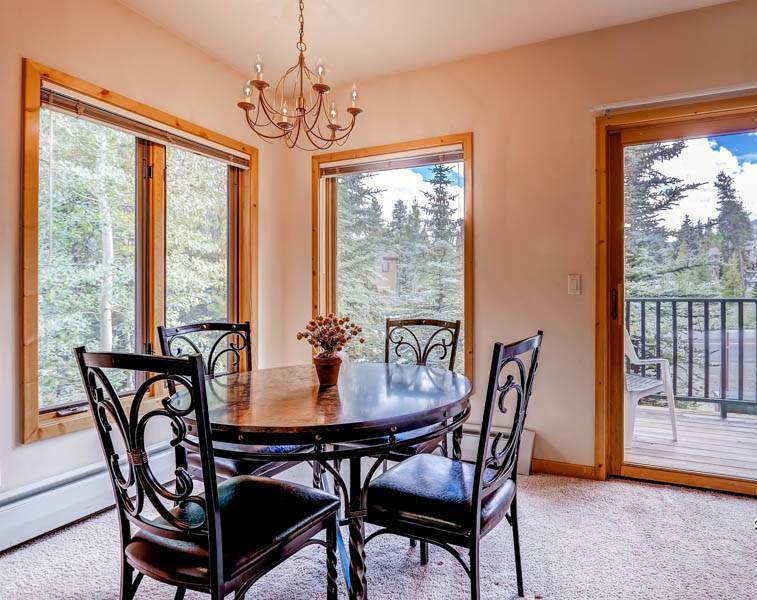 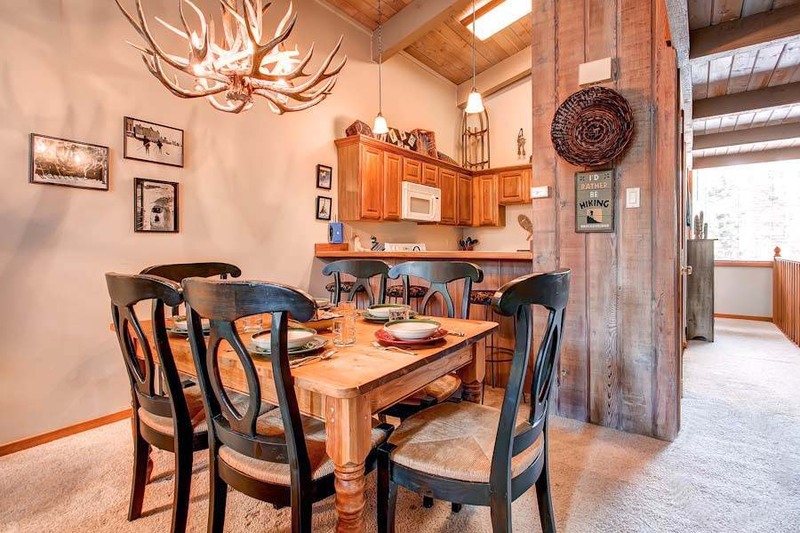 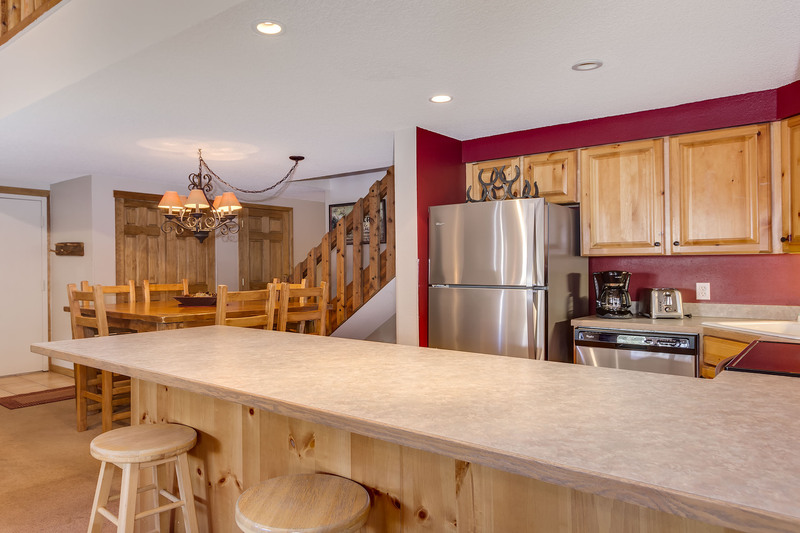 The dining area has an aspen-base large glass-top table with pine-block chairs and bench. 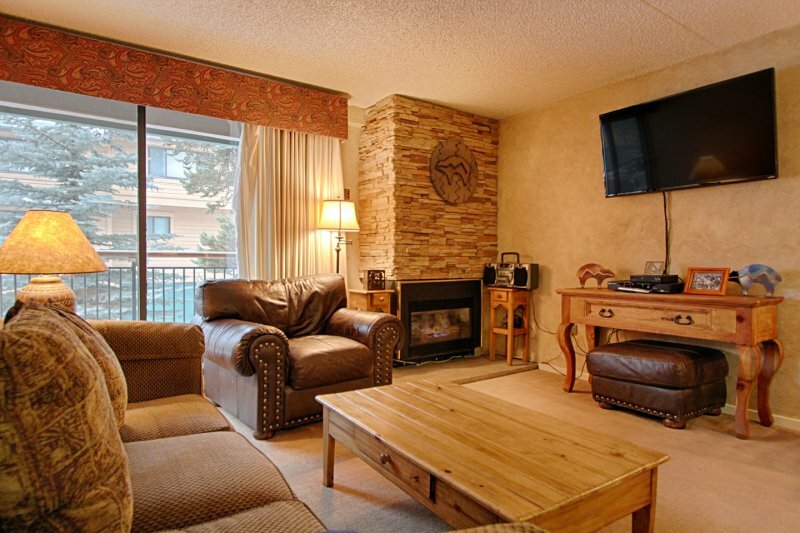 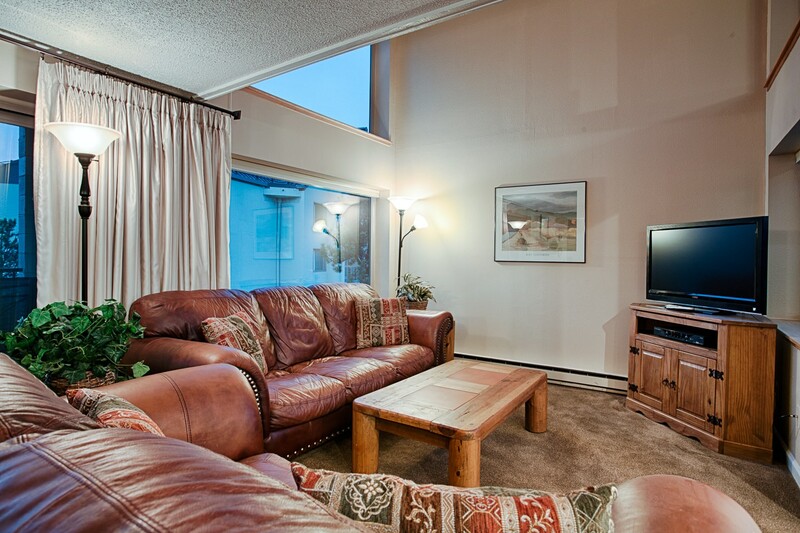 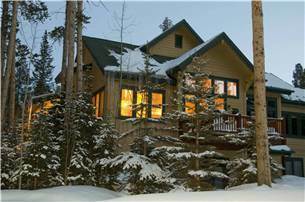 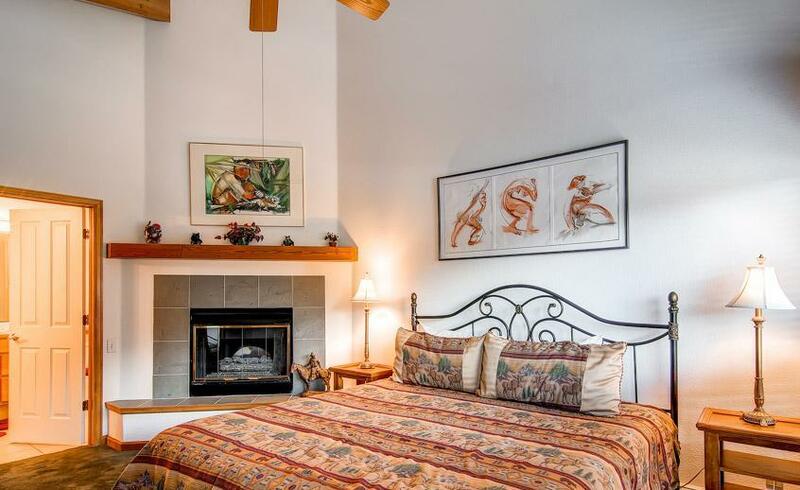 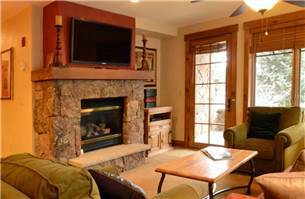 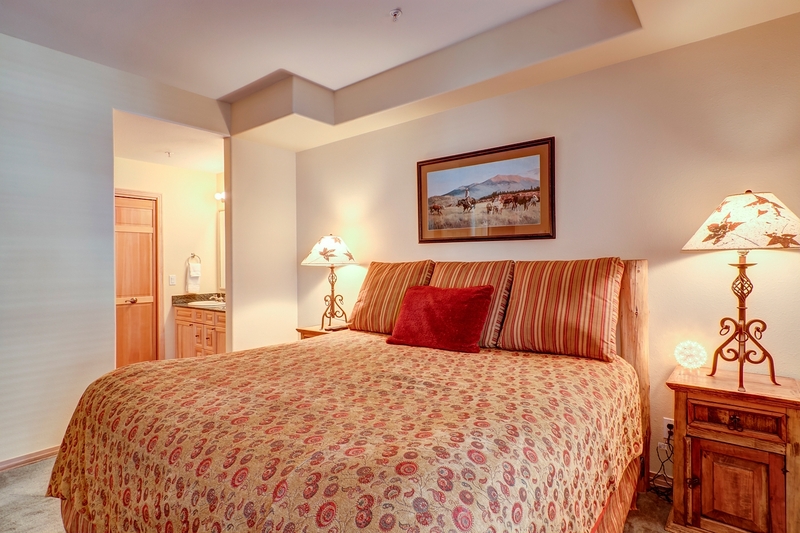 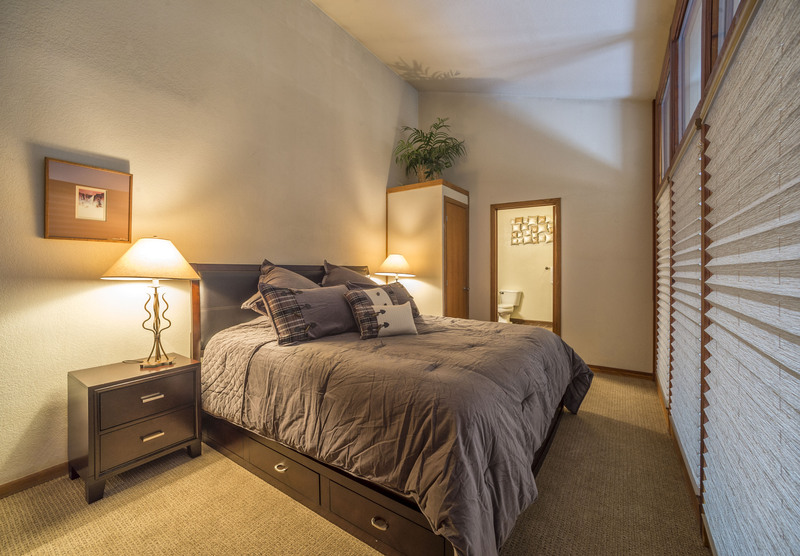 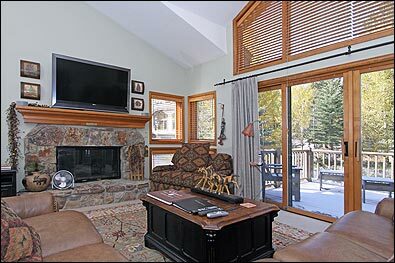 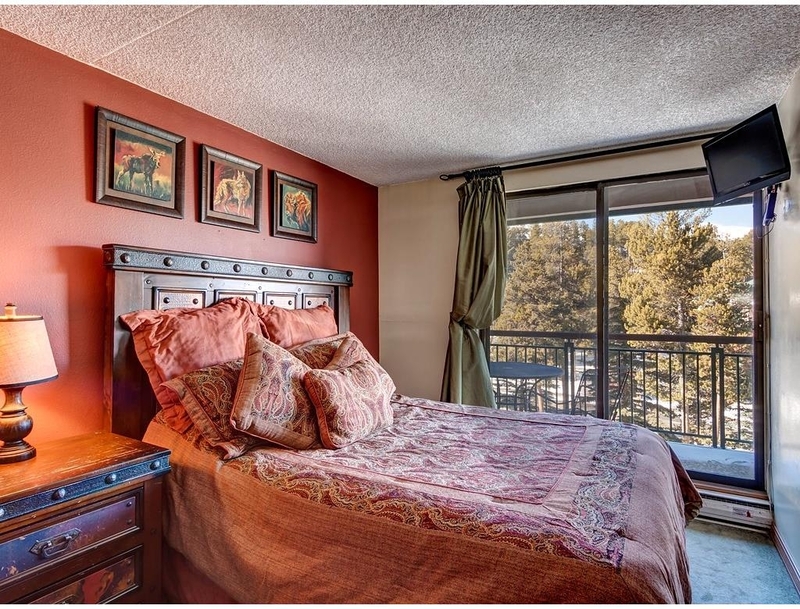 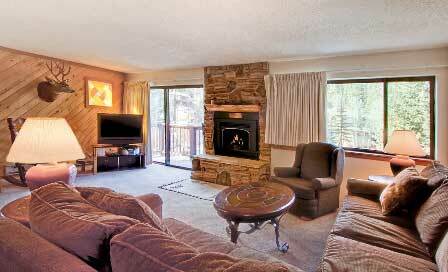 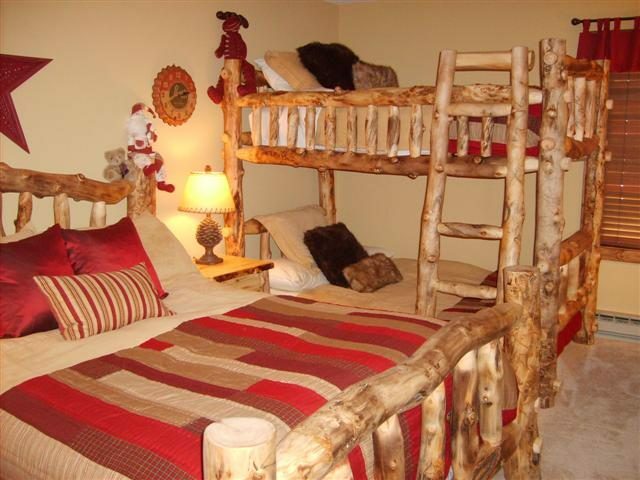 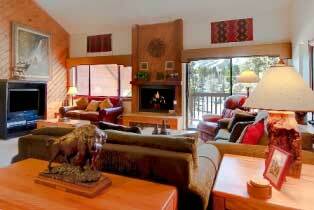 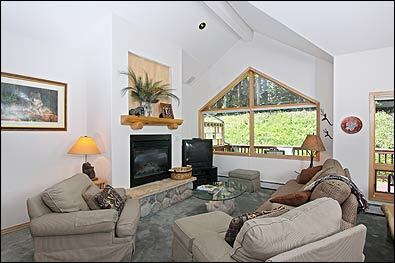 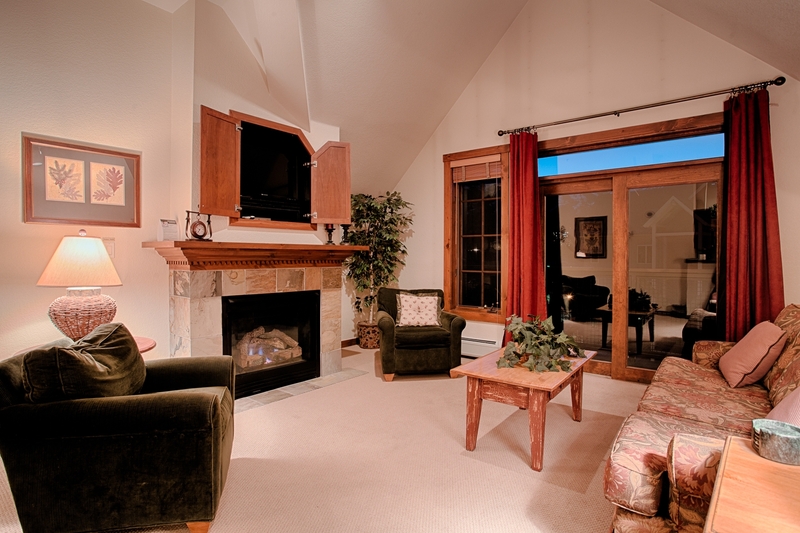 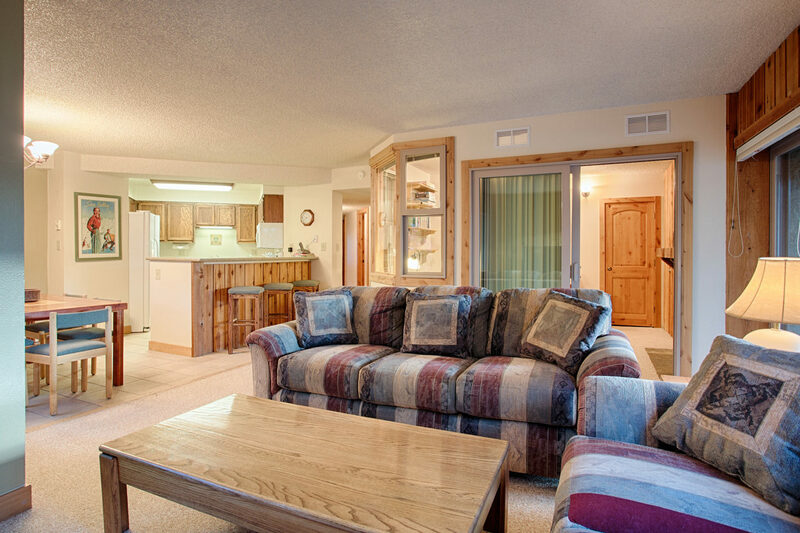 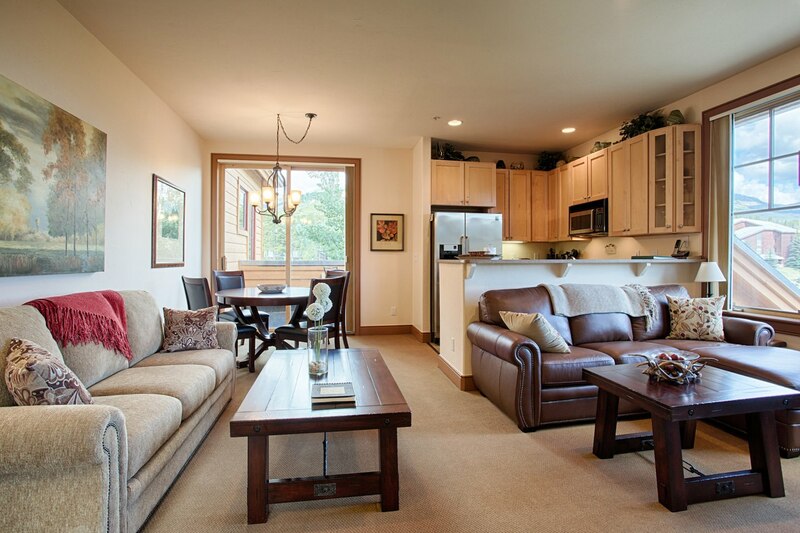 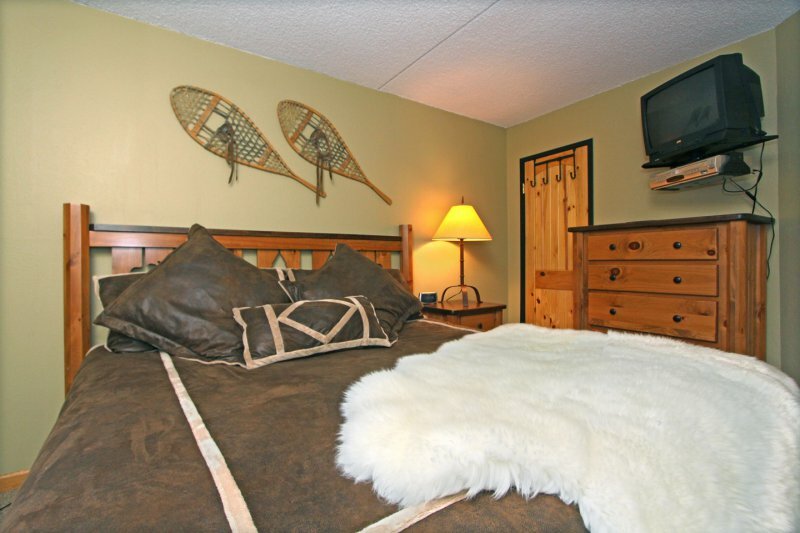 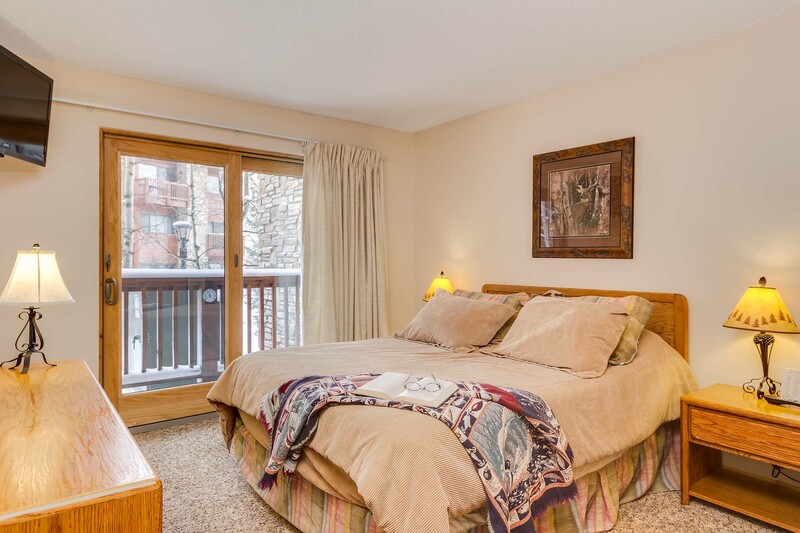 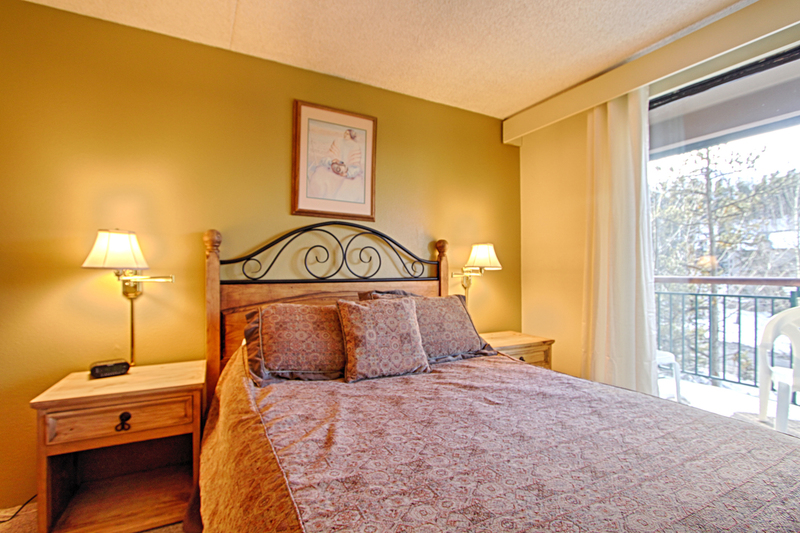 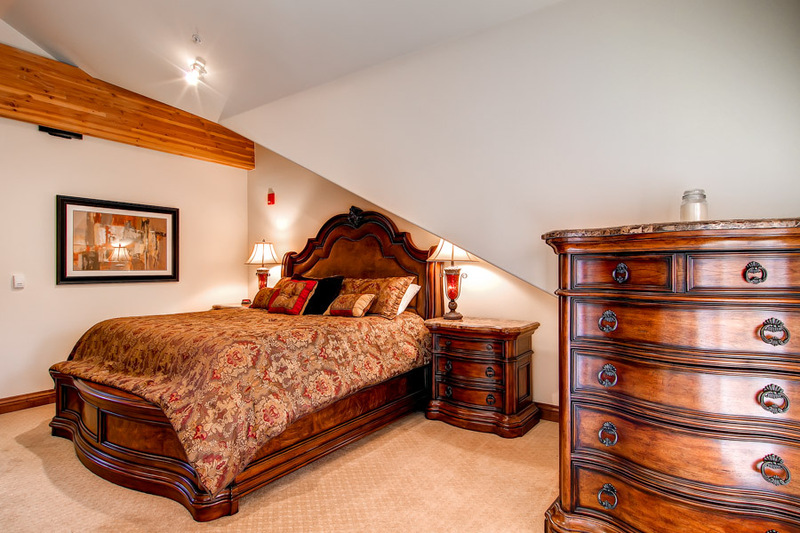 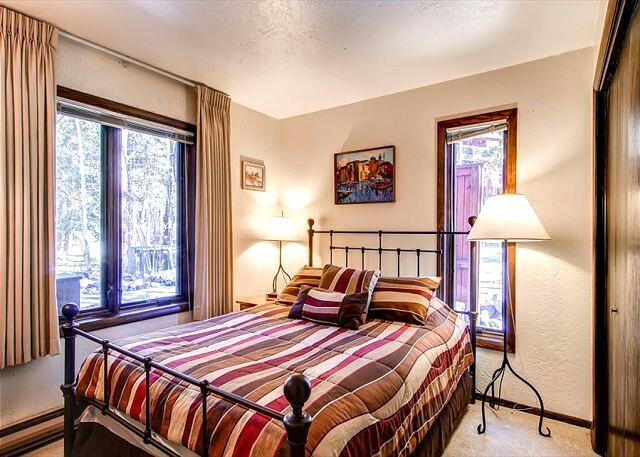 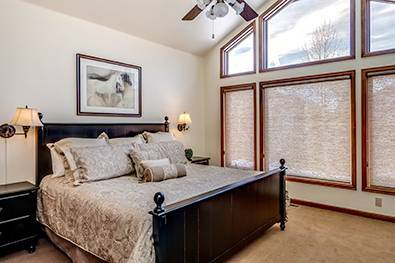 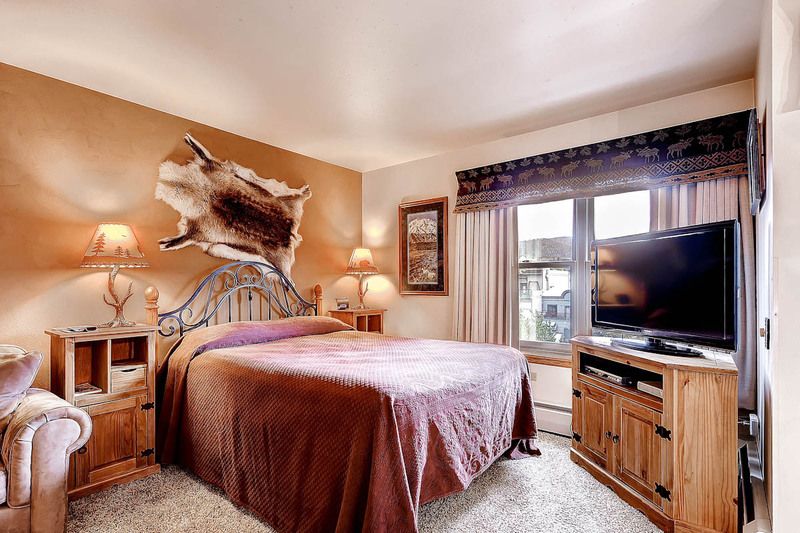 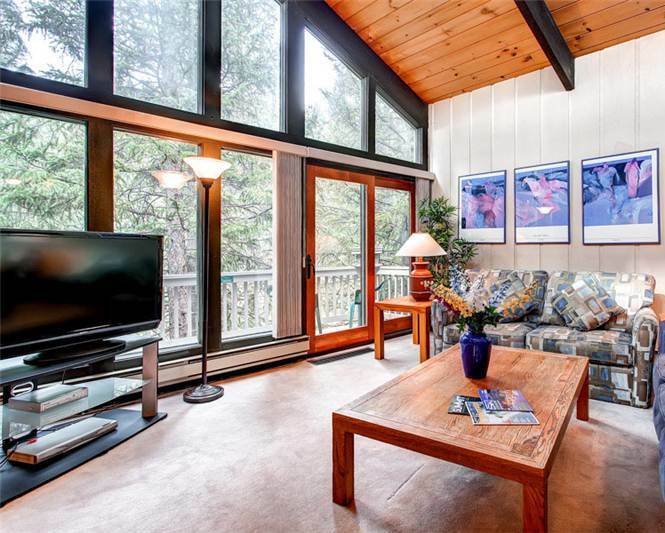 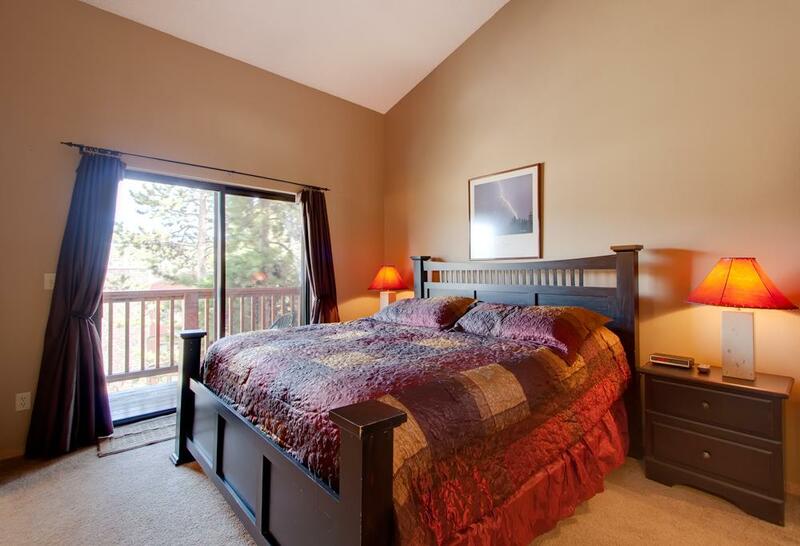 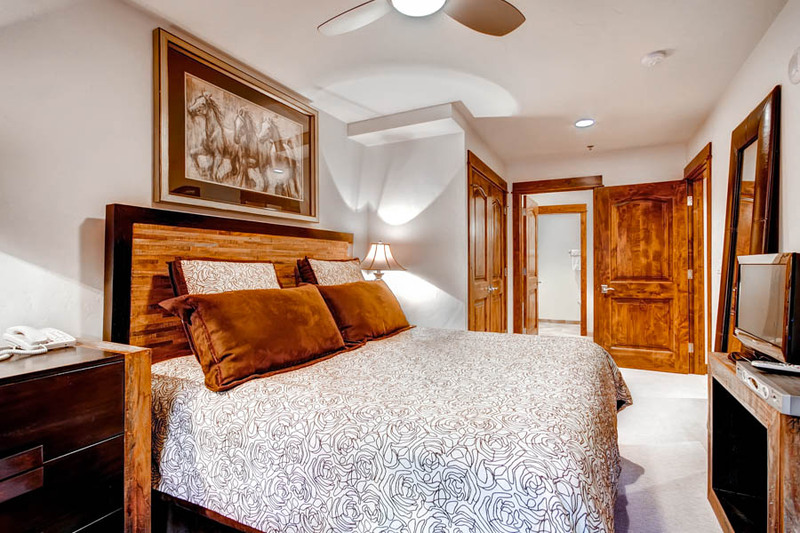 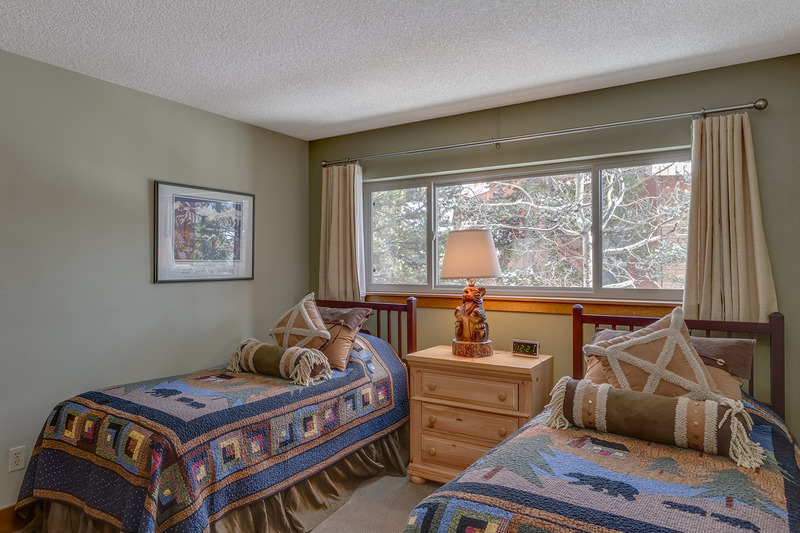 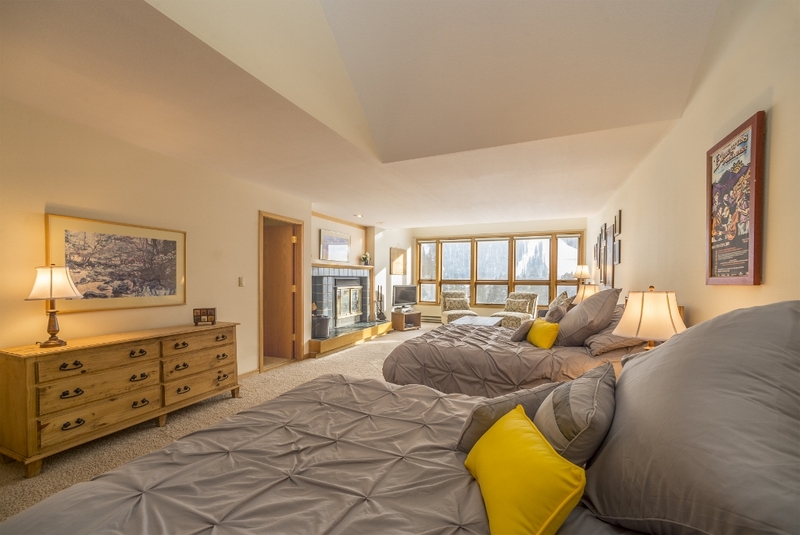 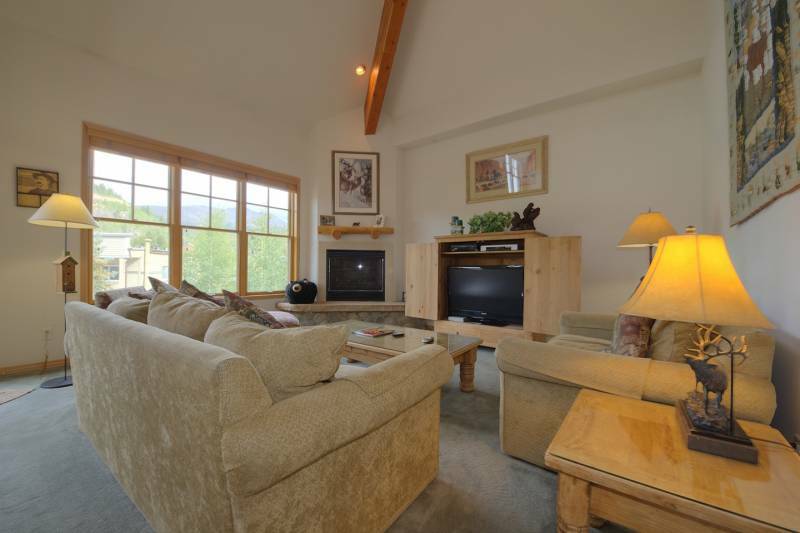 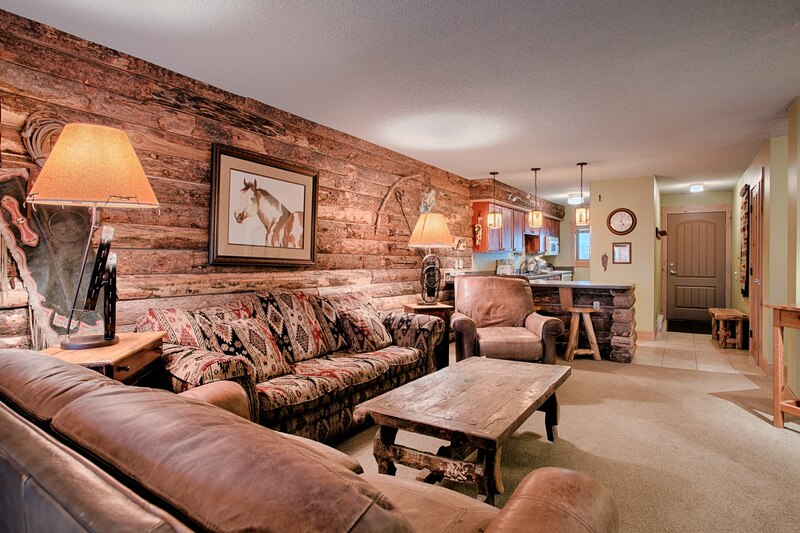 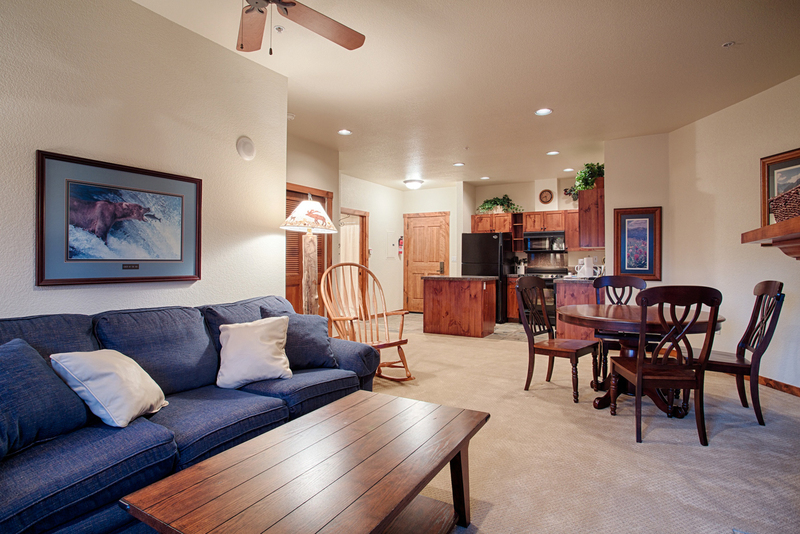 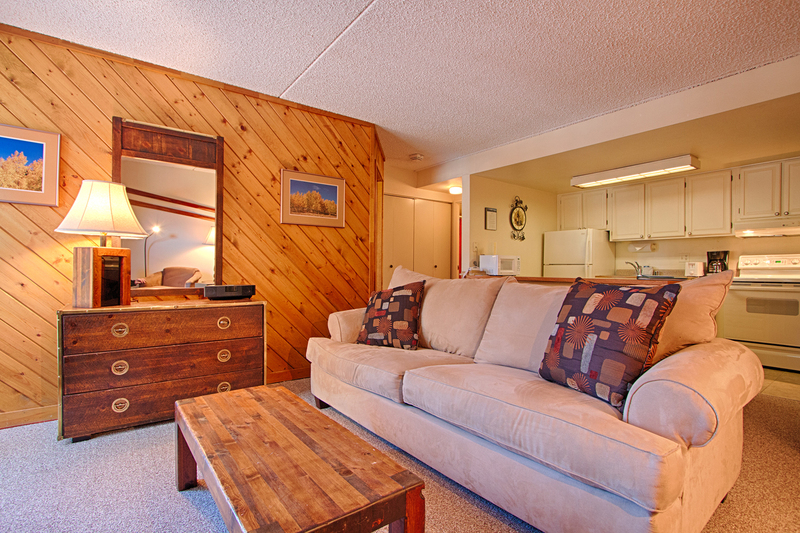 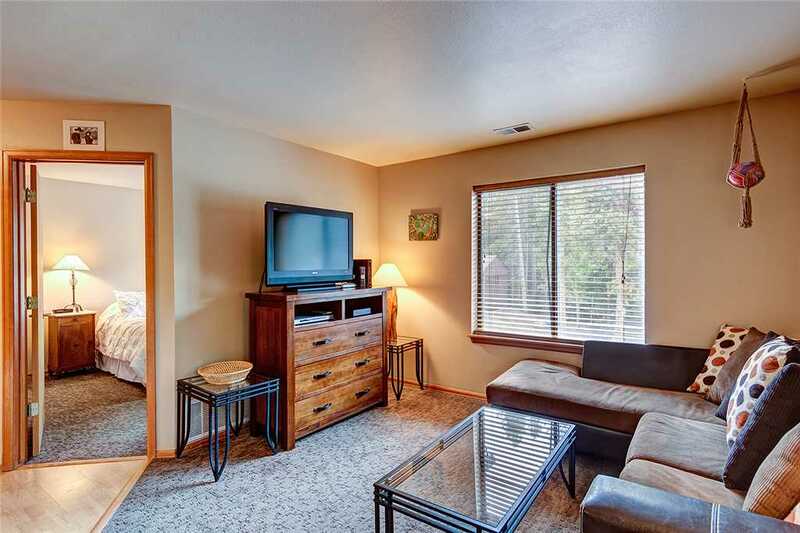 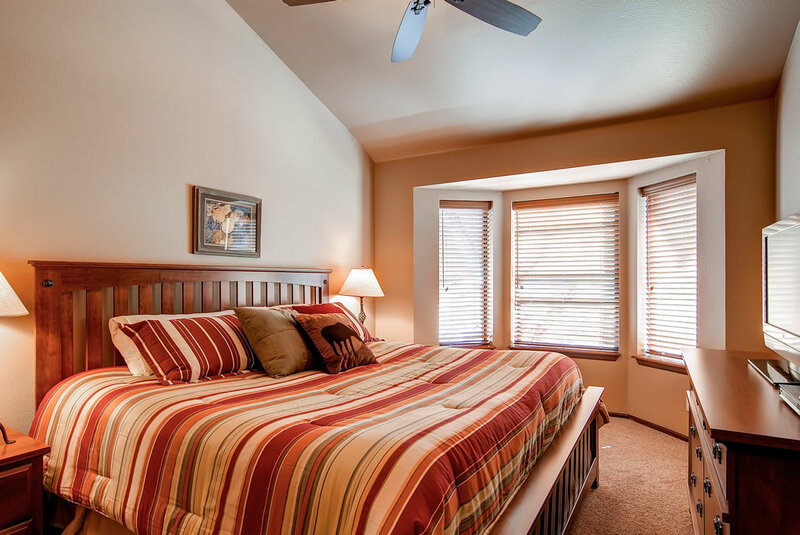 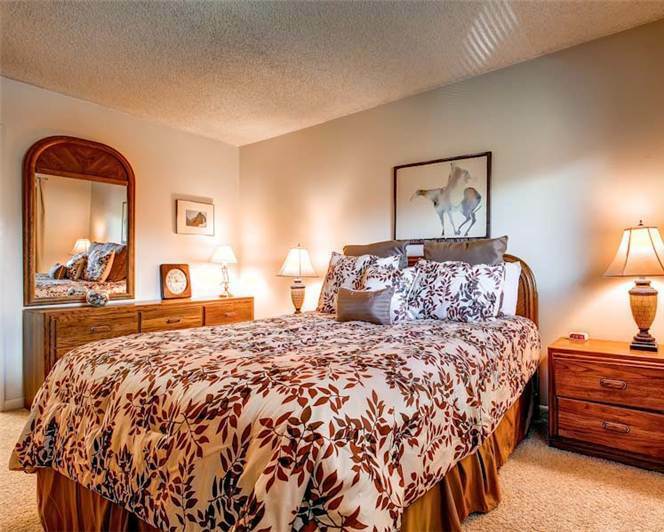 The master bedroom has a massive aspen king bed, and a second large wall-mounted flat-screen TV. 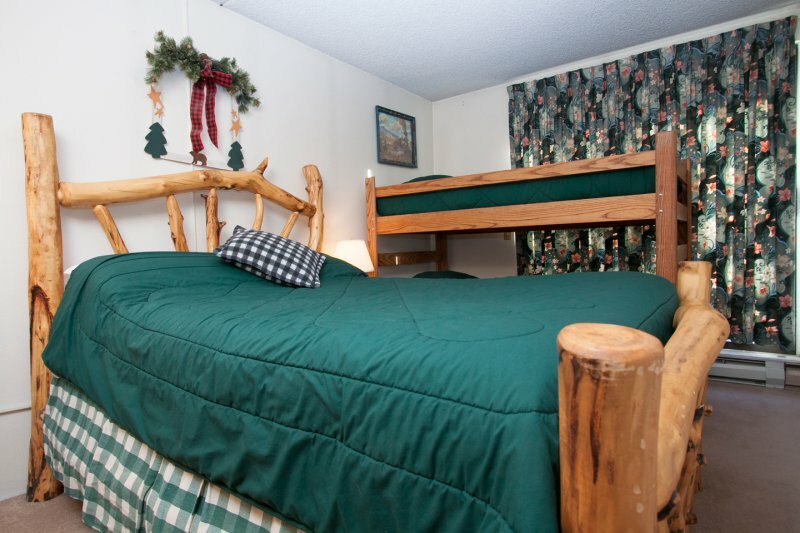 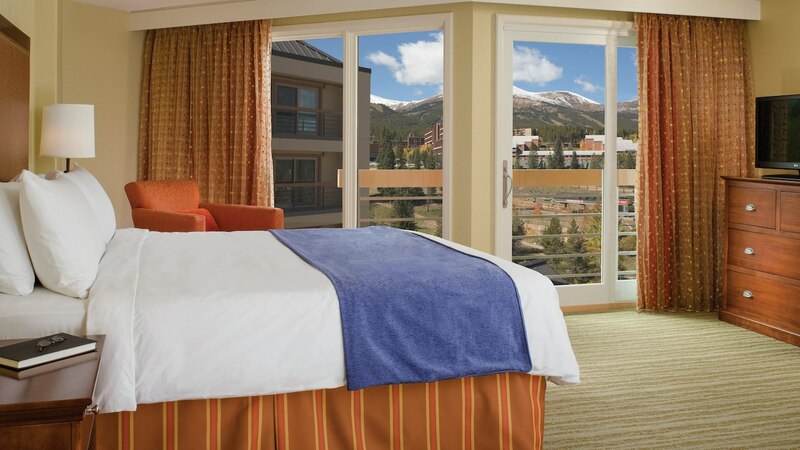 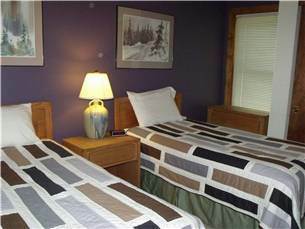 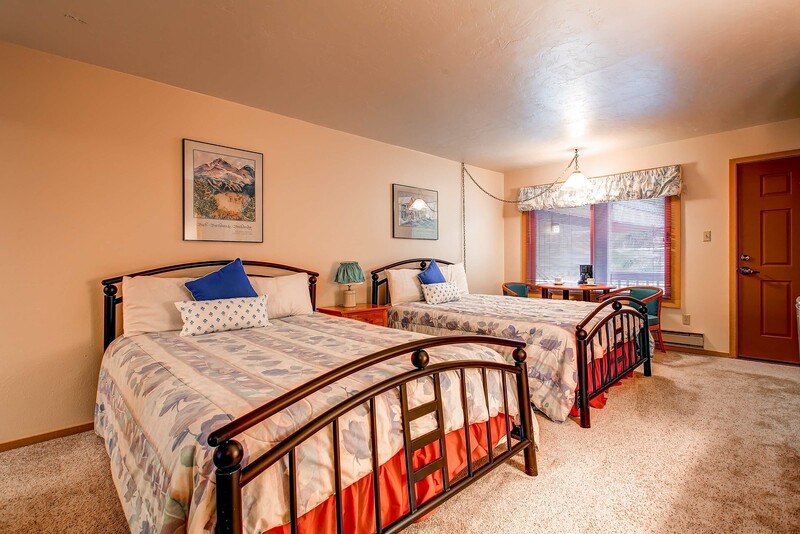 The guest bedroom has twin beds, new mountain-themed comforters, and new wooden blinds. 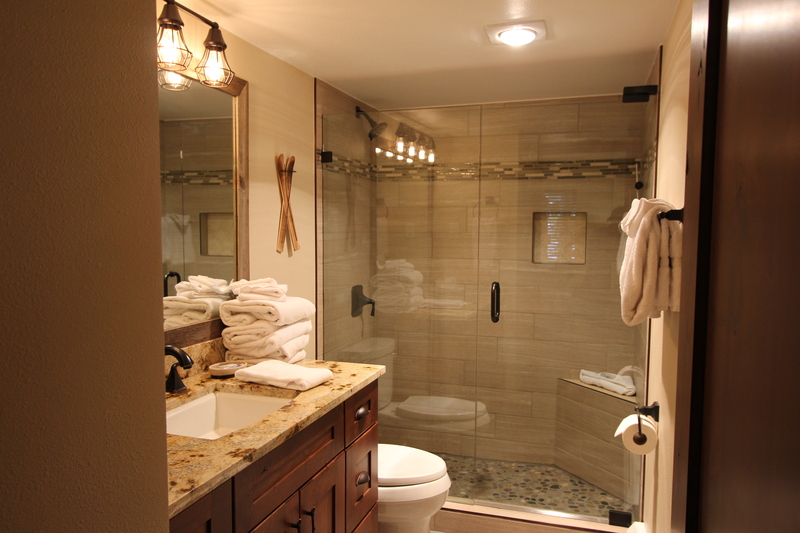 Both the master and guest bathrooms feature new polished stone counters, Spanish tile tub/shower, and brand-new shower curtains. 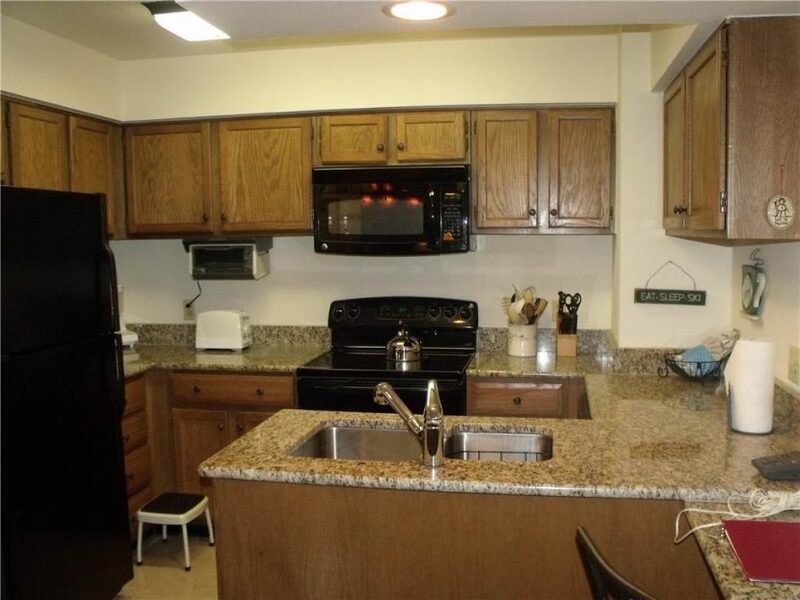 For your convenience, there is a large washer/dryer in the hallway closet.